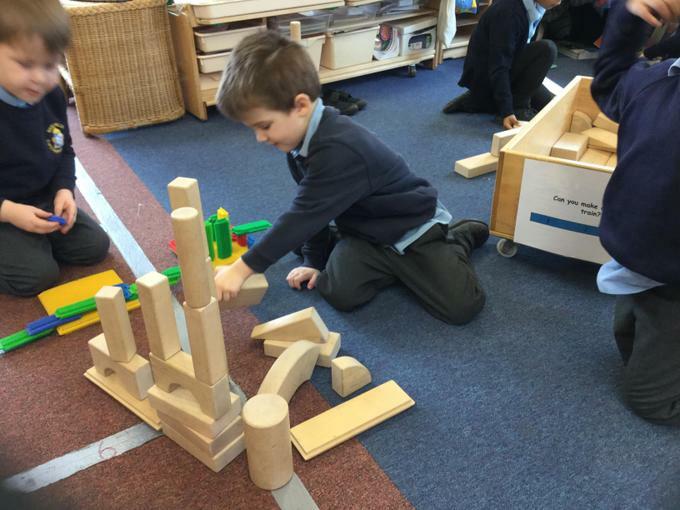 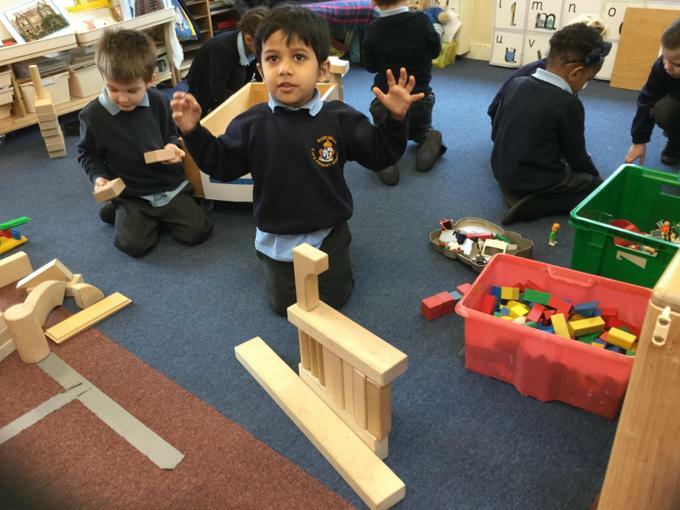 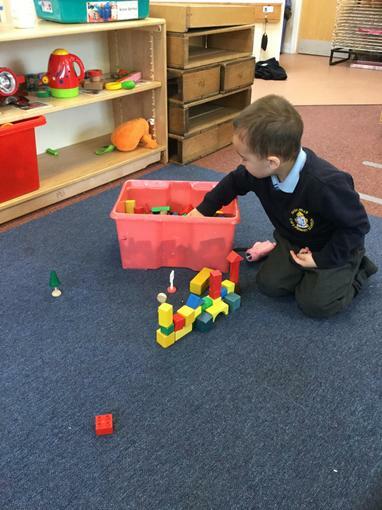 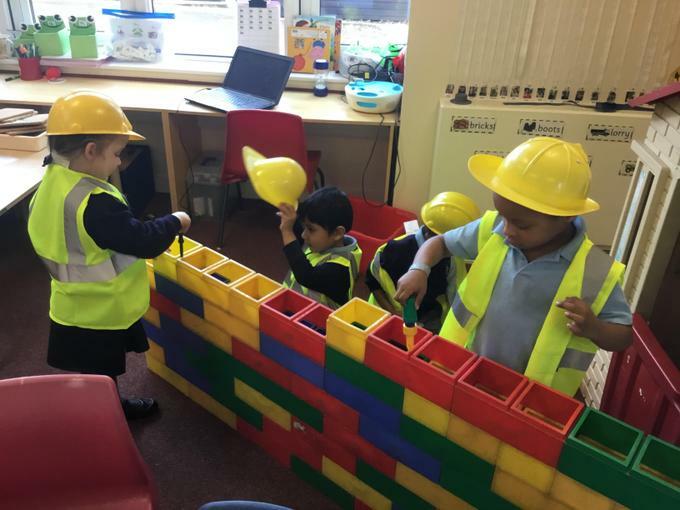 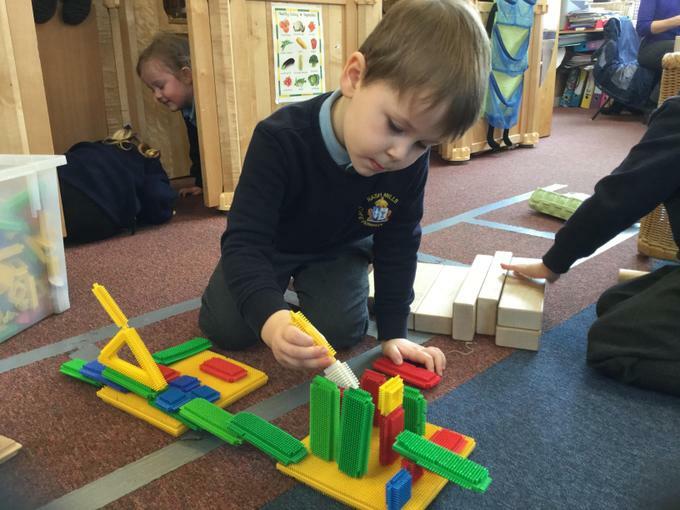 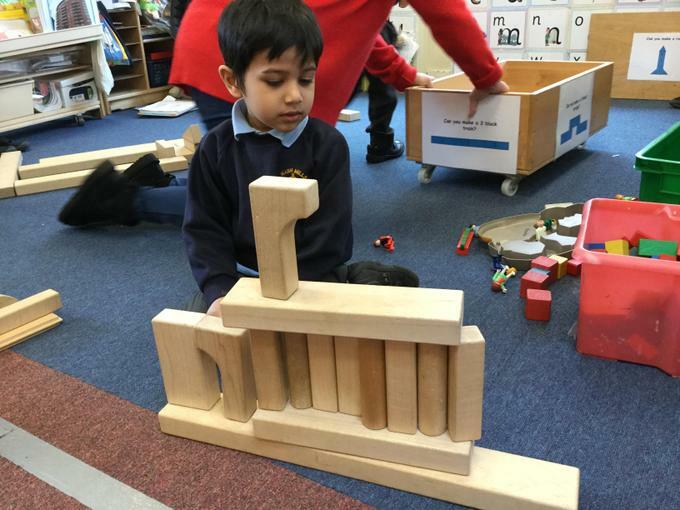 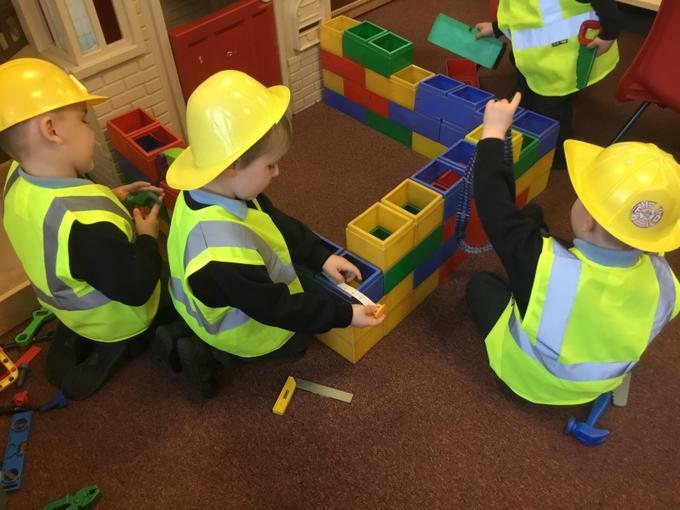 We have been thinking about building for our last topic. 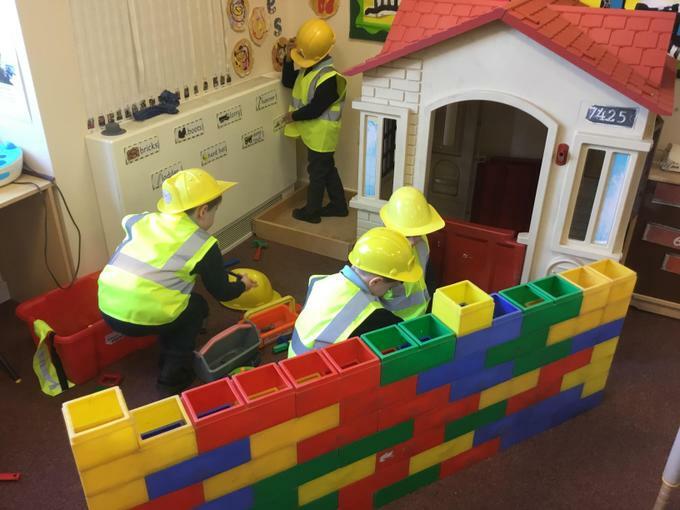 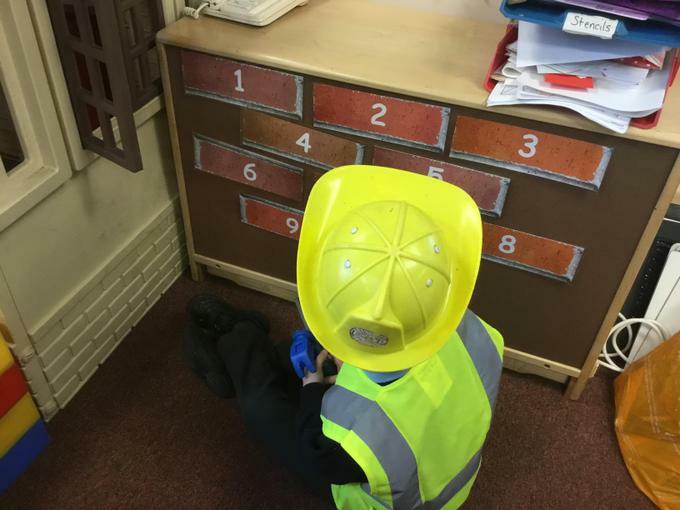 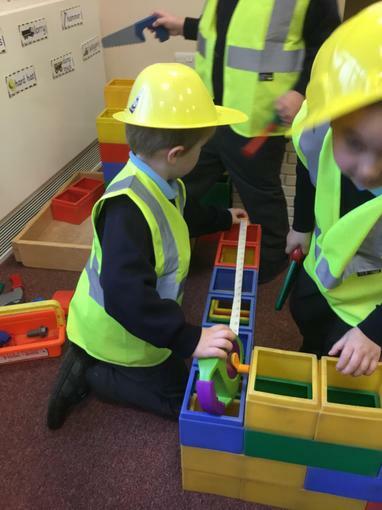 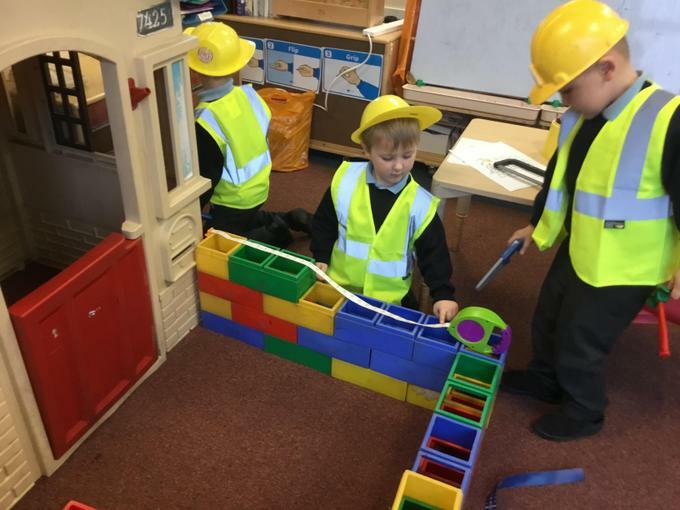 We have had a role play area with a wall, house and lots of building tools, which the children have made full use of. 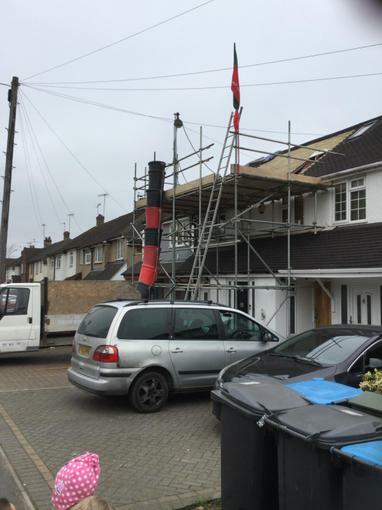 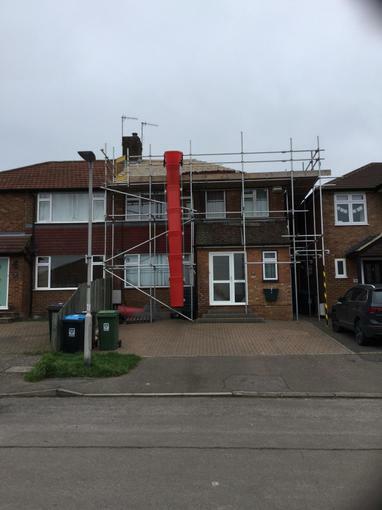 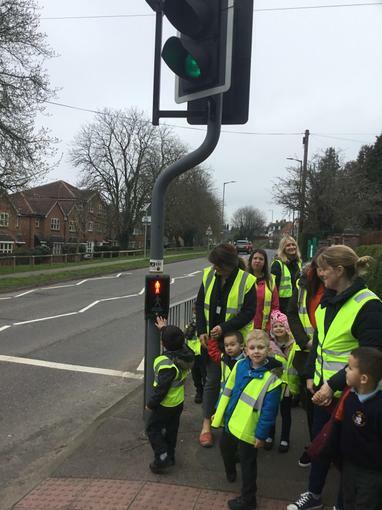 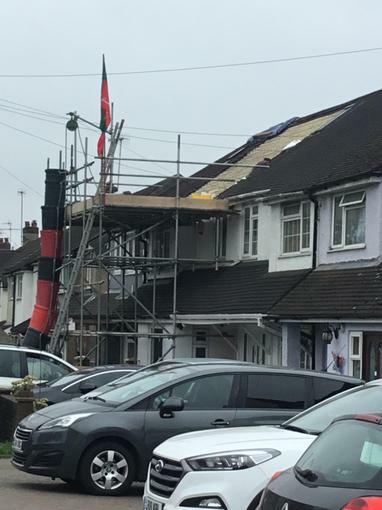 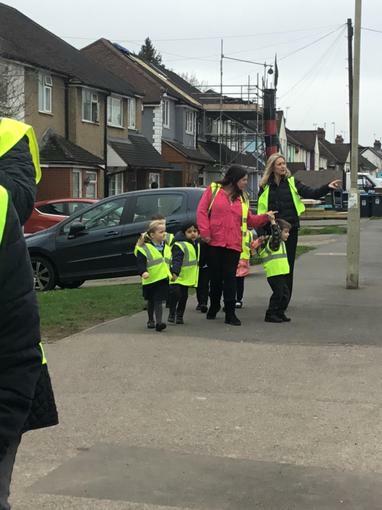 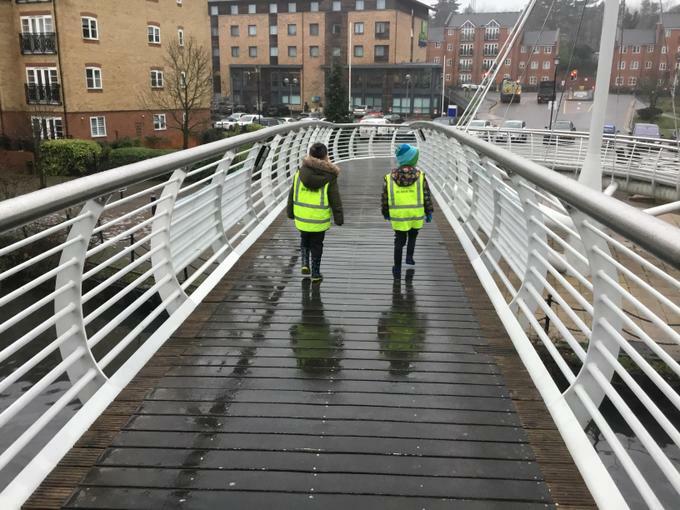 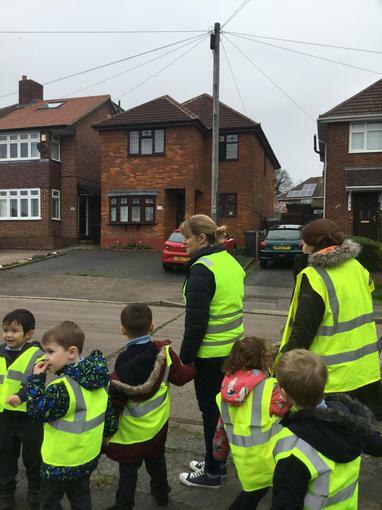 The children have all worn hi-viz jackets and hard hats when in this area, having discussed what builders wear and why. 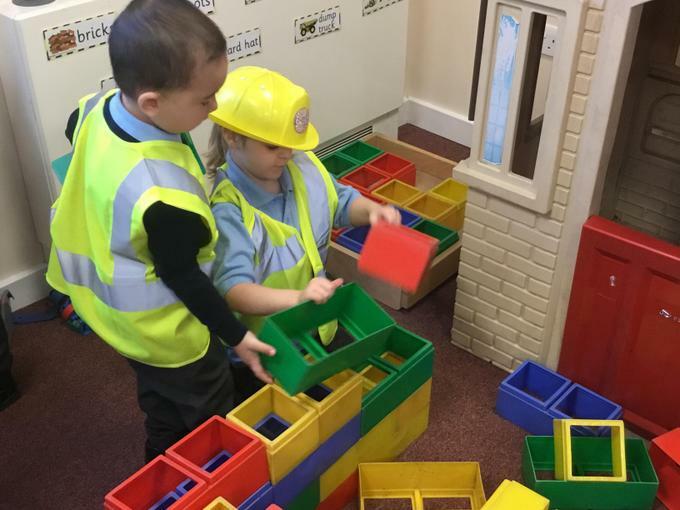 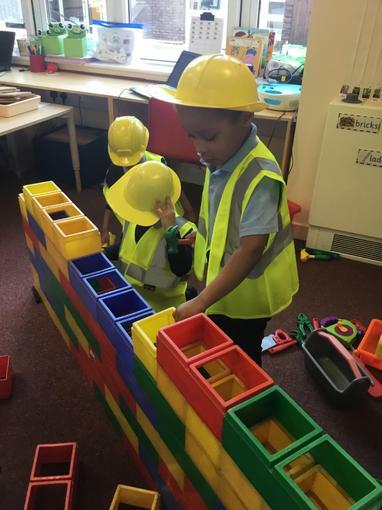 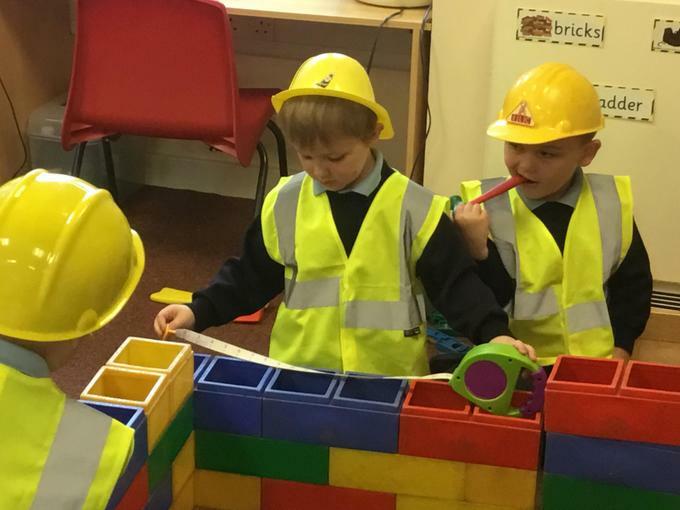 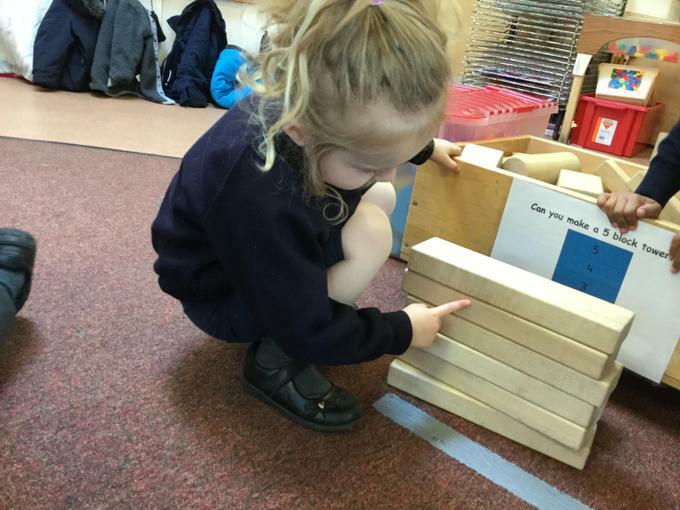 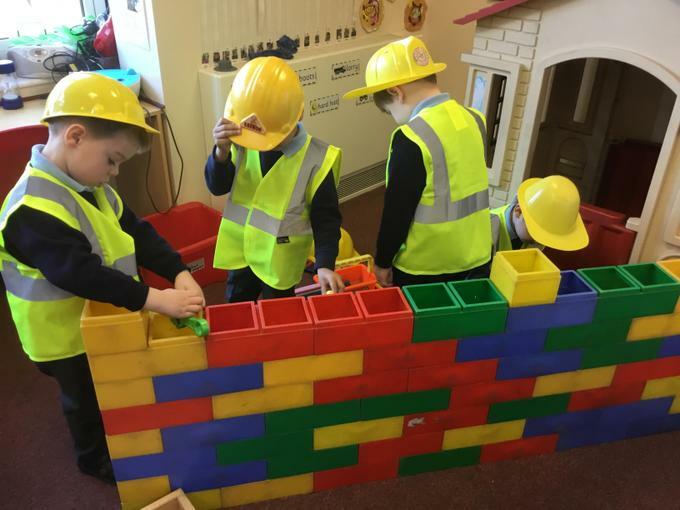 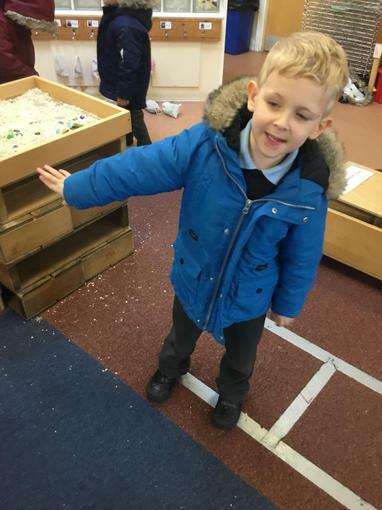 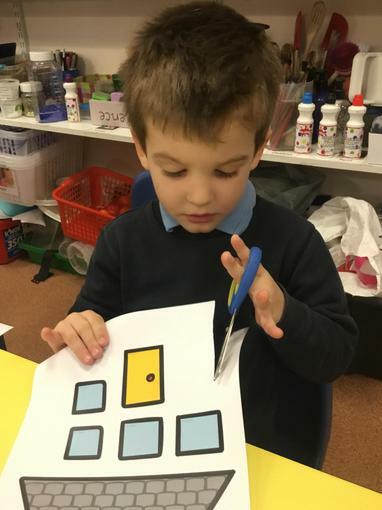 We have made bricks walls using sponge paints and have cut out windows/doors etc to place onto our houses, making good use of our fine motor skills. 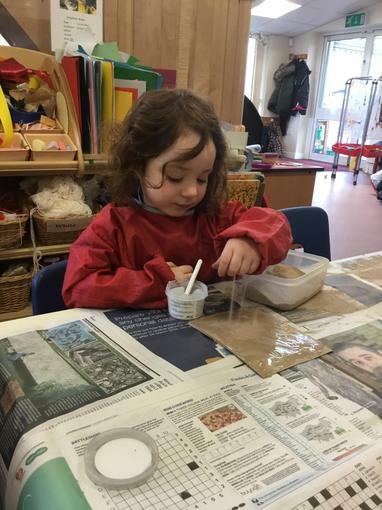 We even made 'sandpaper'! 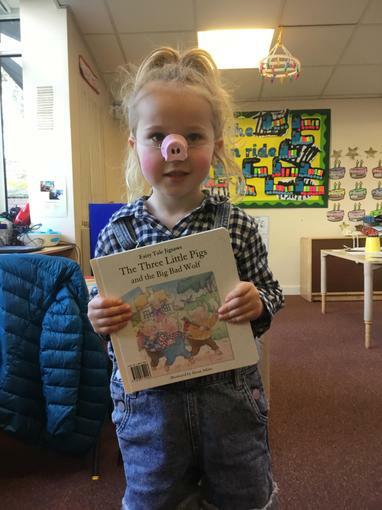 We read the book 'The Three Little Pigs' and did lots of role play during PE, re-enacting the story. 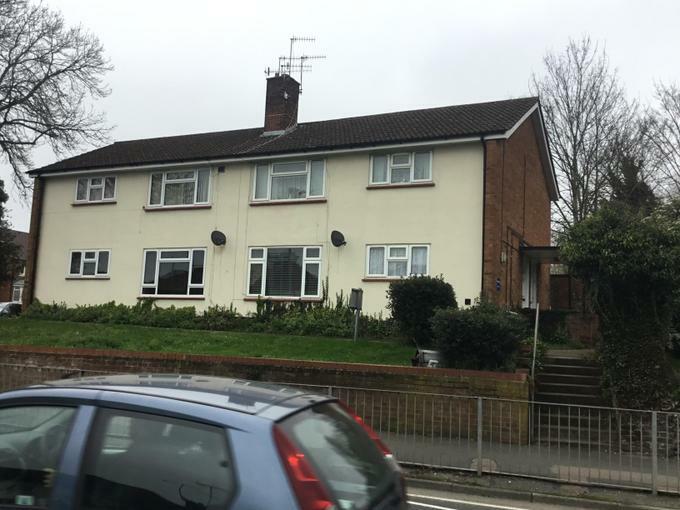 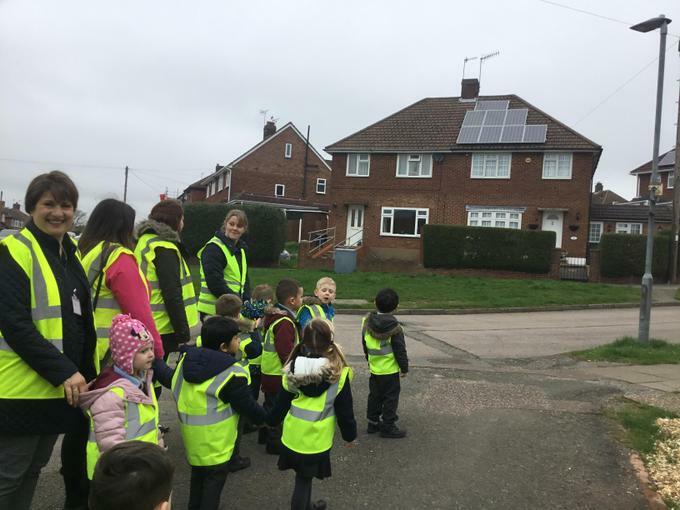 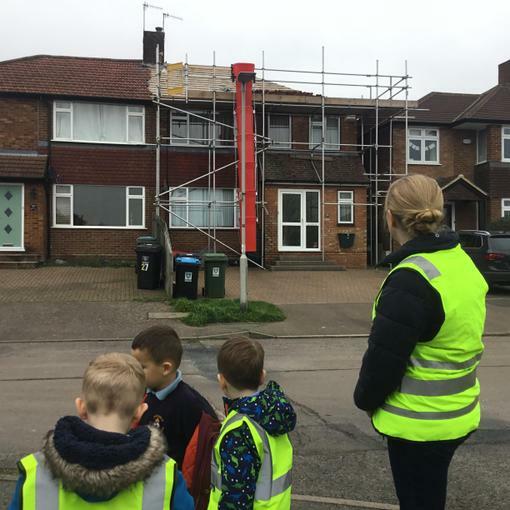 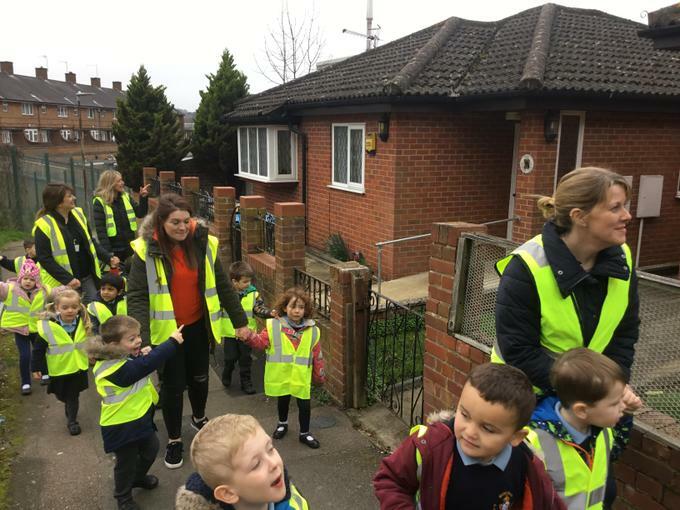 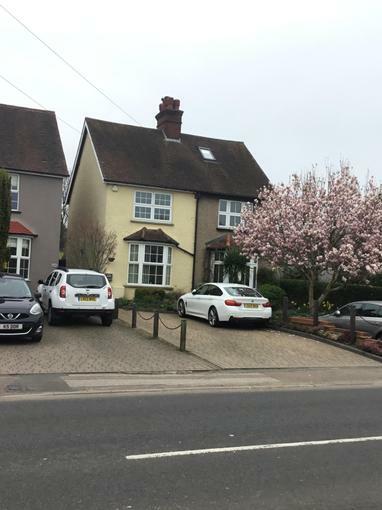 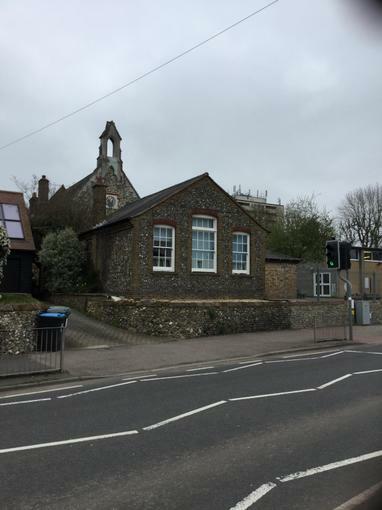 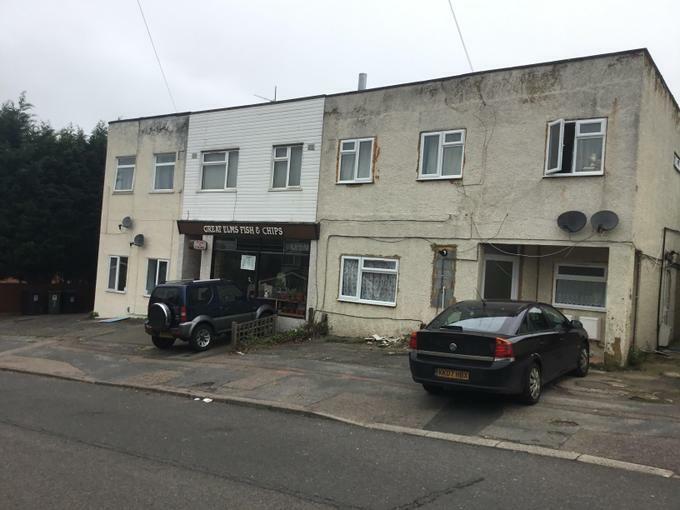 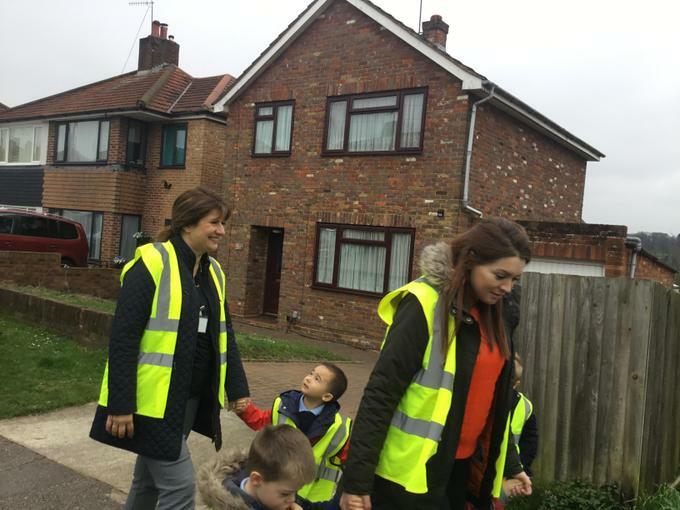 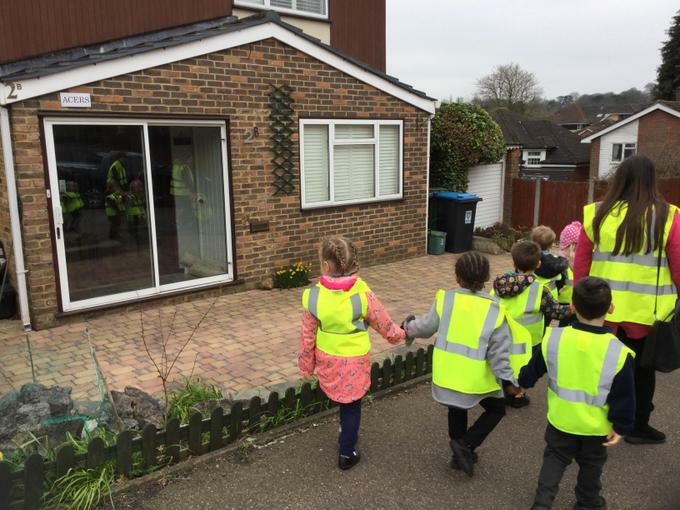 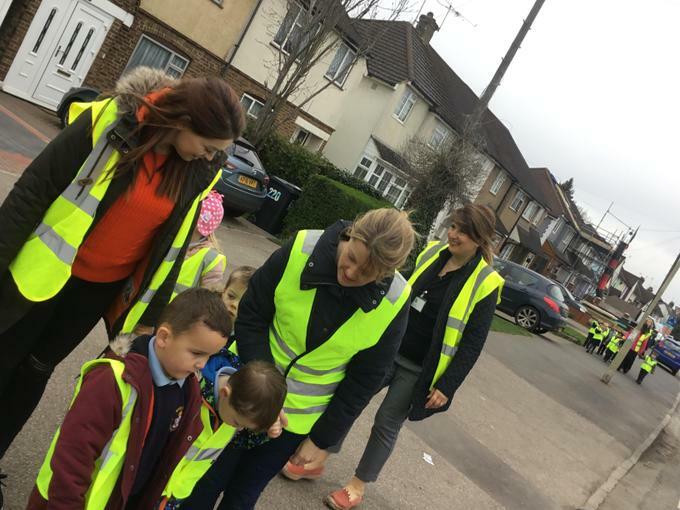 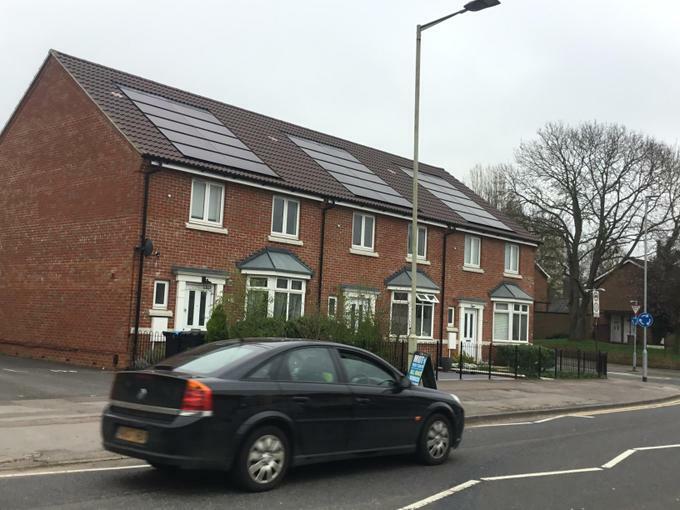 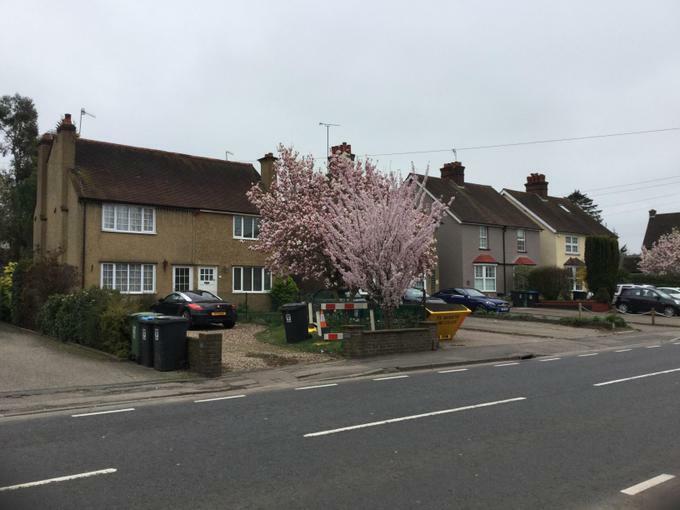 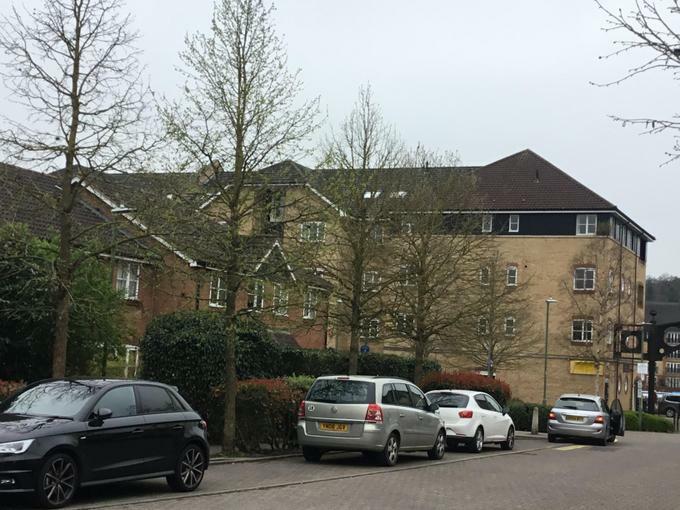 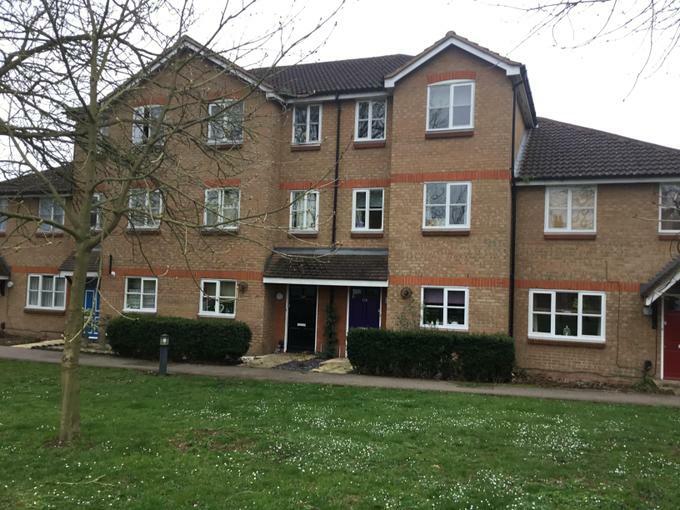 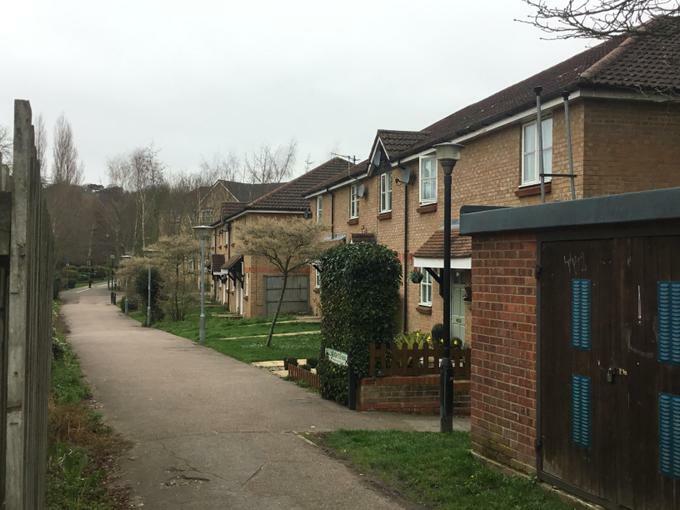 We discussed the different types of houses that we live in and finished the topic with a walk, looking at different houses in the local area. 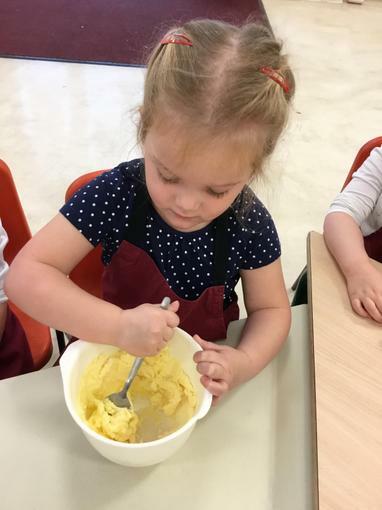 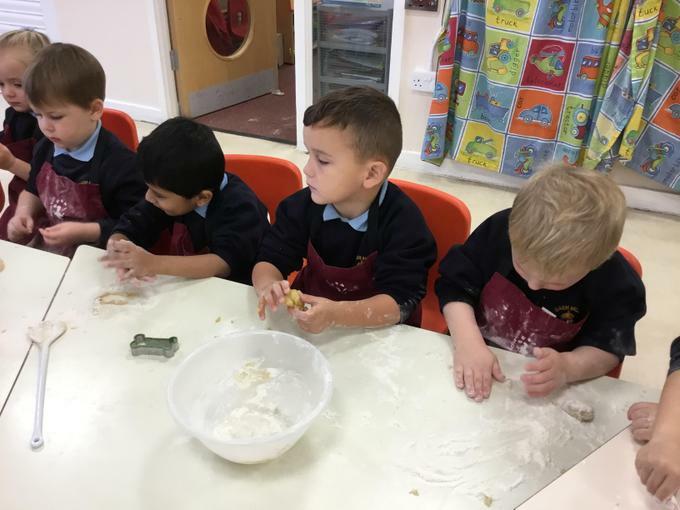 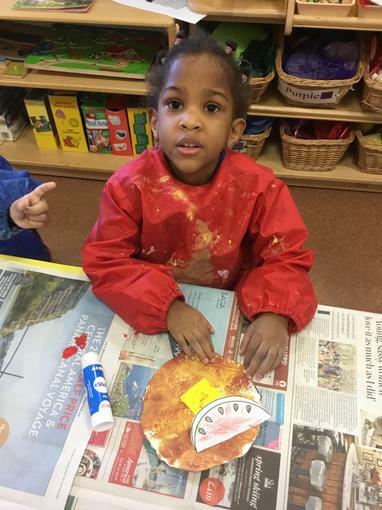 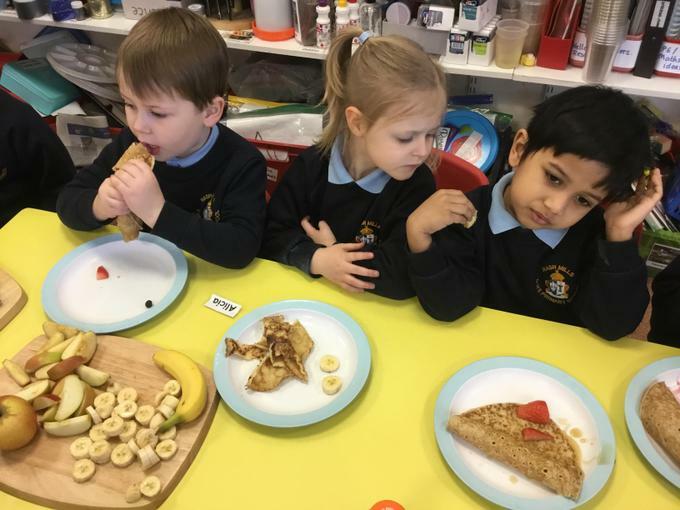 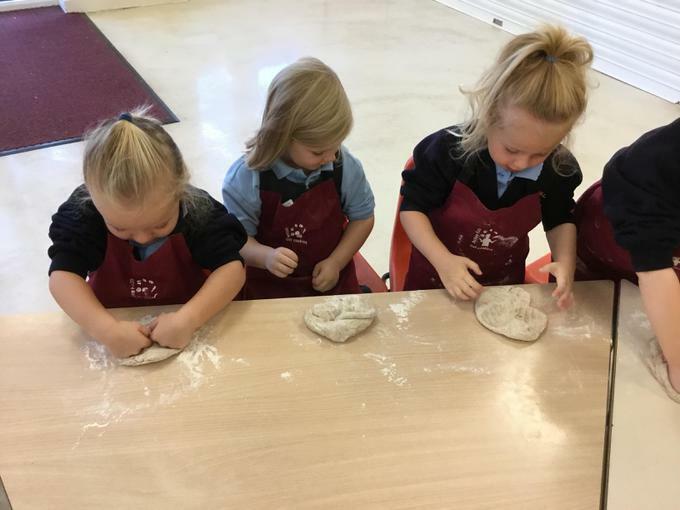 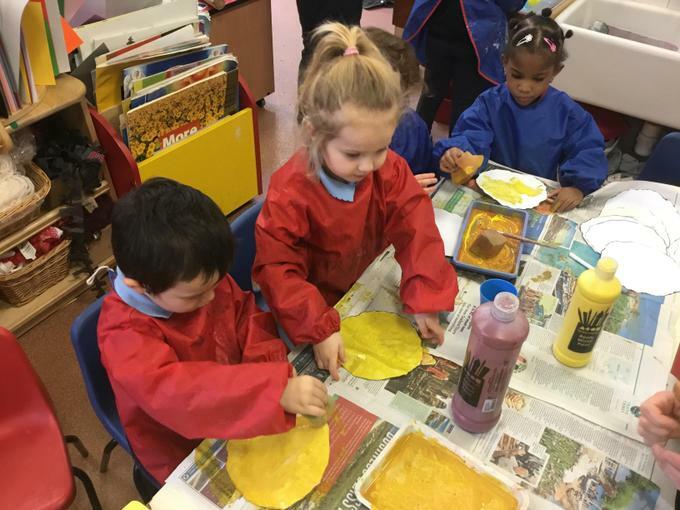 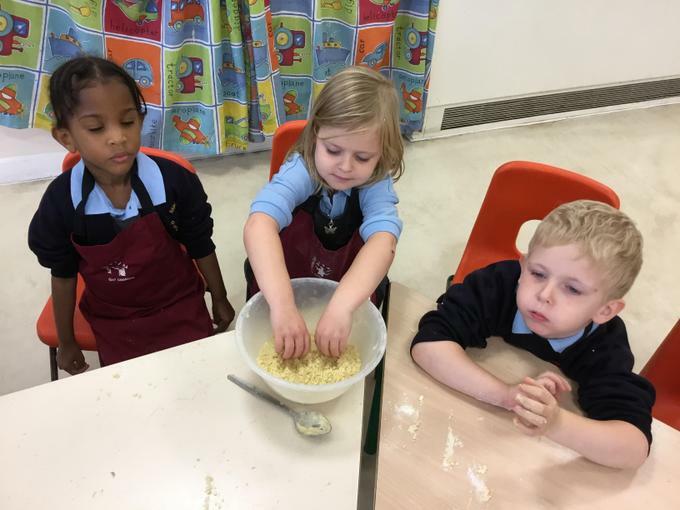 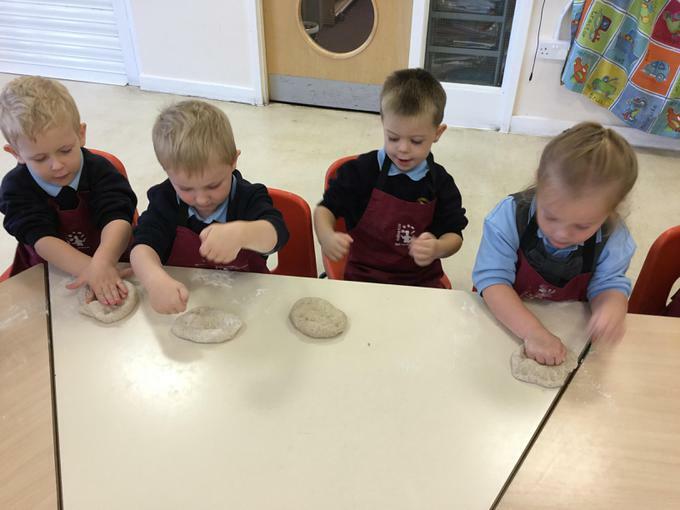 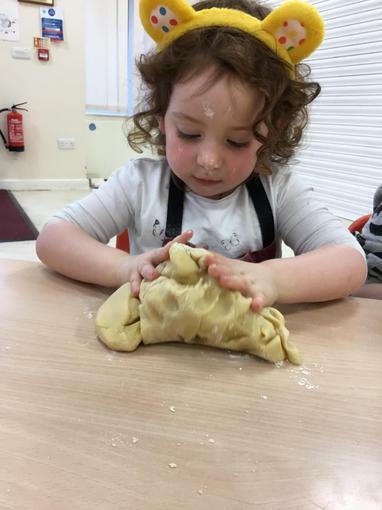 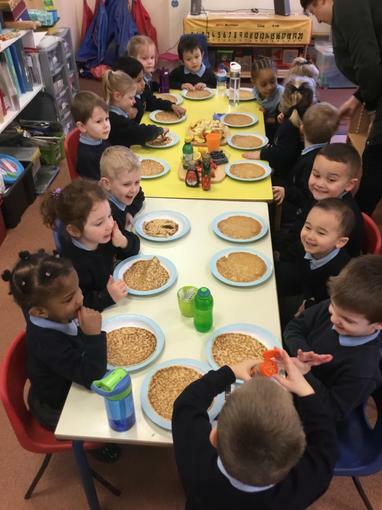 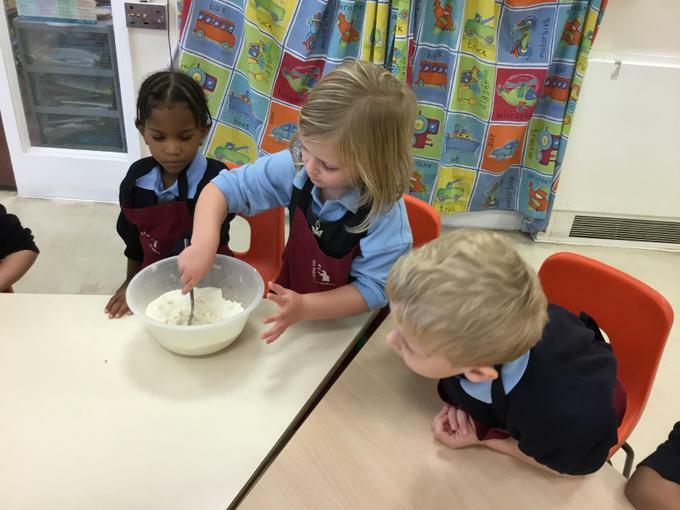 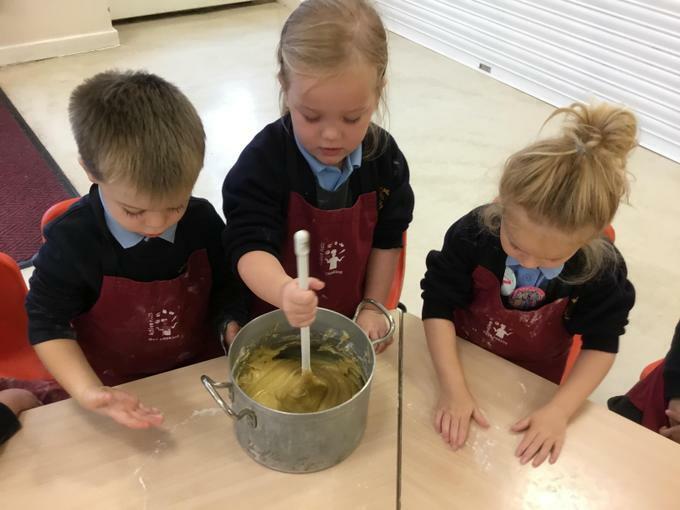 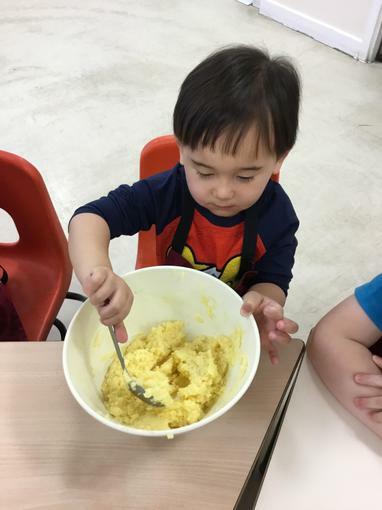 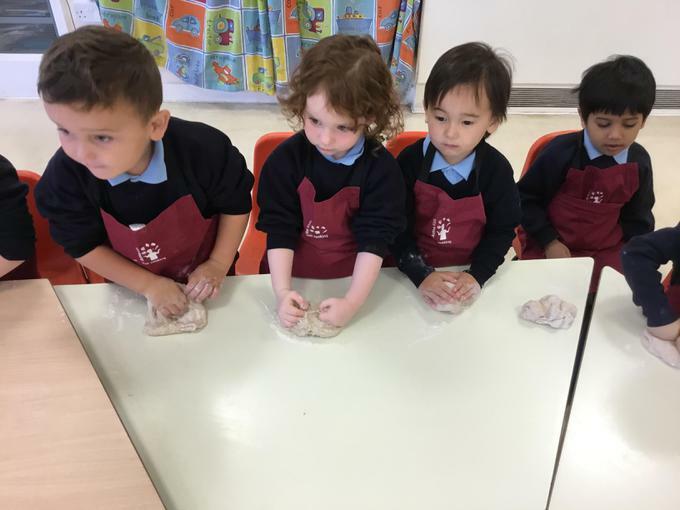 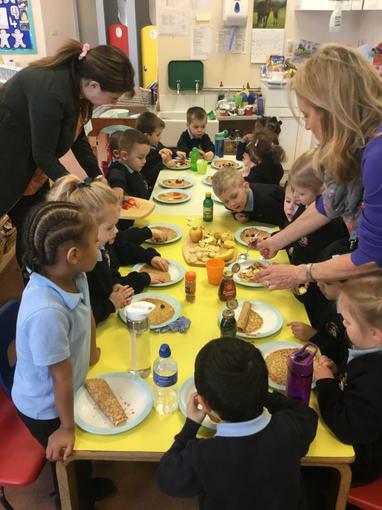 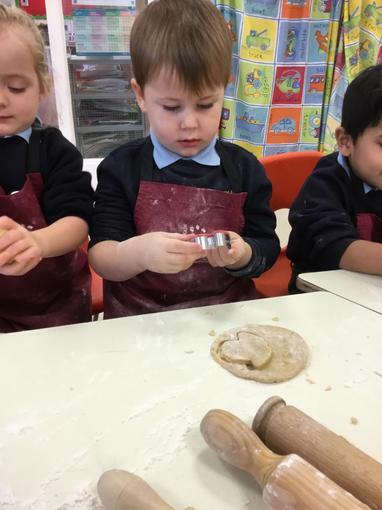 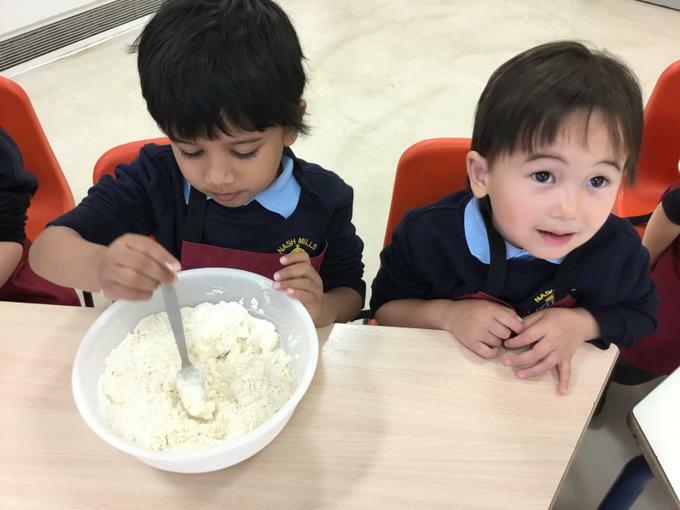 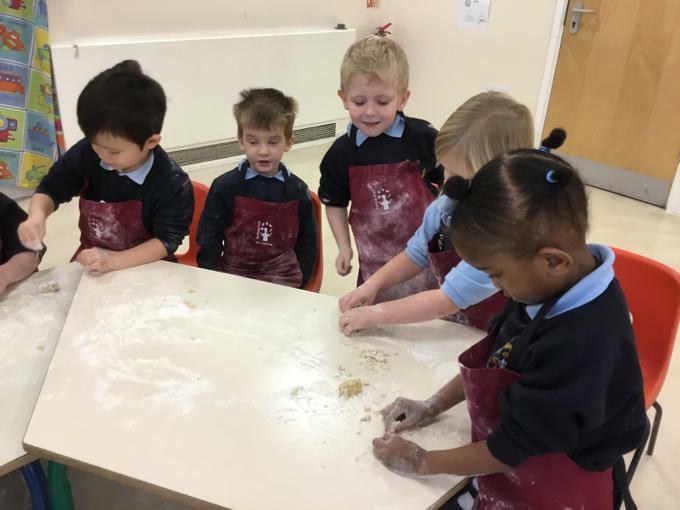 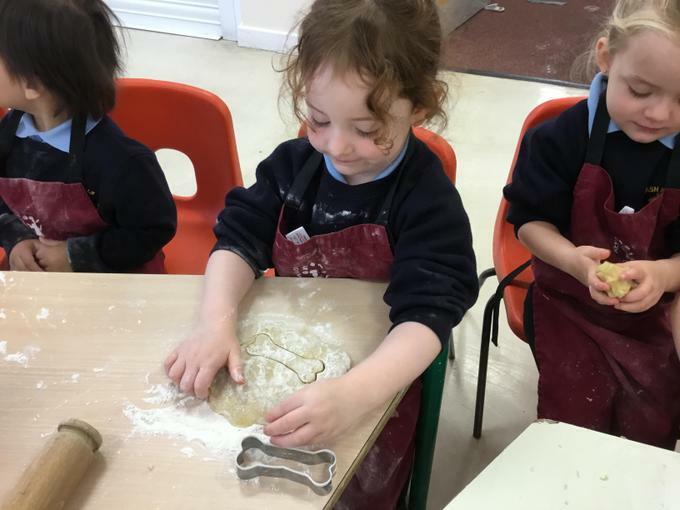 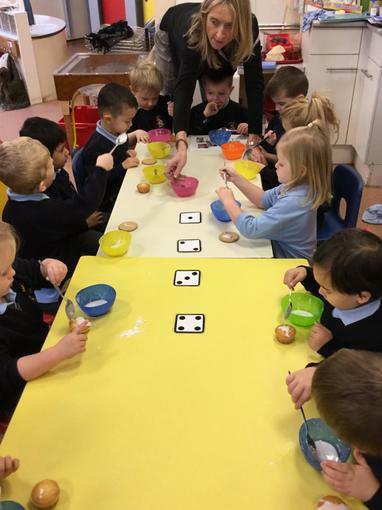 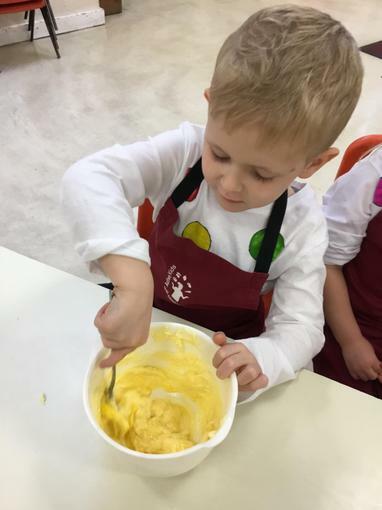 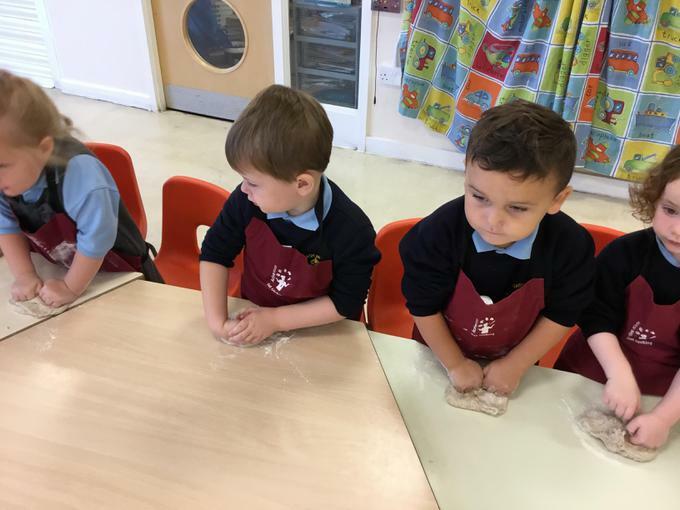 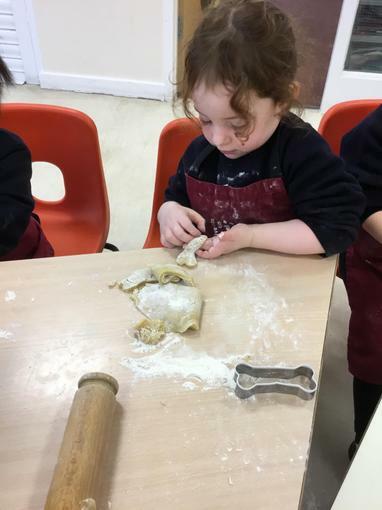 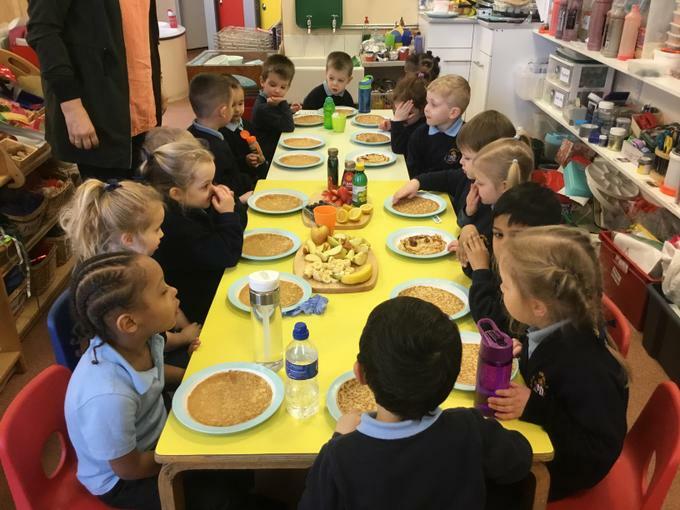 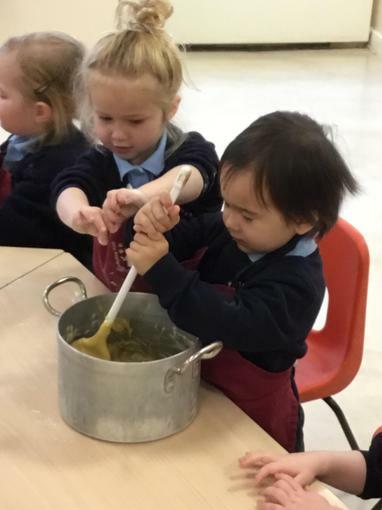 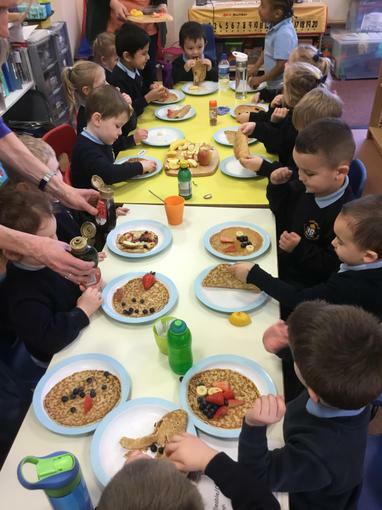 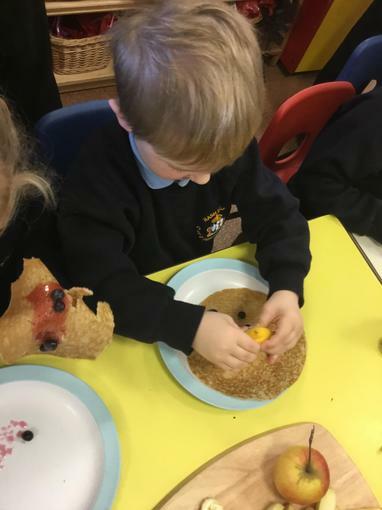 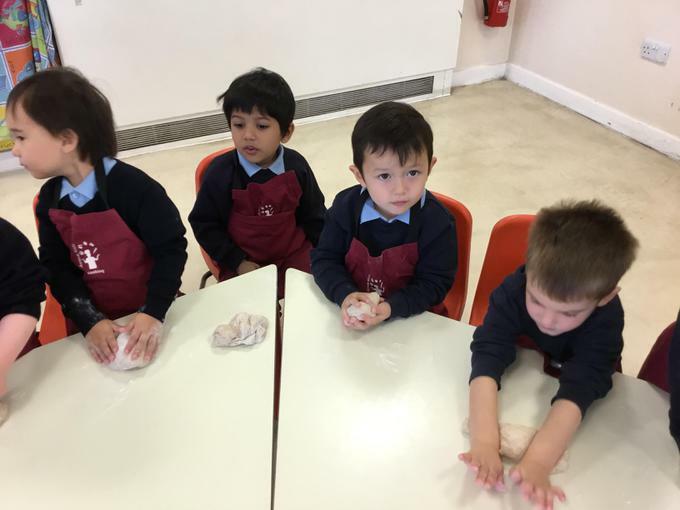 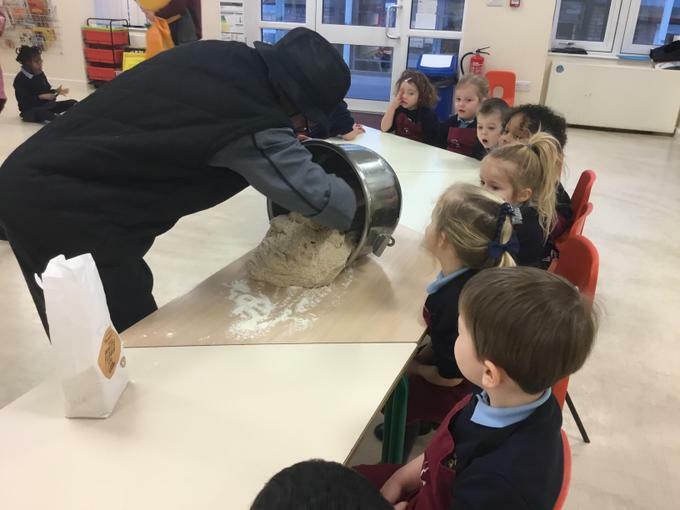 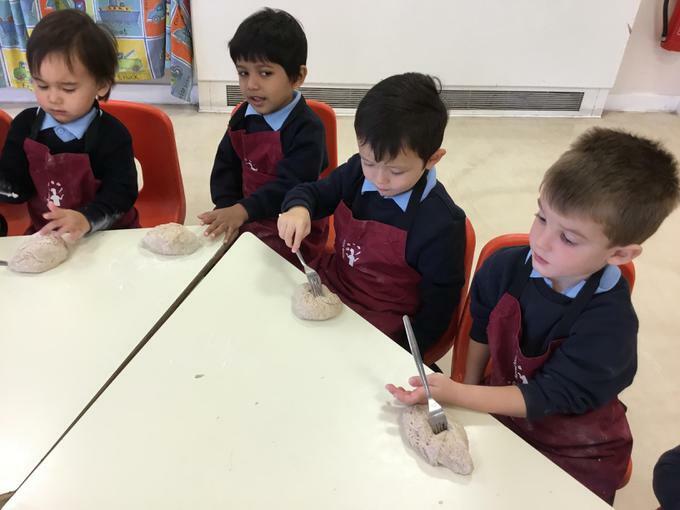 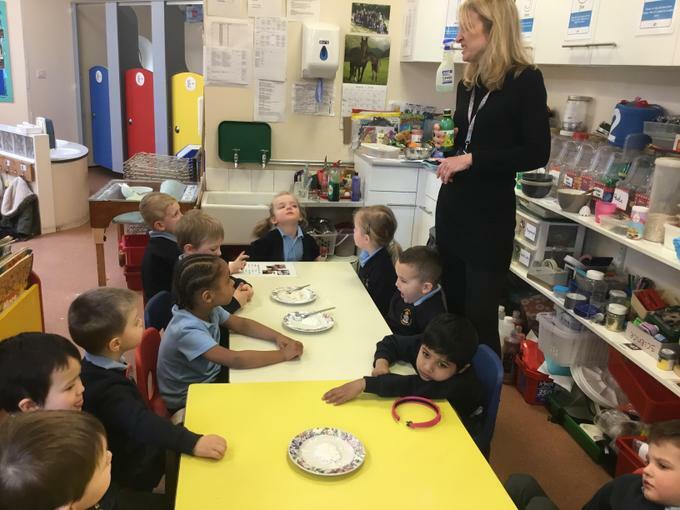 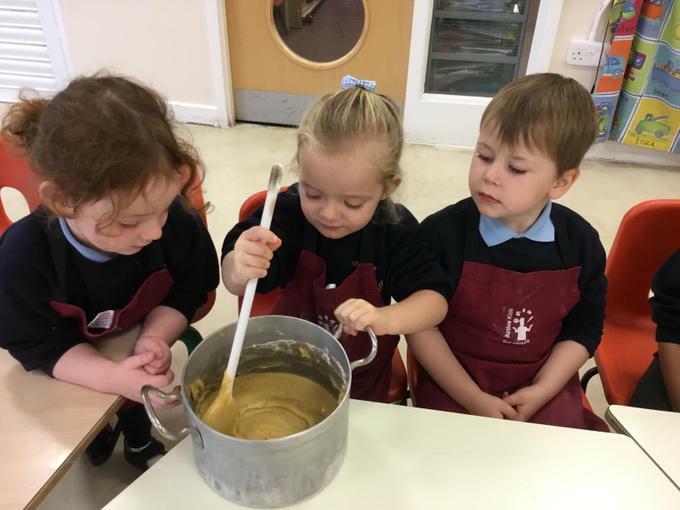 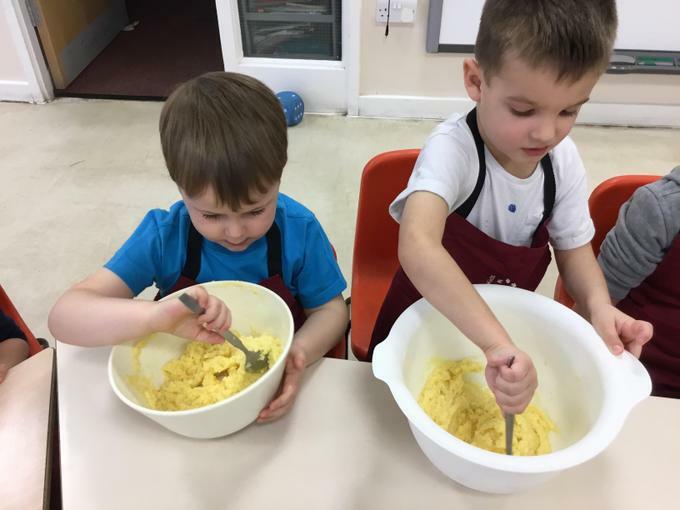 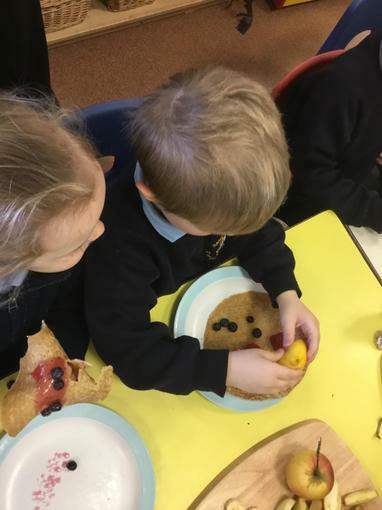 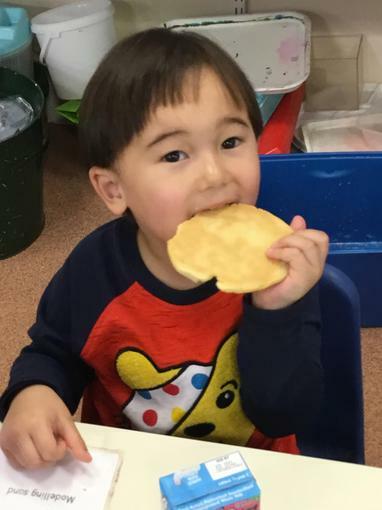 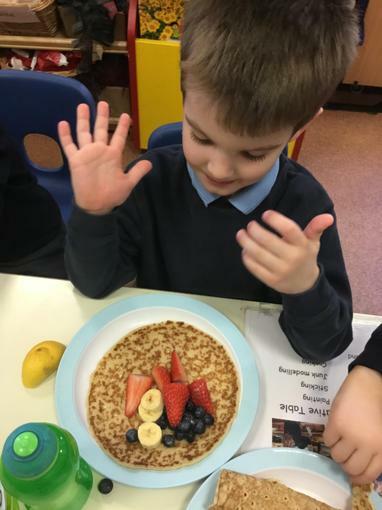 As it was Pancake day and the start of Lent, we decided to focus on cooking and making pancakes. 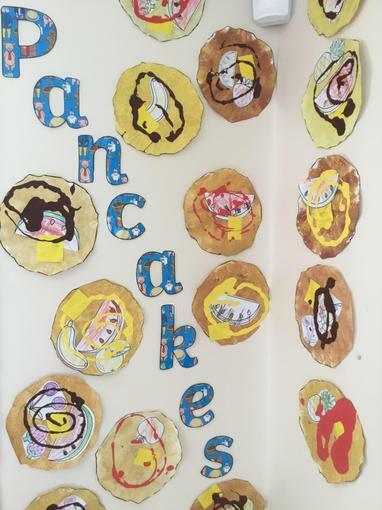 We painted some pancakes, topped with a fruit and sauce of our choice and made them into a display. 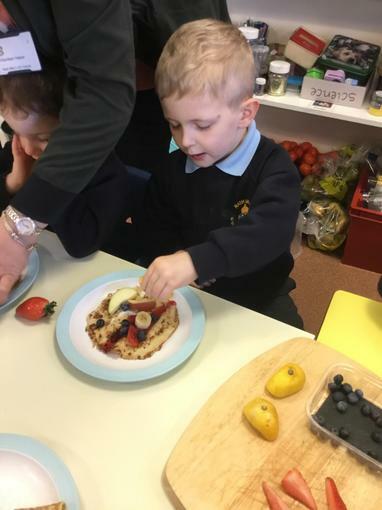 We also tried pancakes, again topping them with plenty of fruit and some sauce. 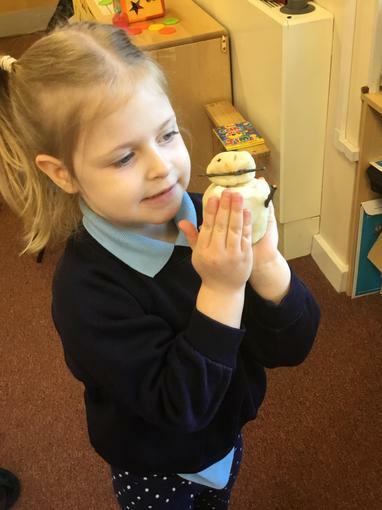 We talked about Lent in assembly and listened to the bible story of Jesus in the desert. 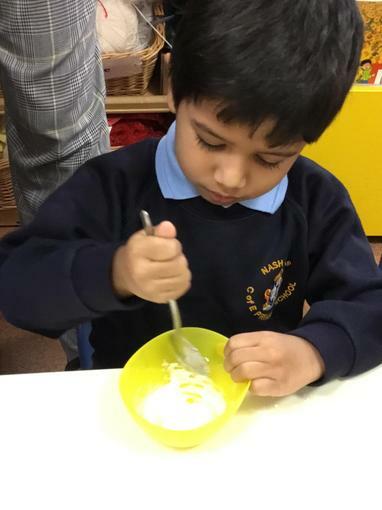 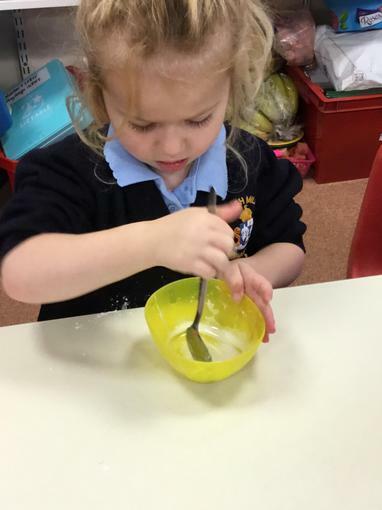 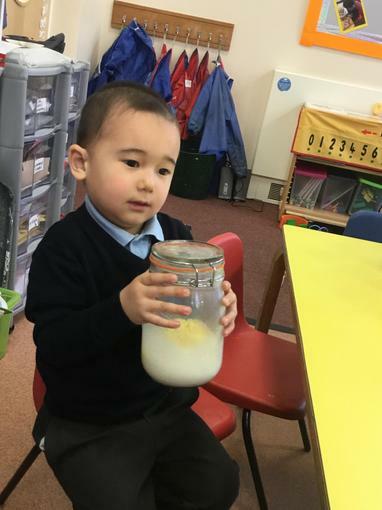 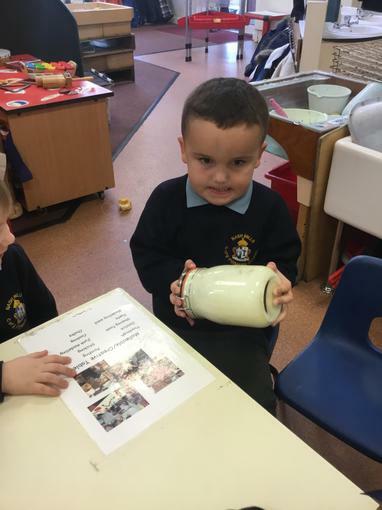 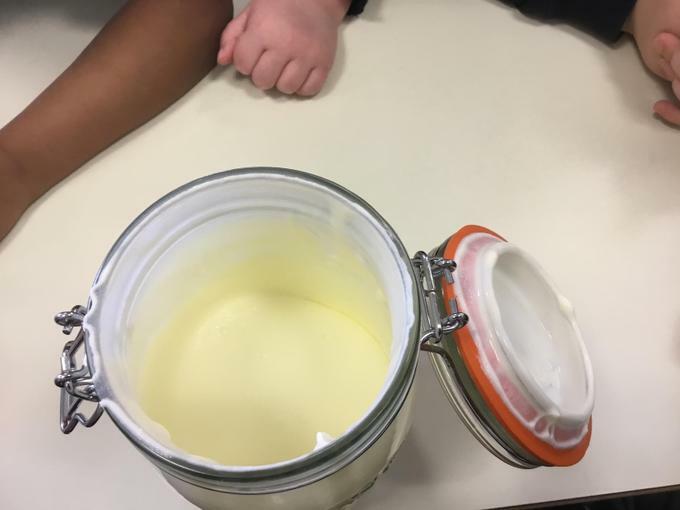 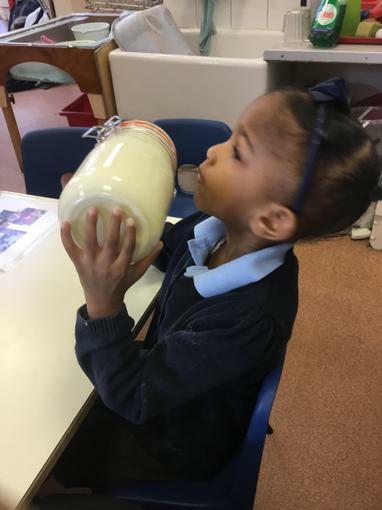 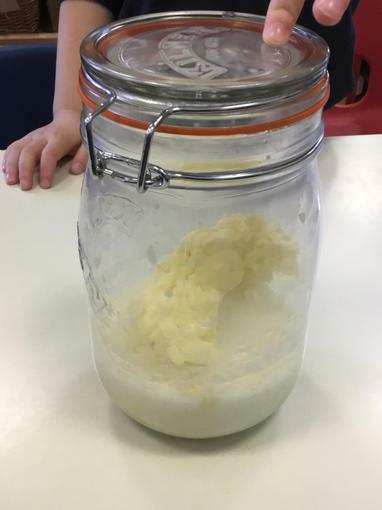 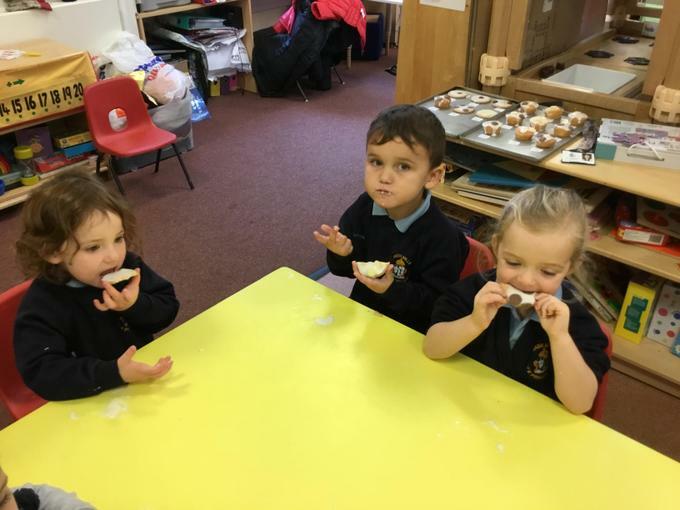 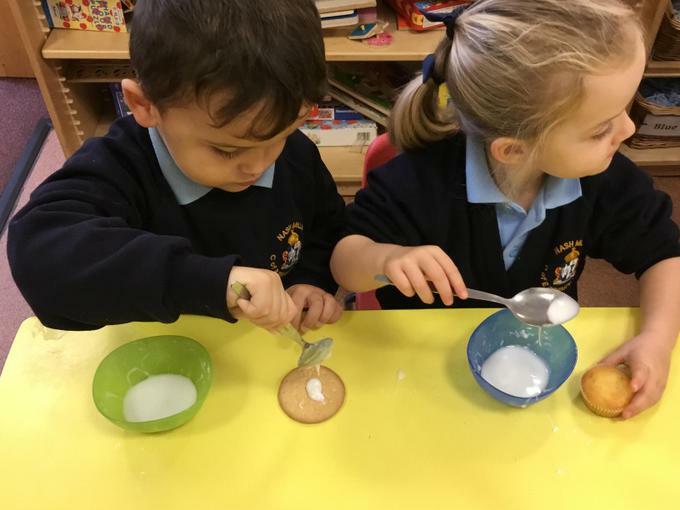 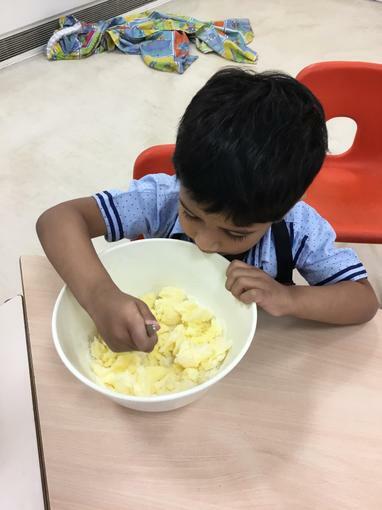 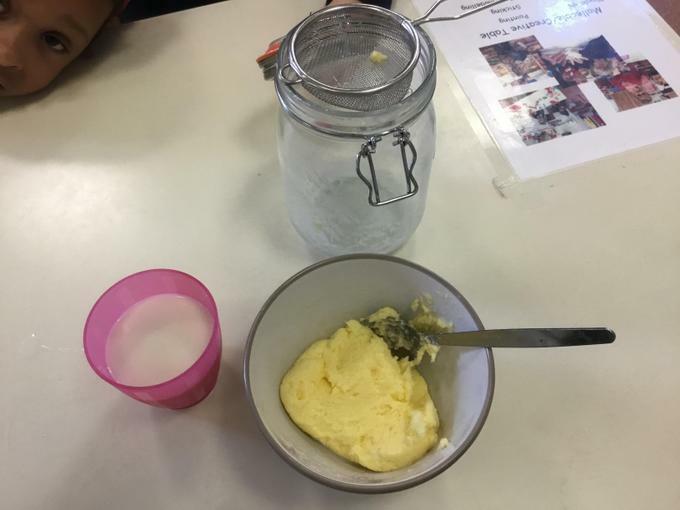 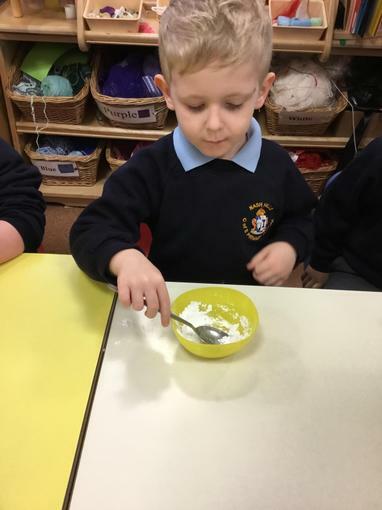 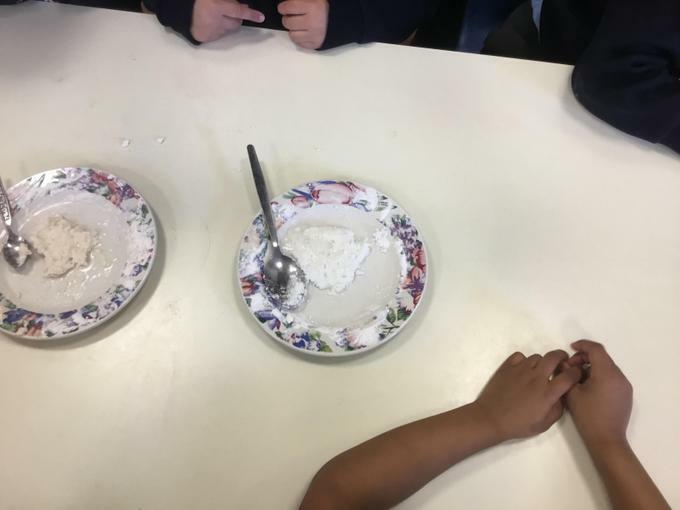 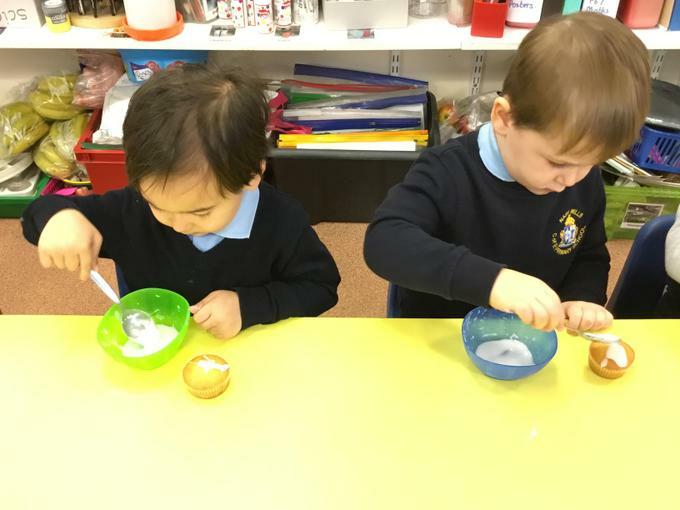 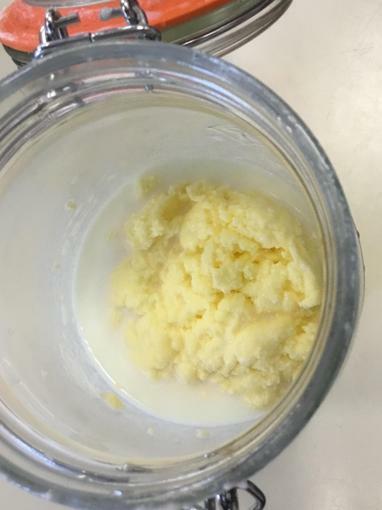 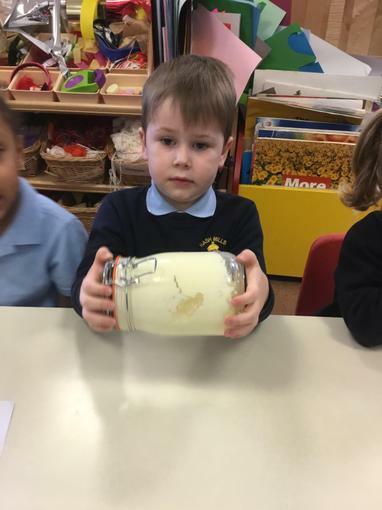 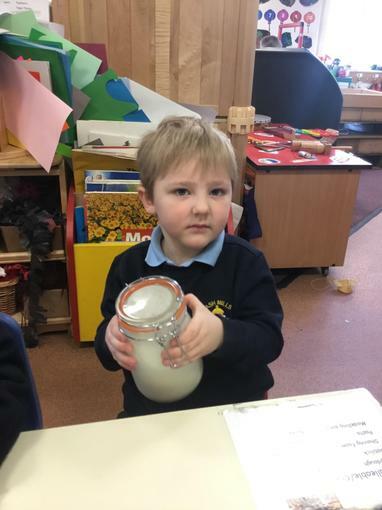 We made some butter by shaking cream in a jar until the fat and milk separated and also did some experiments using bicarbonate of soda and lemon juice. 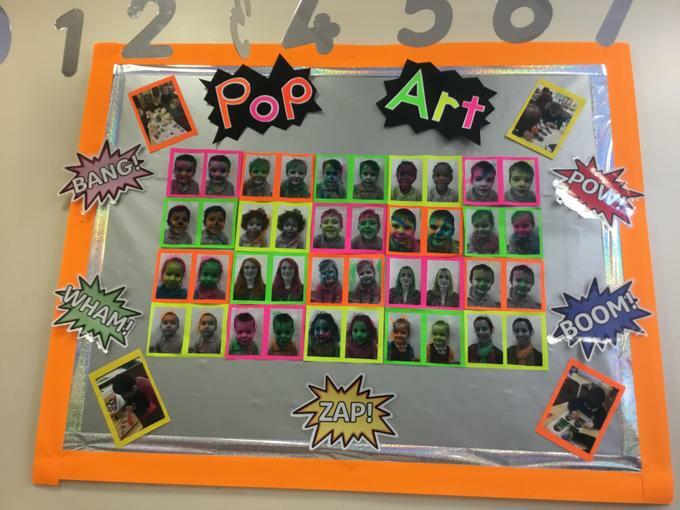 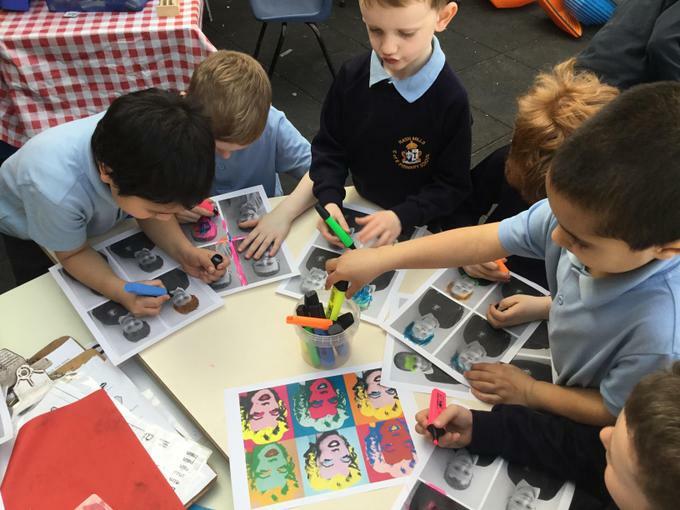 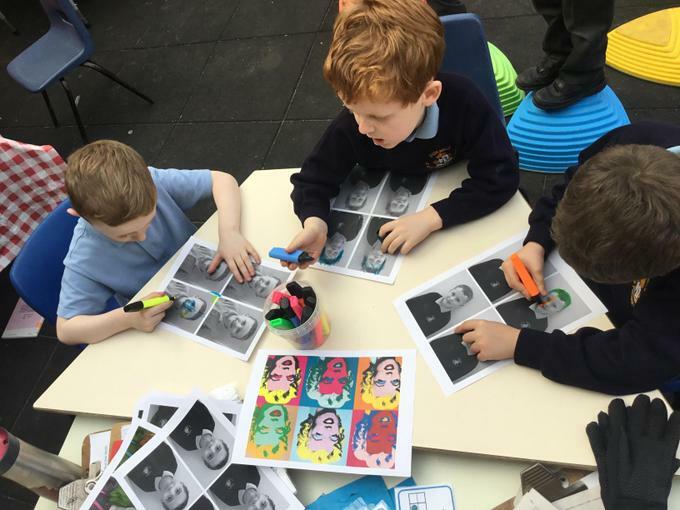 The Foundation team got together for Foundation week and focused on Pop Art. 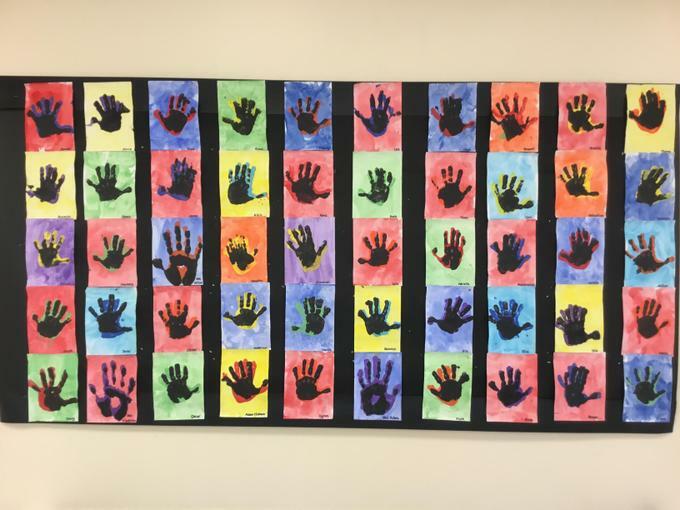 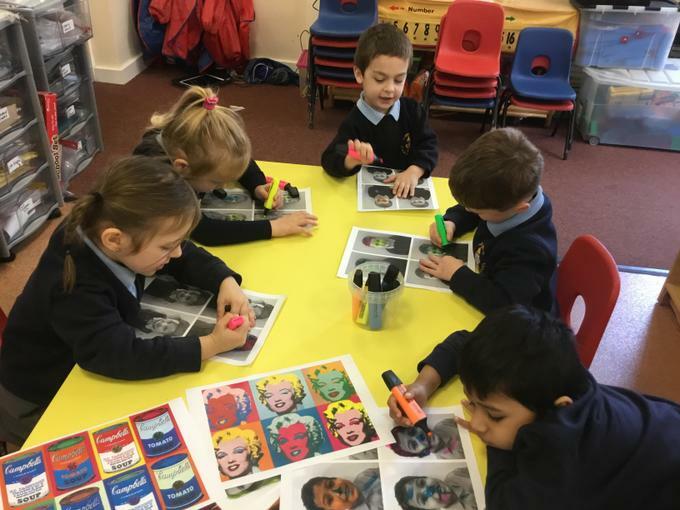 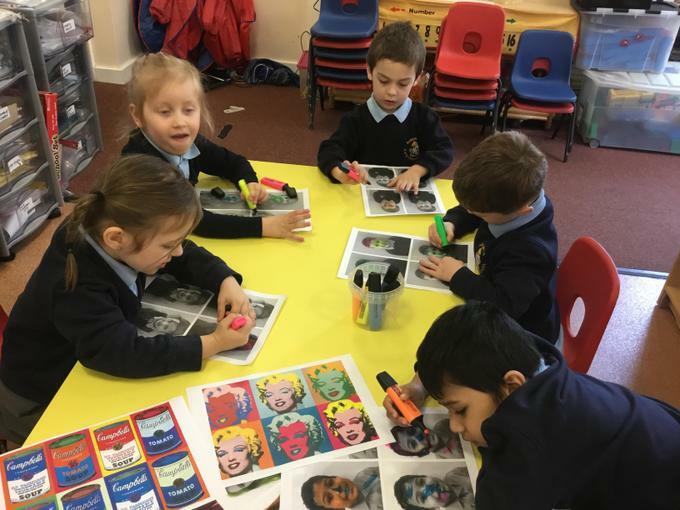 We talked about the exciting use of colour and made our own Marilyn Monroe display, as well as a joint display with our hand prints. 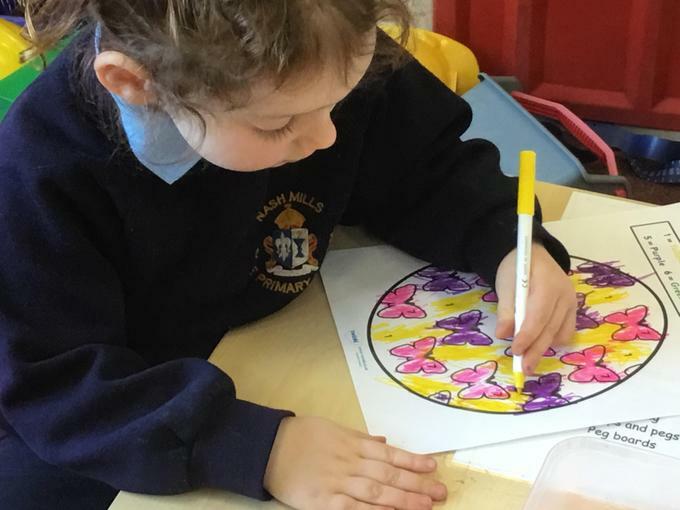 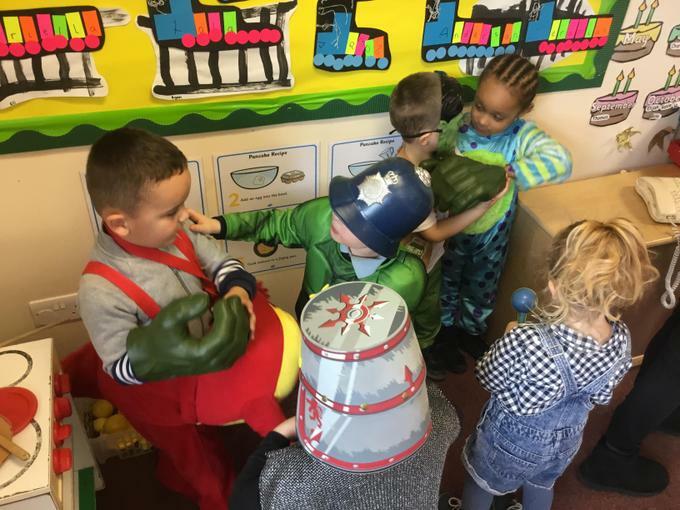 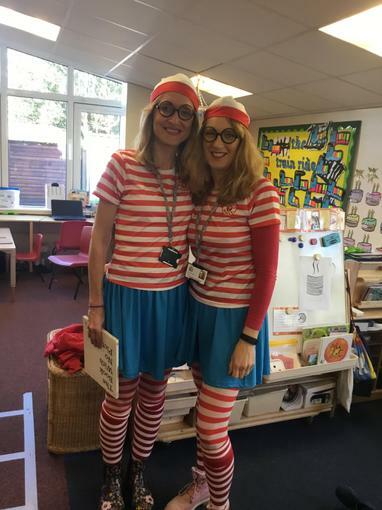 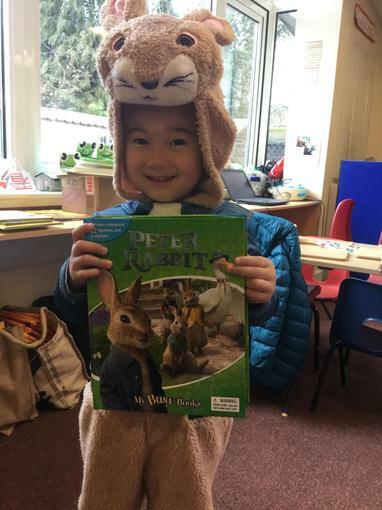 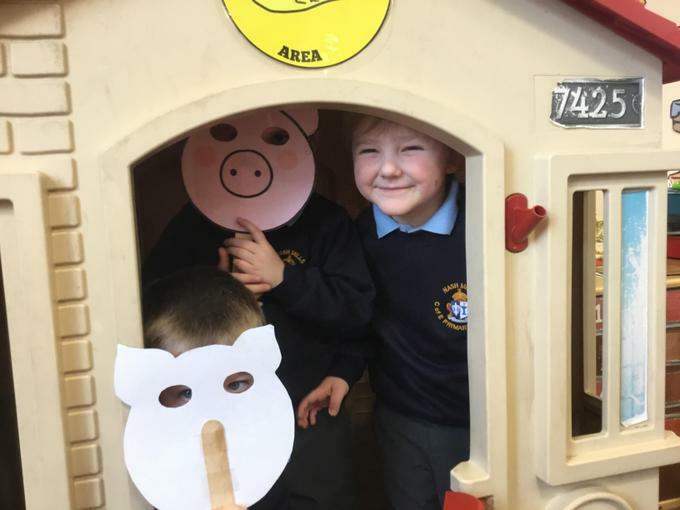 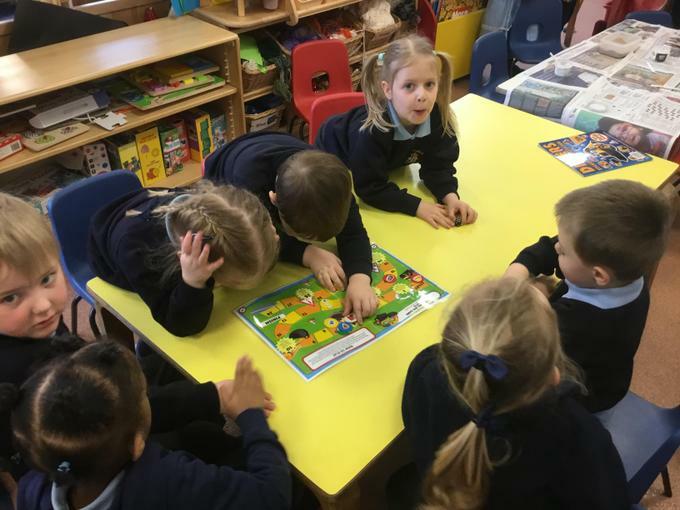 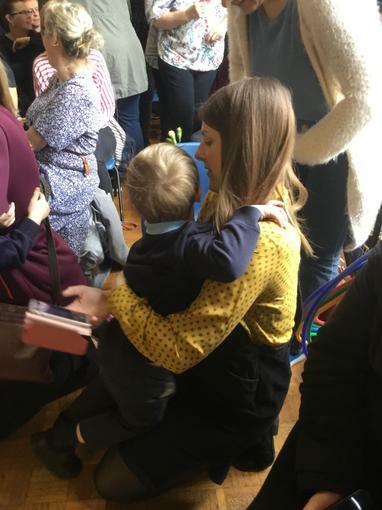 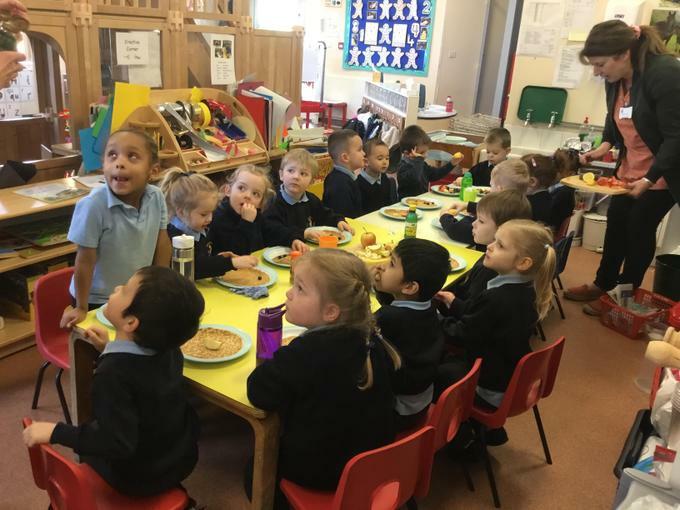 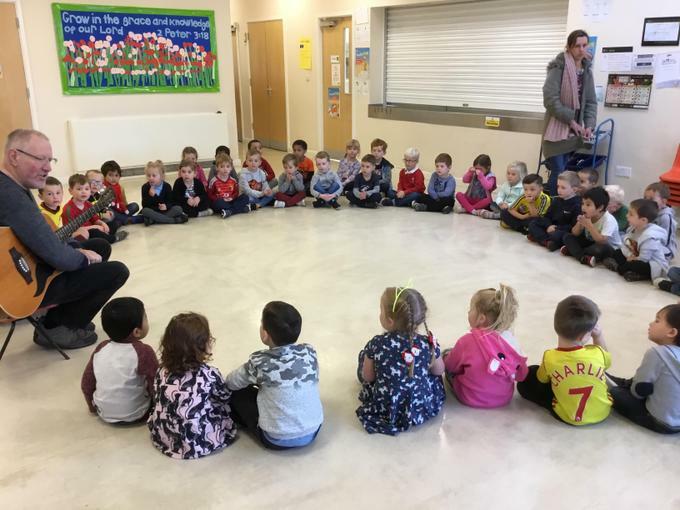 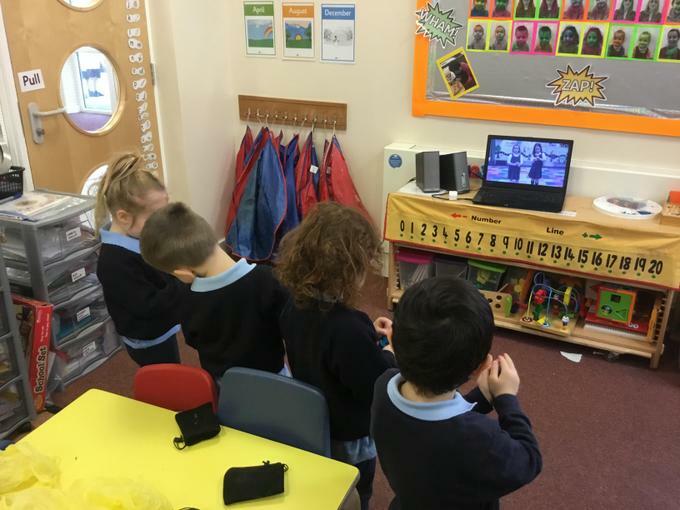 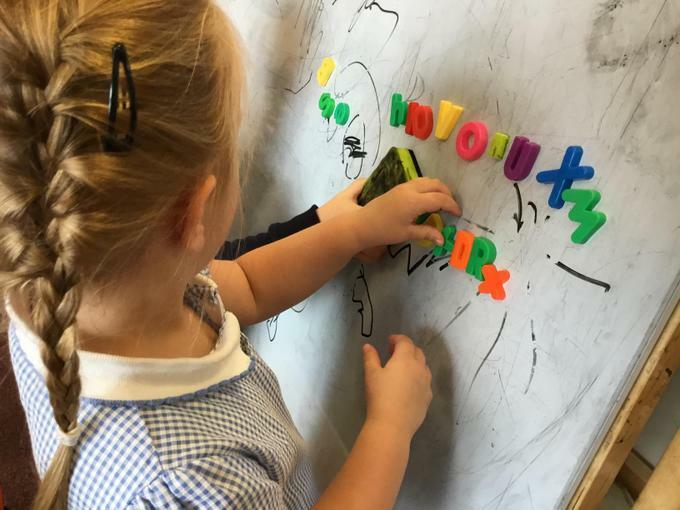 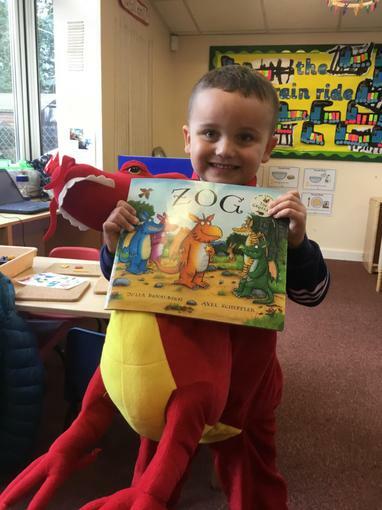 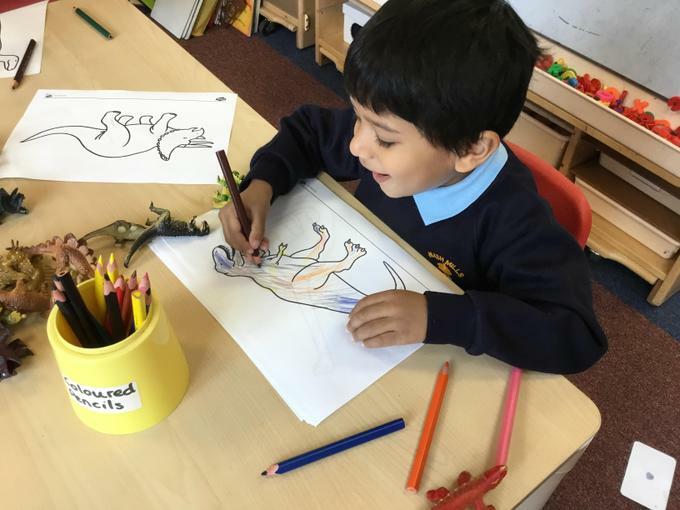 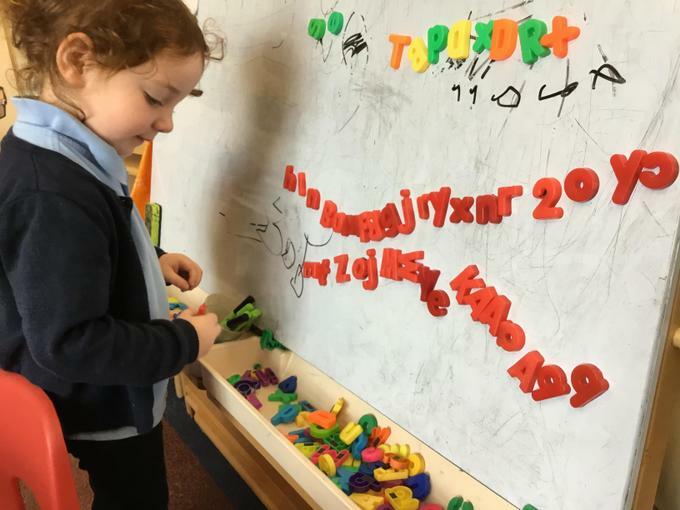 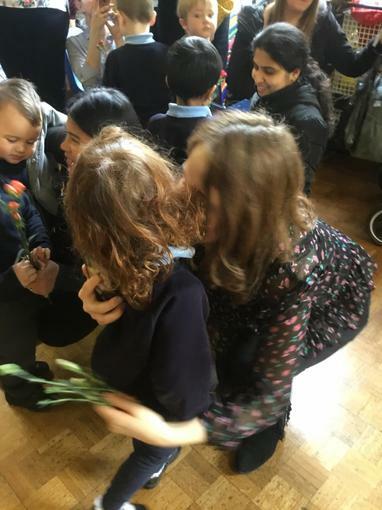 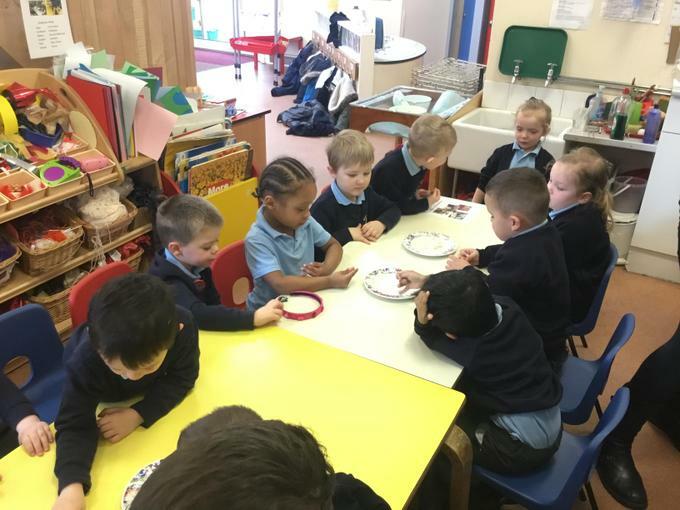 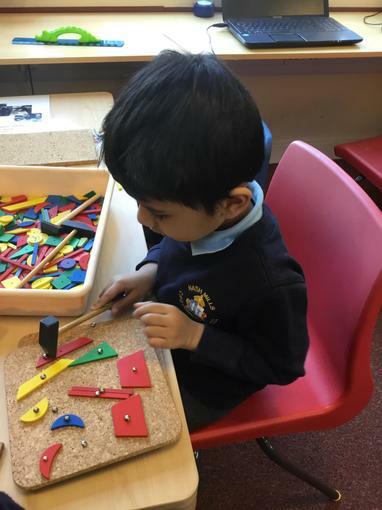 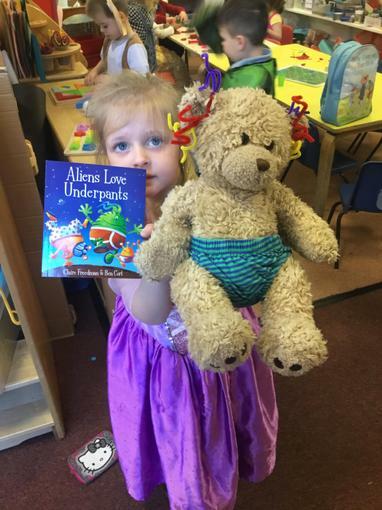 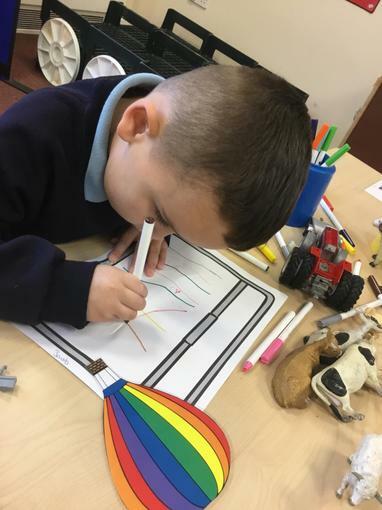 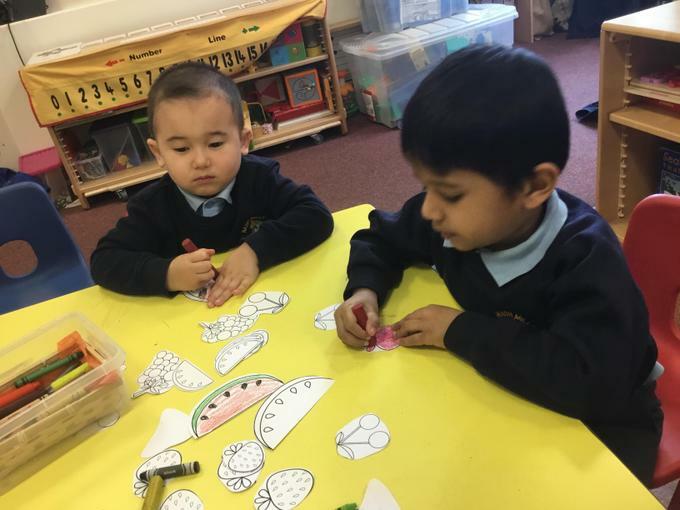 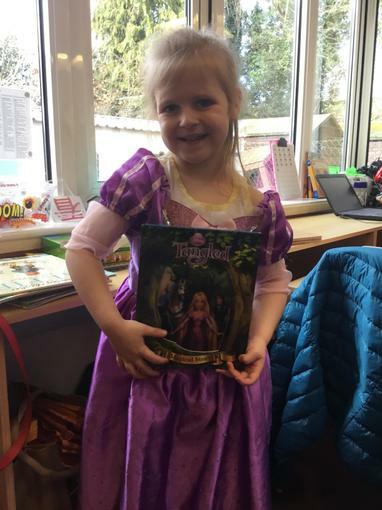 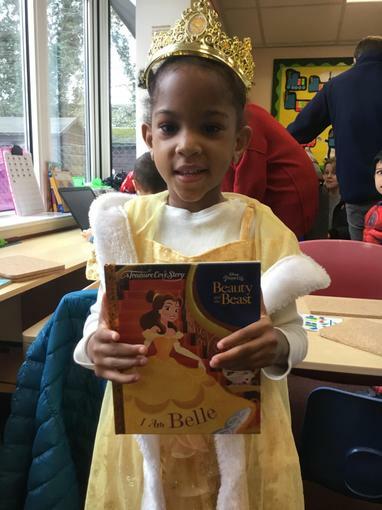 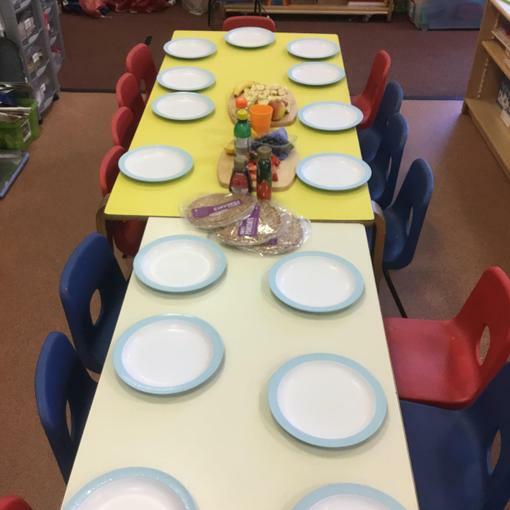 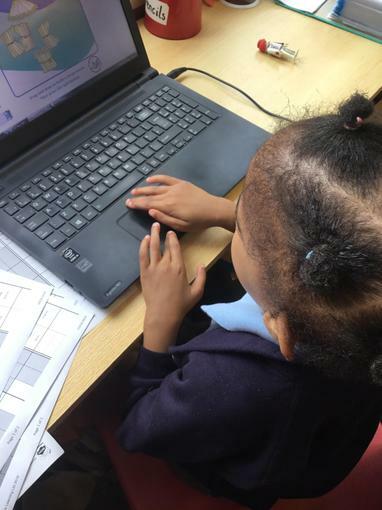 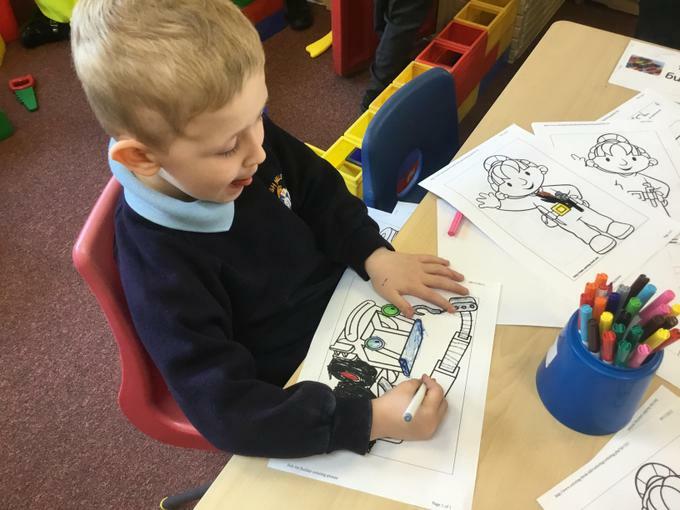 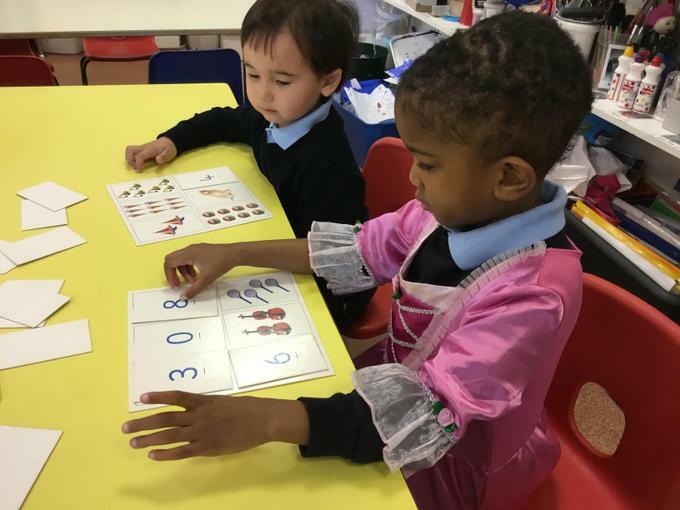 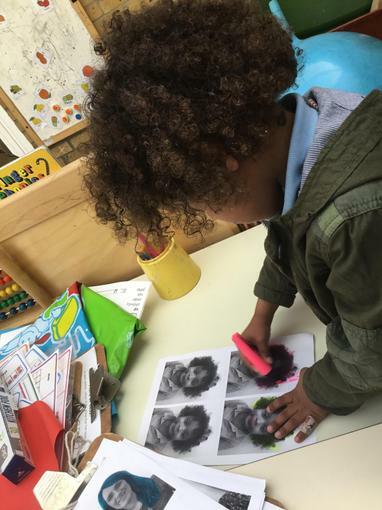 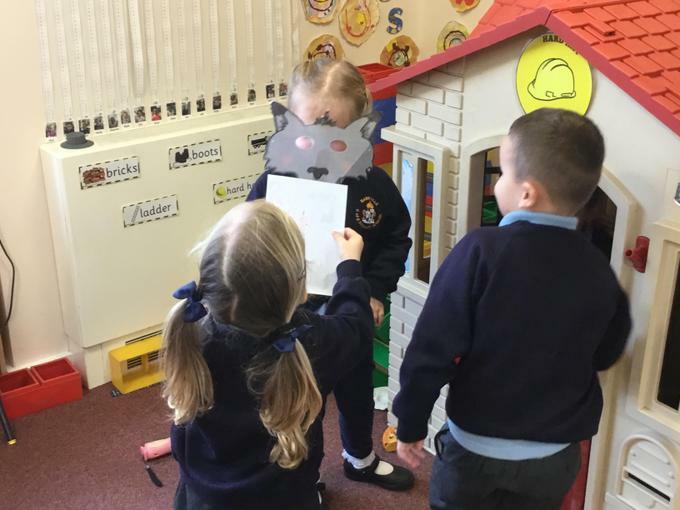 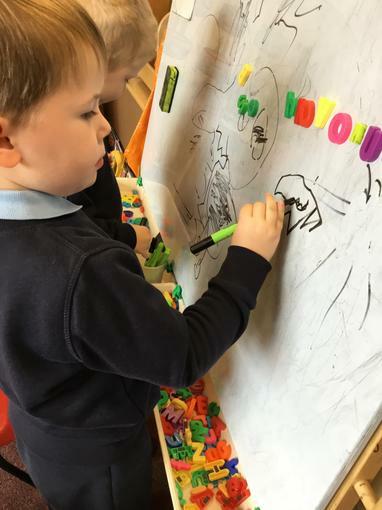 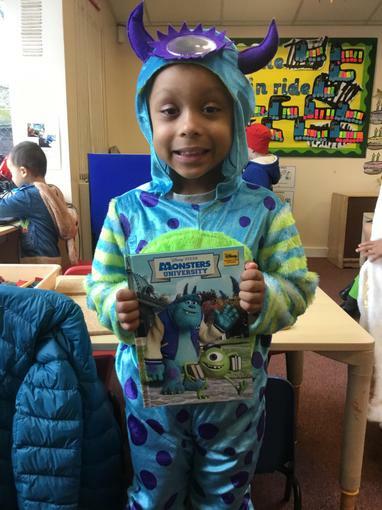 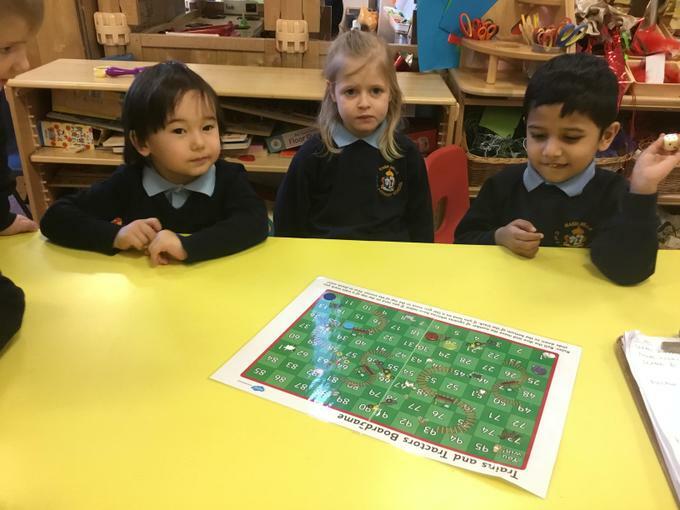 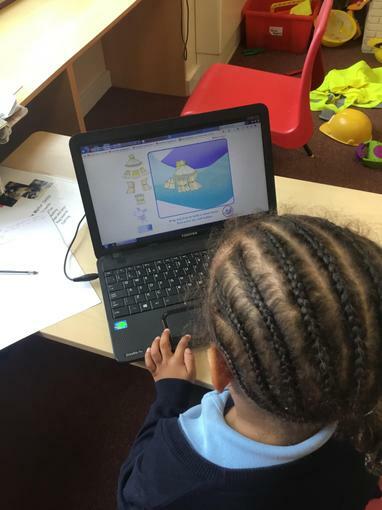 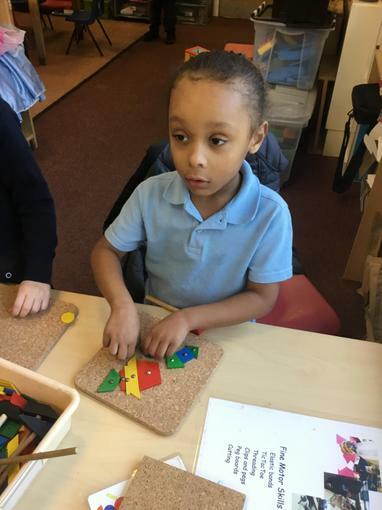 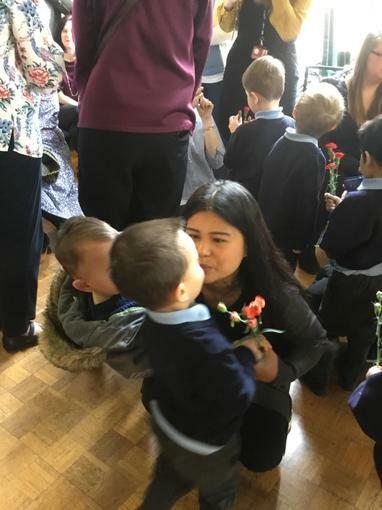 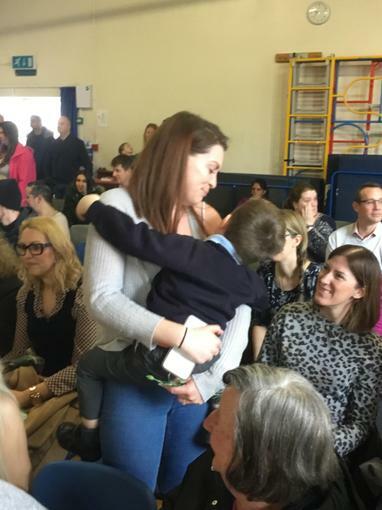 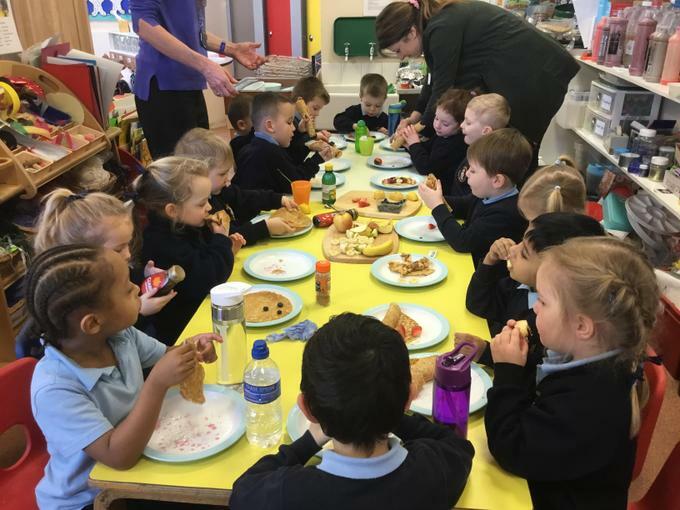 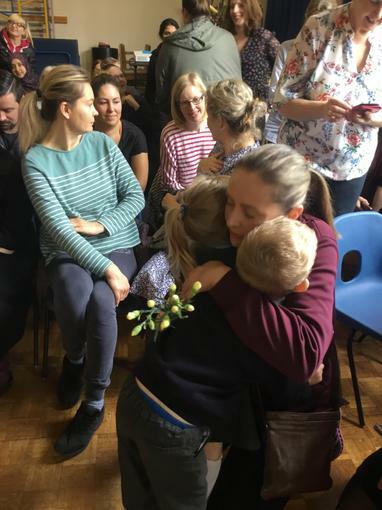 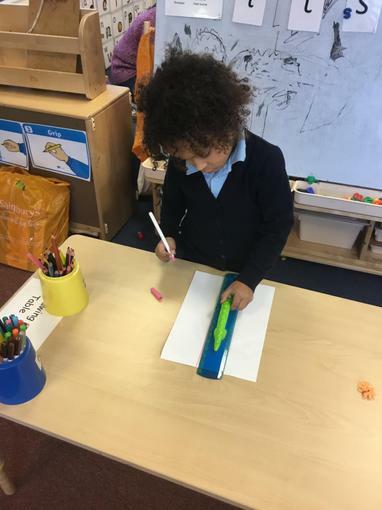 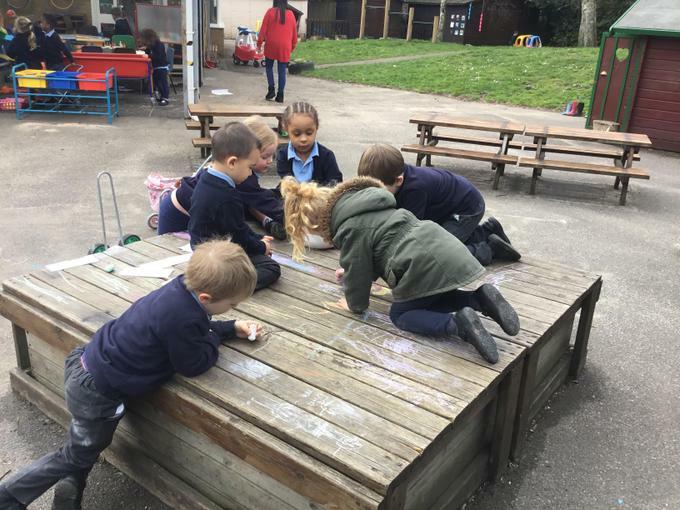 All the children spent time in each other's classrooms, allowing them to get to know each other, teaching staff and their environments a little better. 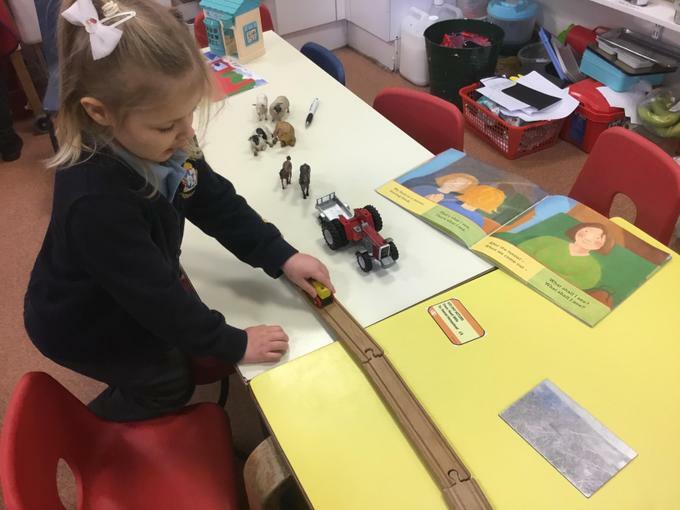 We looked at the story of 'The Train Ride' by June Crebbins as part of our topic. 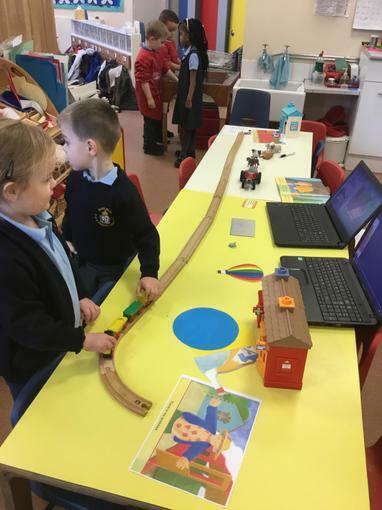 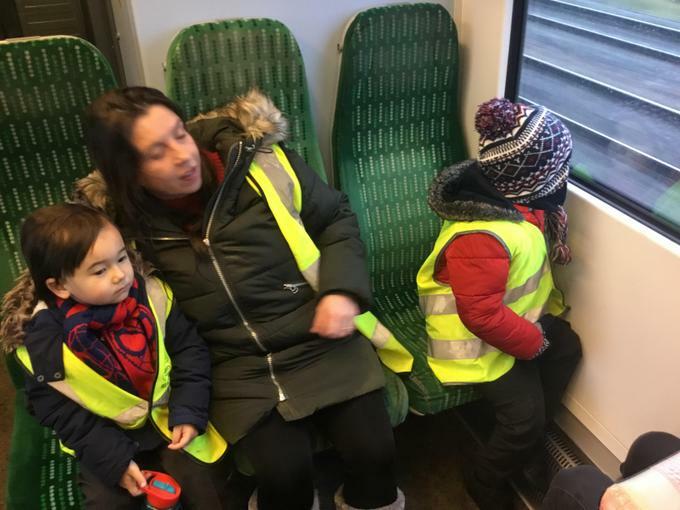 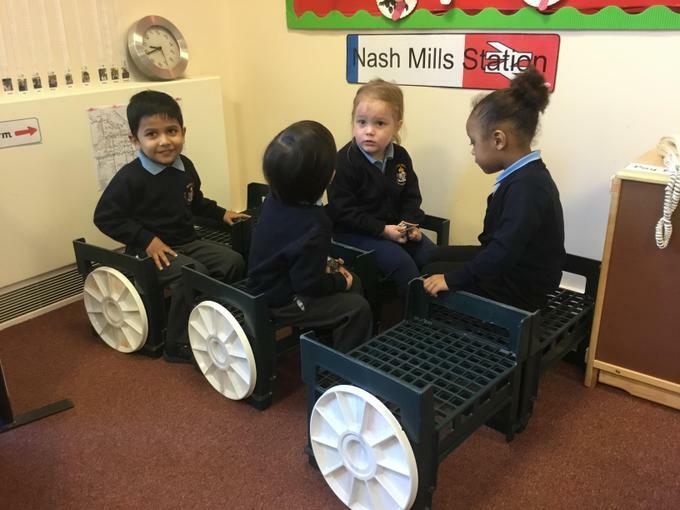 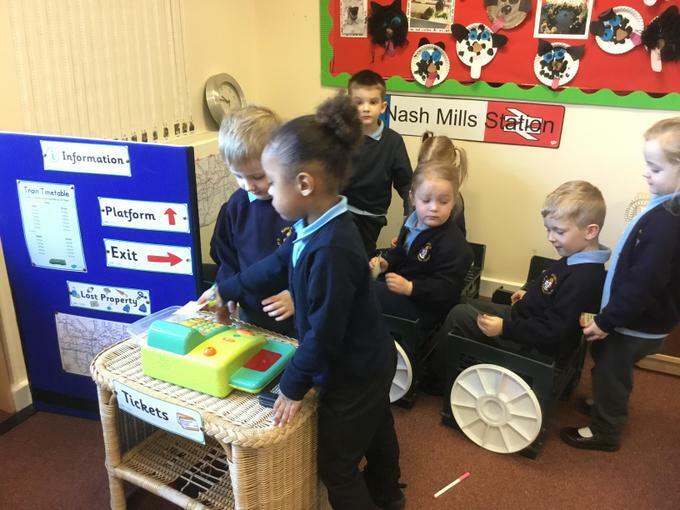 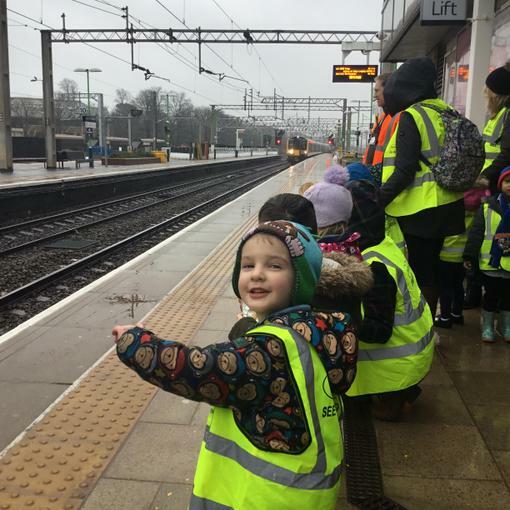 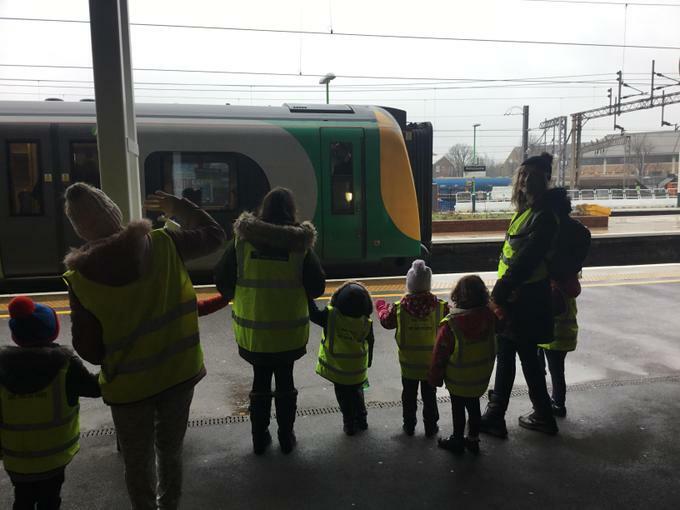 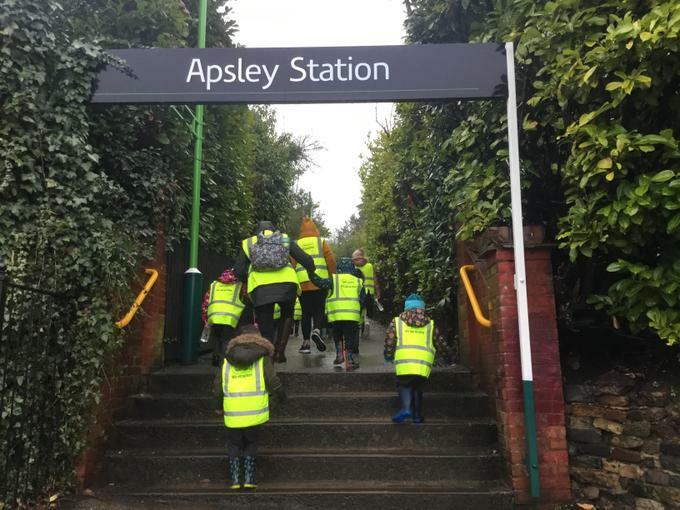 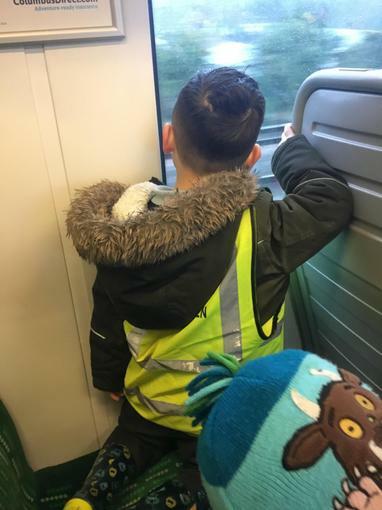 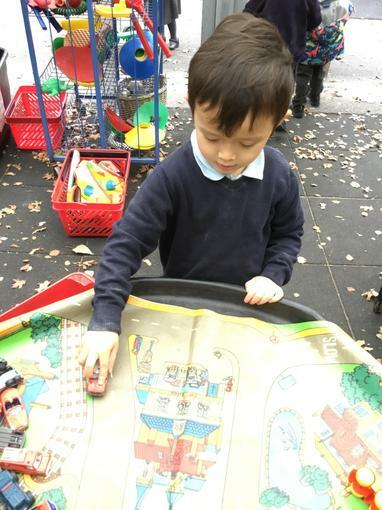 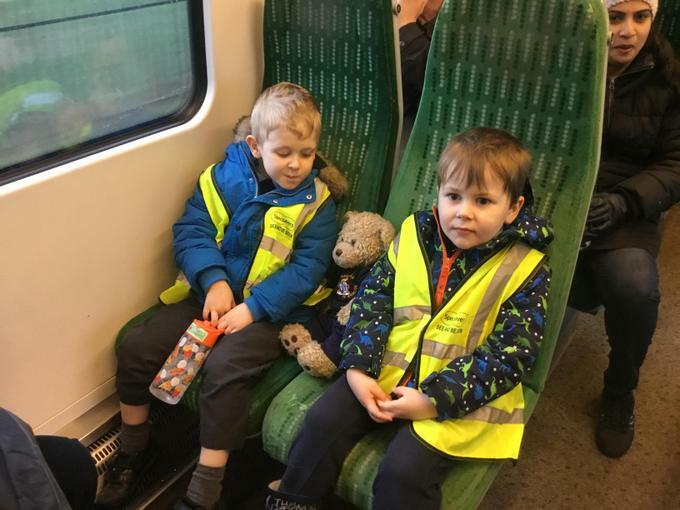 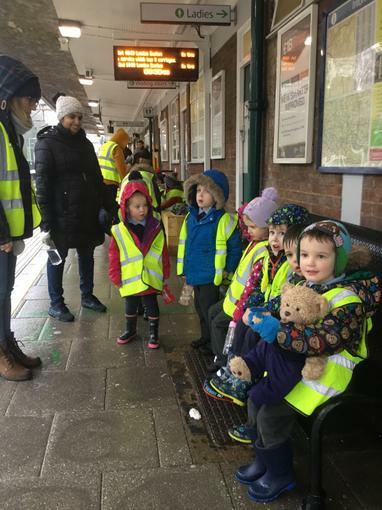 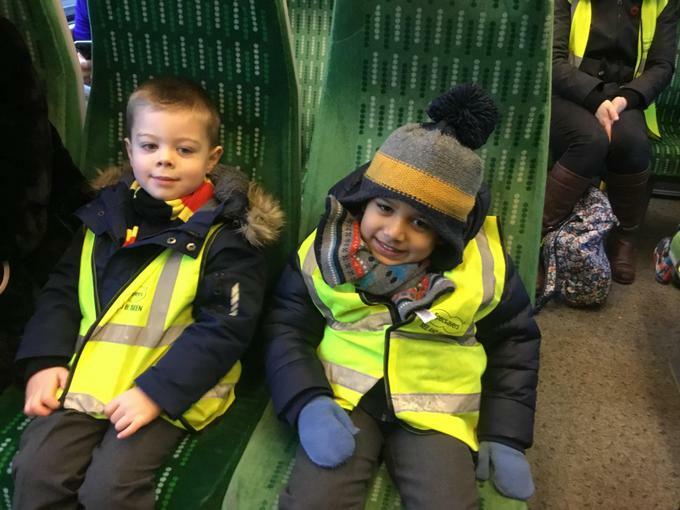 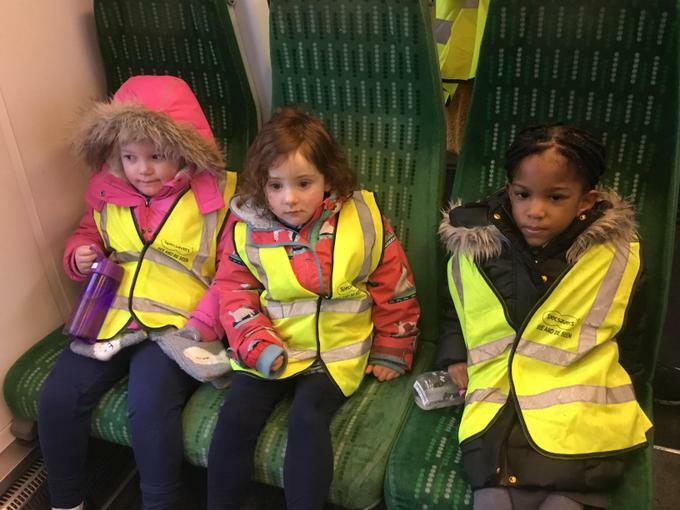 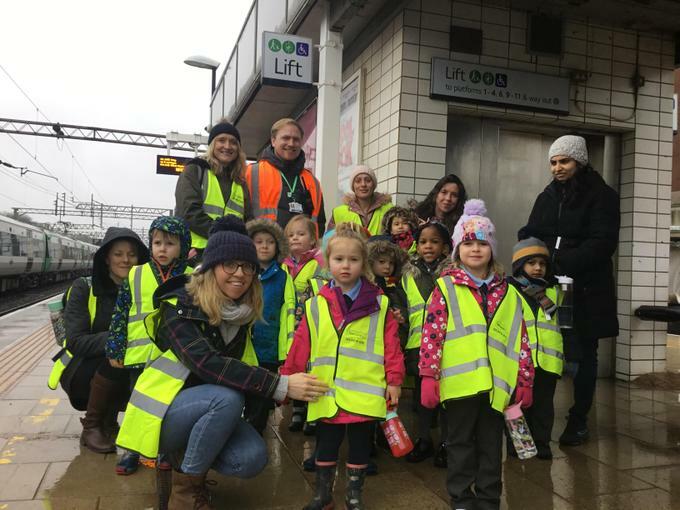 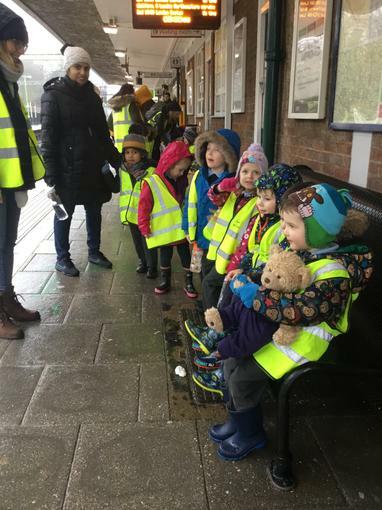 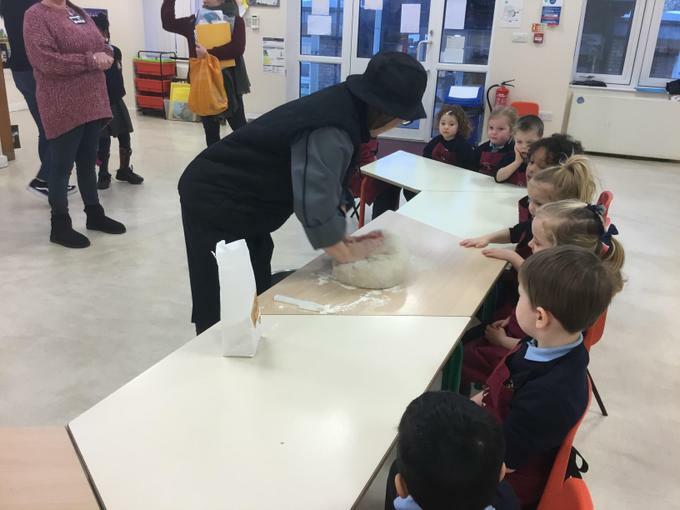 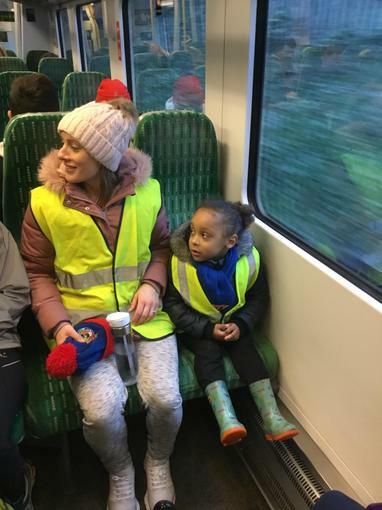 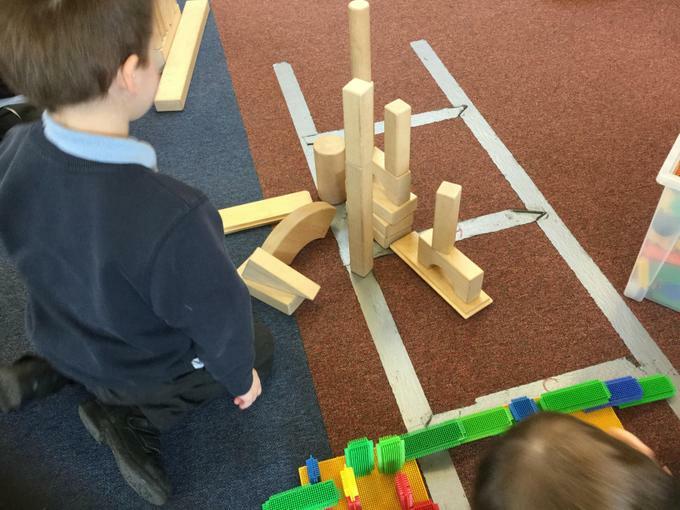 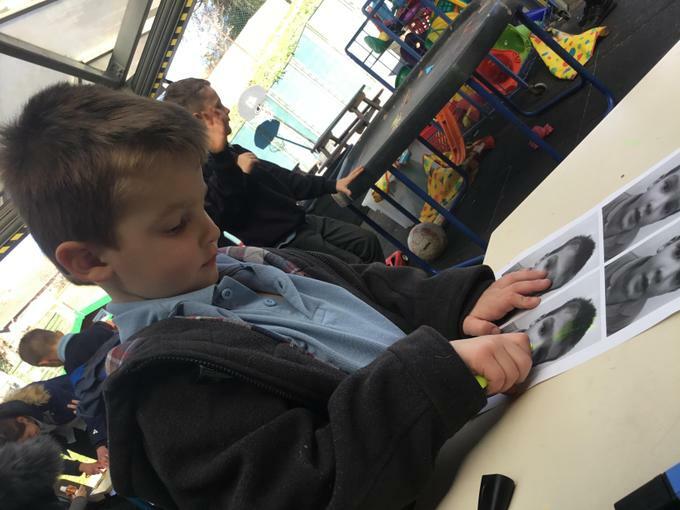 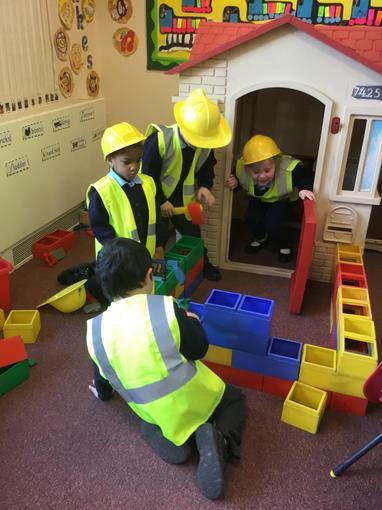 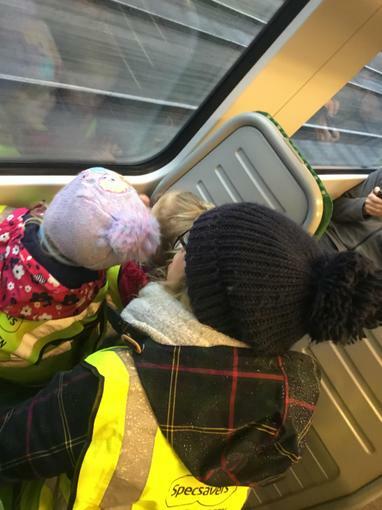 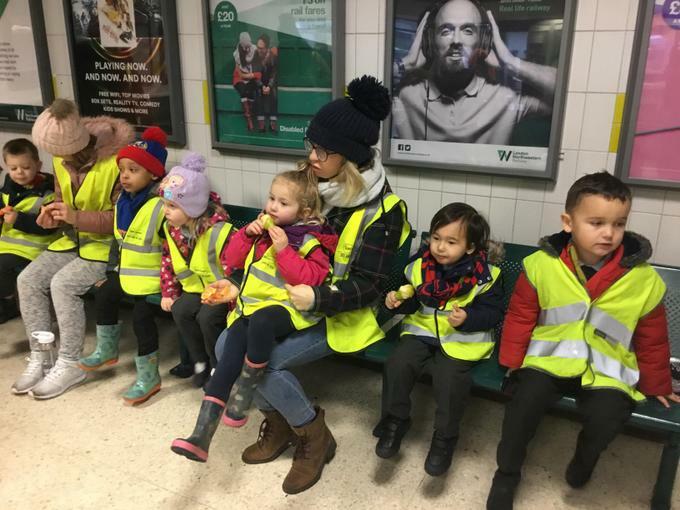 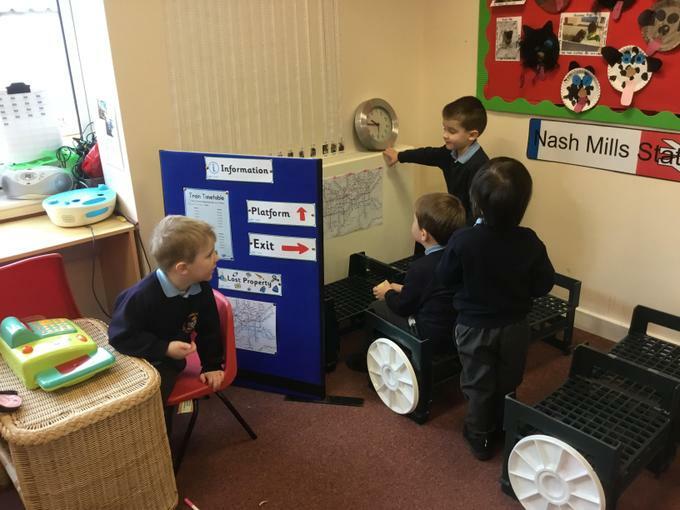 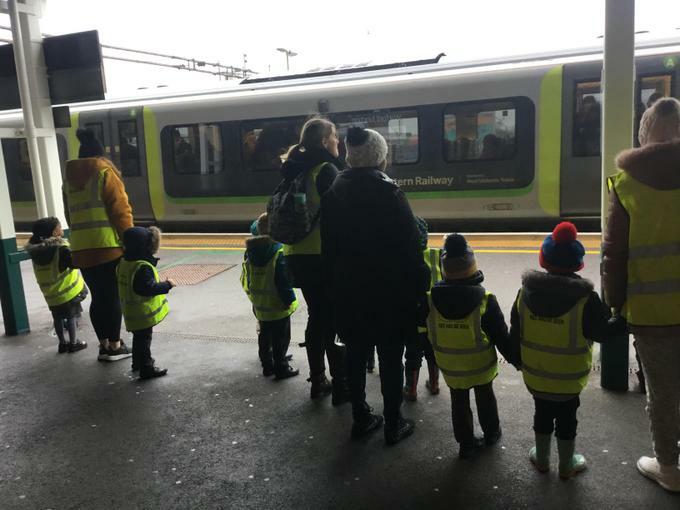 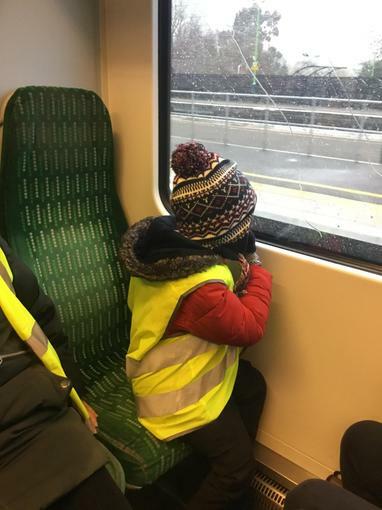 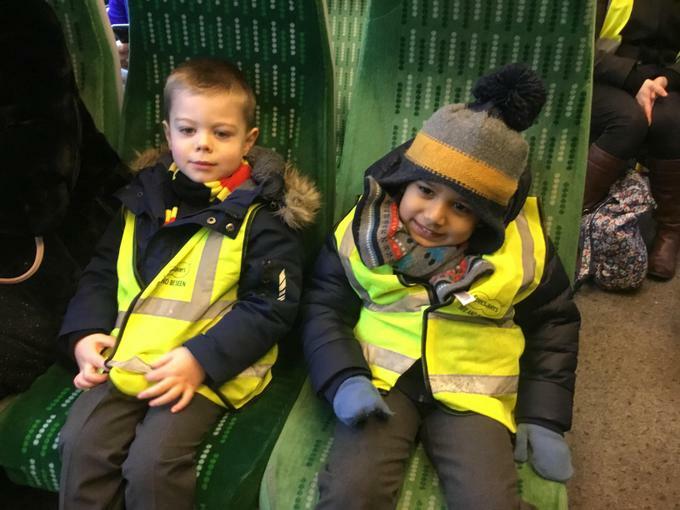 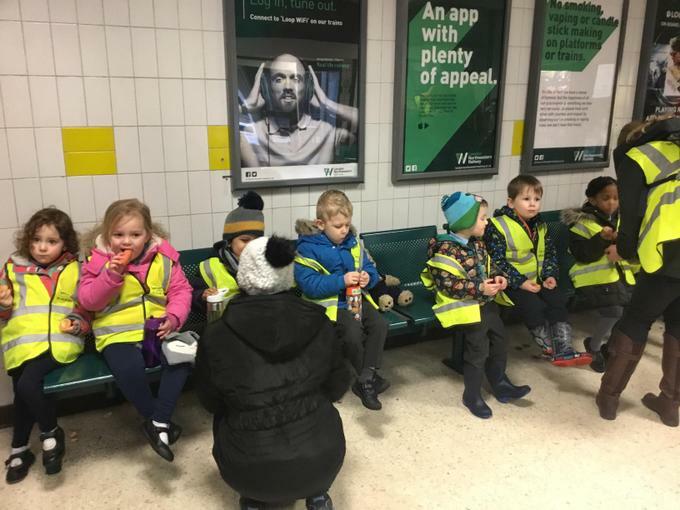 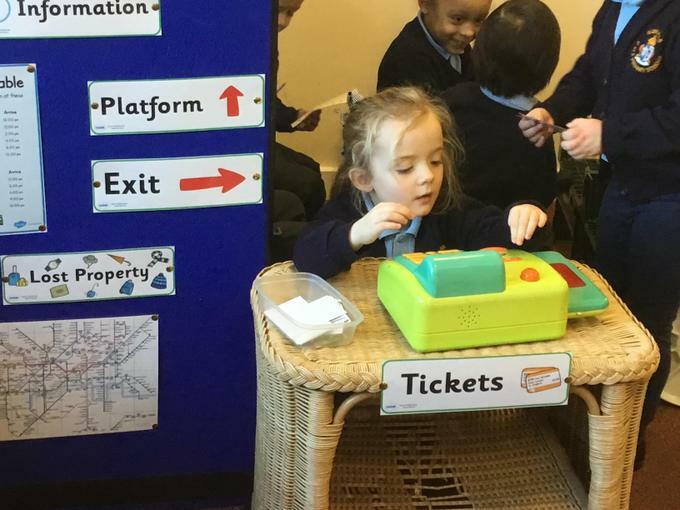 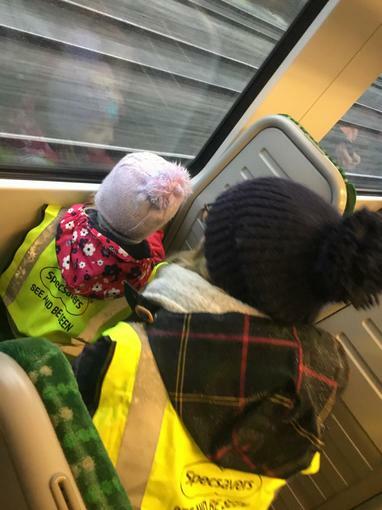 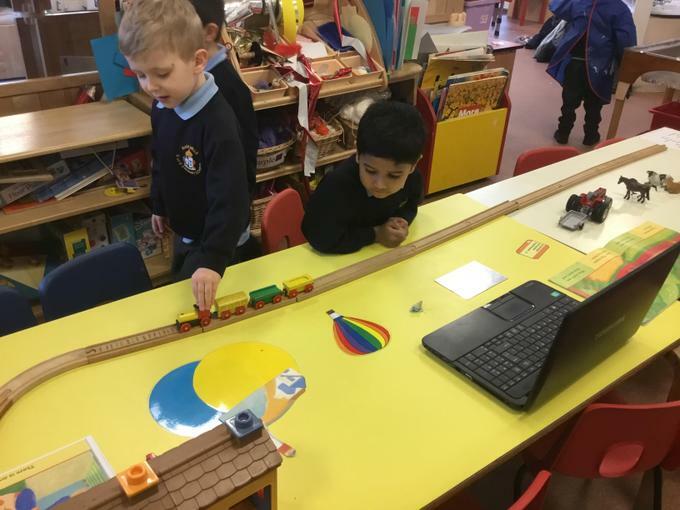 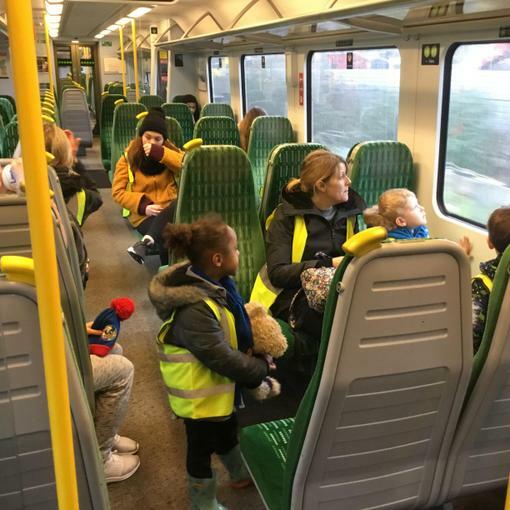 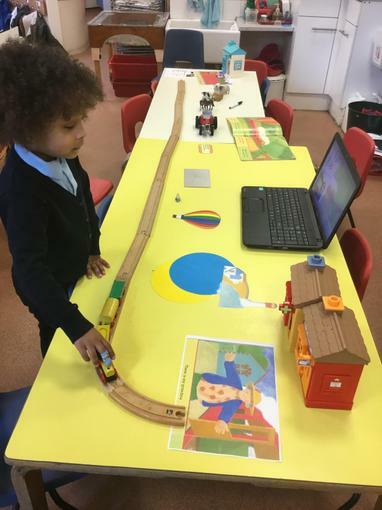 We set up a train station role play area for the children to play in and, at the end of the topic, visited Watford Junction train station by taking our own train ride from Apsley to Watford. 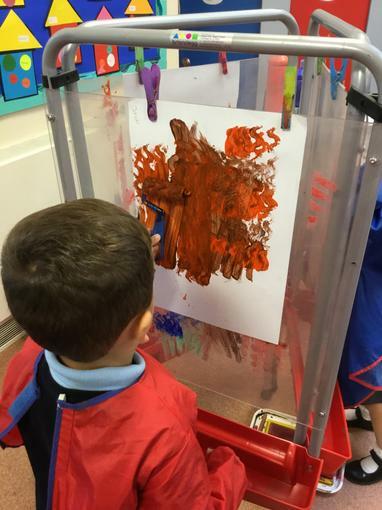 We spent time thinking about what you might see out of the train windows and drew pictures of what we imagined. 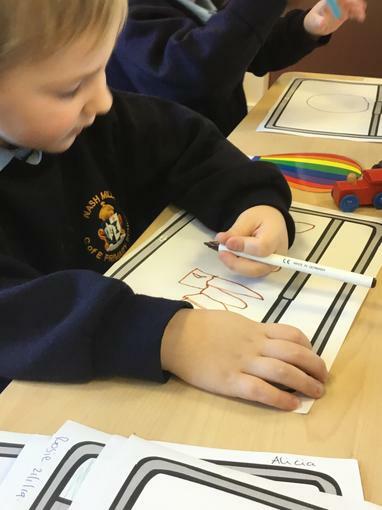 We used shapes to make a picture of a train and also wrote our names on trains. 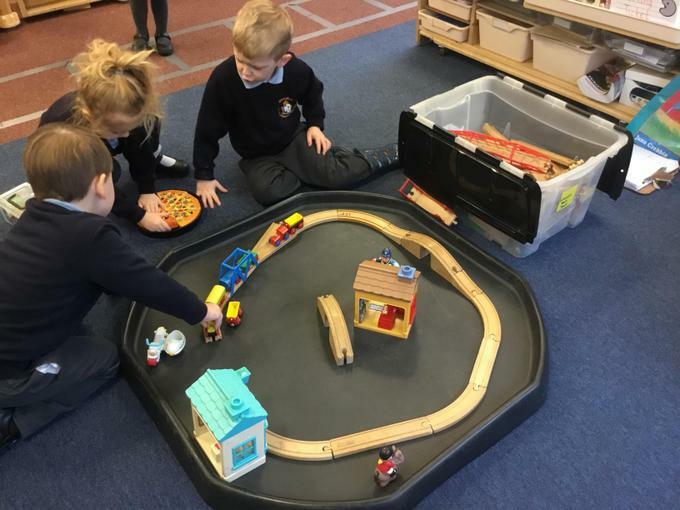 We told the story of 'The Train Ride', using story mapping and also using objects to re-tell the story verbally. 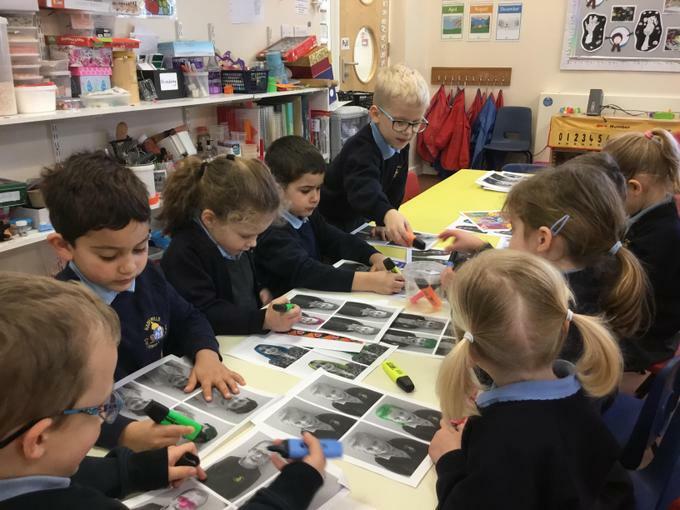 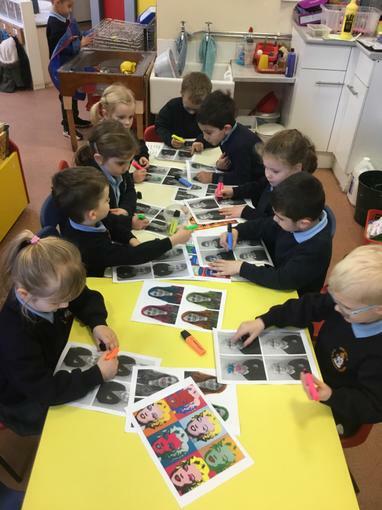 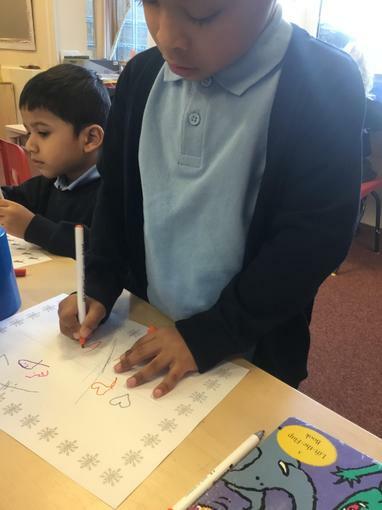 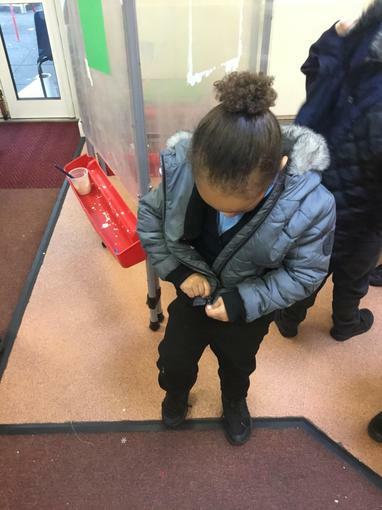 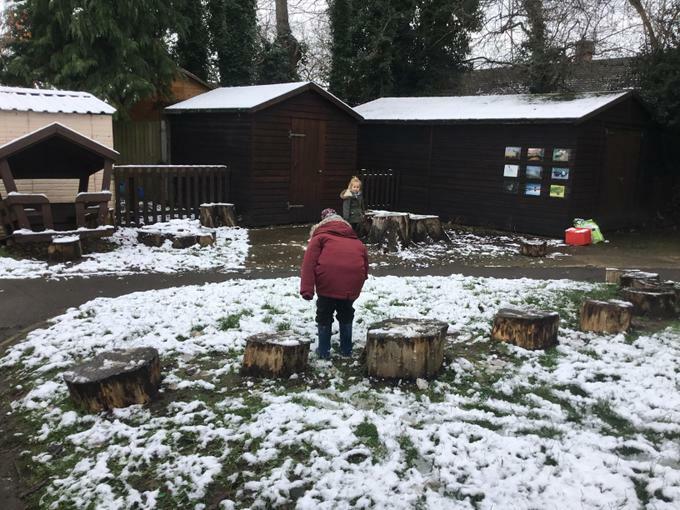 After the Christmas break, we looked at Winter as our first topic of the year, thinking about what Winter feels like, looks like and what clothes we wear at this time. 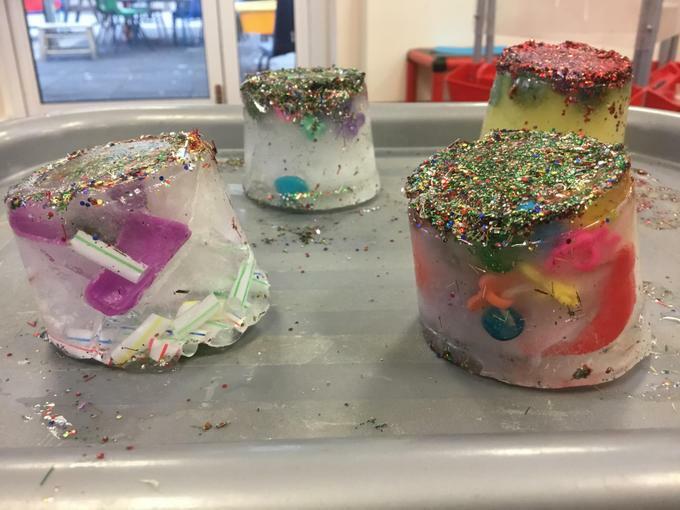 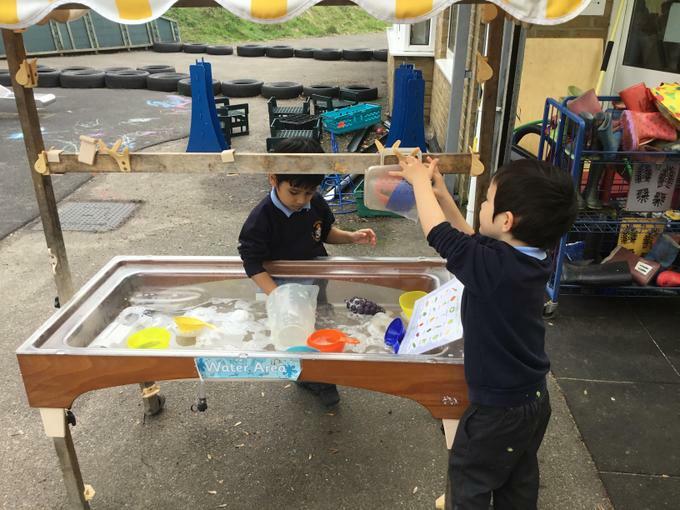 We experimented with ice, talking about how it feels and making ‘ice pictures’. 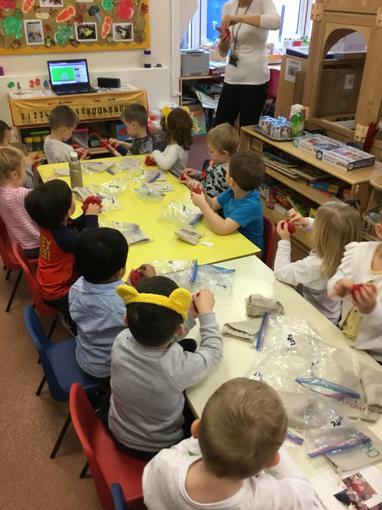 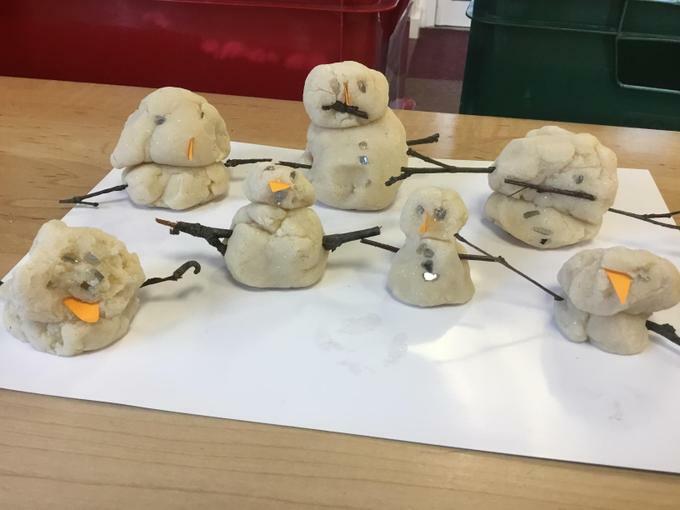 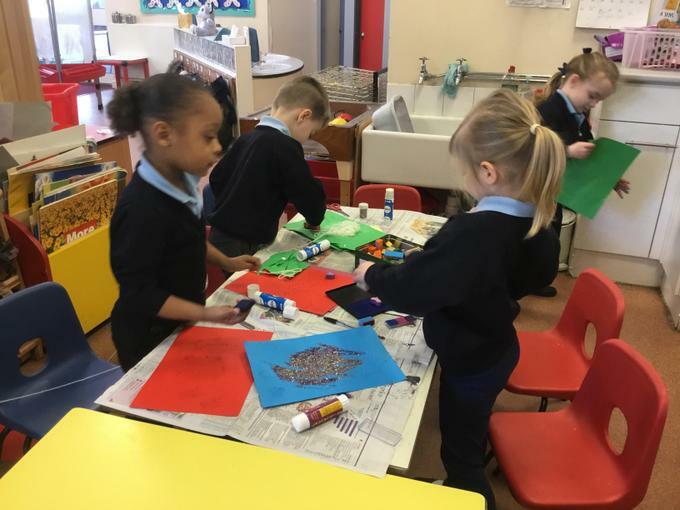 We made Winter trees, using our hand prints, and made playdoh snowmen. 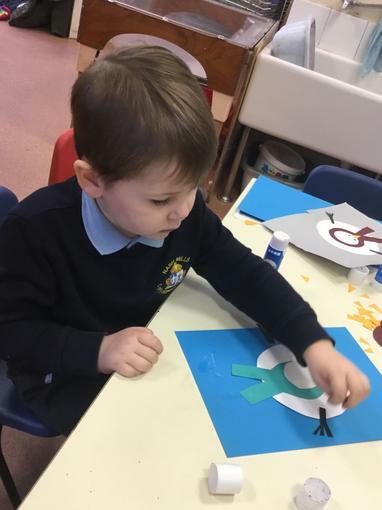 We also made collage snowmen, using different sized circles and using relevant vocabulary to describe size. 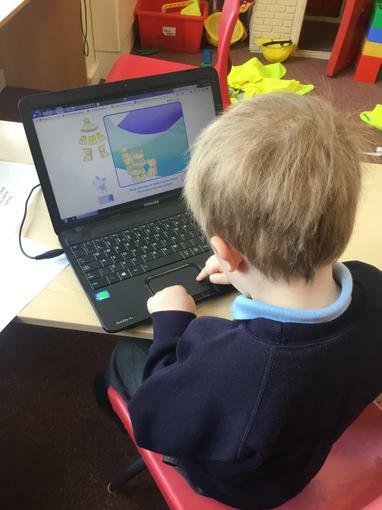 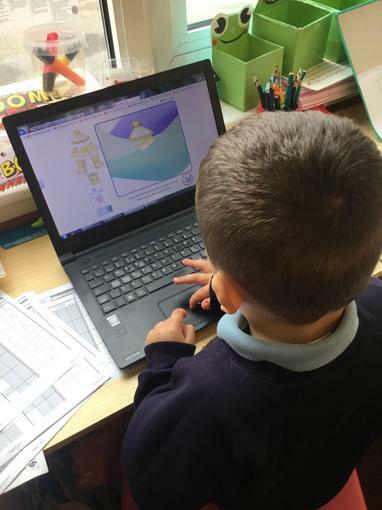 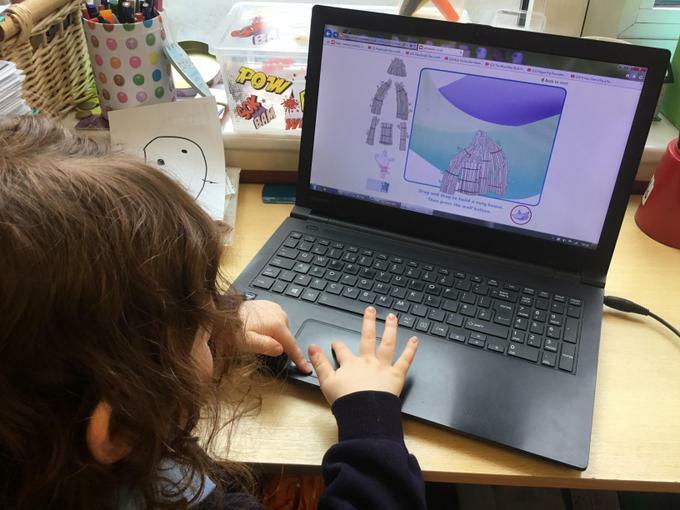 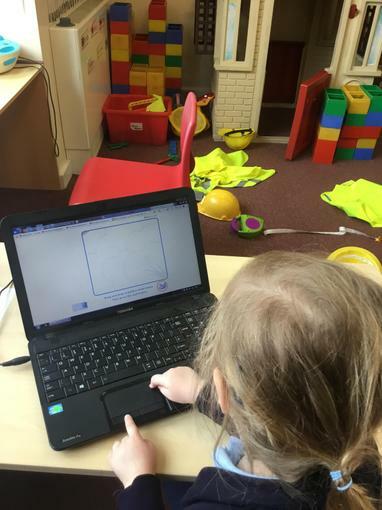 We played games on the lap top, practising our skills to move the cursor and click on objects. 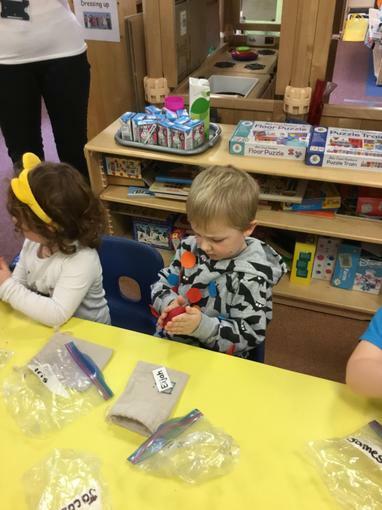 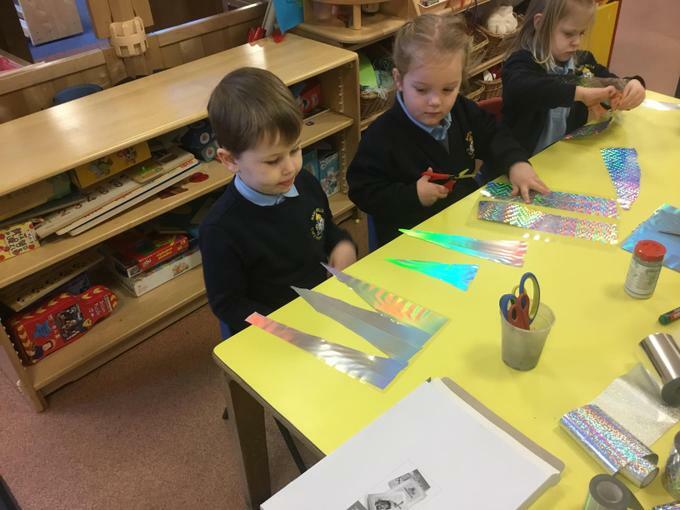 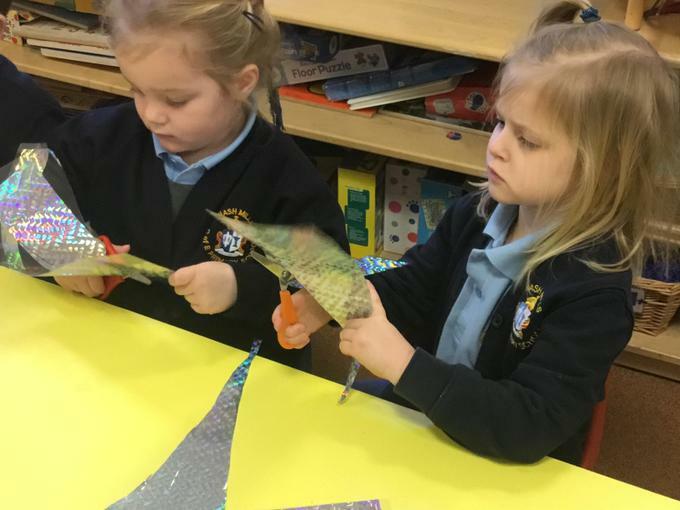 We also made icicles by cutting out shiny material and talked about how they are formed. 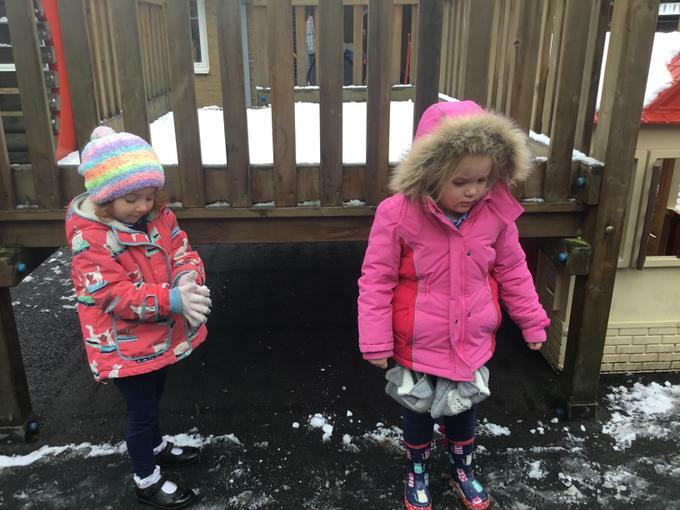 We looked at the temperature indoors and outdoors, comparing the numbers and thinking about why it was warmer inside. 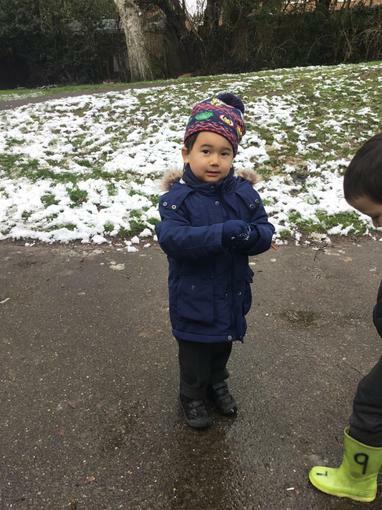 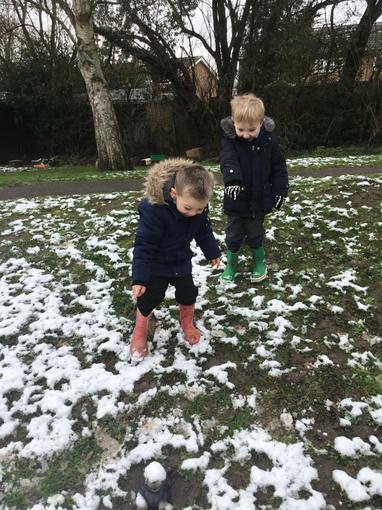 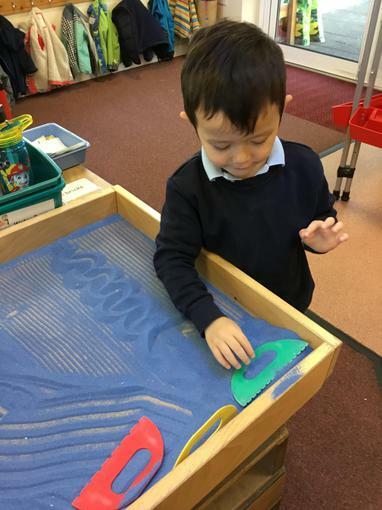 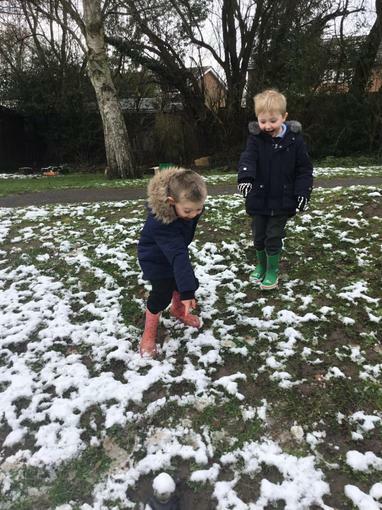 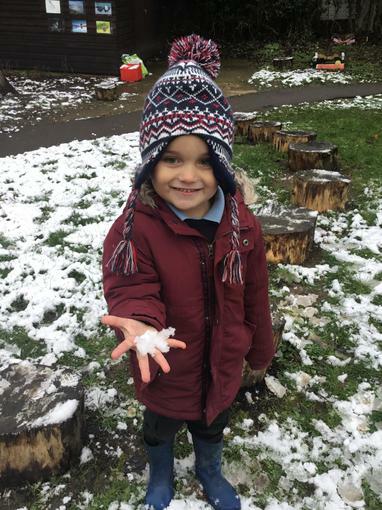 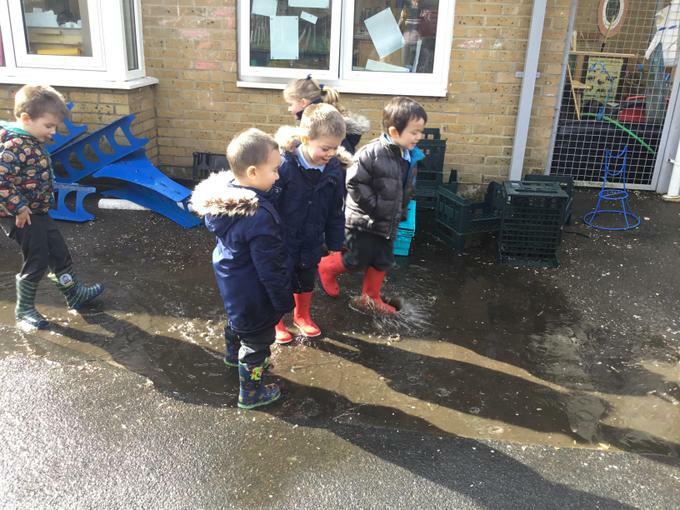 When it snowed, we played outside and made footprints in the snow, talking about how slippery the ice was and about the dangers of running around when it’s icy. 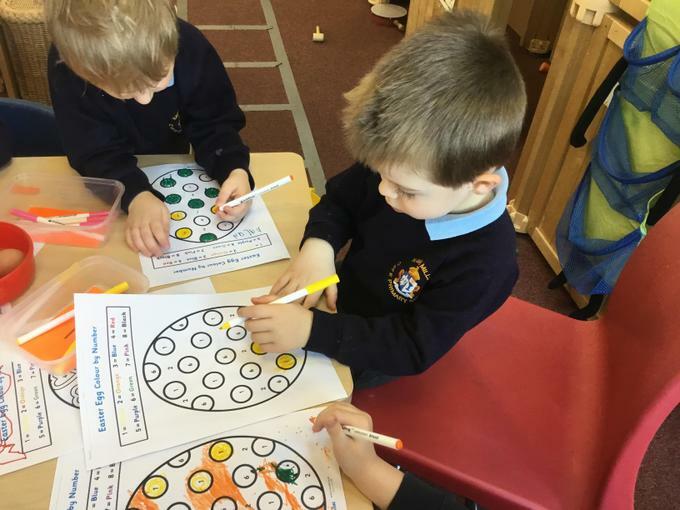 We have focused on numbers and counting over the last few weeks. 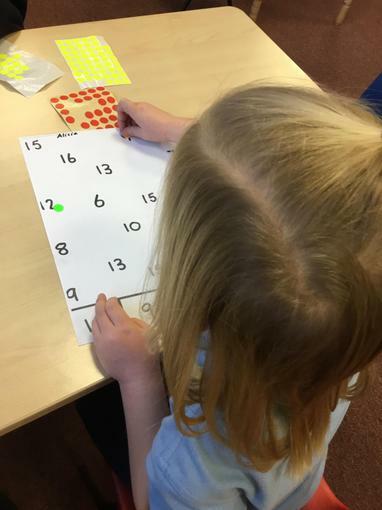 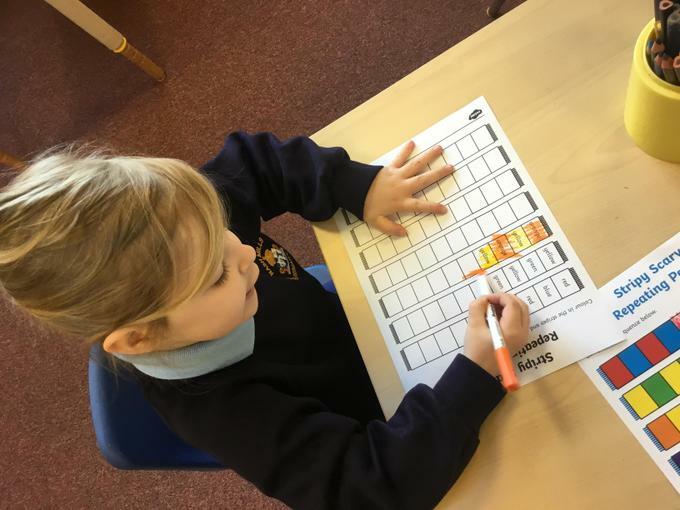 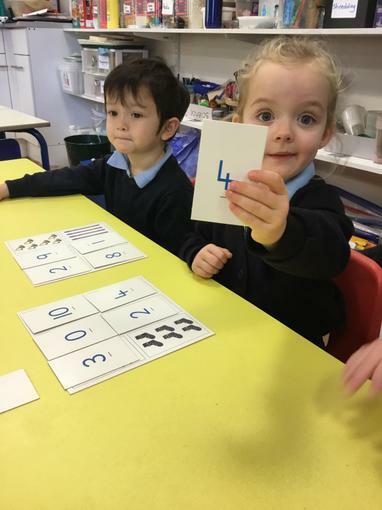 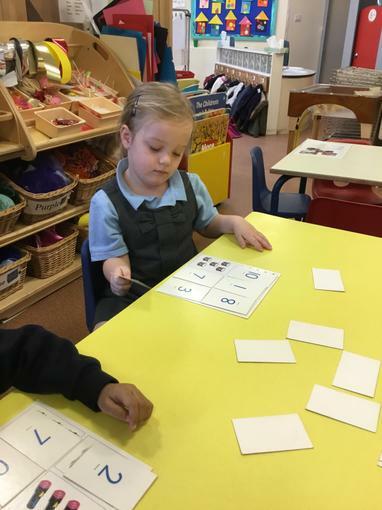 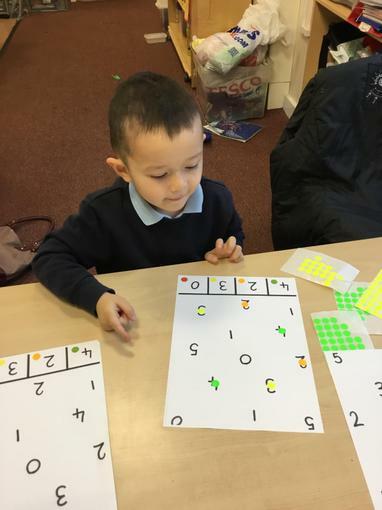 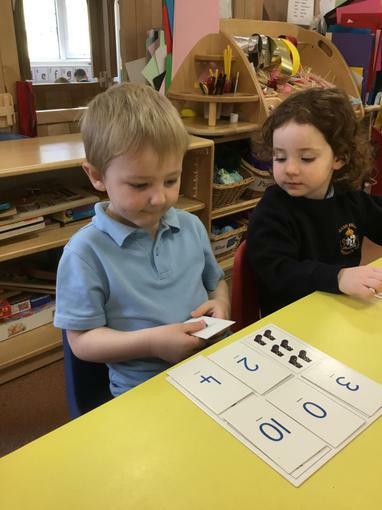 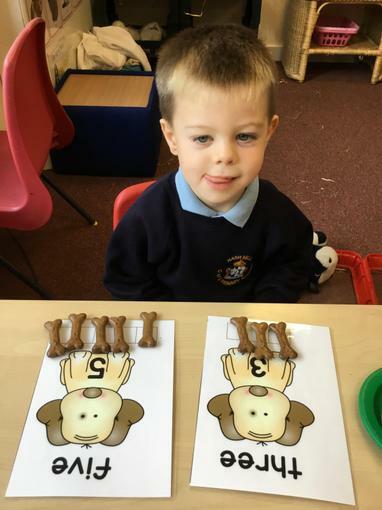 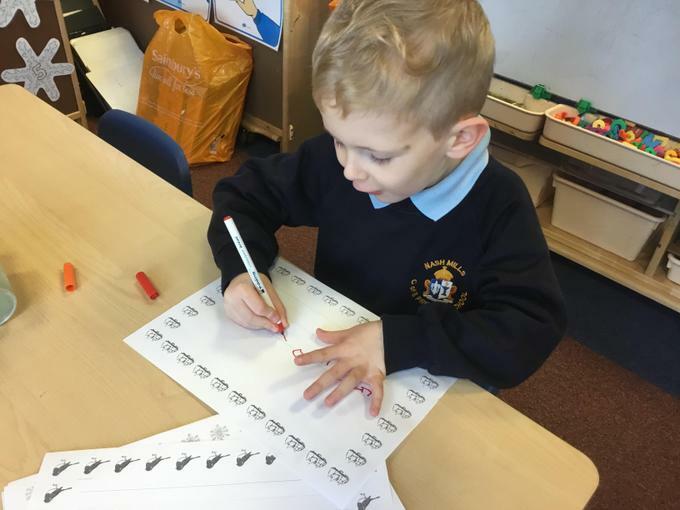 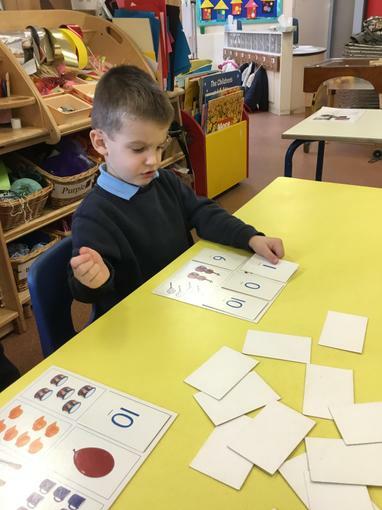 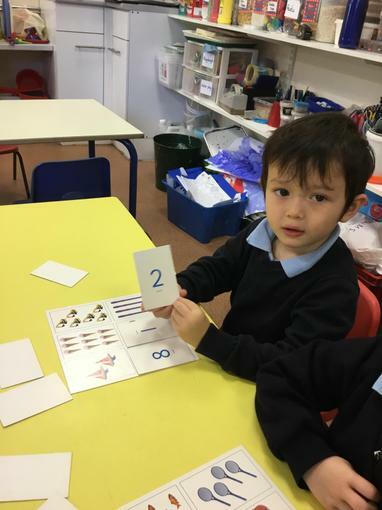 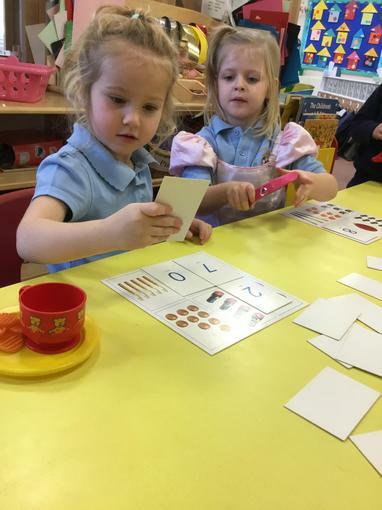 We have looked at matching numerals, forming them correctly and learning the rhymes to help us recognise them. 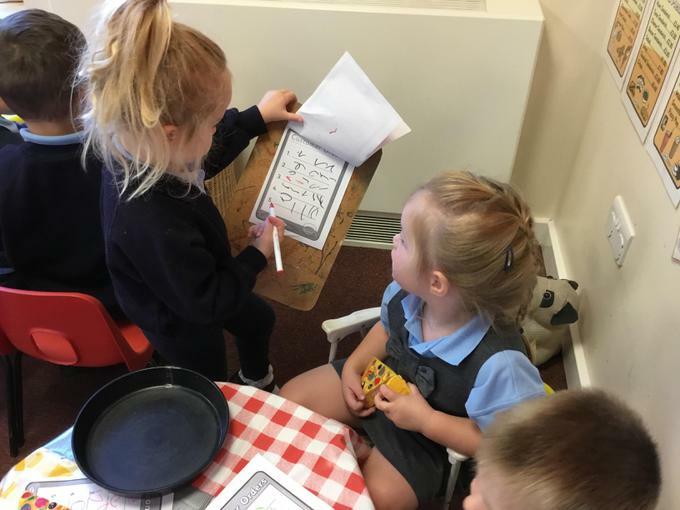 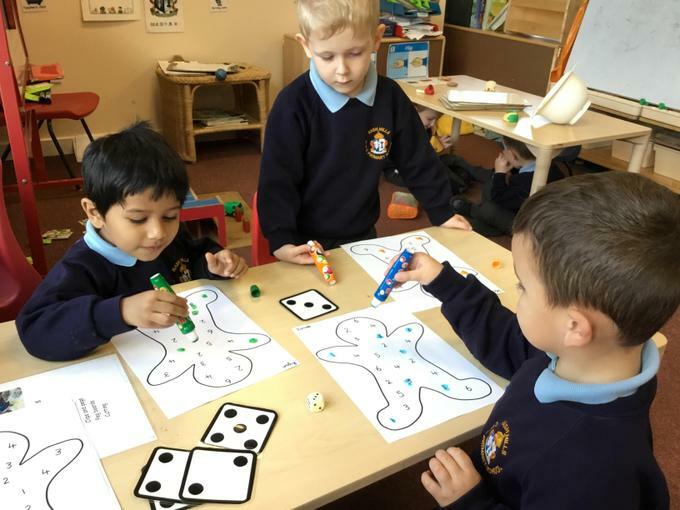 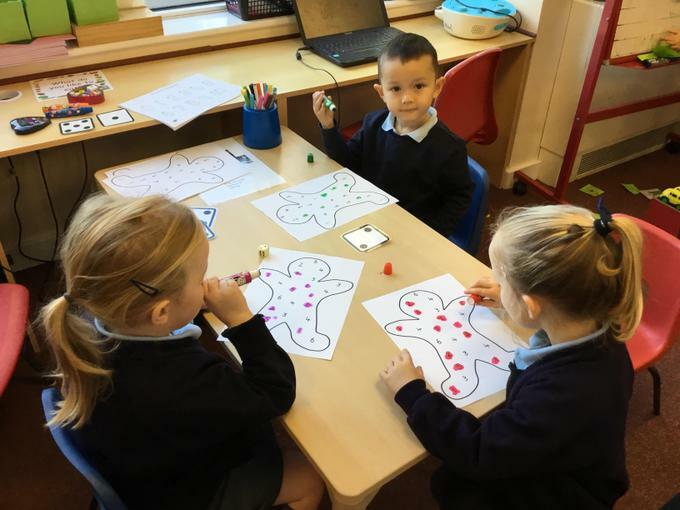 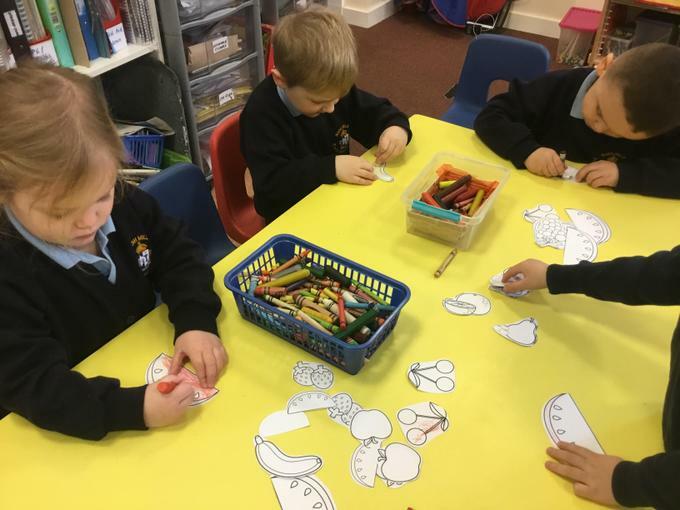 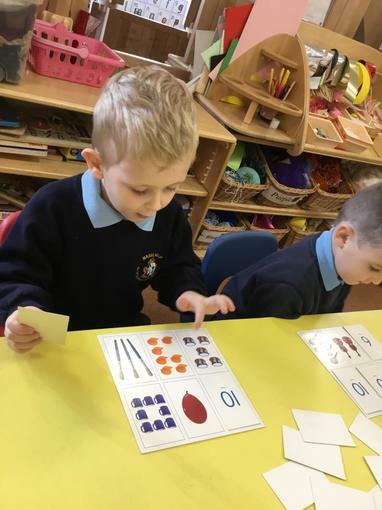 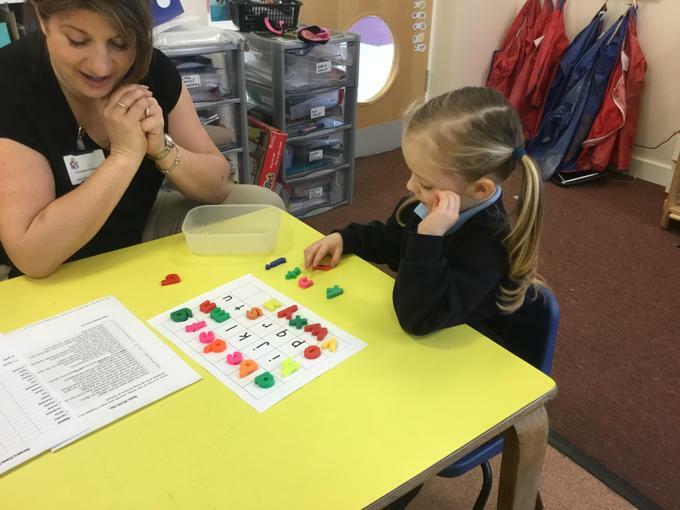 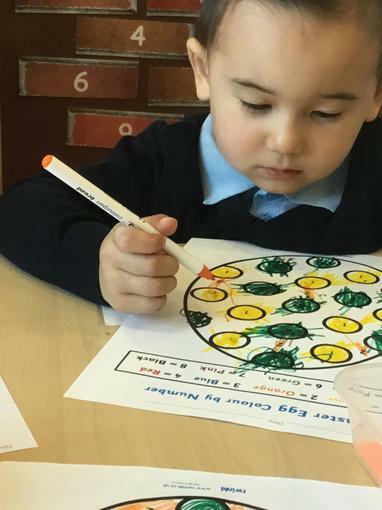 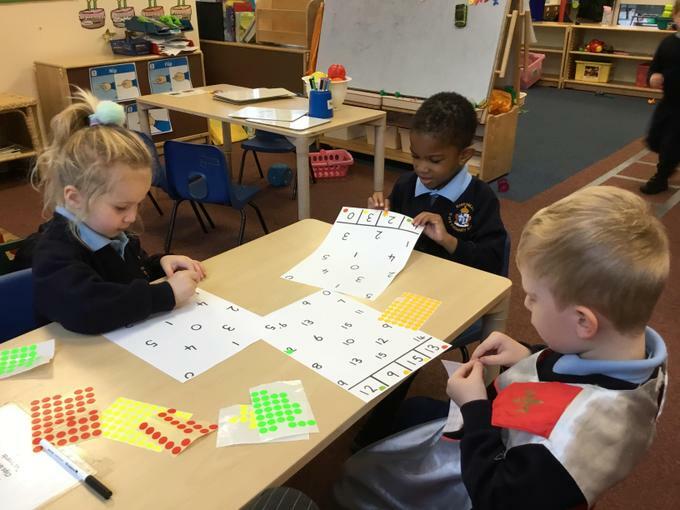 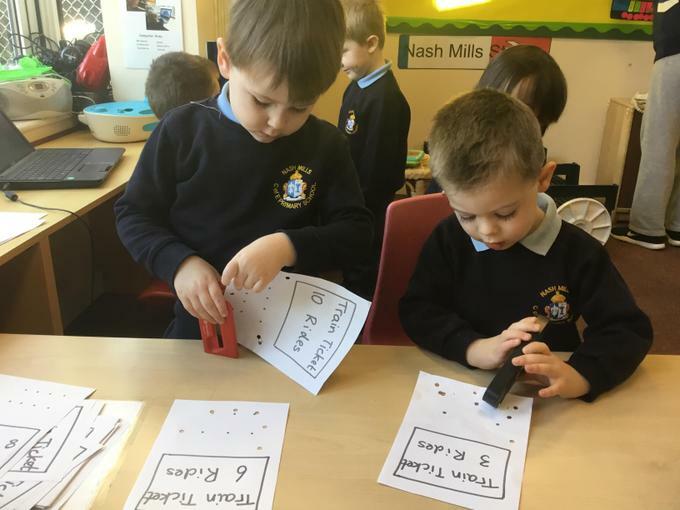 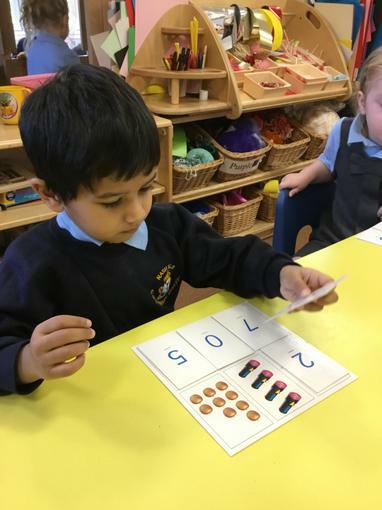 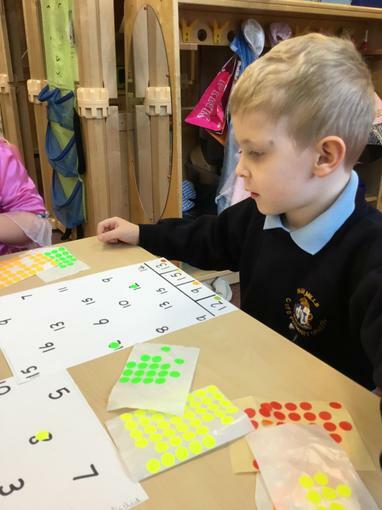 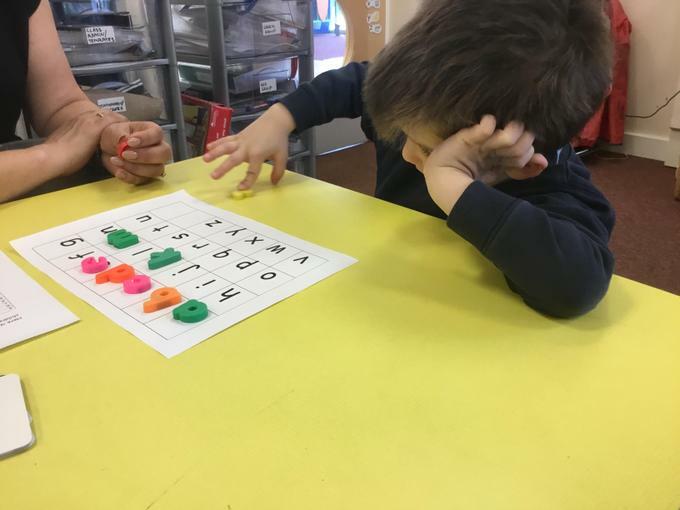 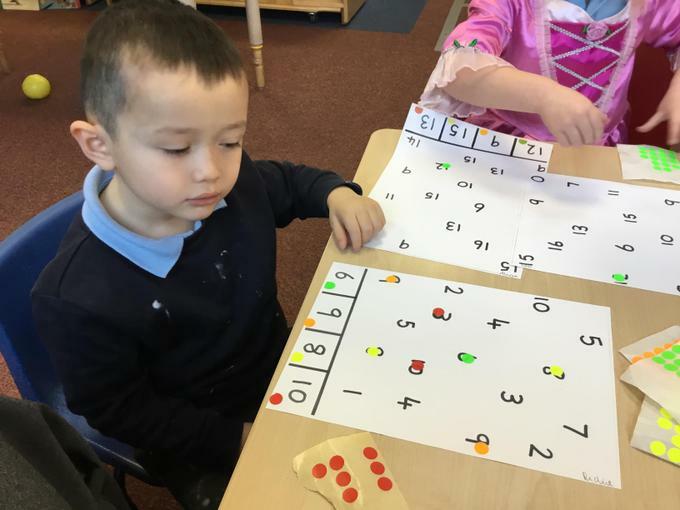 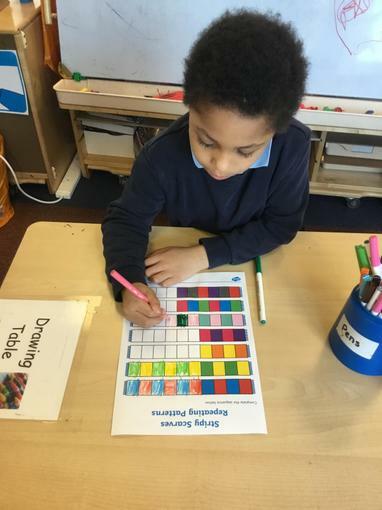 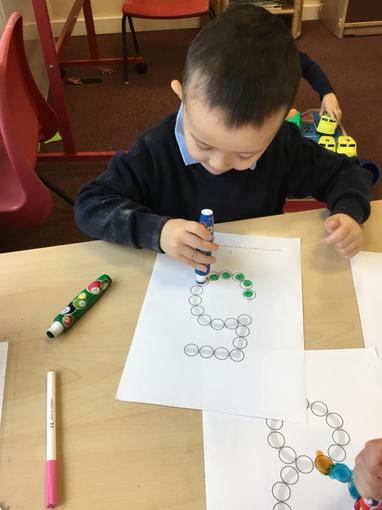 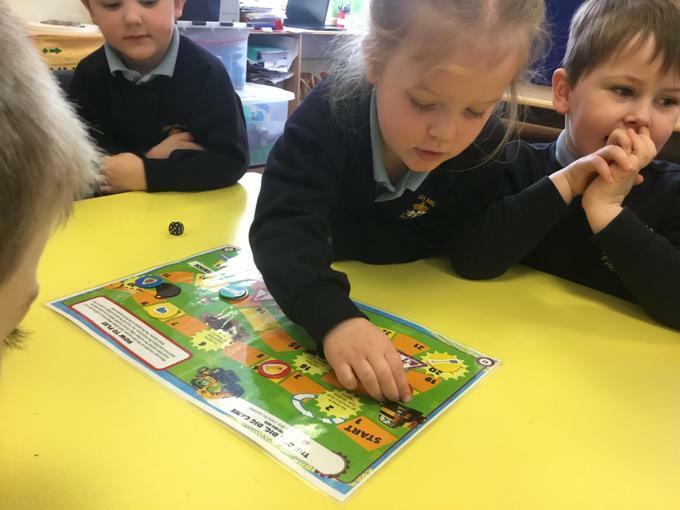 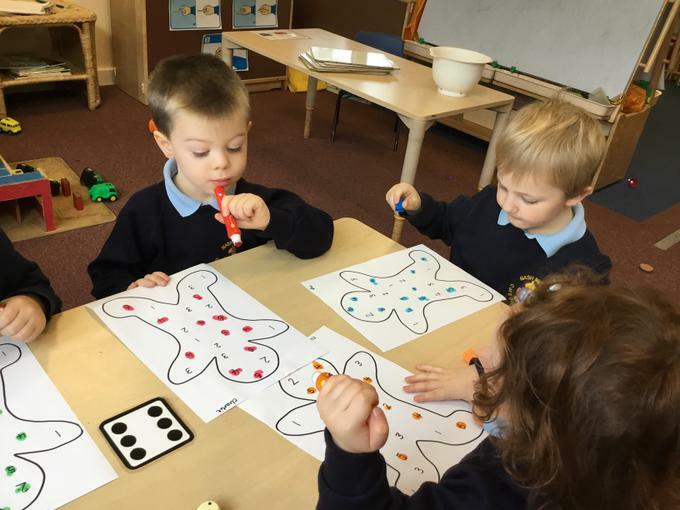 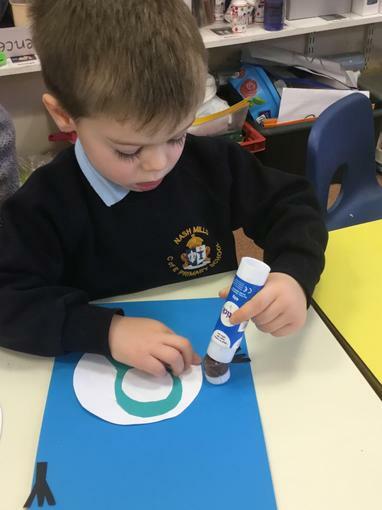 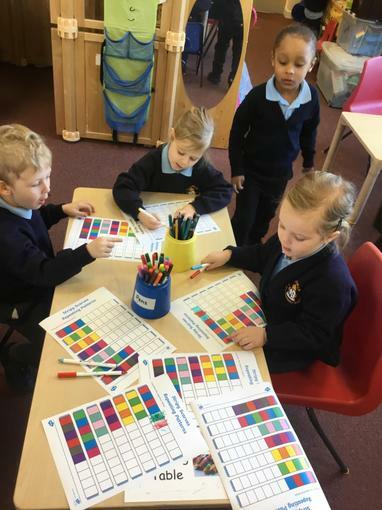 We have done a lot of counting and writing/painting/cutting out numbers, as well as playing games such as number lotto and gingerbread dice. 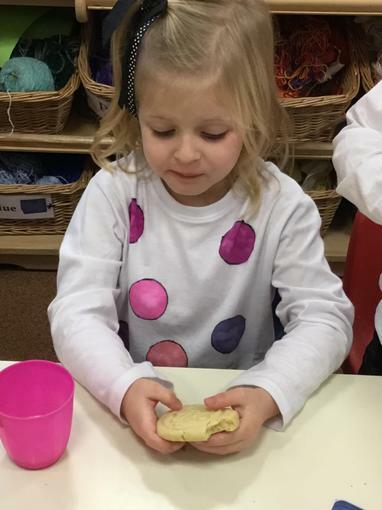 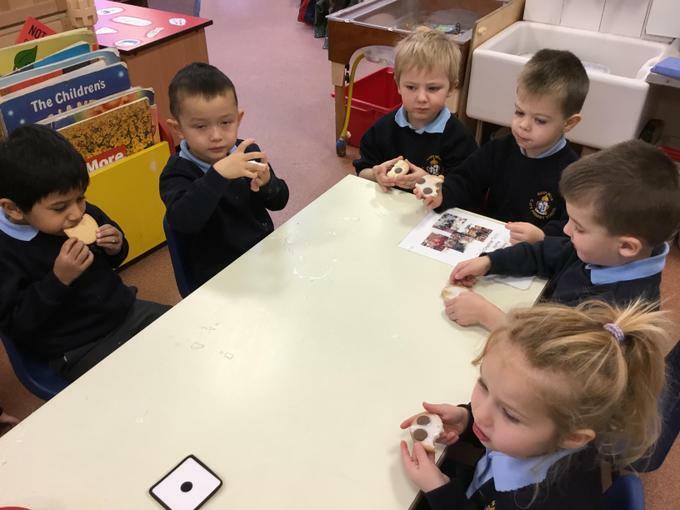 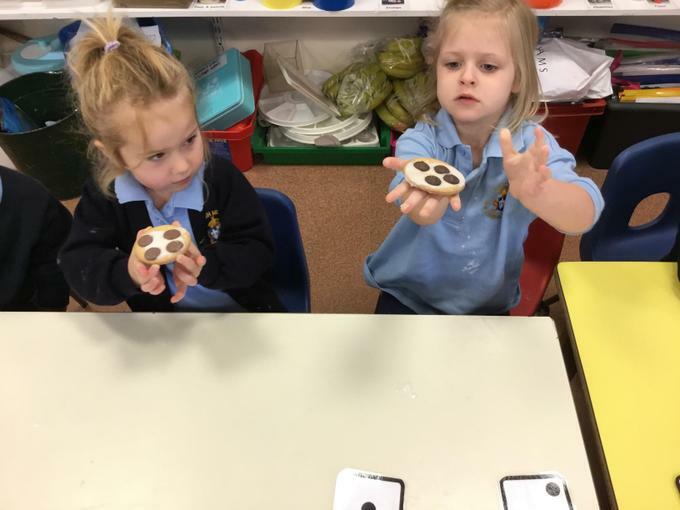 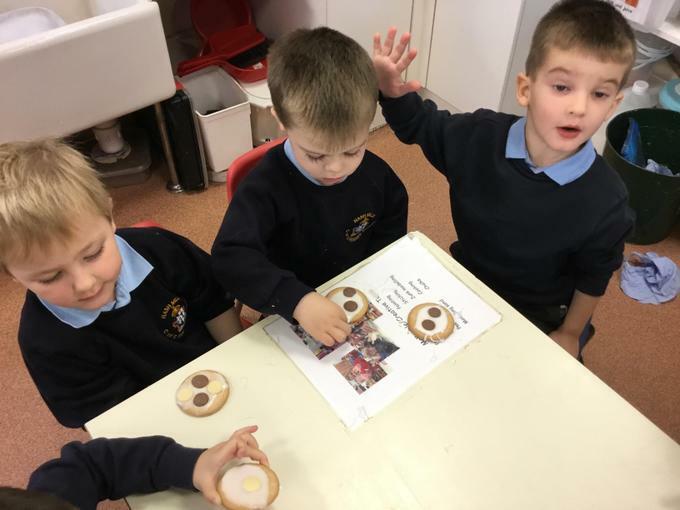 We have iced biscuits with chocolate buttons, counting the buttons onto the biscuits in dice patterns. 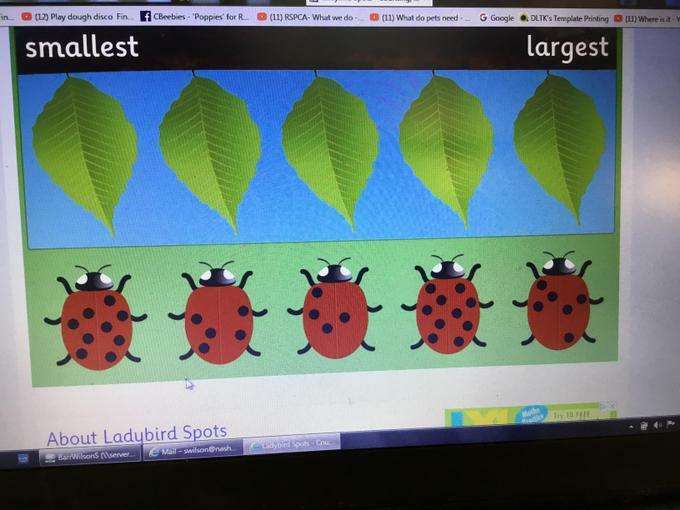 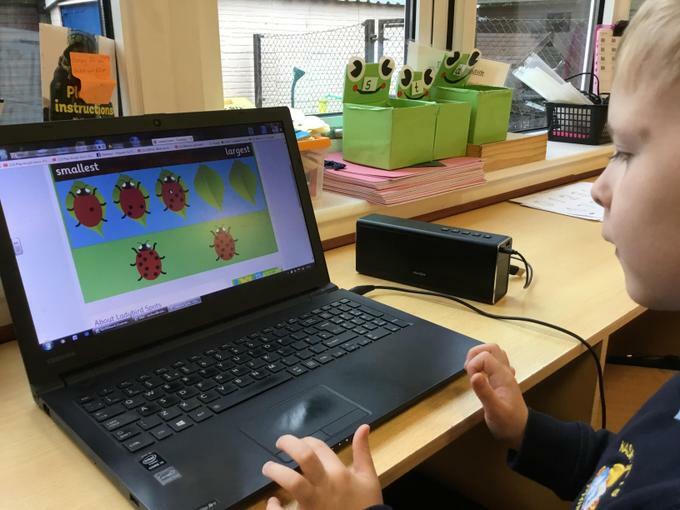 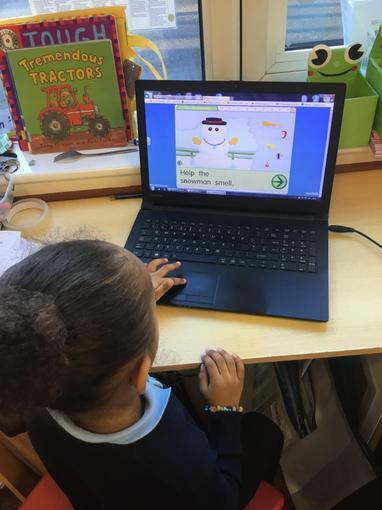 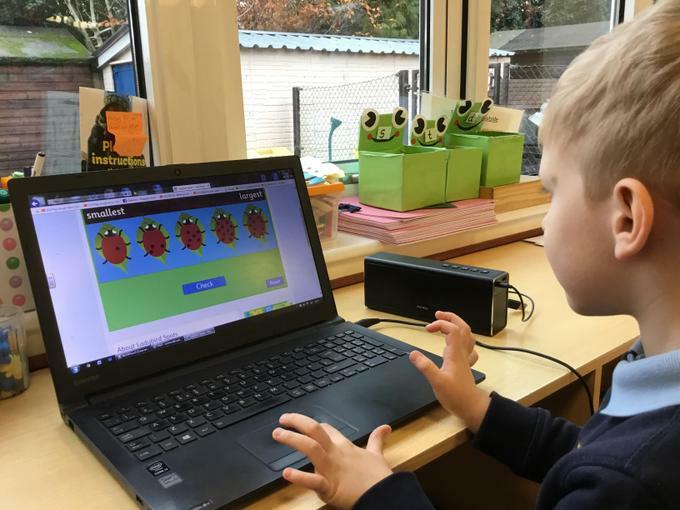 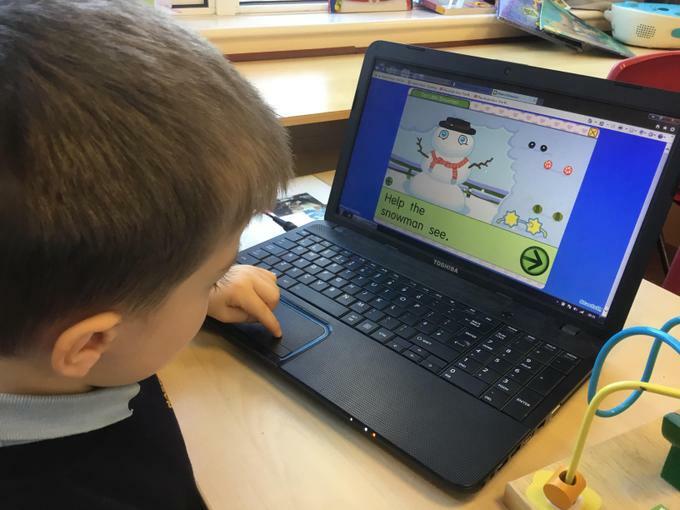 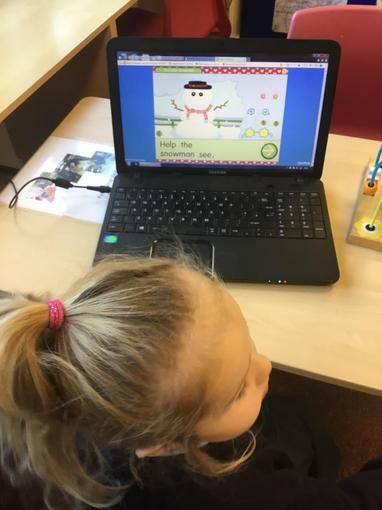 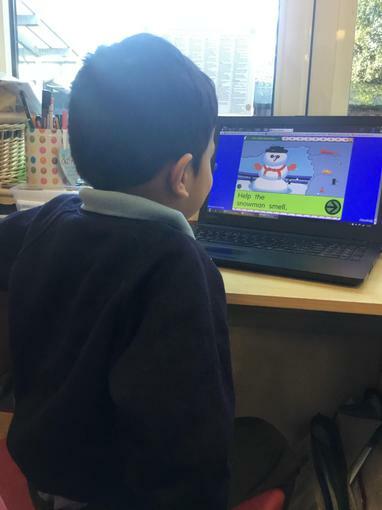 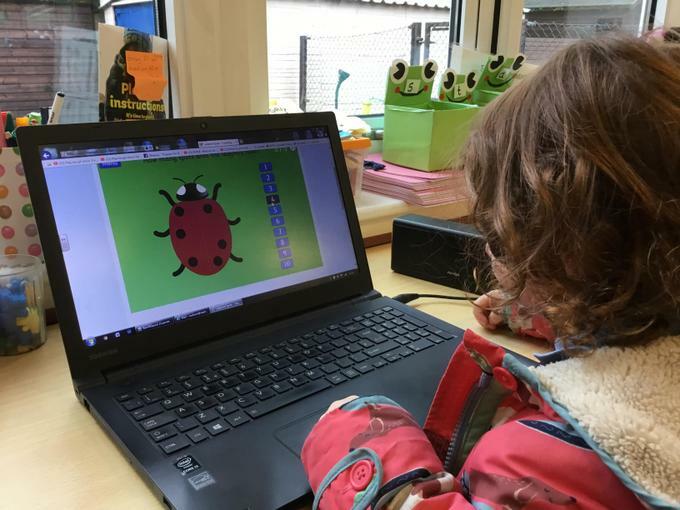 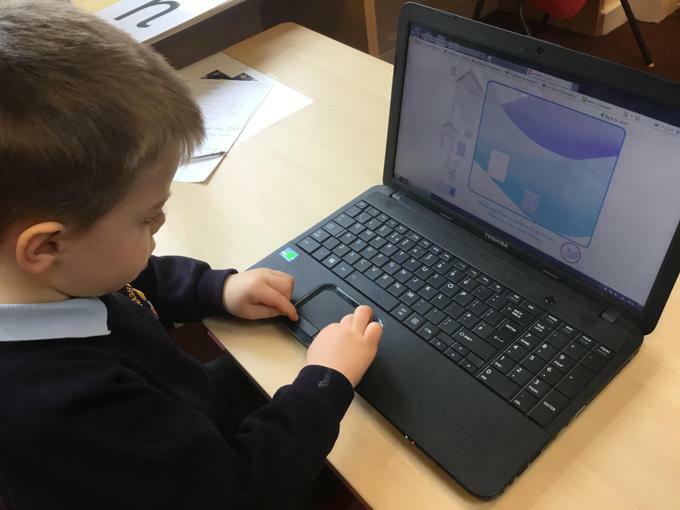 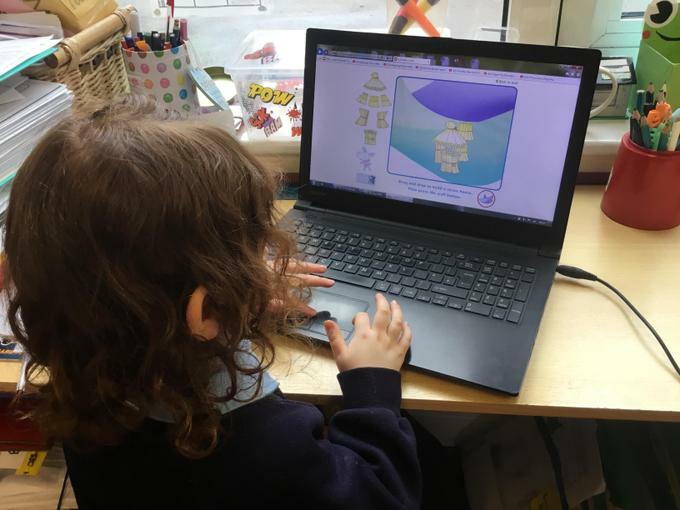 We have also talked about repeating patterns and played a ladybird spot game on the computer. 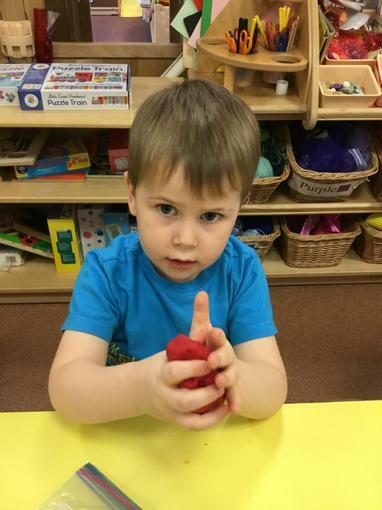 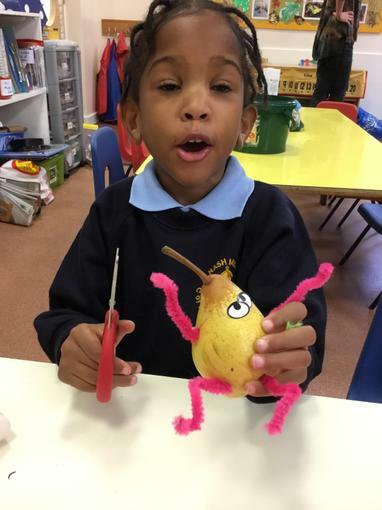 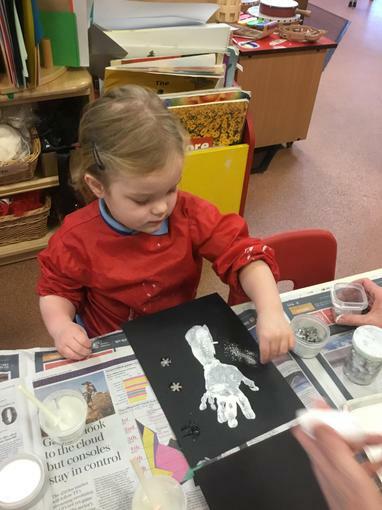 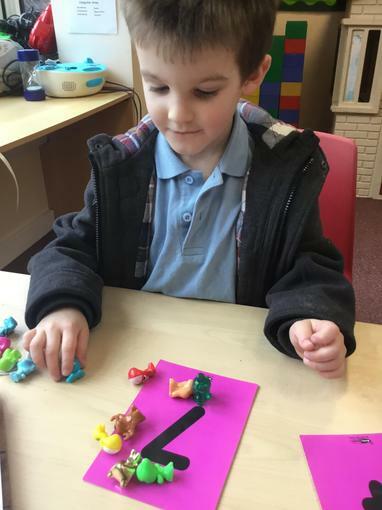 We have introduced 'Dough Disco' to help children strengthen their hands and fingers to help with fine motor control. 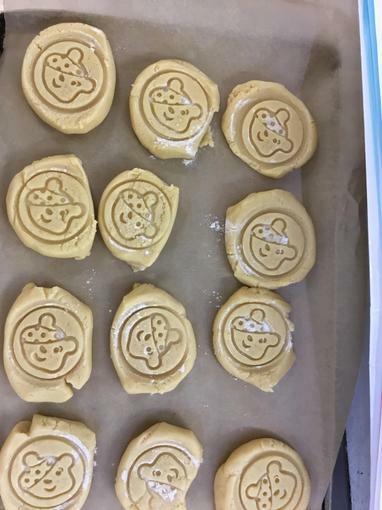 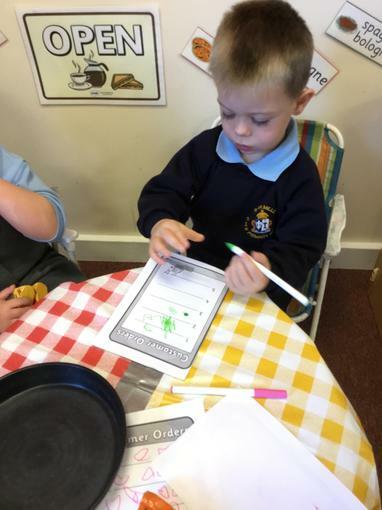 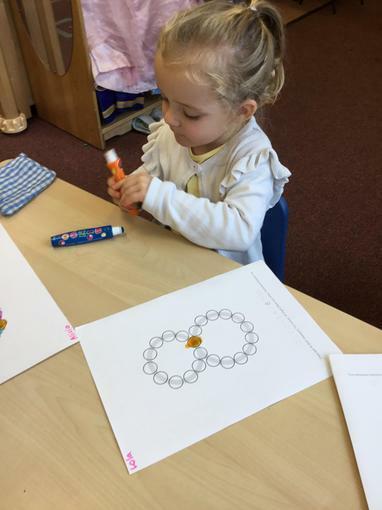 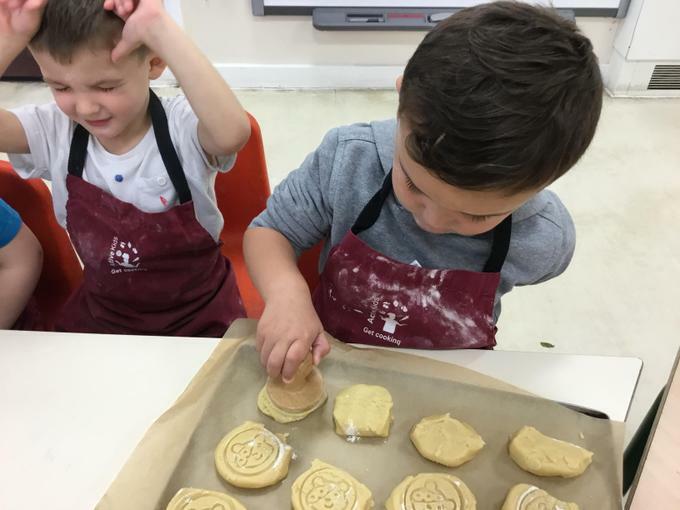 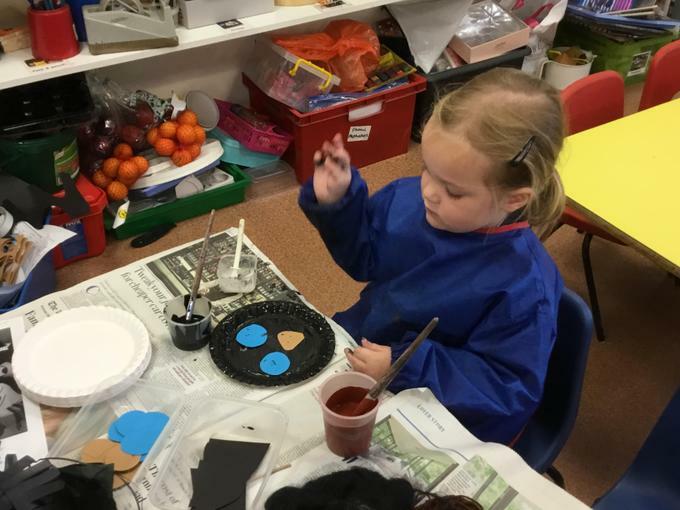 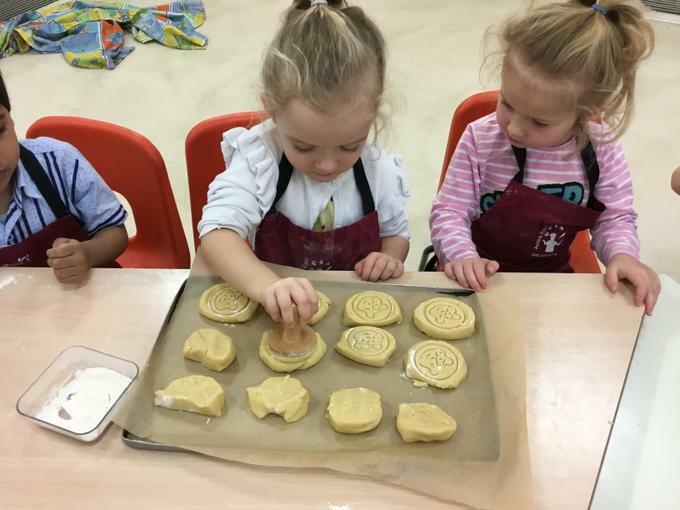 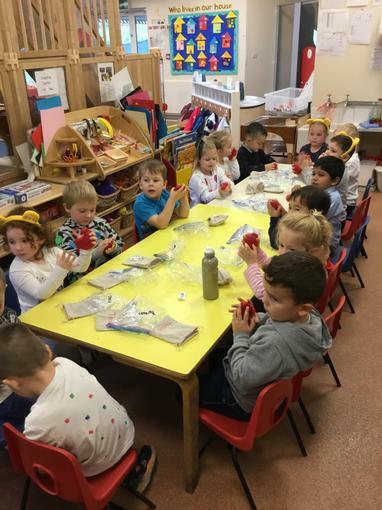 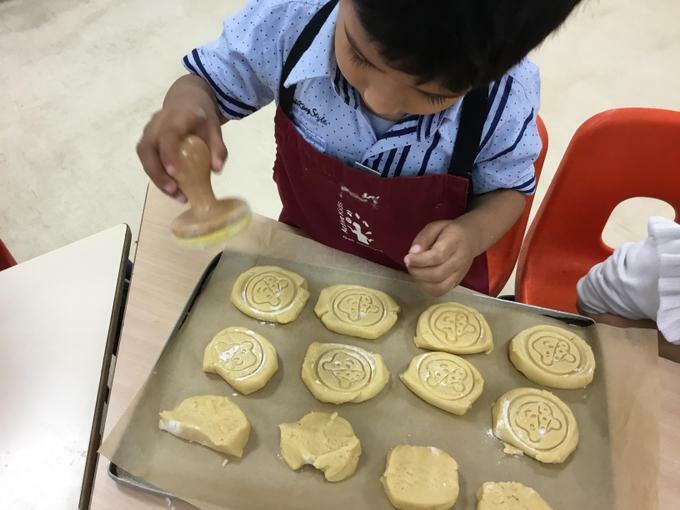 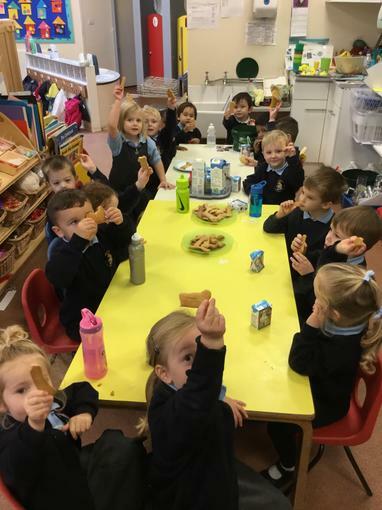 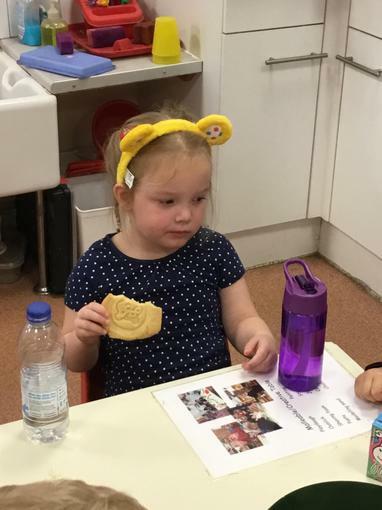 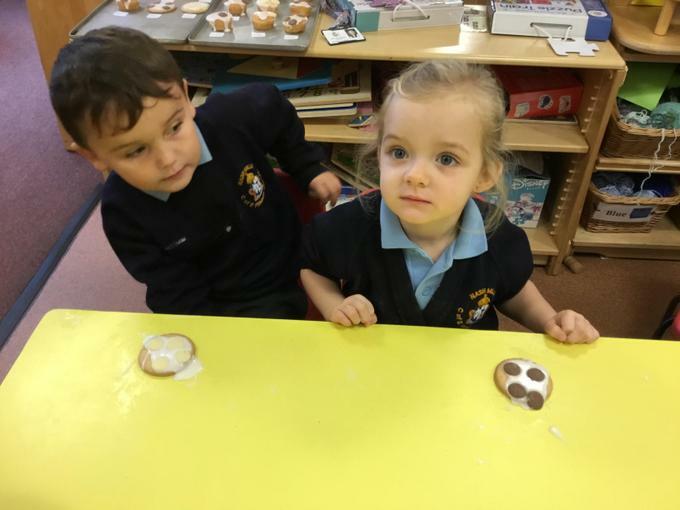 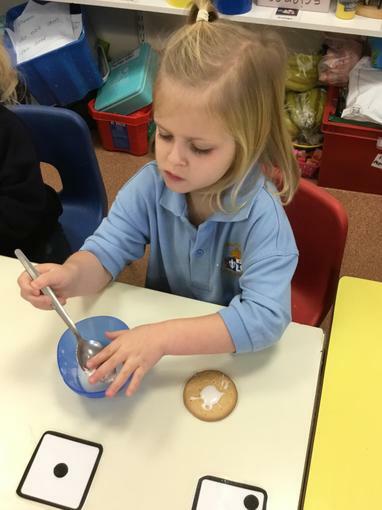 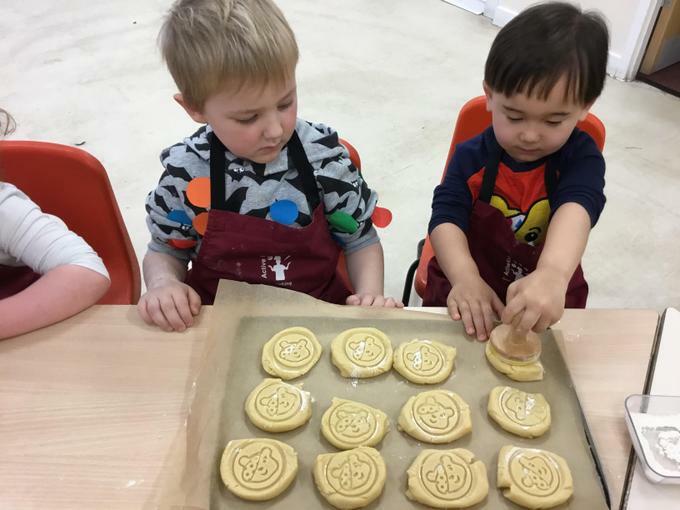 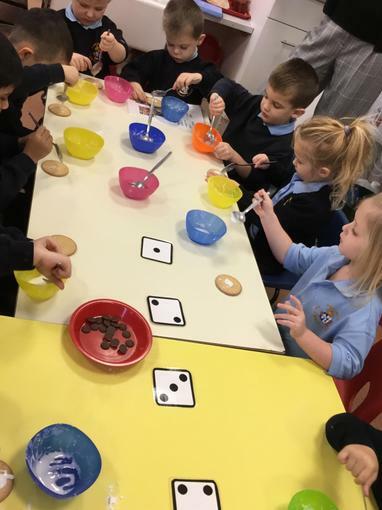 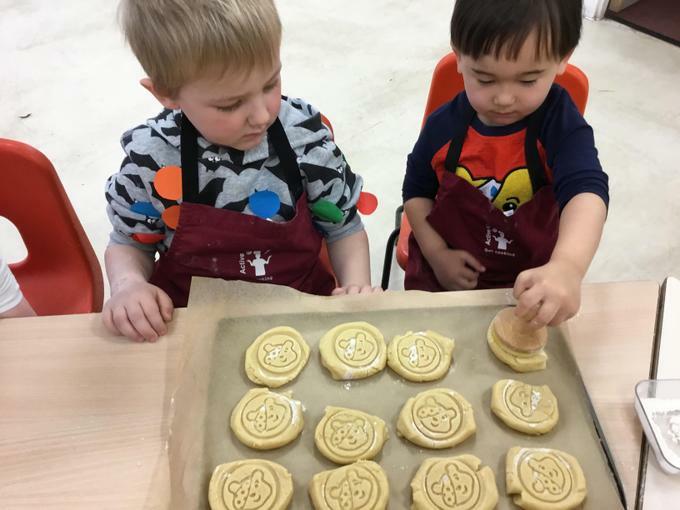 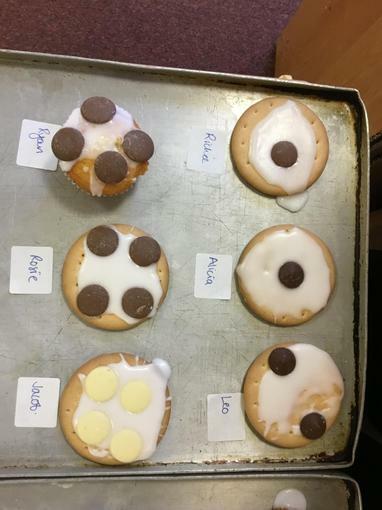 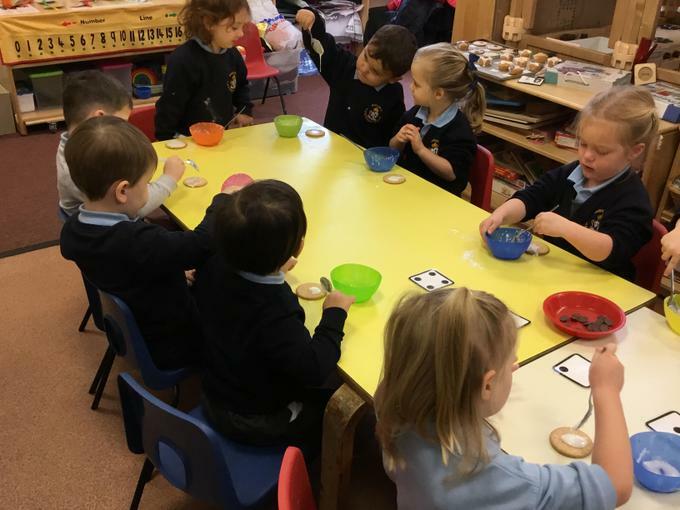 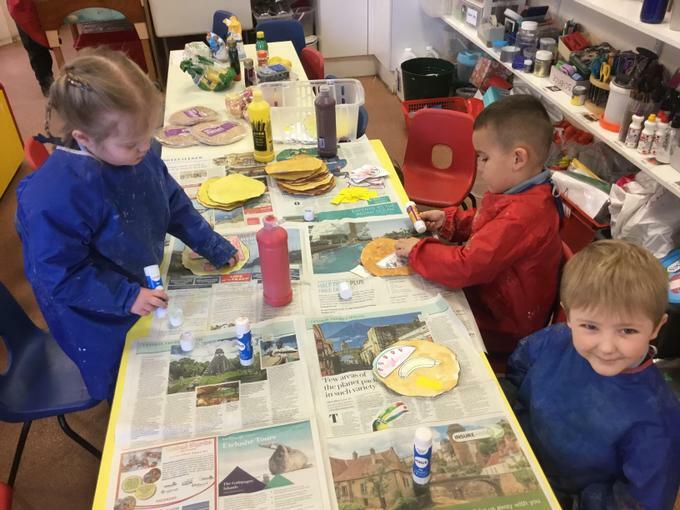 On Children in Need Day, we made biscuits and painted spotty numerals. 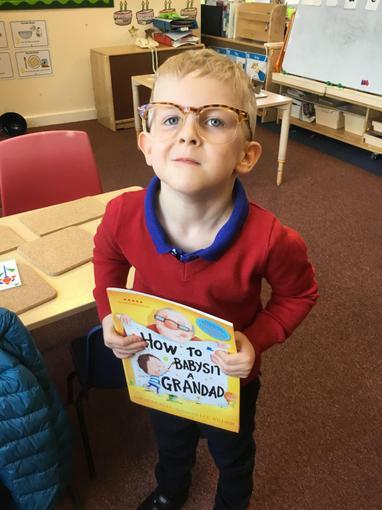 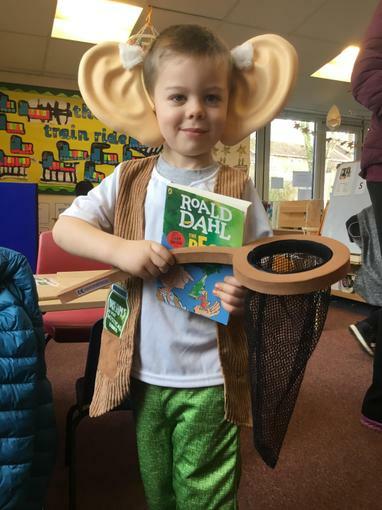 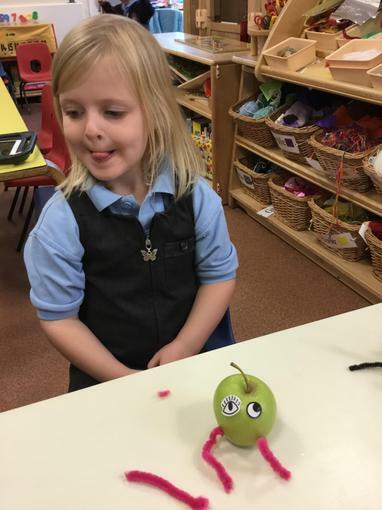 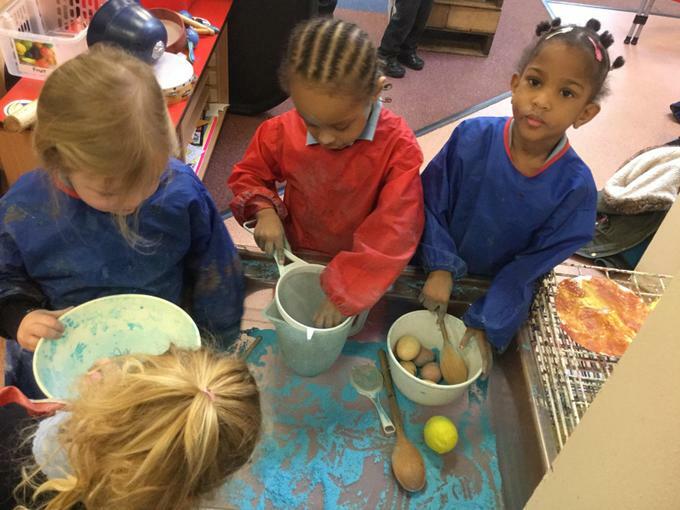 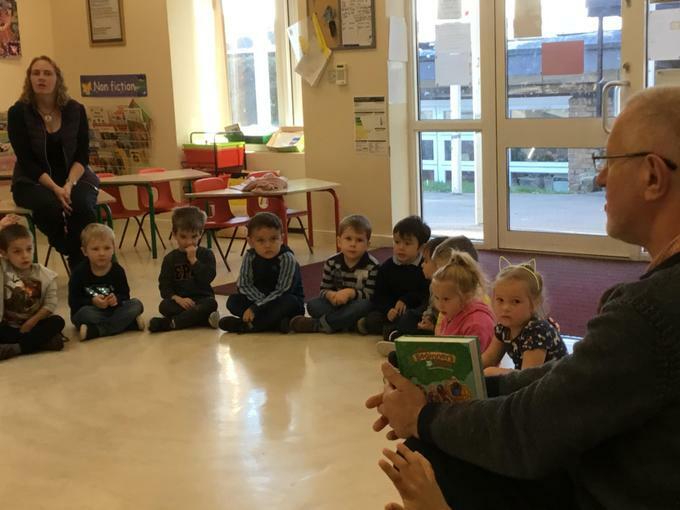 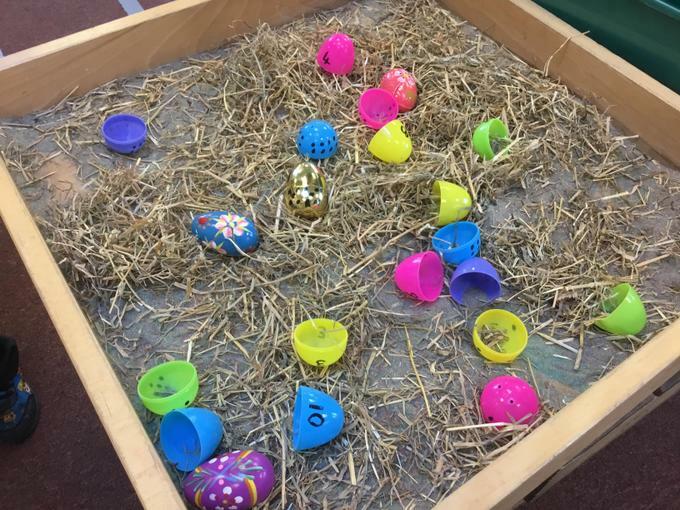 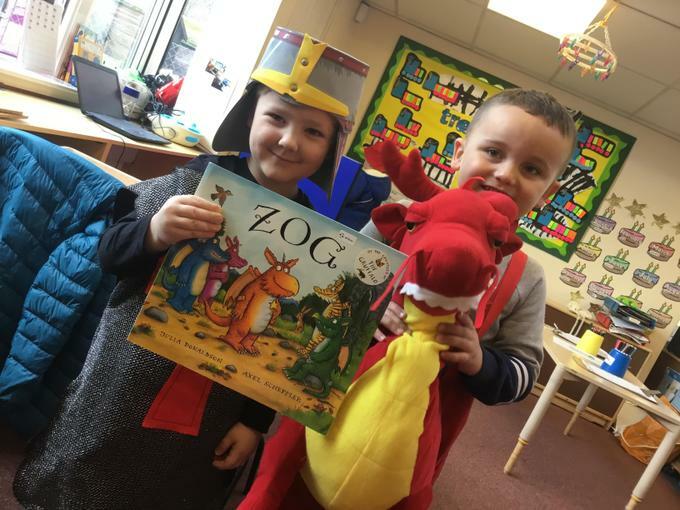 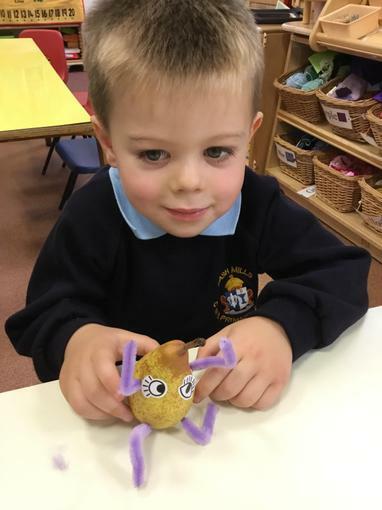 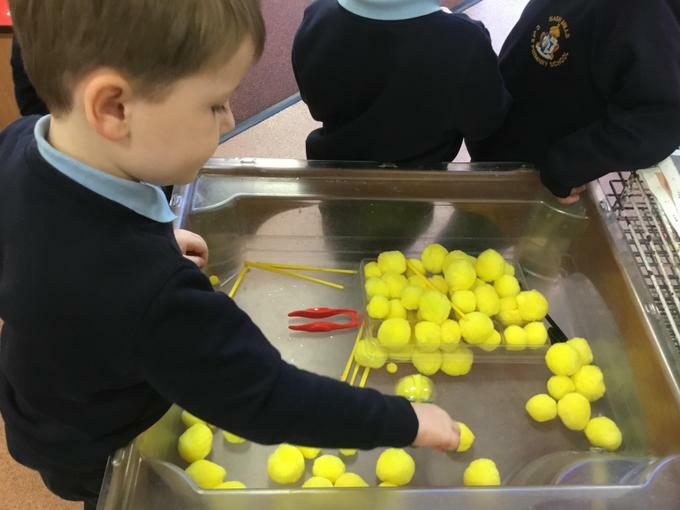 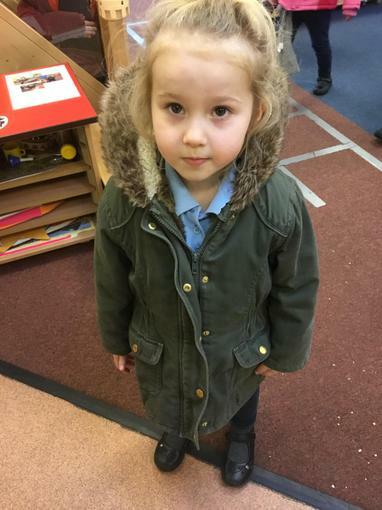 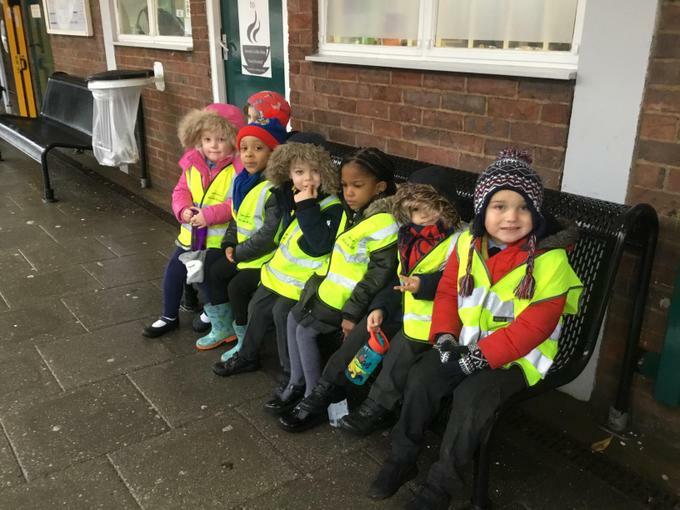 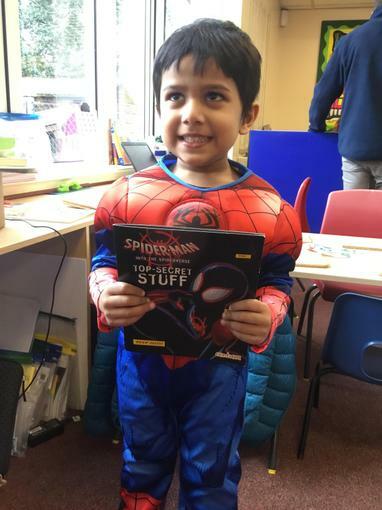 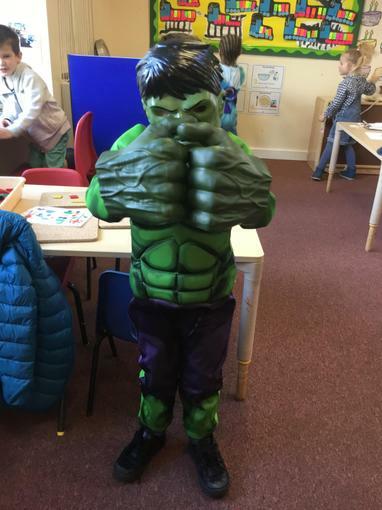 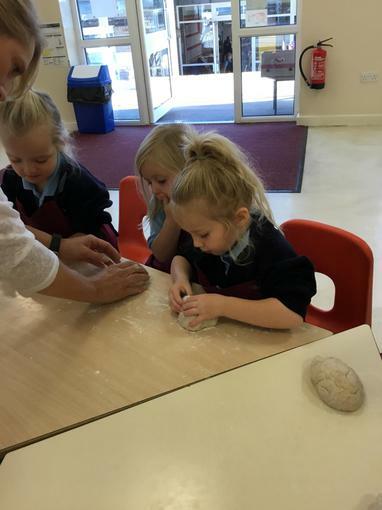 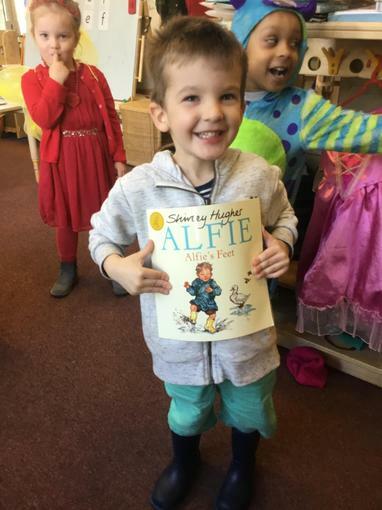 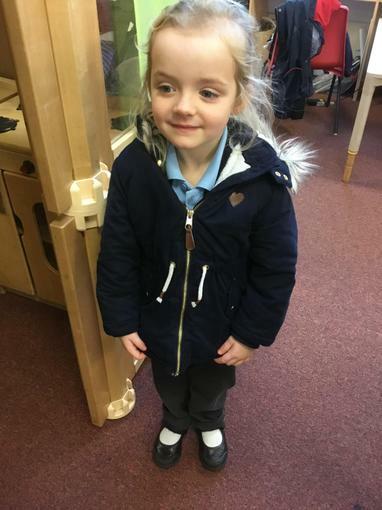 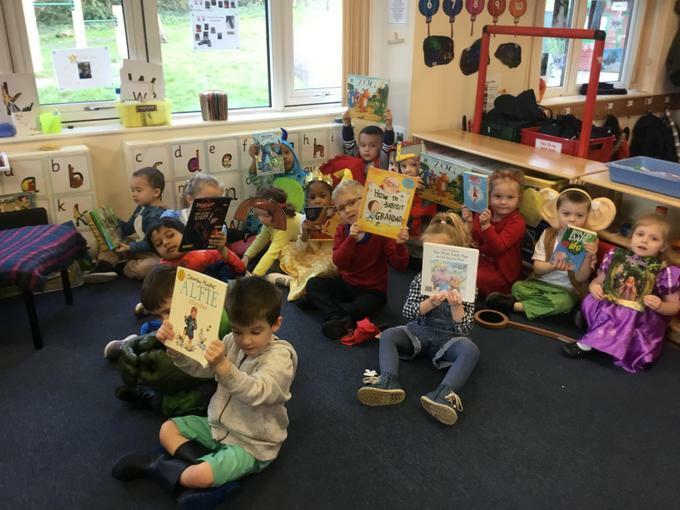 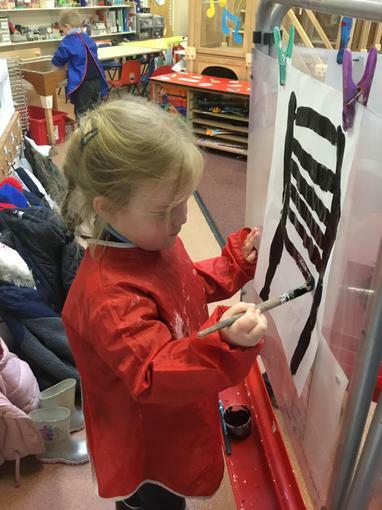 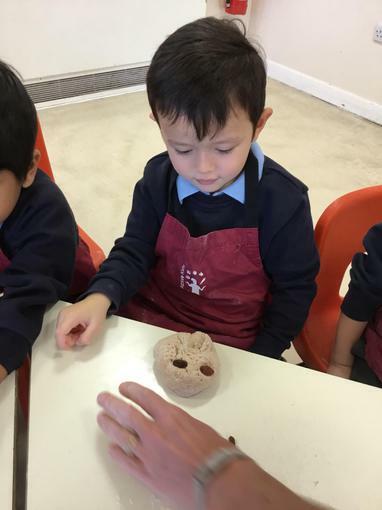 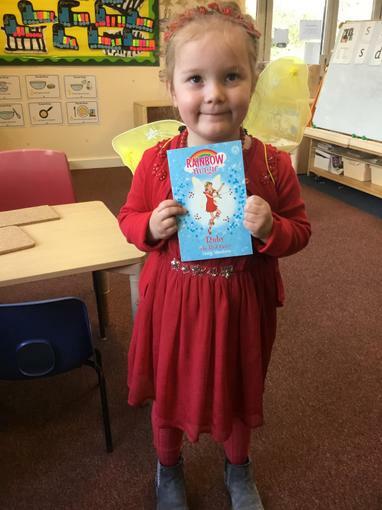 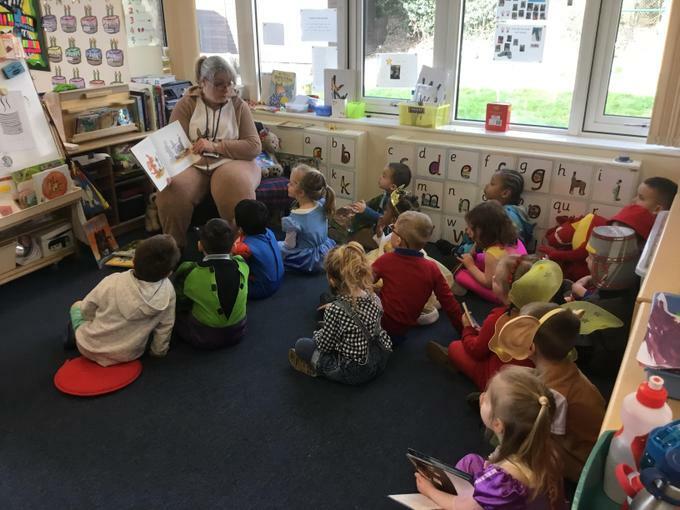 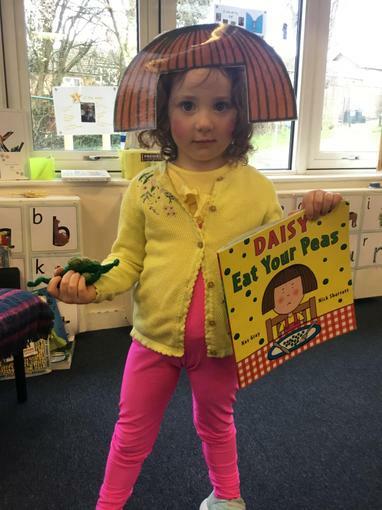 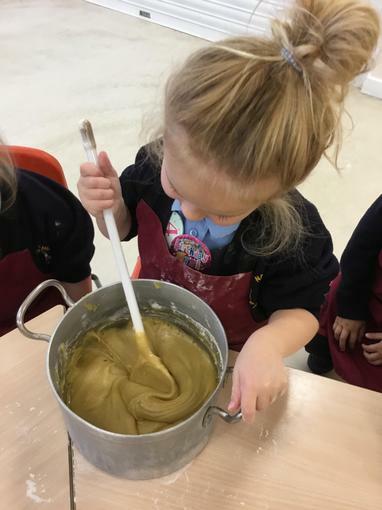 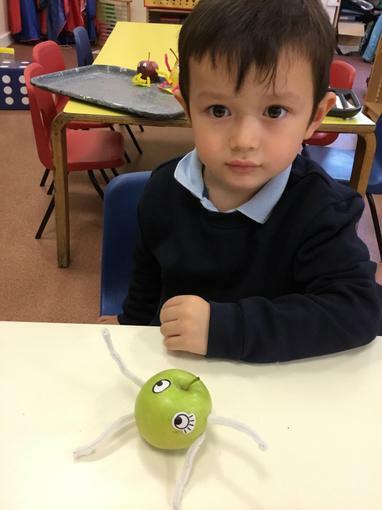 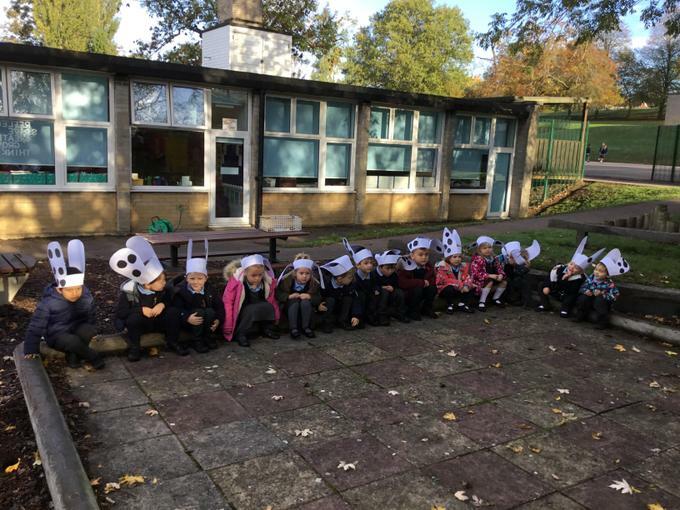 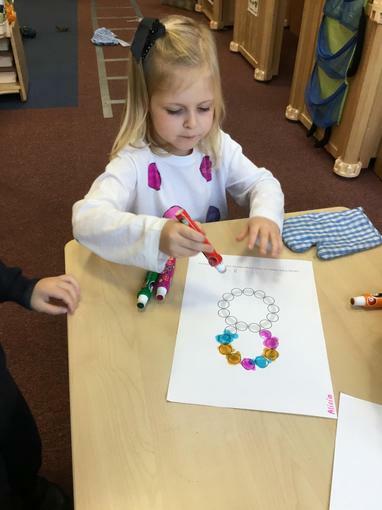 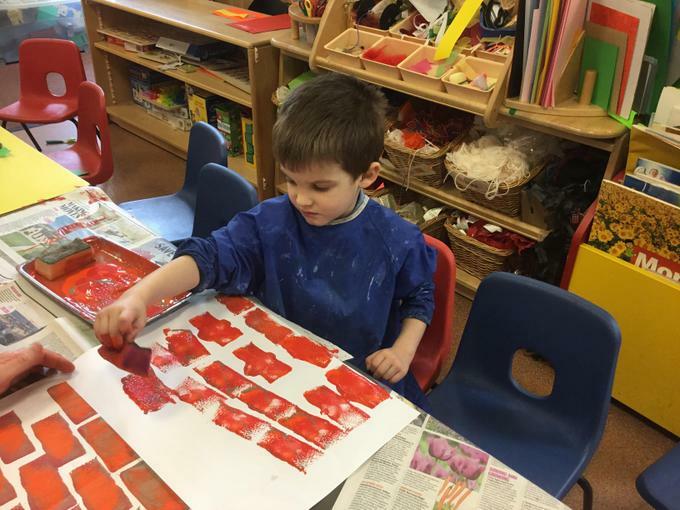 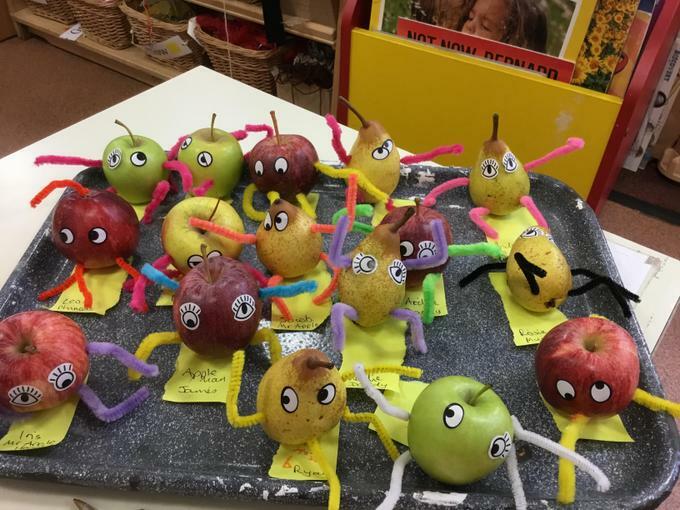 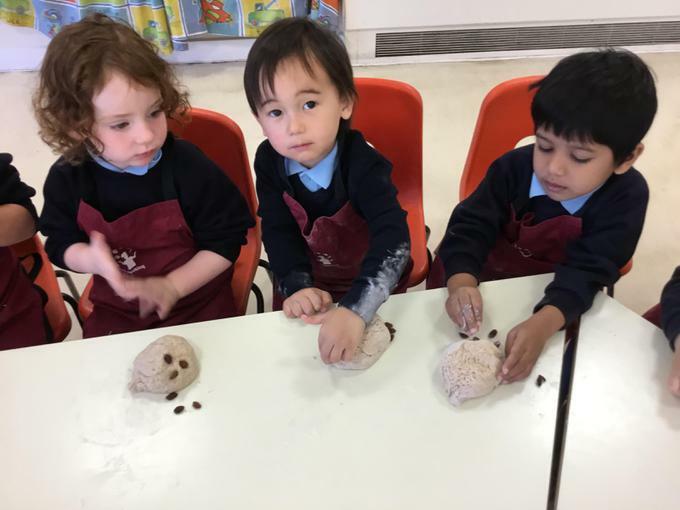 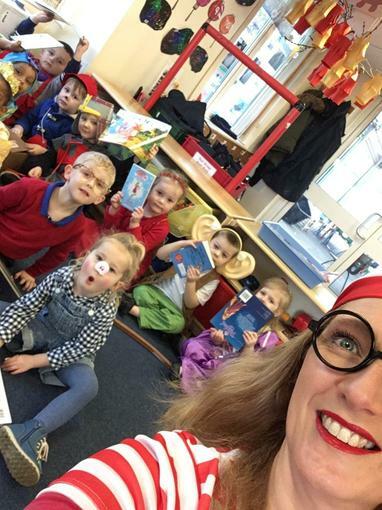 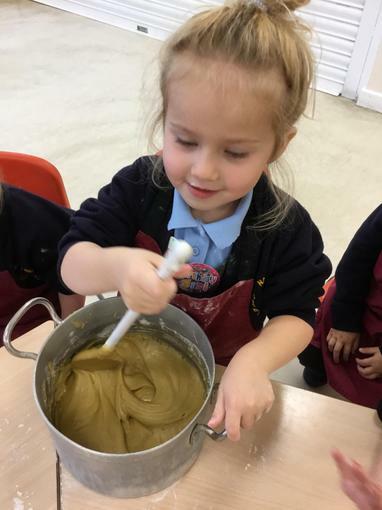 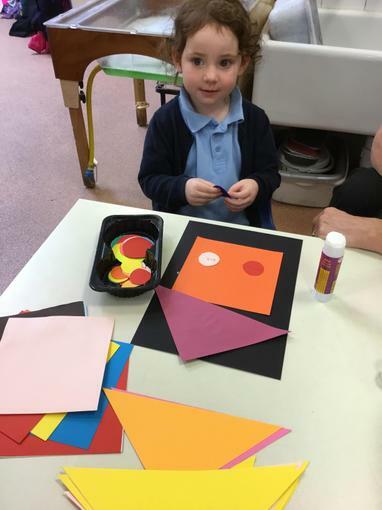 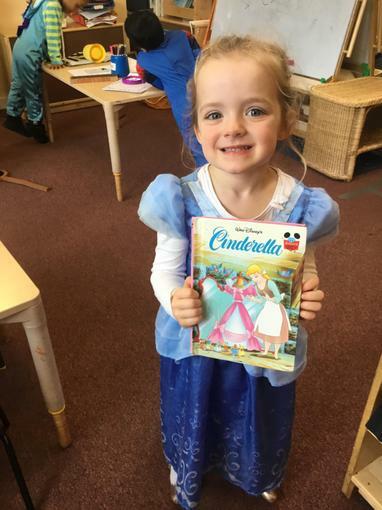 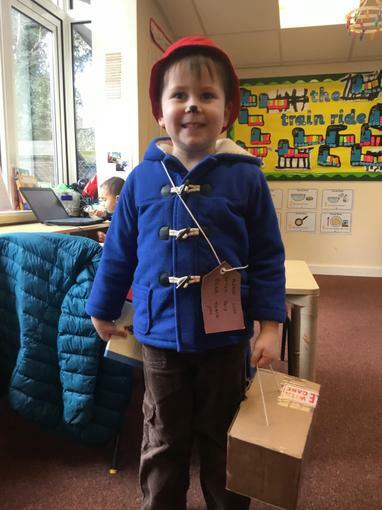 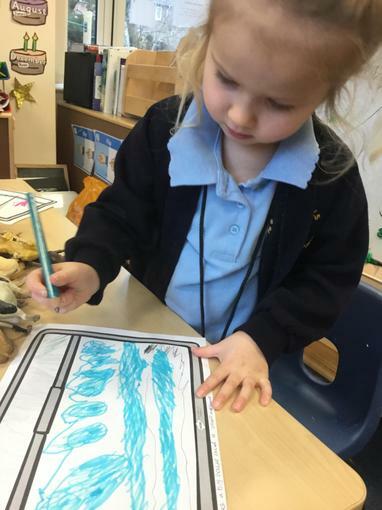 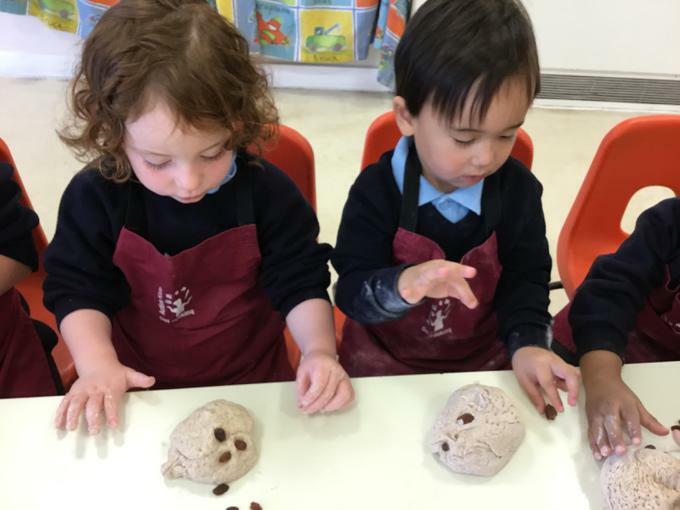 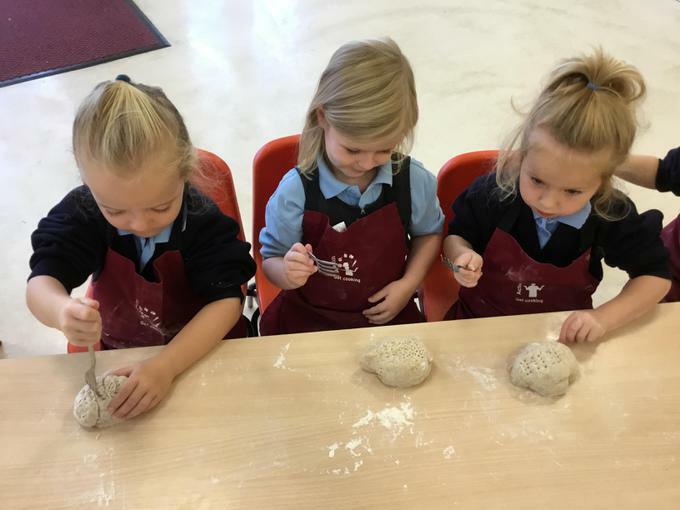 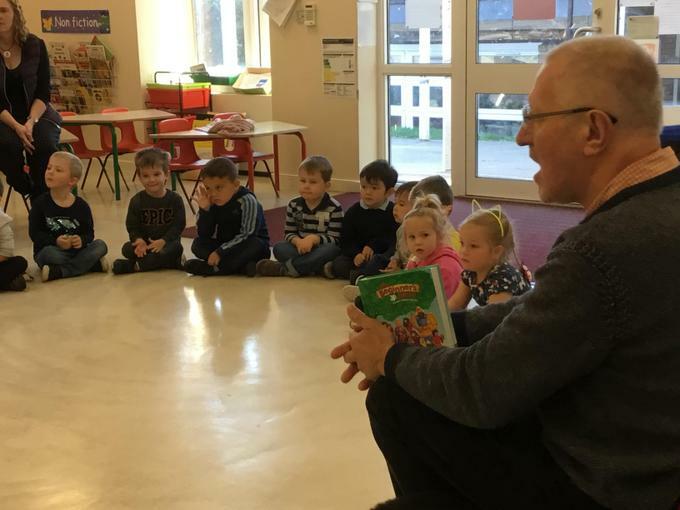 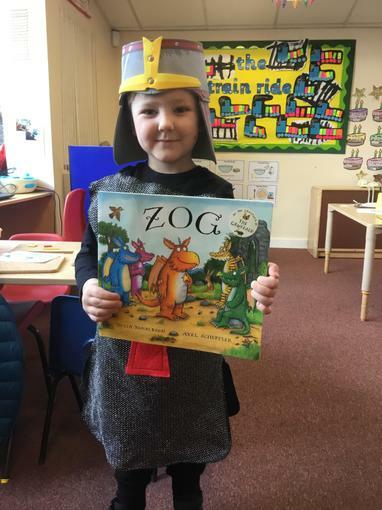 Nursery had a busy first half term. 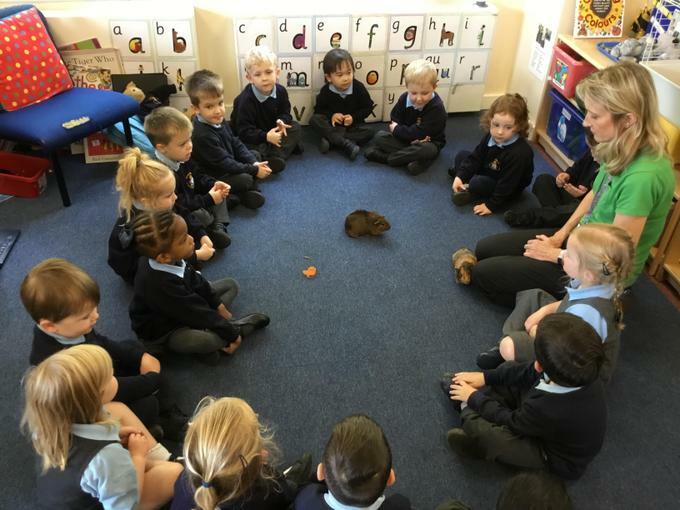 Our topics covered Autumn/Harvest and Pets. 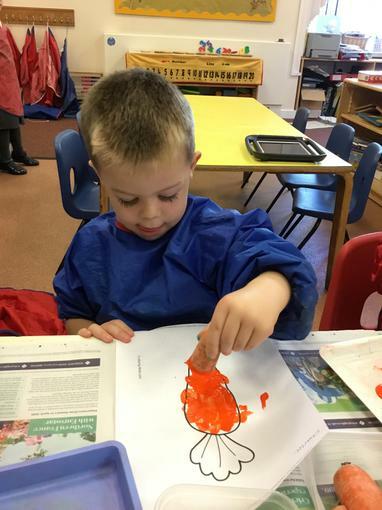 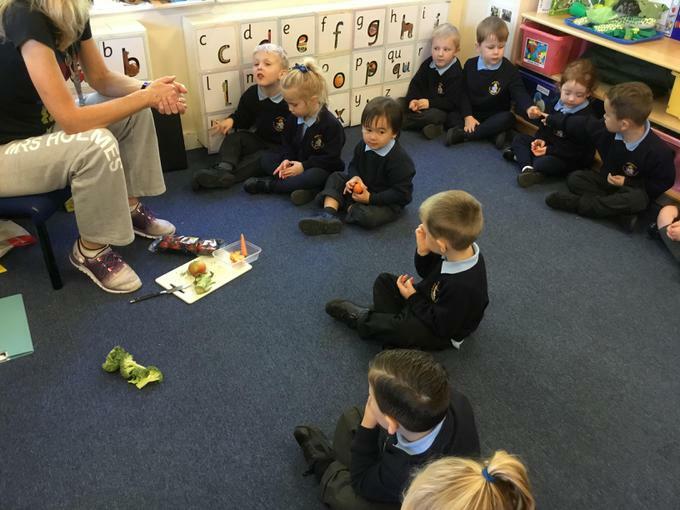 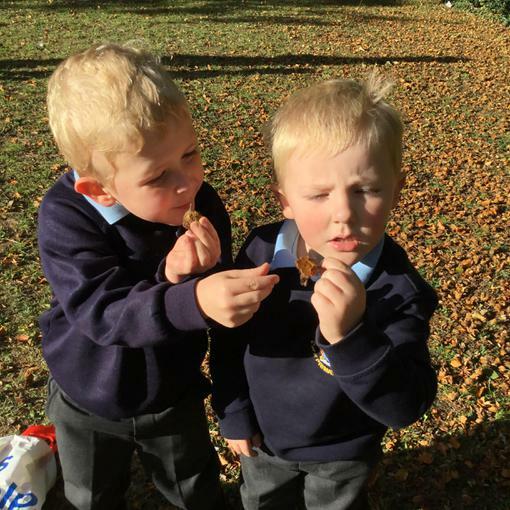 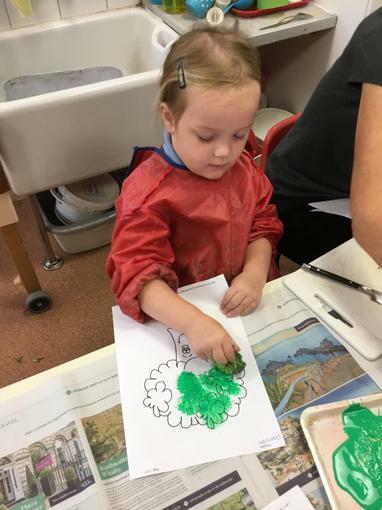 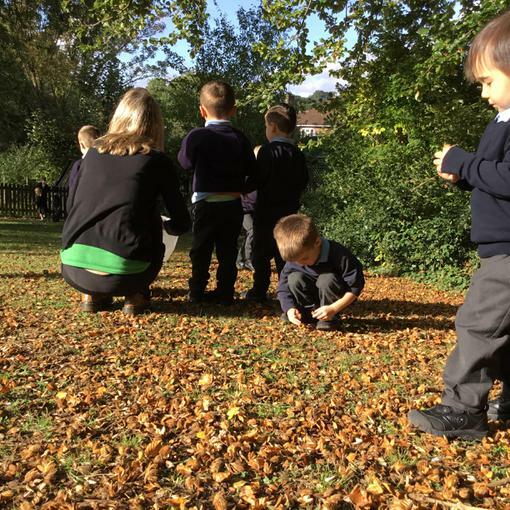 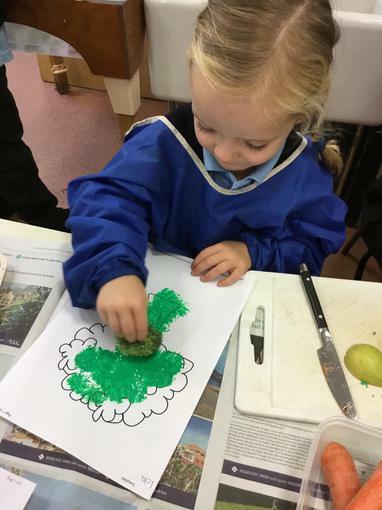 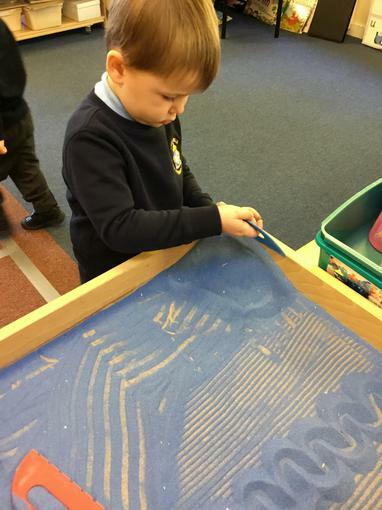 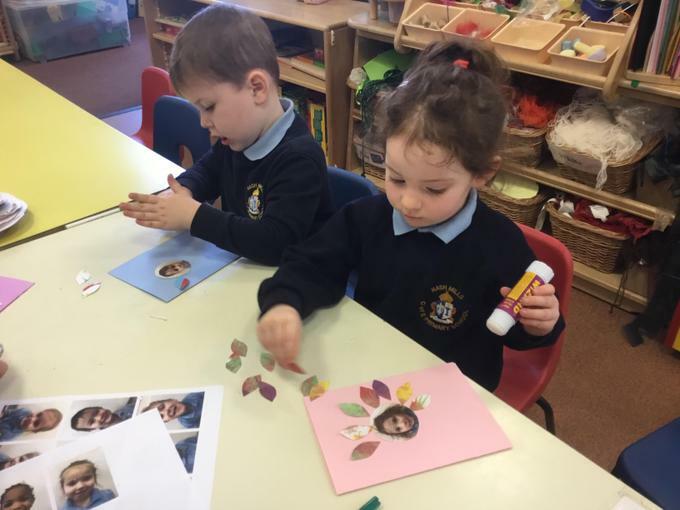 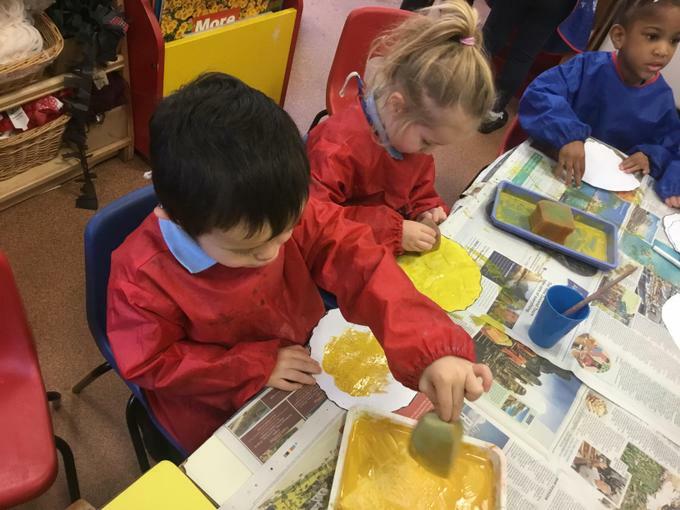 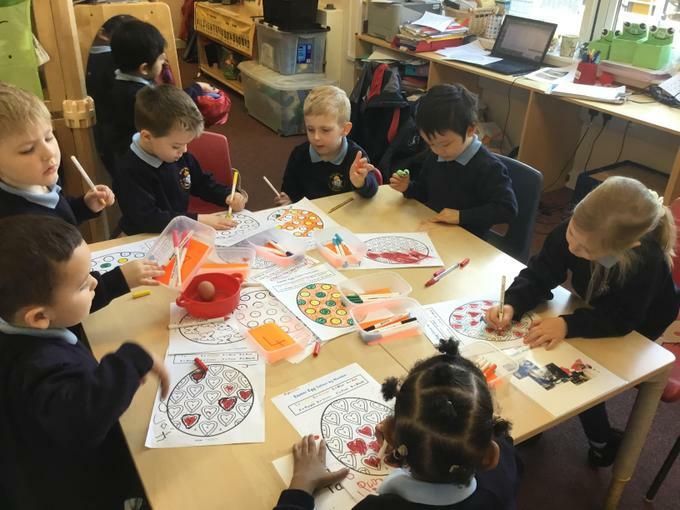 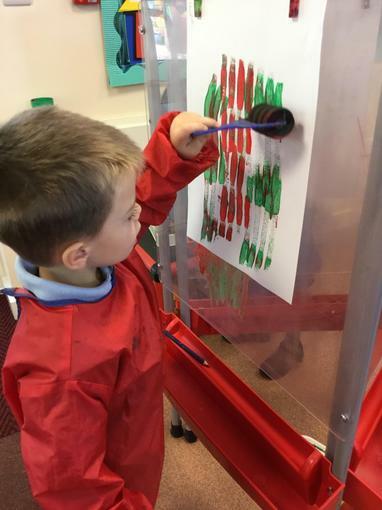 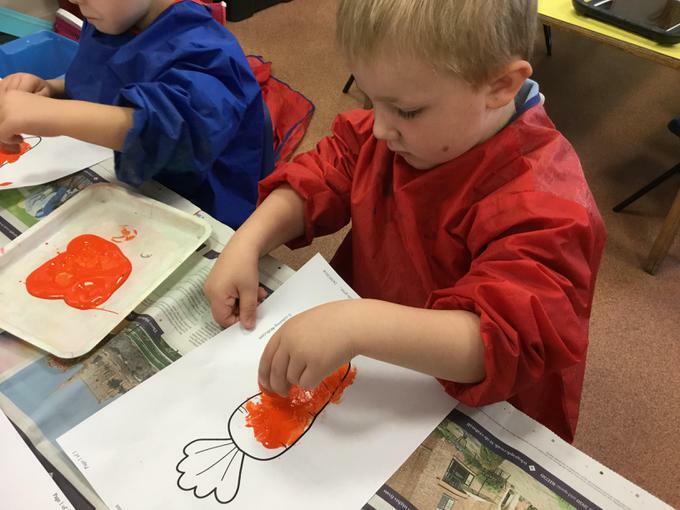 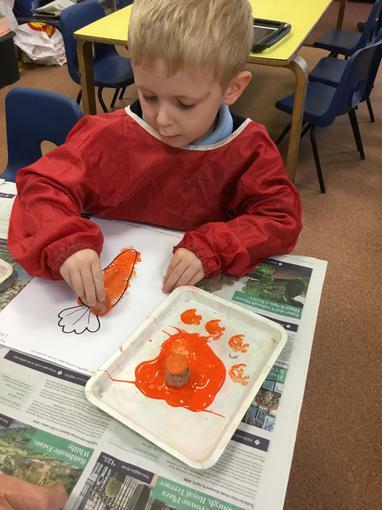 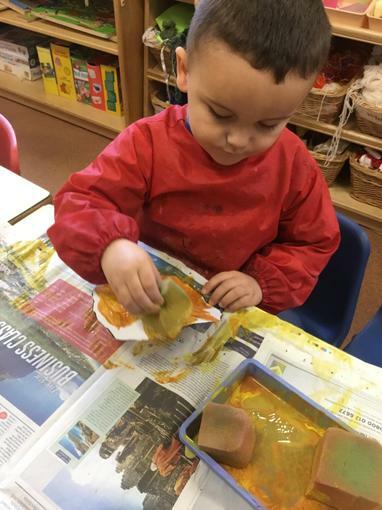 For our Autumn topic, we went for an Autumn walk, glittered leaves and did some fruit and vegetable printing. 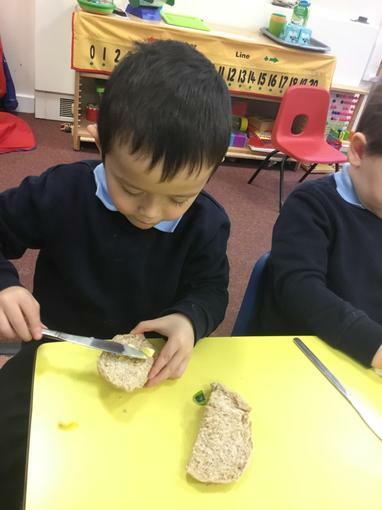 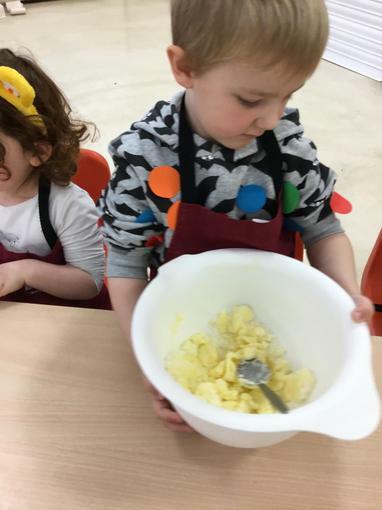 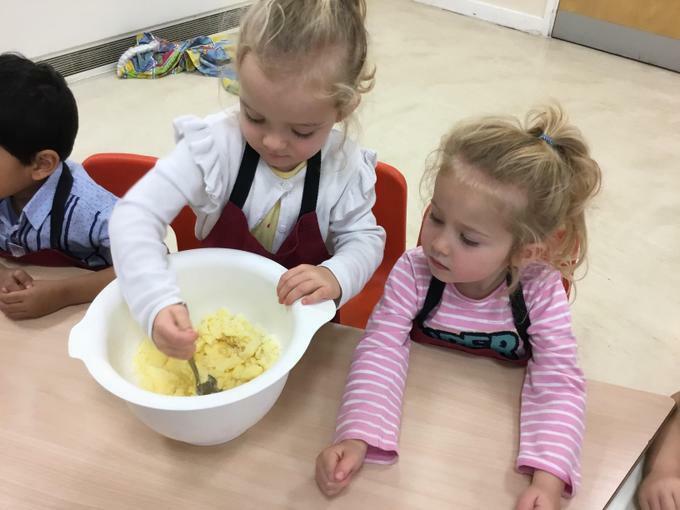 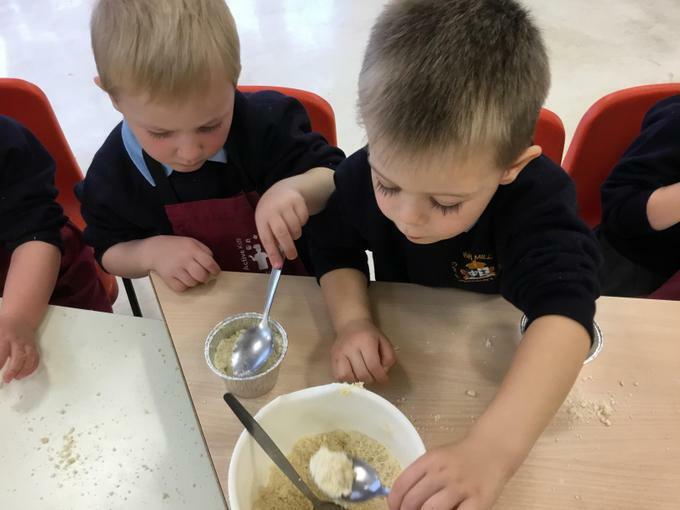 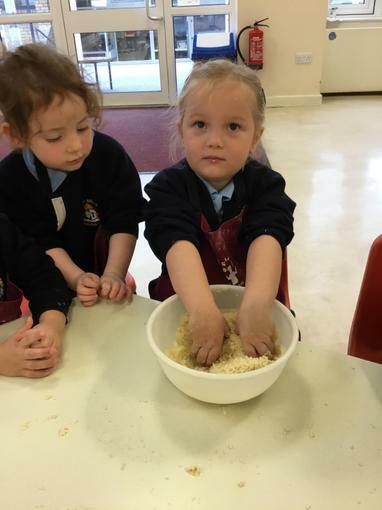 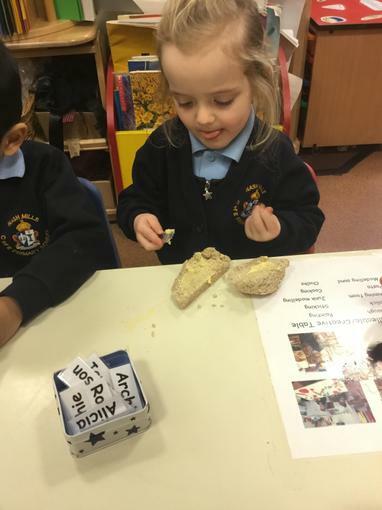 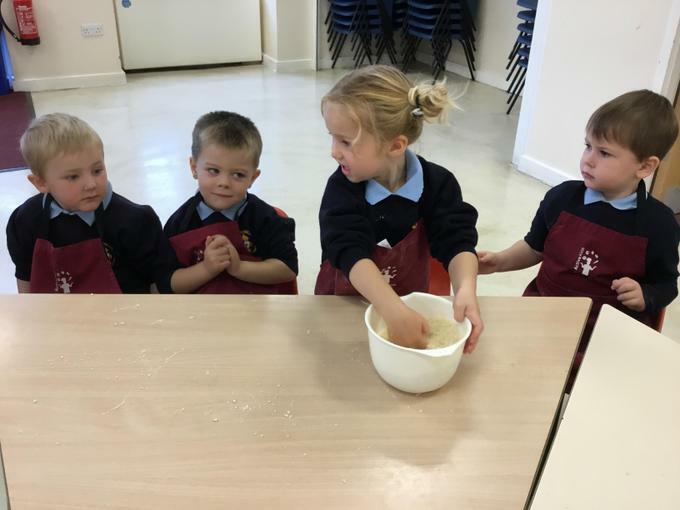 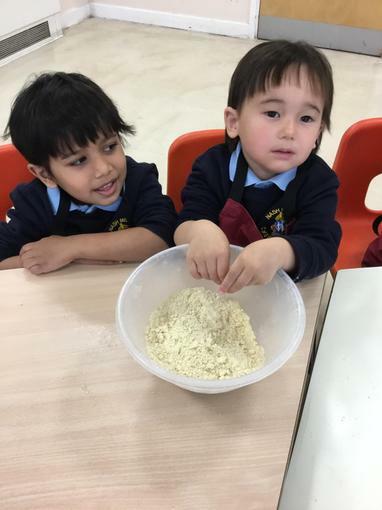 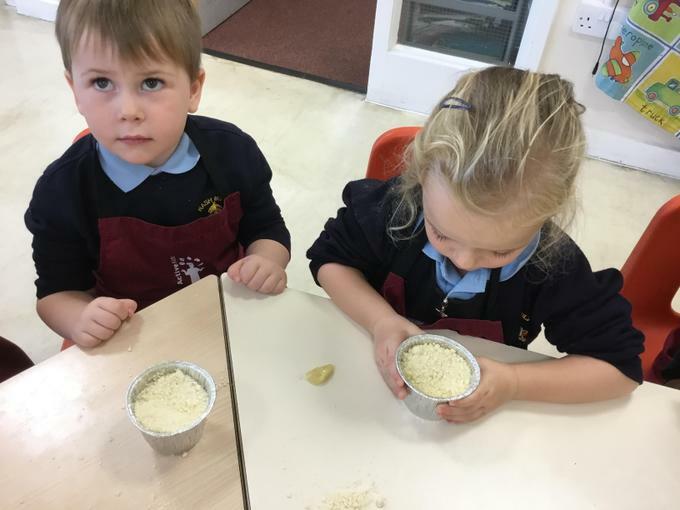 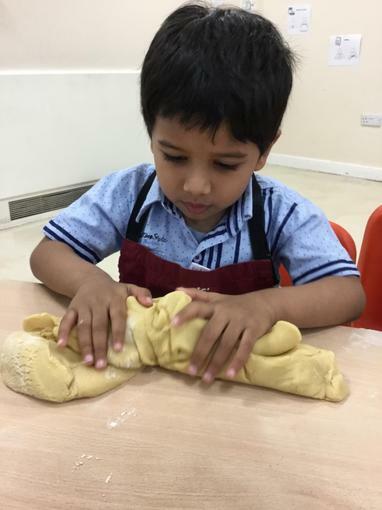 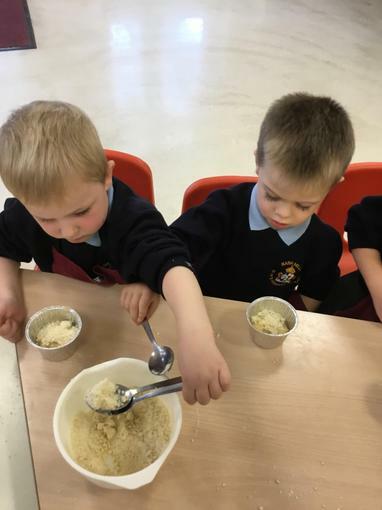 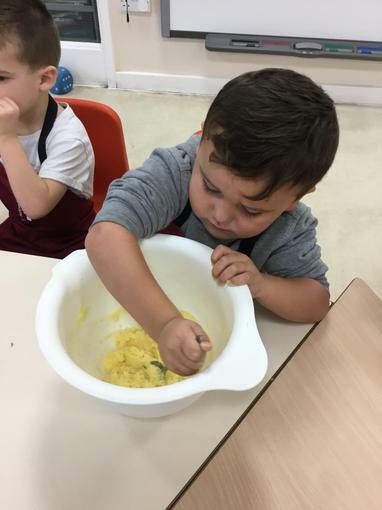 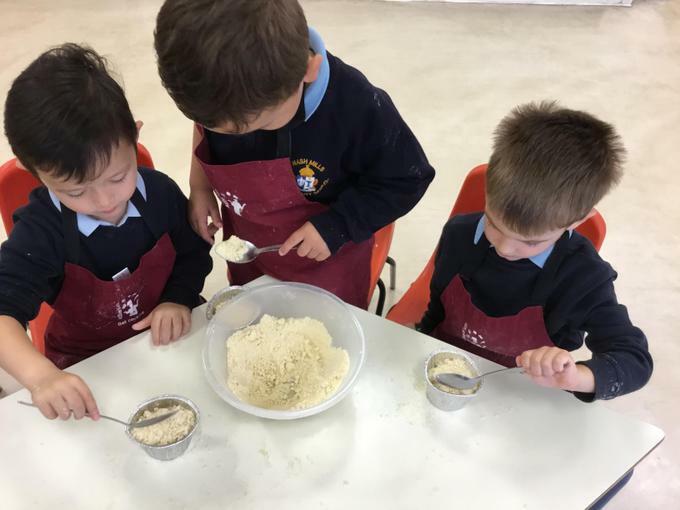 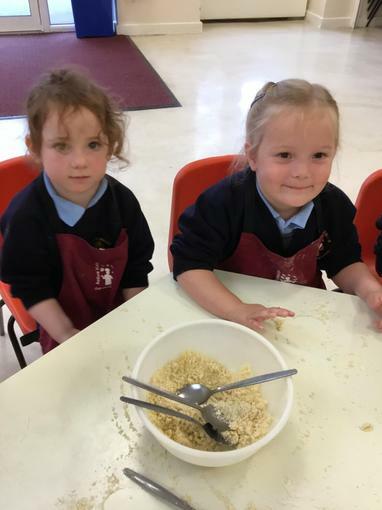 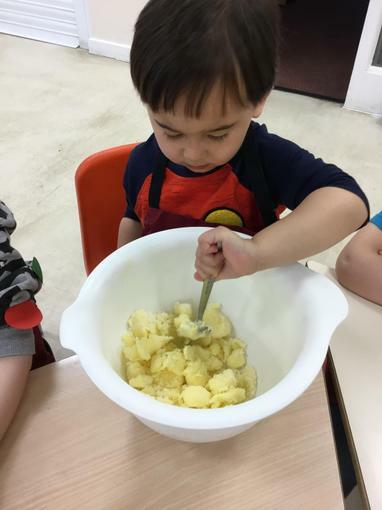 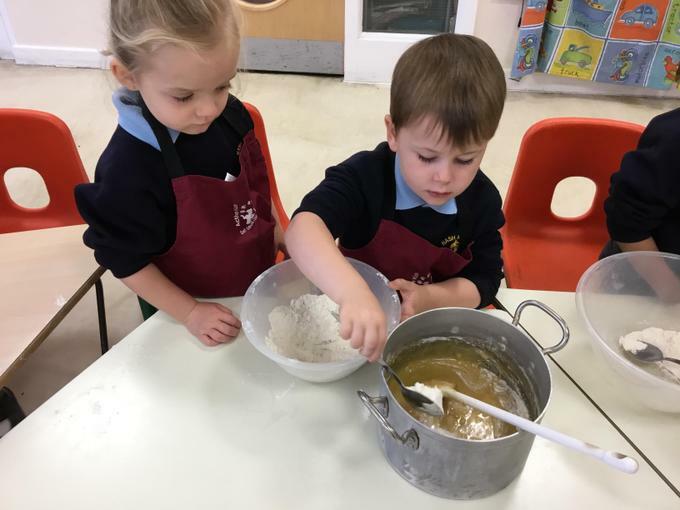 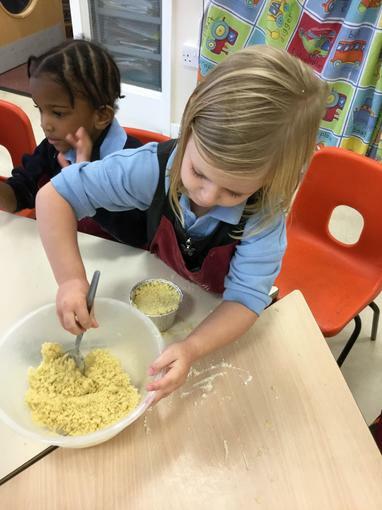 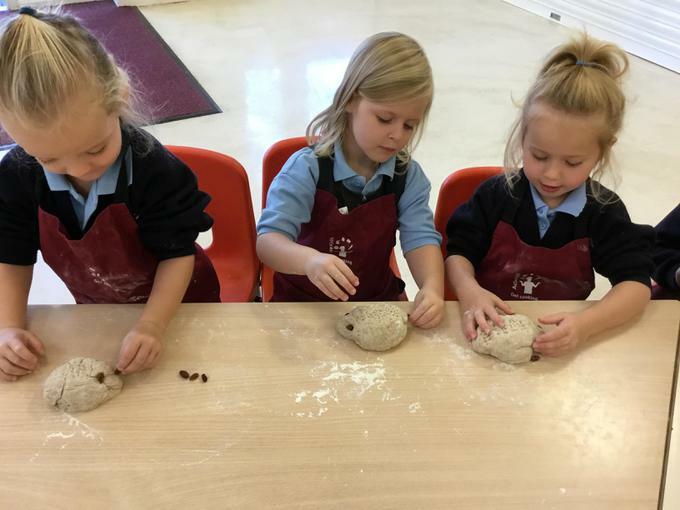 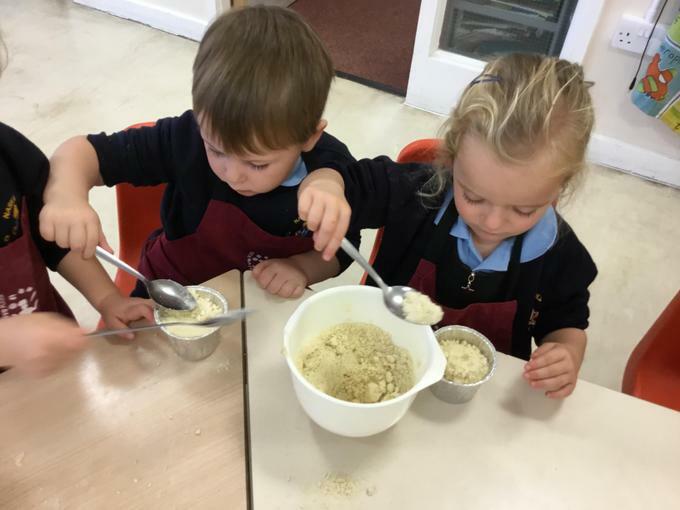 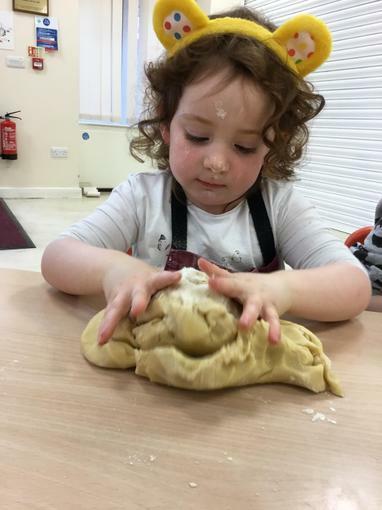 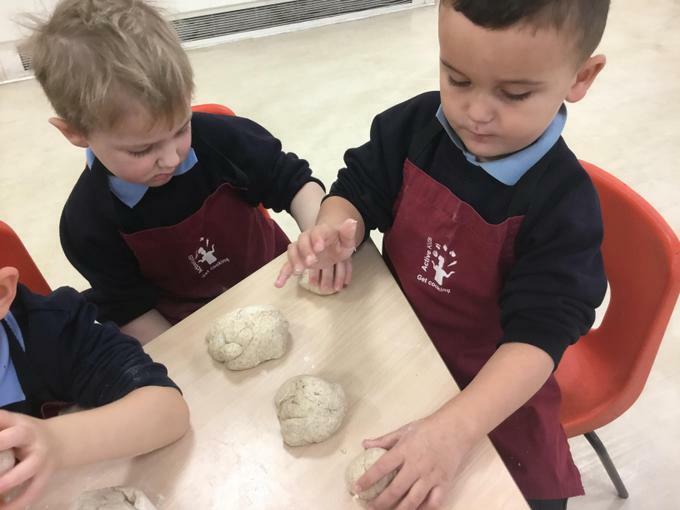 We also read 'The Little Red Hen' and made some bread, as well as apple crumble. 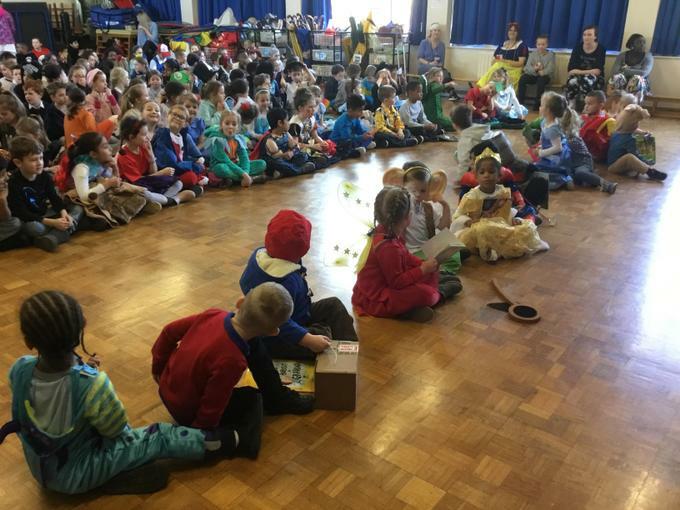 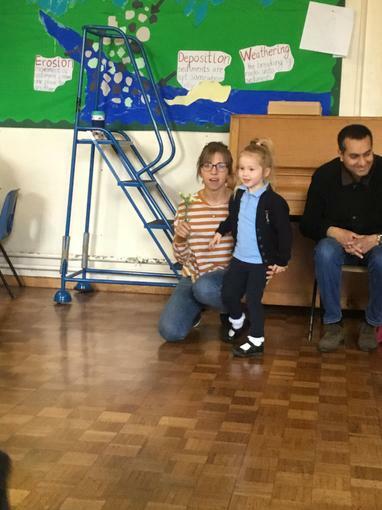 We had a Harvest Assembly and talked about what Harvest means. 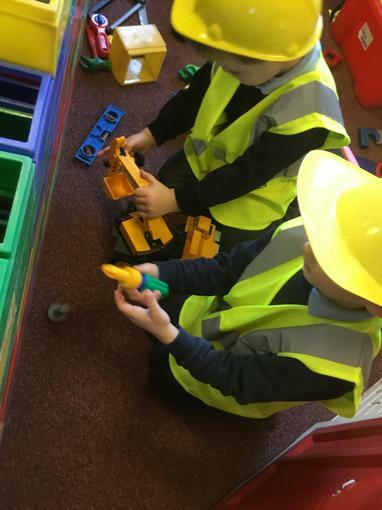 We discussed farmers and farm machinery. 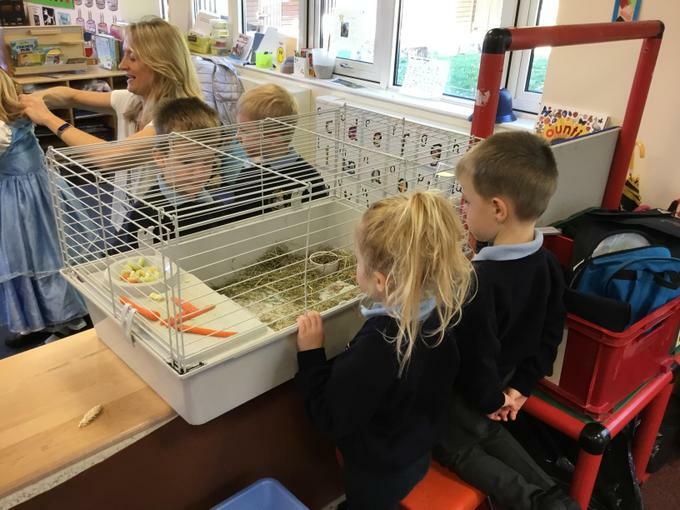 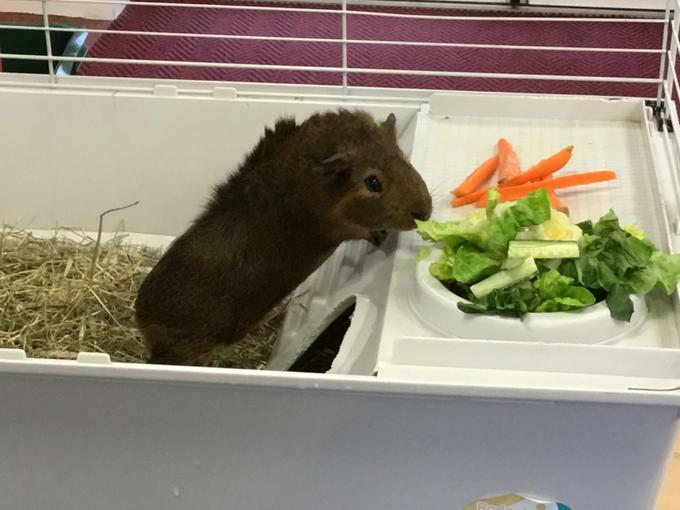 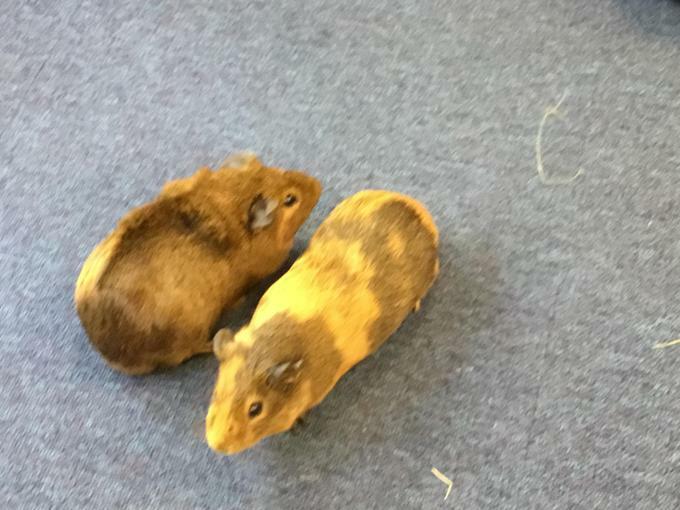 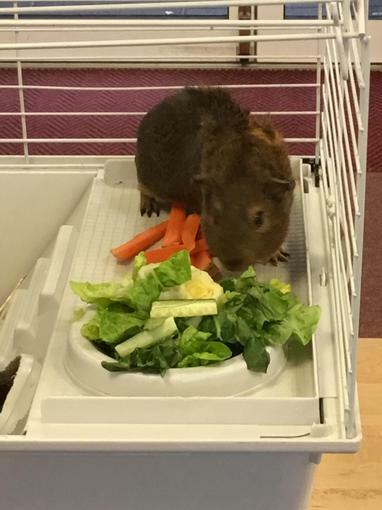 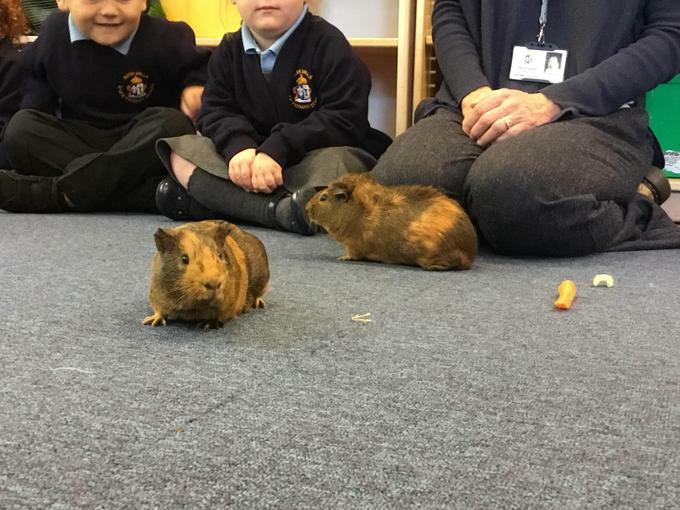 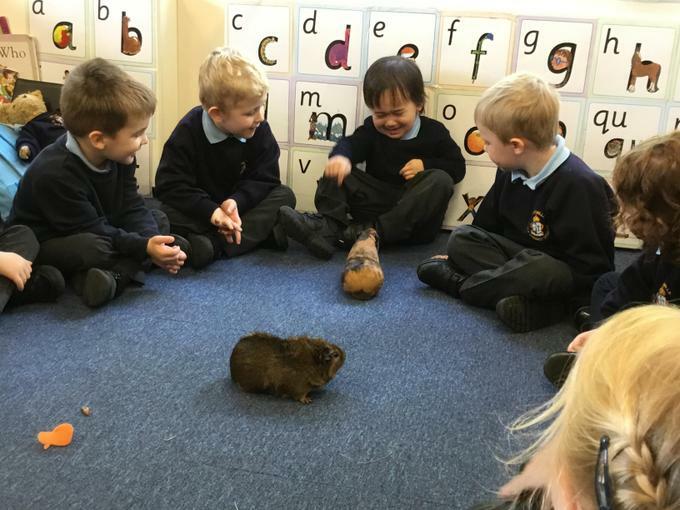 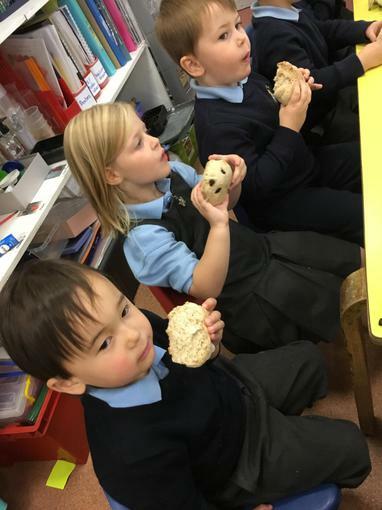 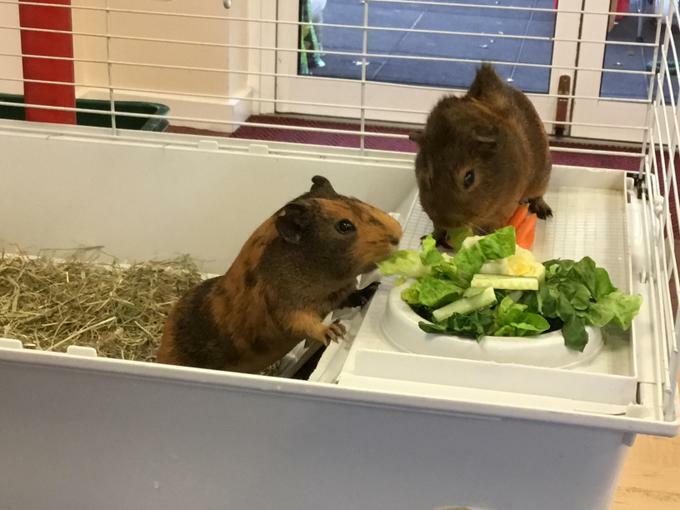 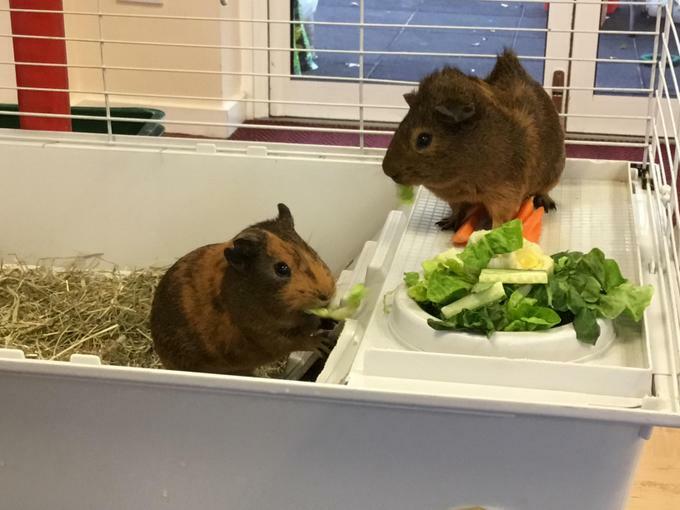 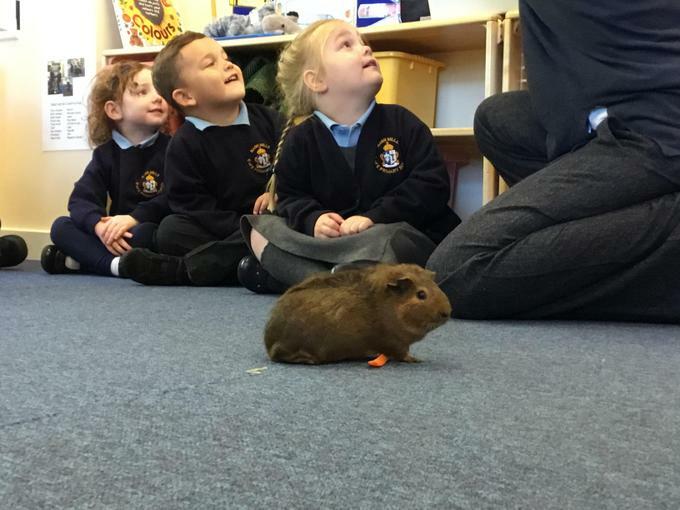 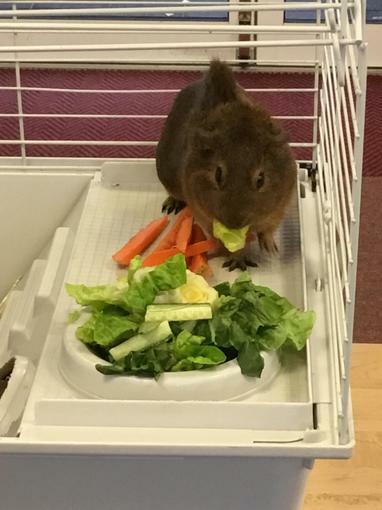 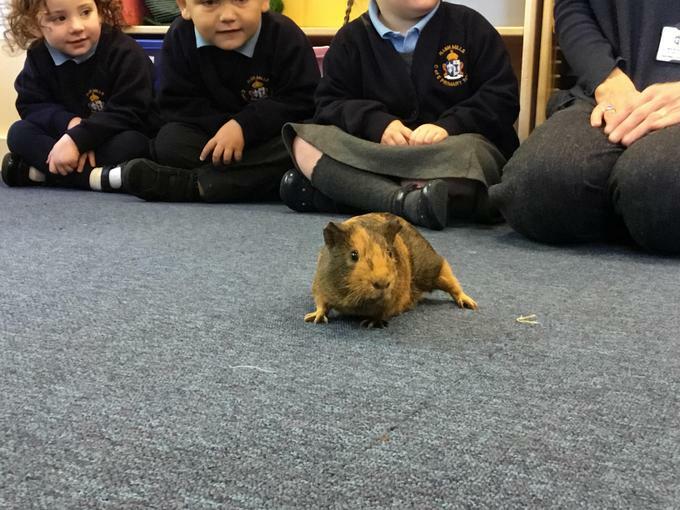 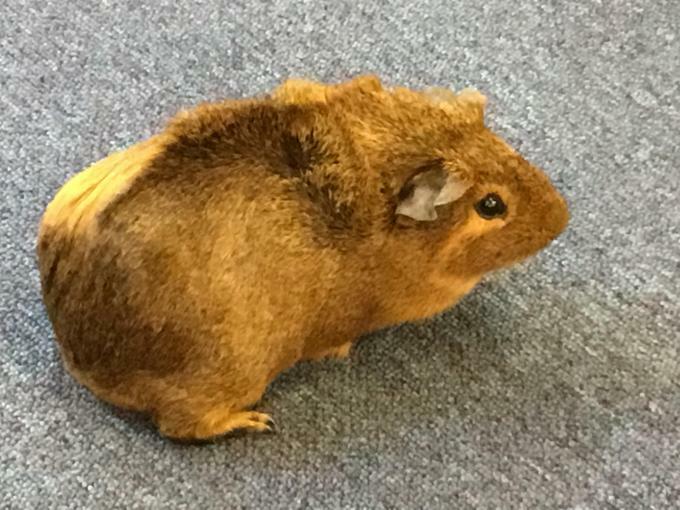 For our pet topic, we had some visitors - namely Bill and Ben the guinea pigs and Basil the dog. 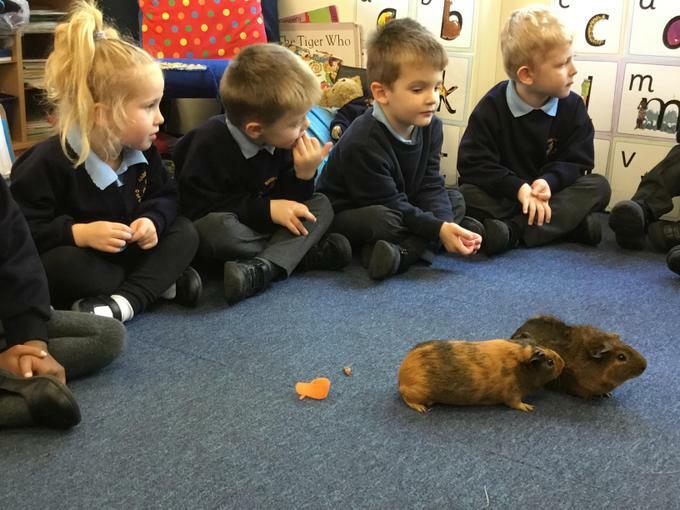 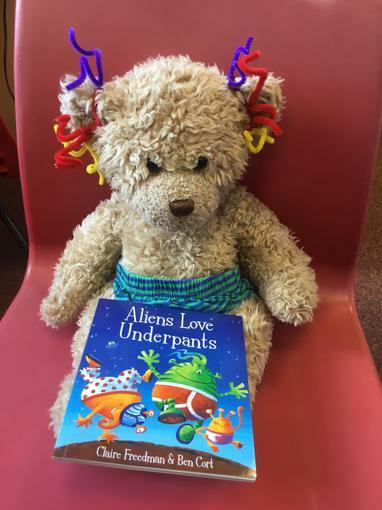 We talked about how to look after animals and read Dear Zoo, discussing why certain animals won't make good pets. 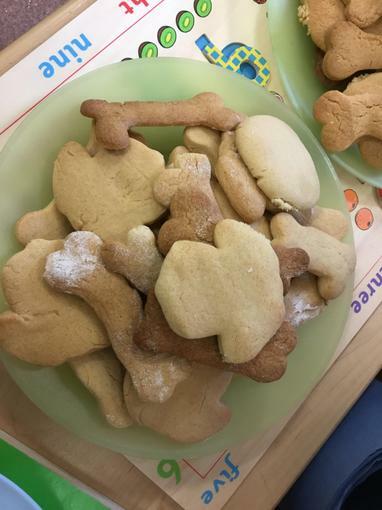 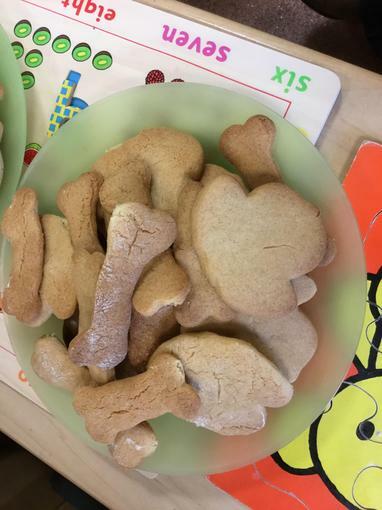 We made ginger biscuits in the shape of bones and also made bird feeders for the birds. 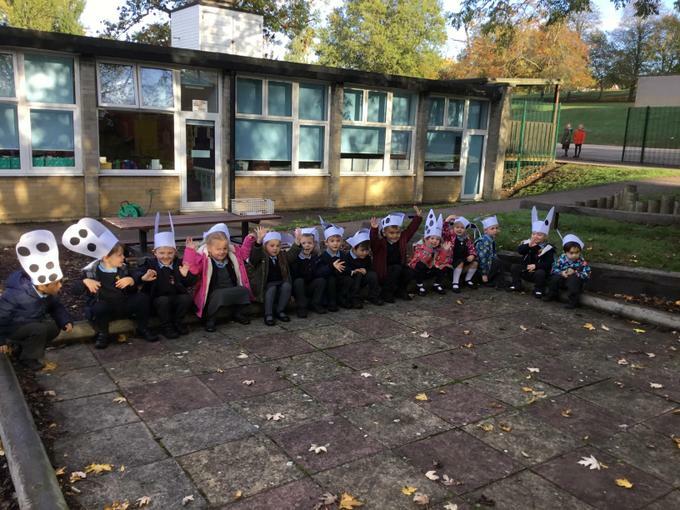 We made some large doggie ears and used them when we went on a listening walk, trying to be quiet and listen to the sounds around us. 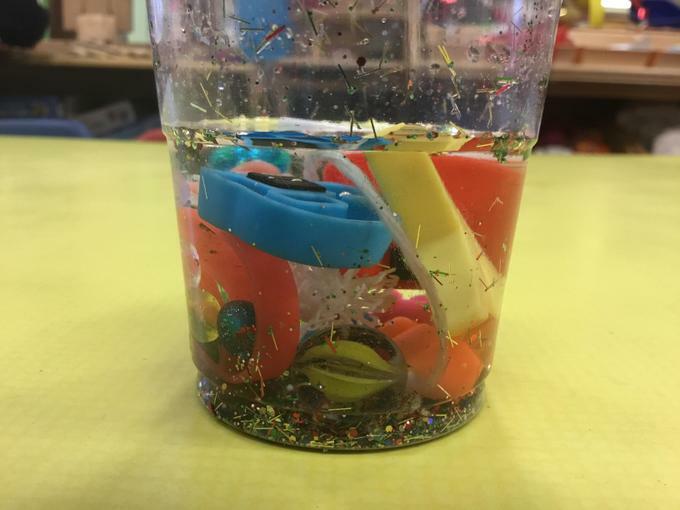 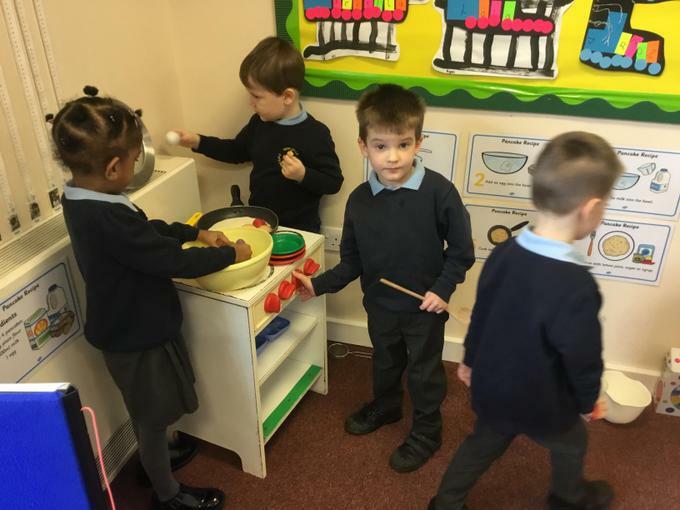 We experimented with sound as well, using different materials to tap and bang on different materials to see how different the sounds can be. 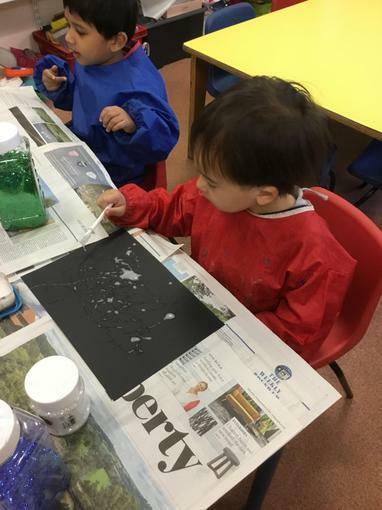 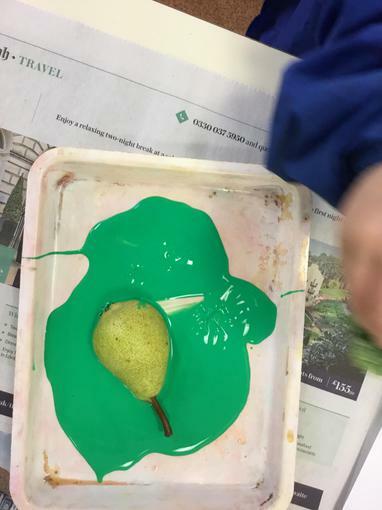 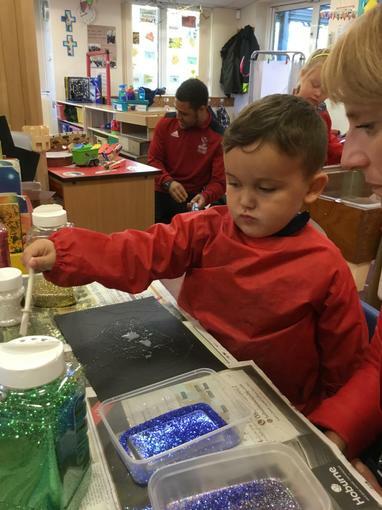 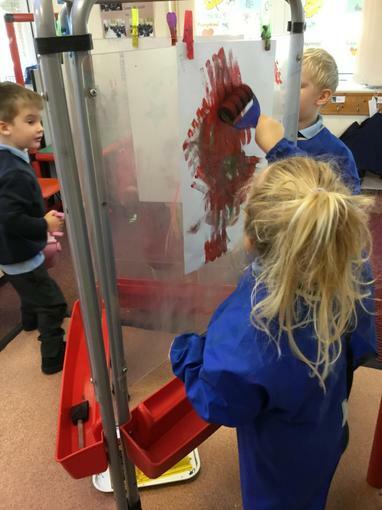 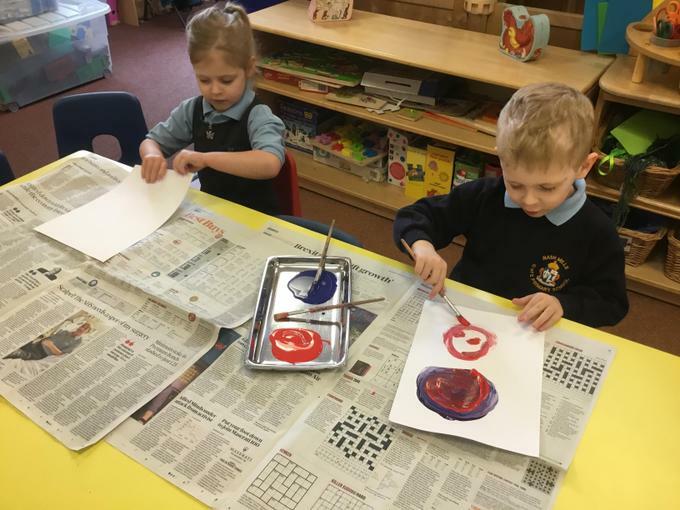 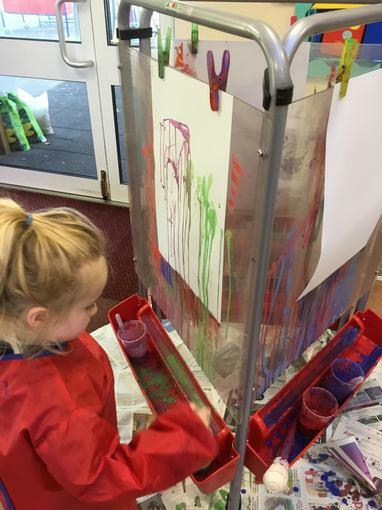 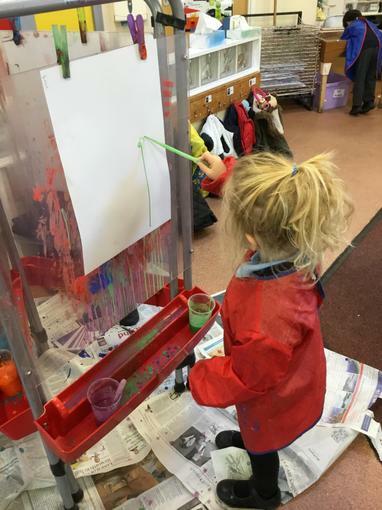 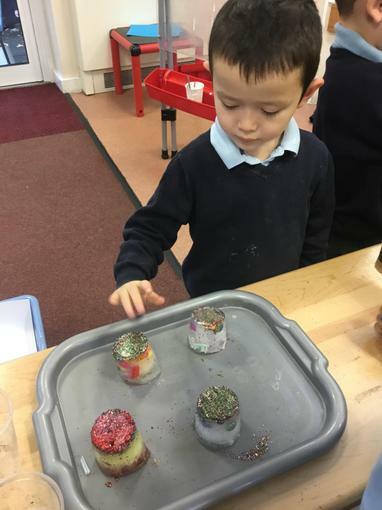 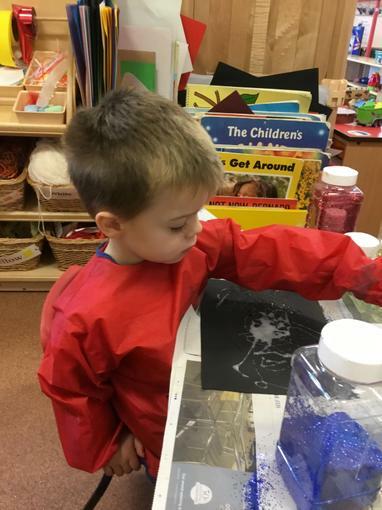 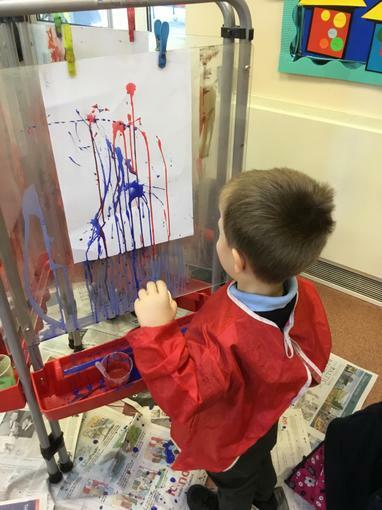 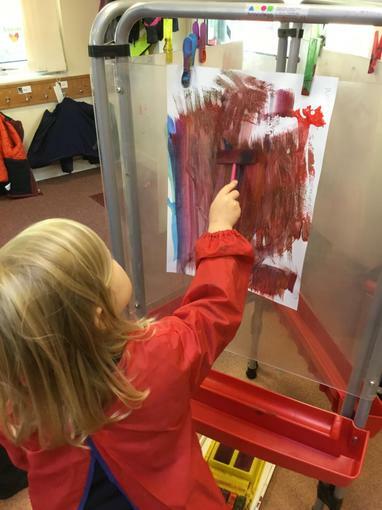 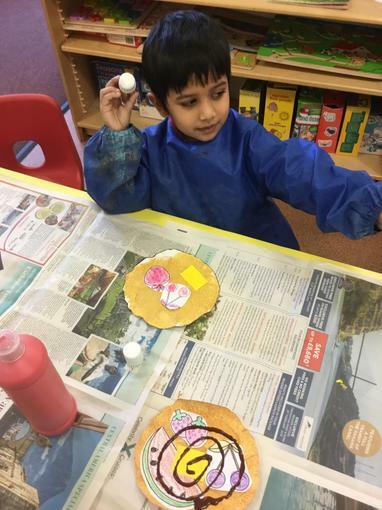 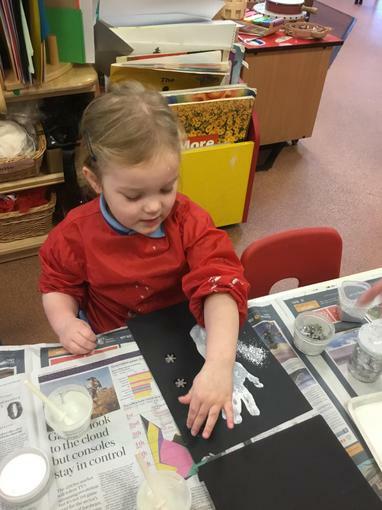 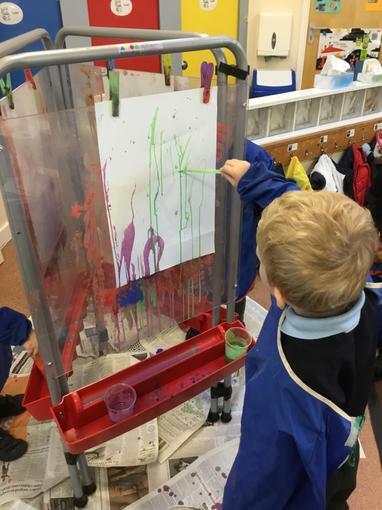 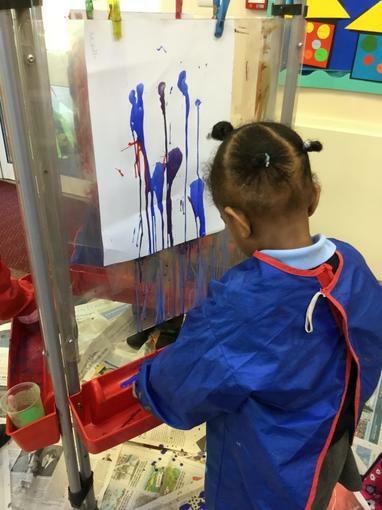 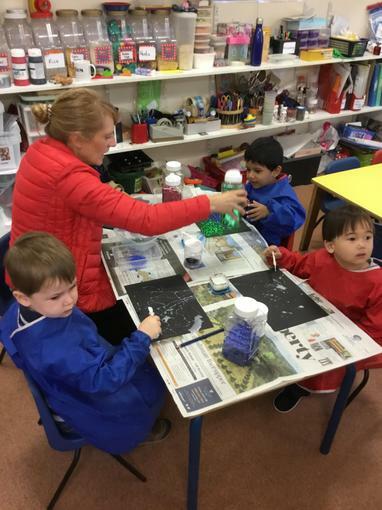 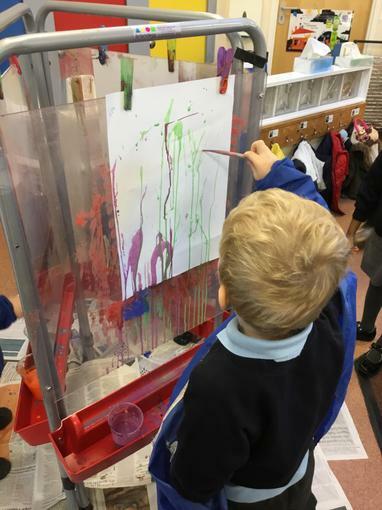 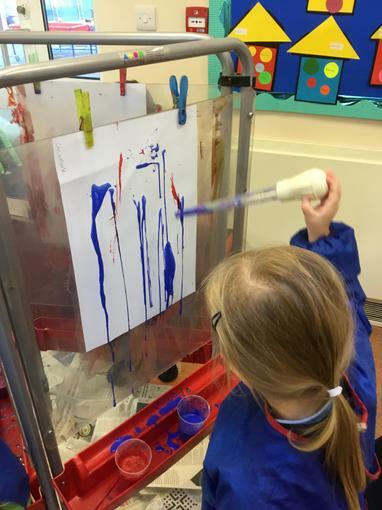 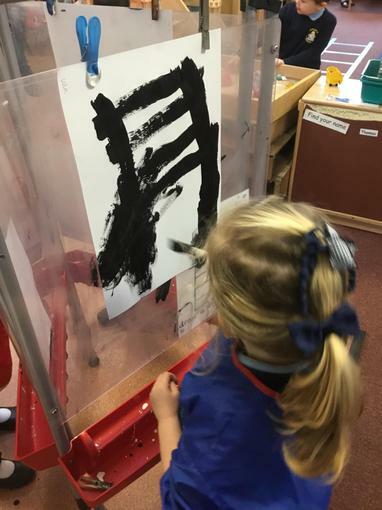 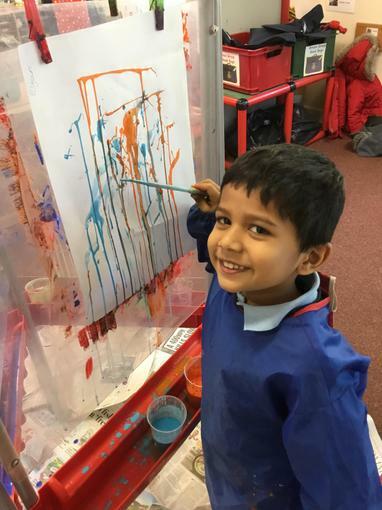 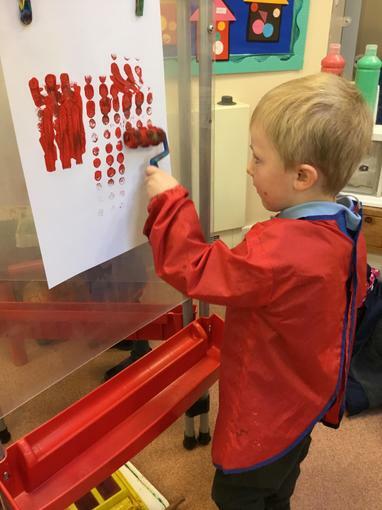 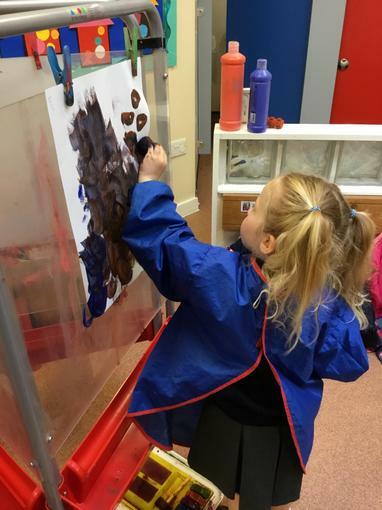 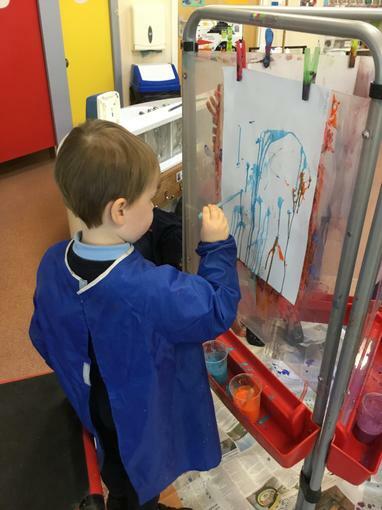 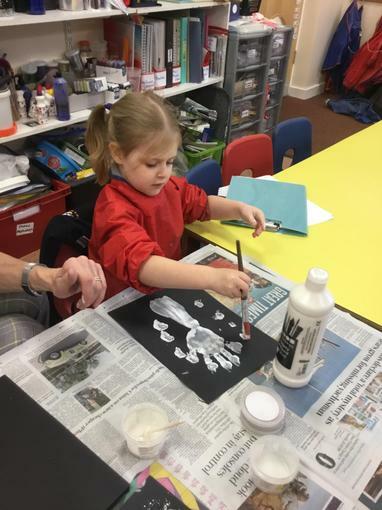 We experimented with different methods of painting - using sponge rollers, foam shapes and also did some 'drop drop' painting, using pipettes. 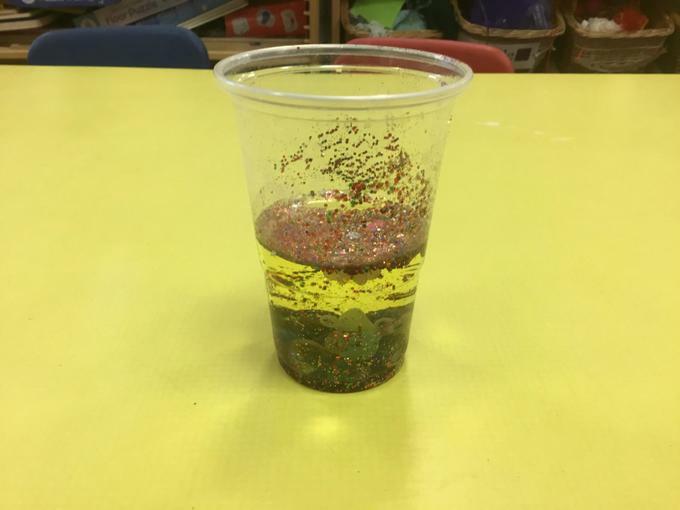 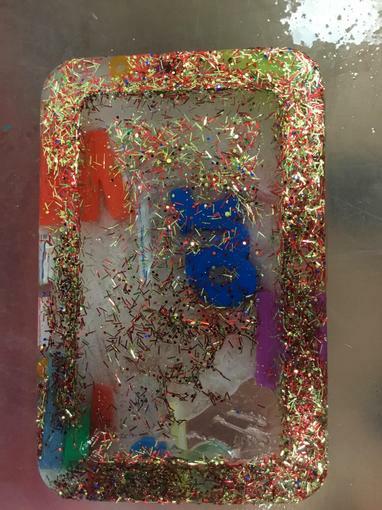 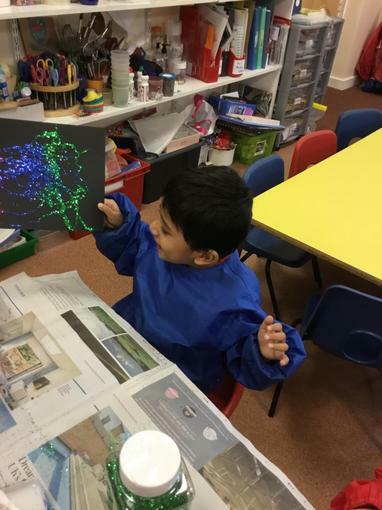 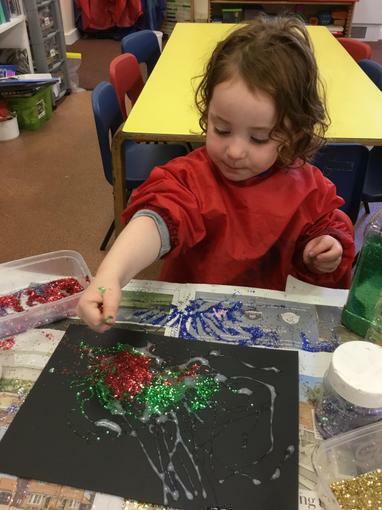 We also made glittery firework pictures and had a visit from Mr Masters and listened to stories from the bible. 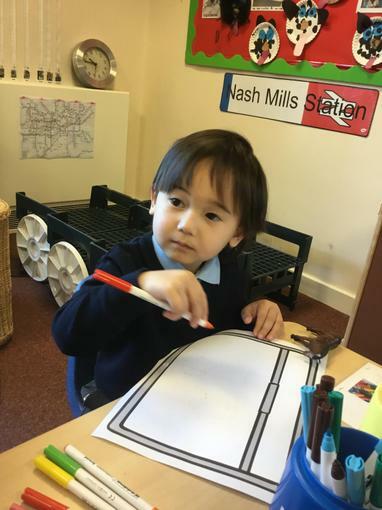 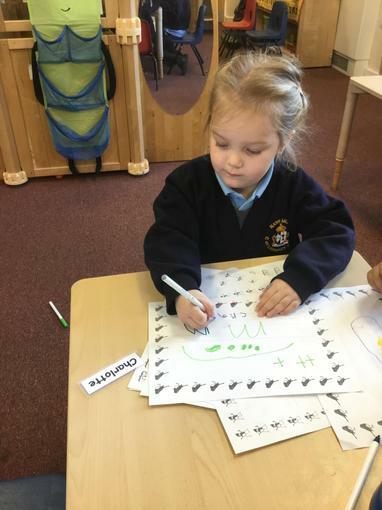 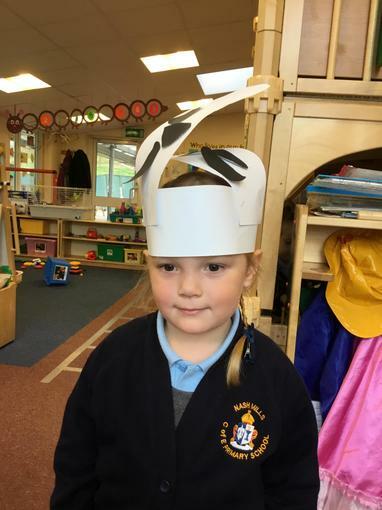 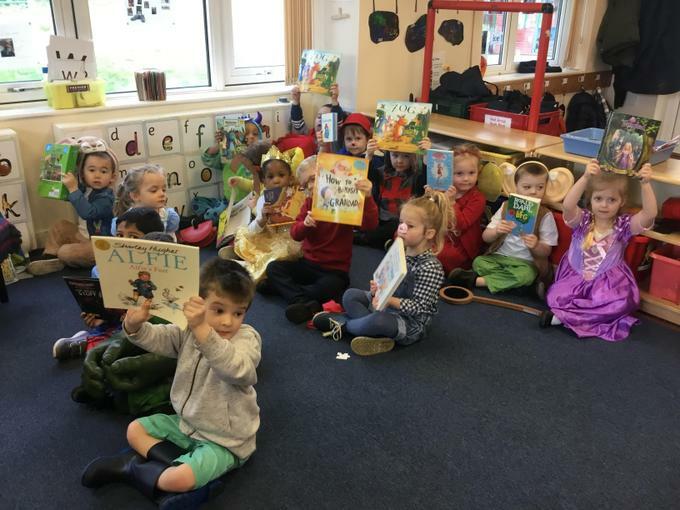 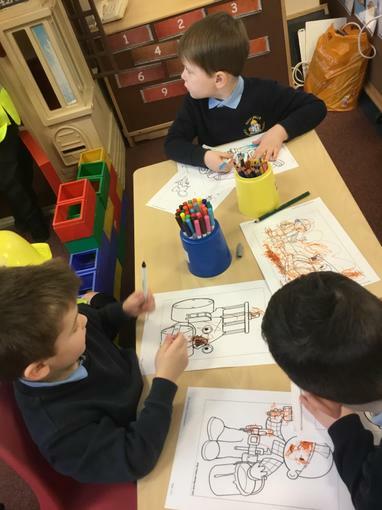 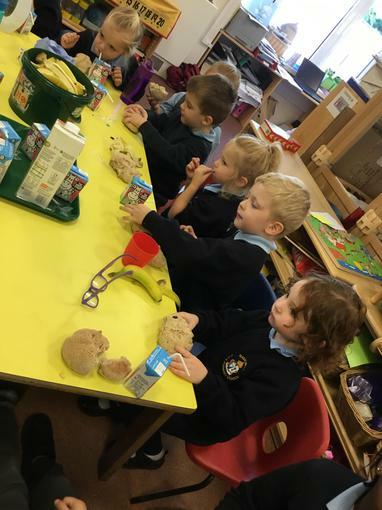 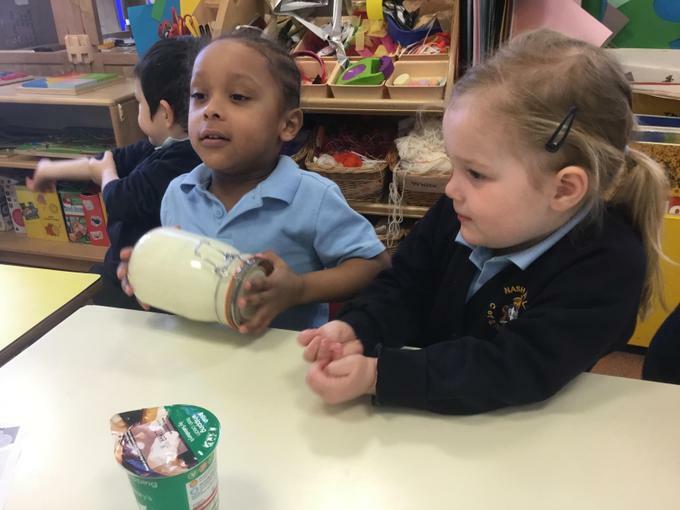 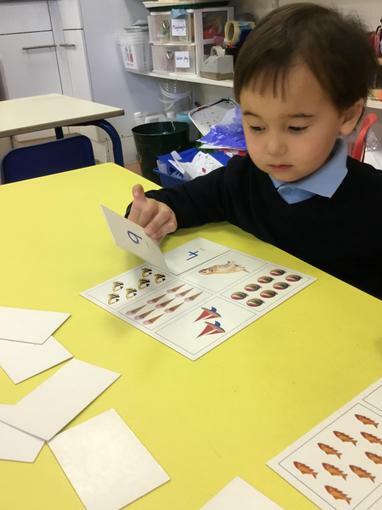 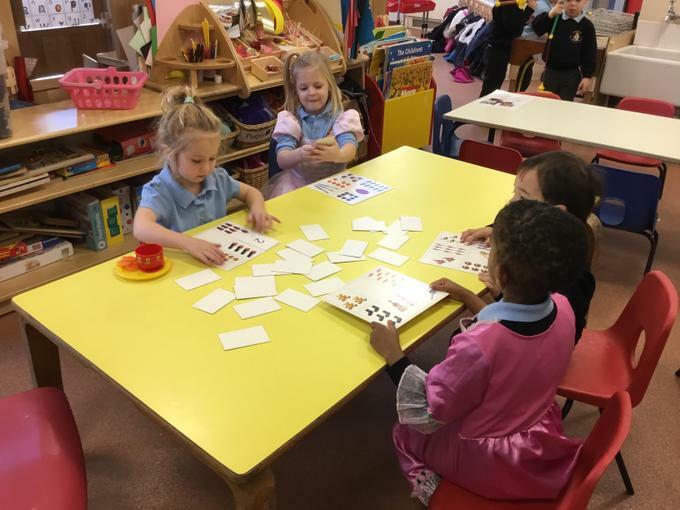 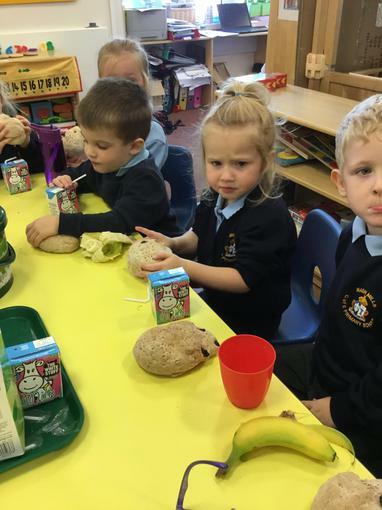 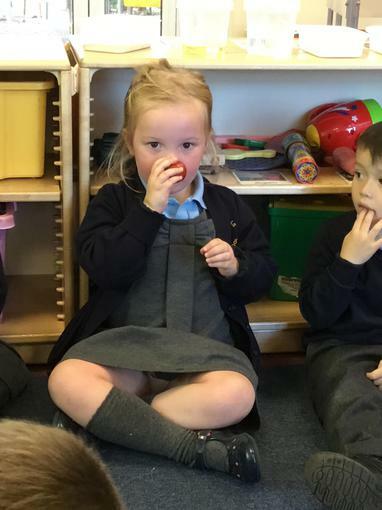 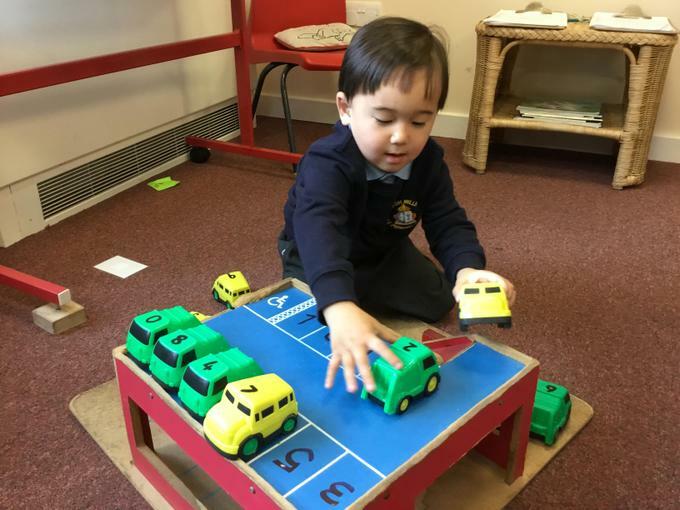 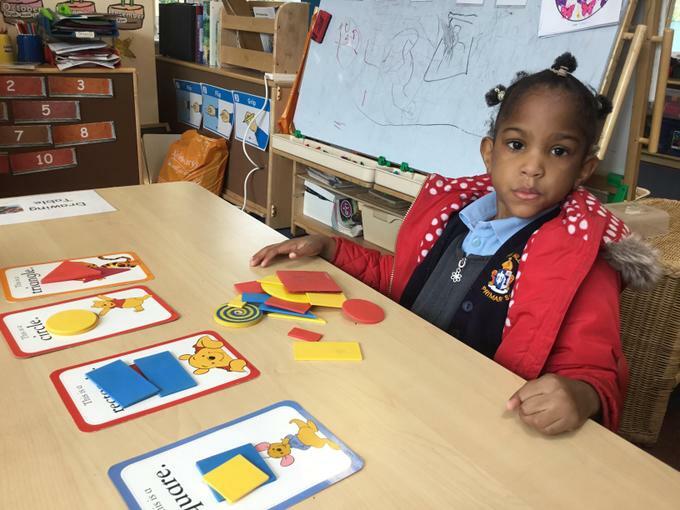 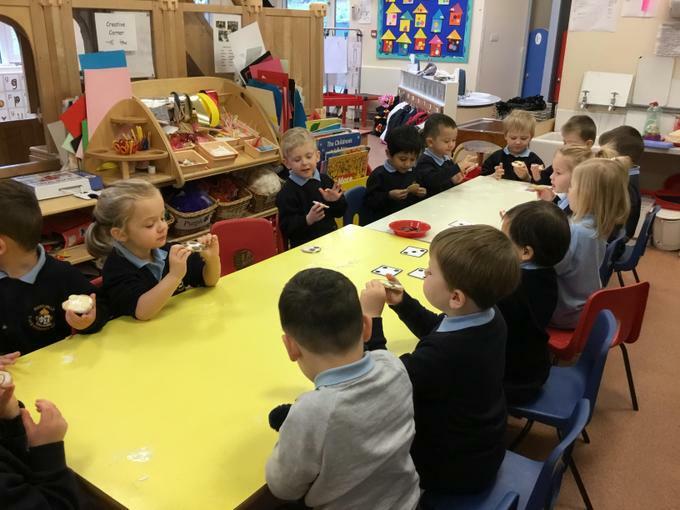 The children at Nursery have settled in quickly. 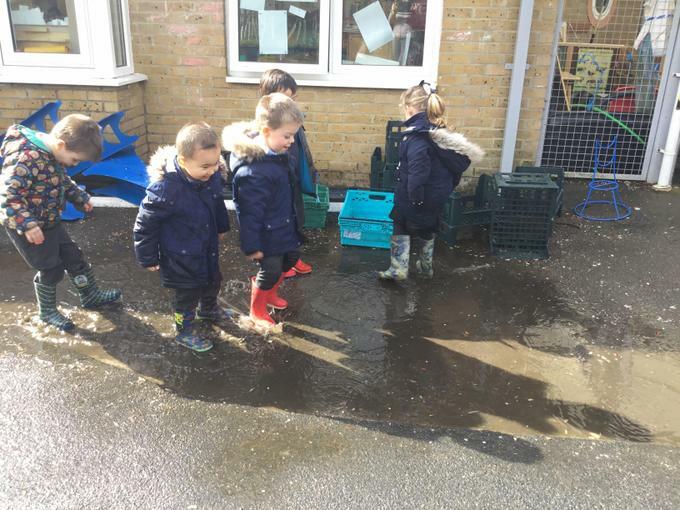 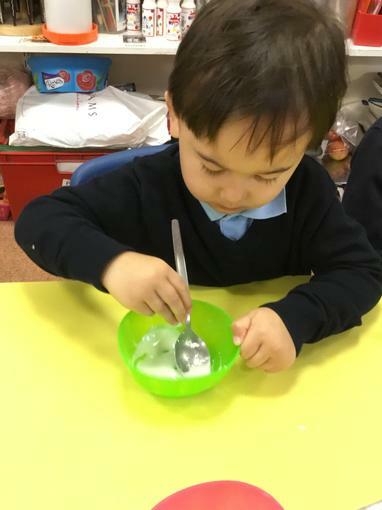 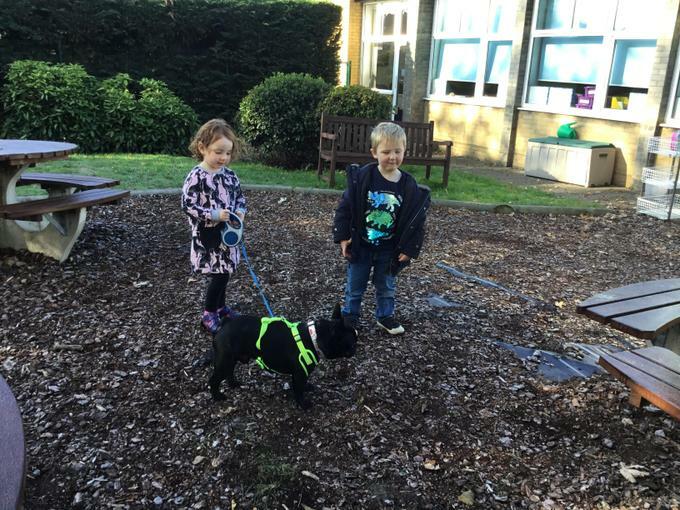 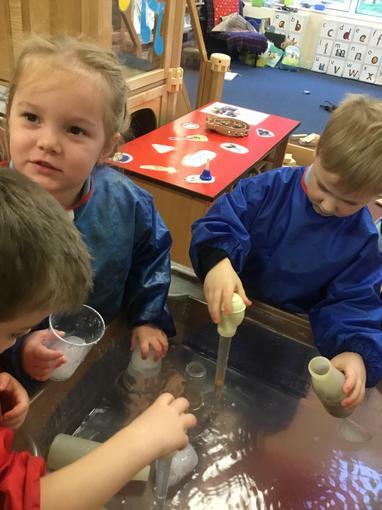 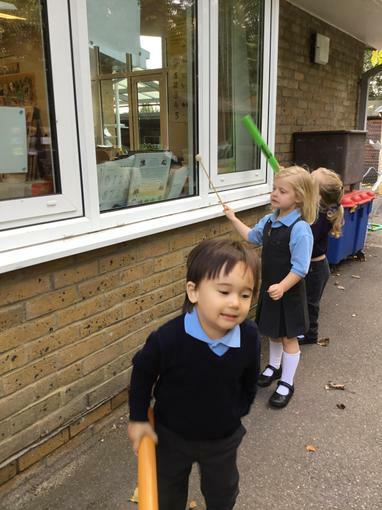 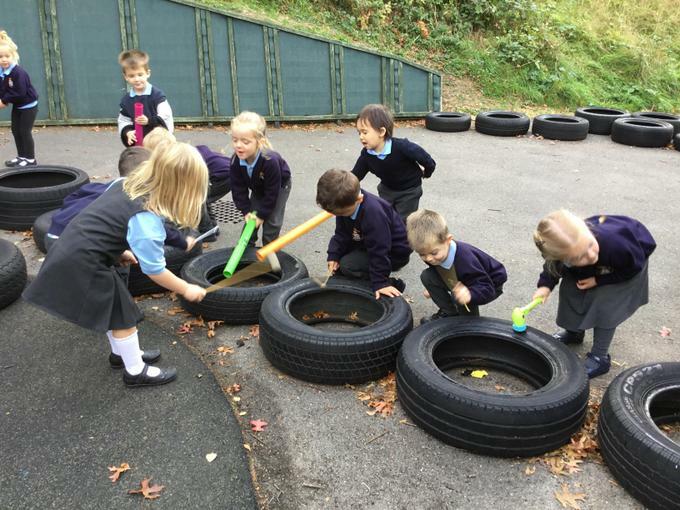 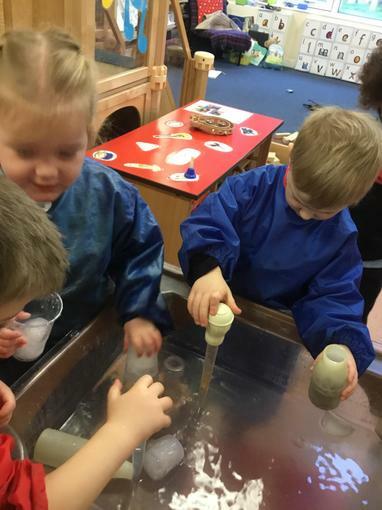 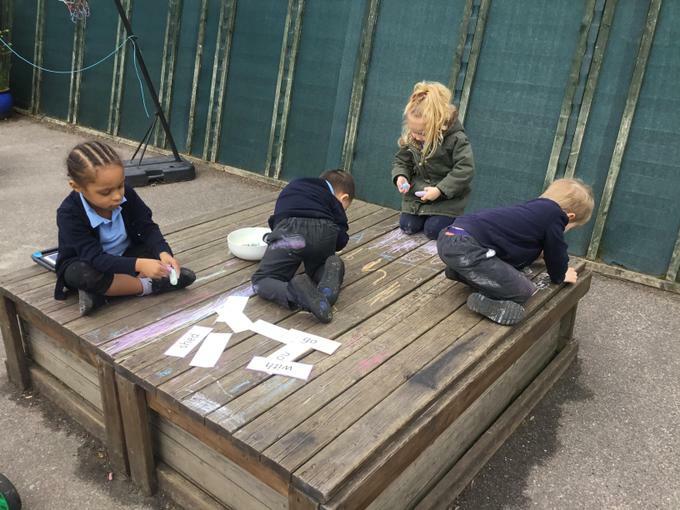 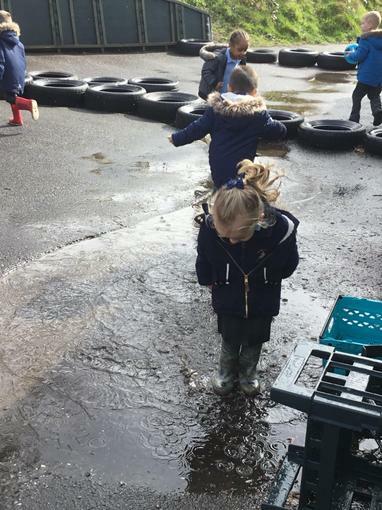 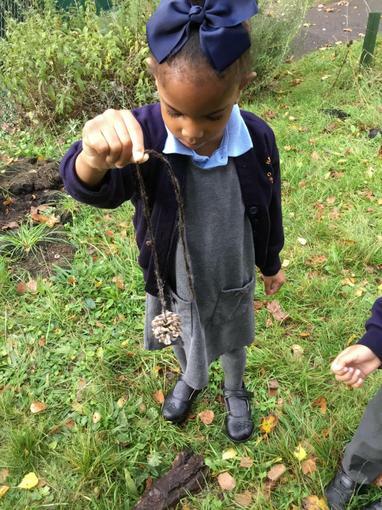 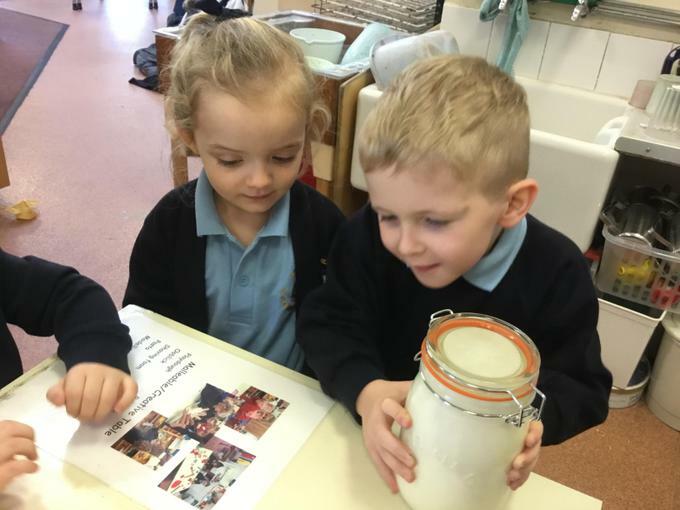 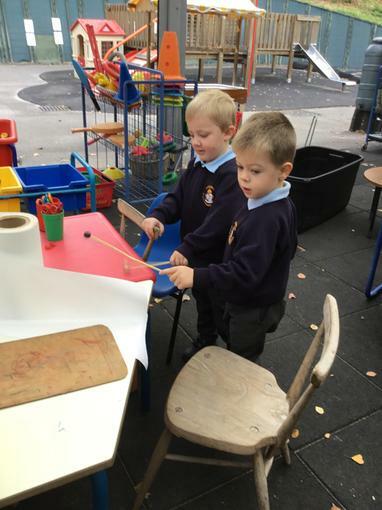 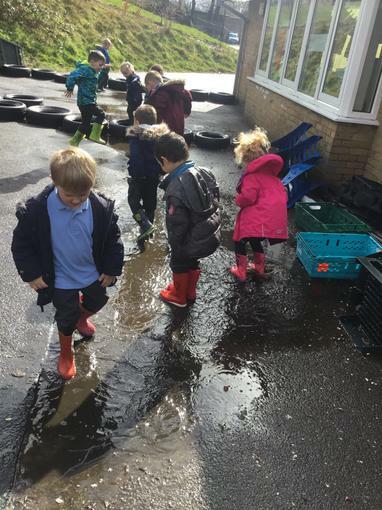 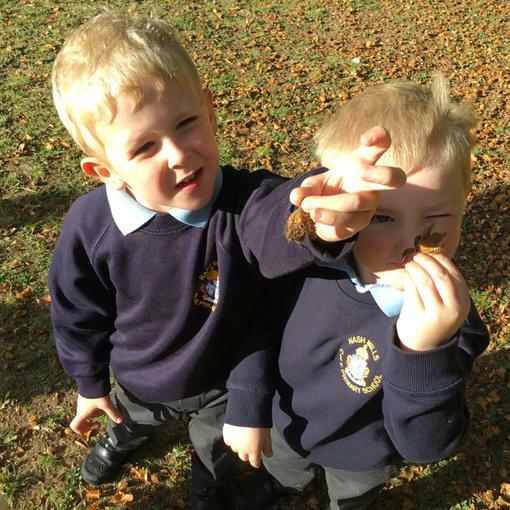 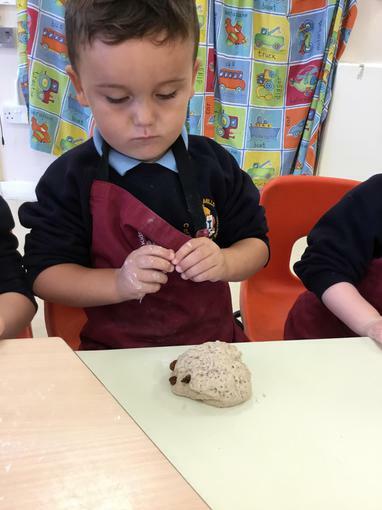 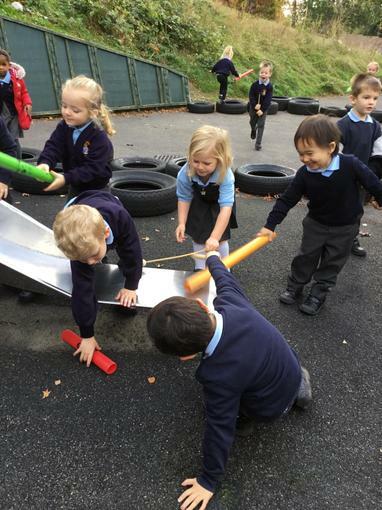 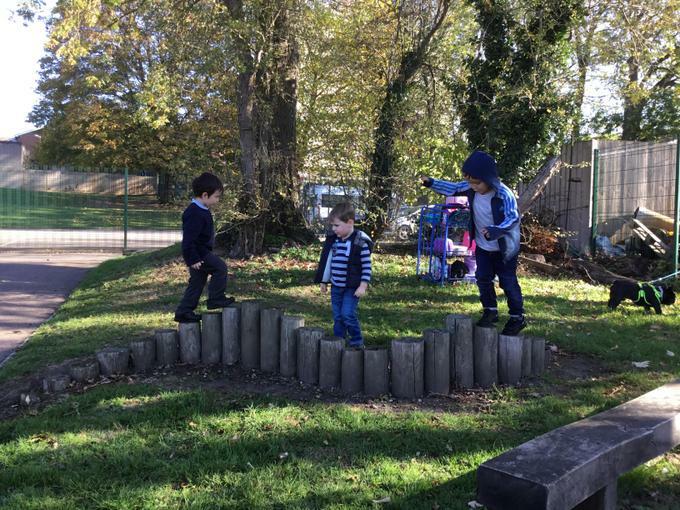 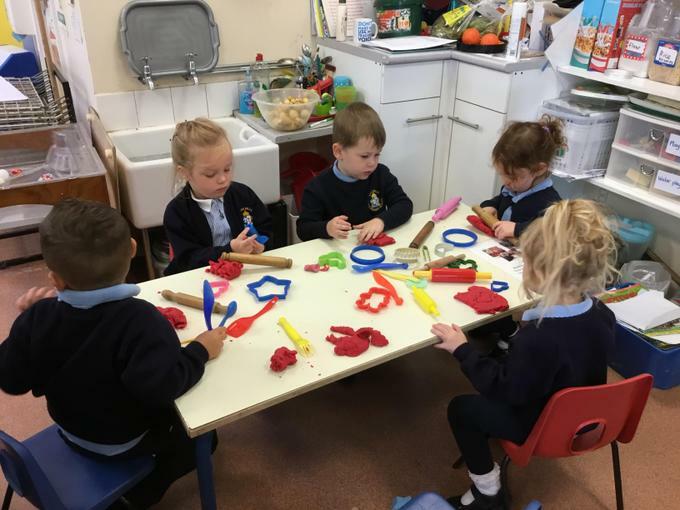 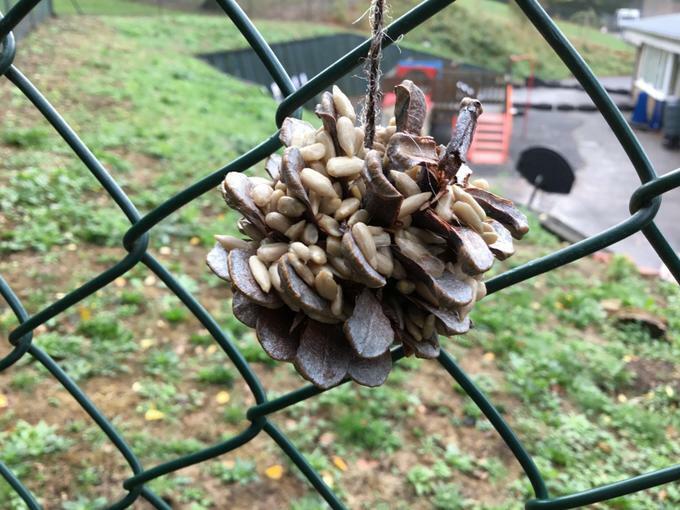 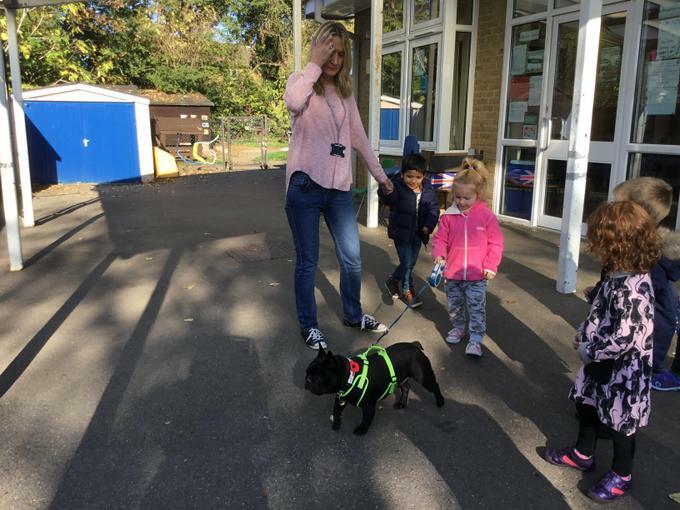 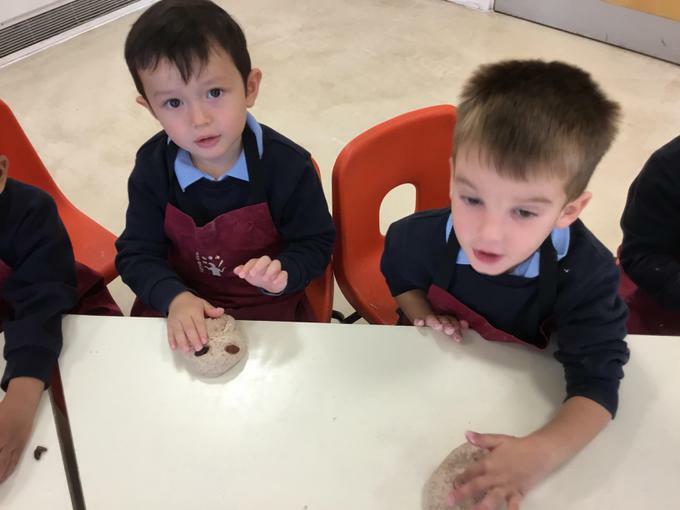 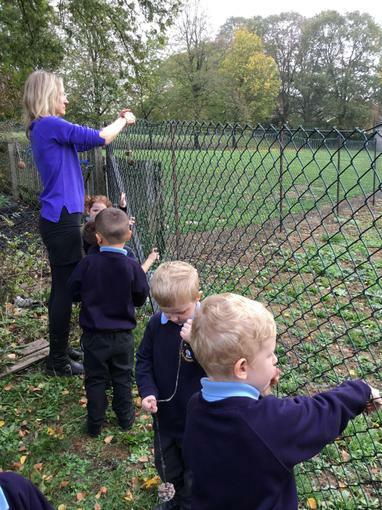 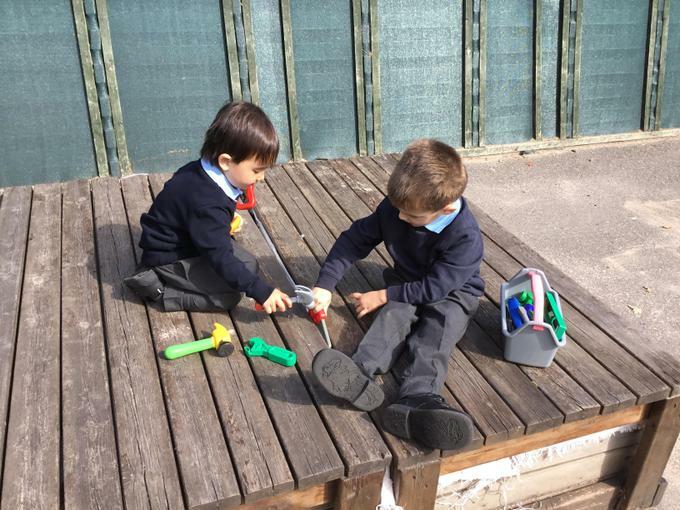 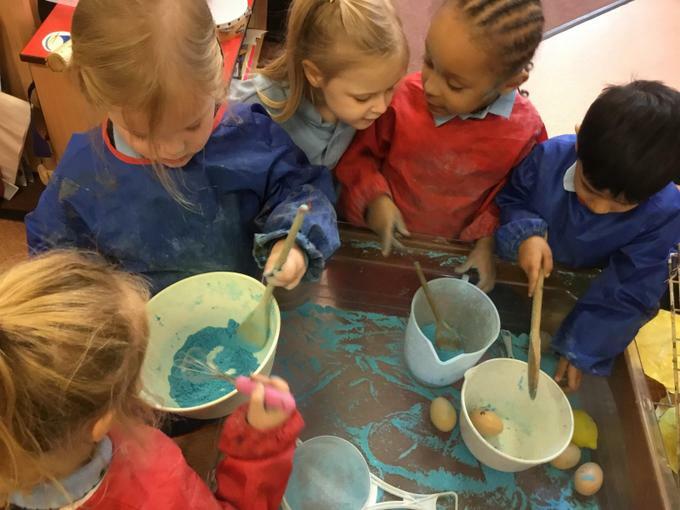 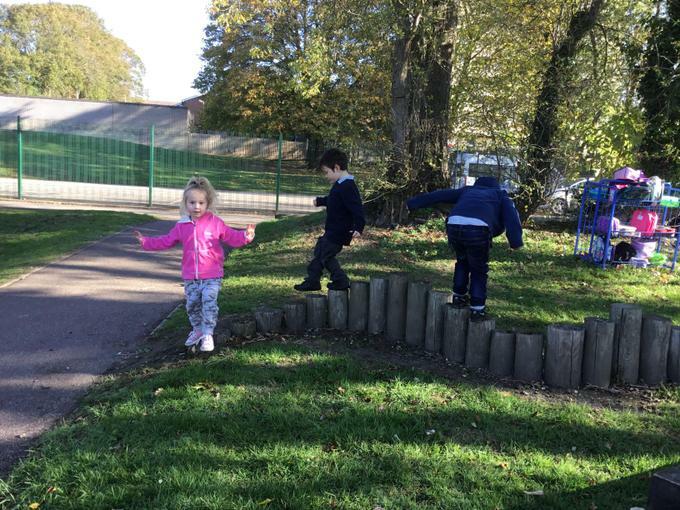 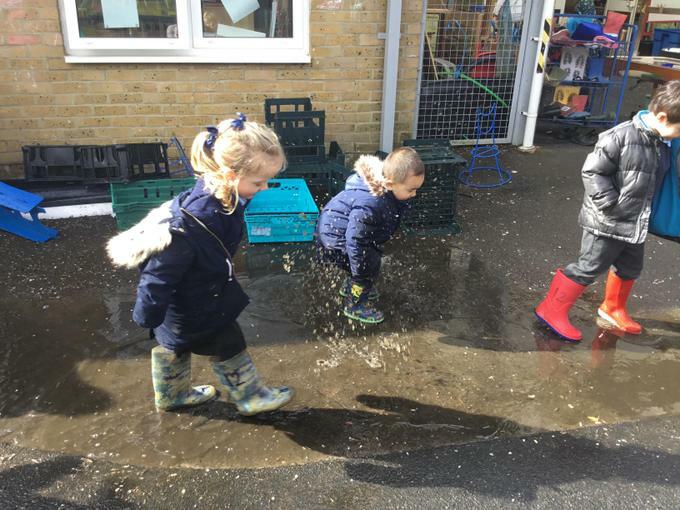 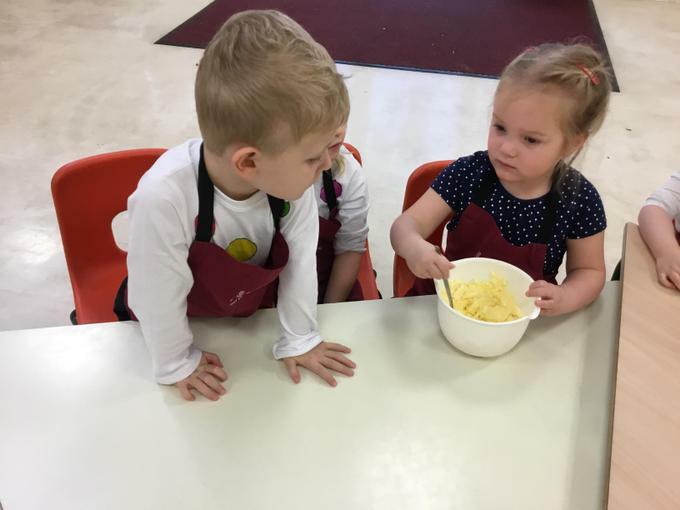 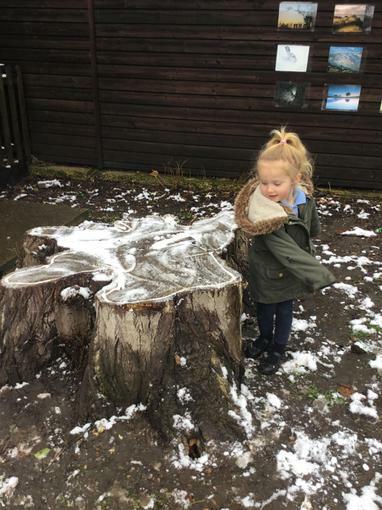 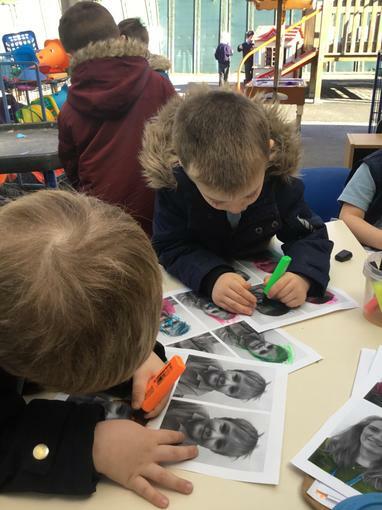 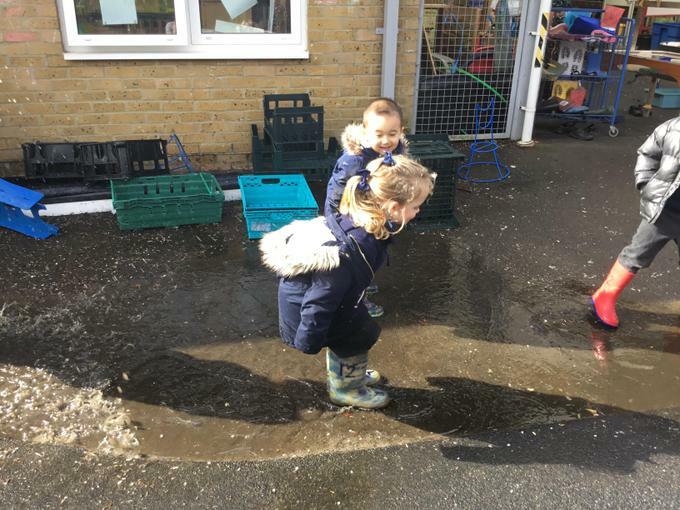 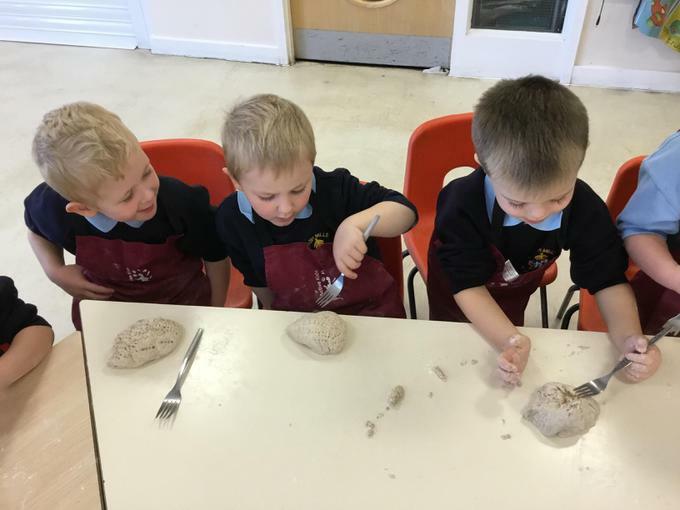 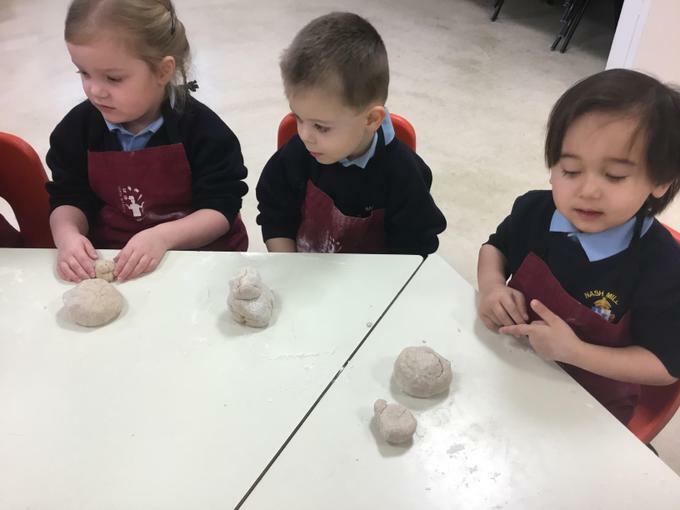 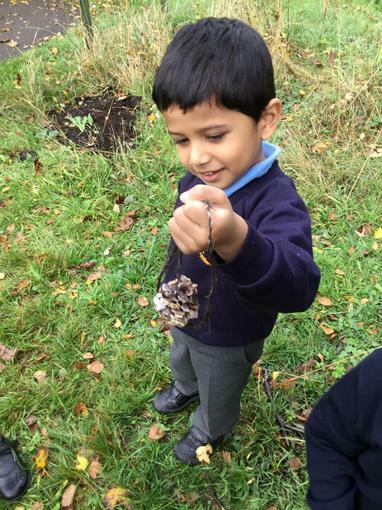 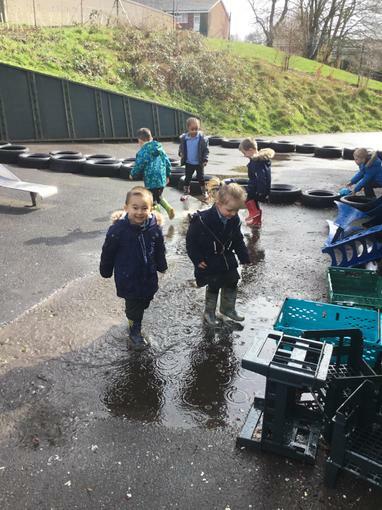 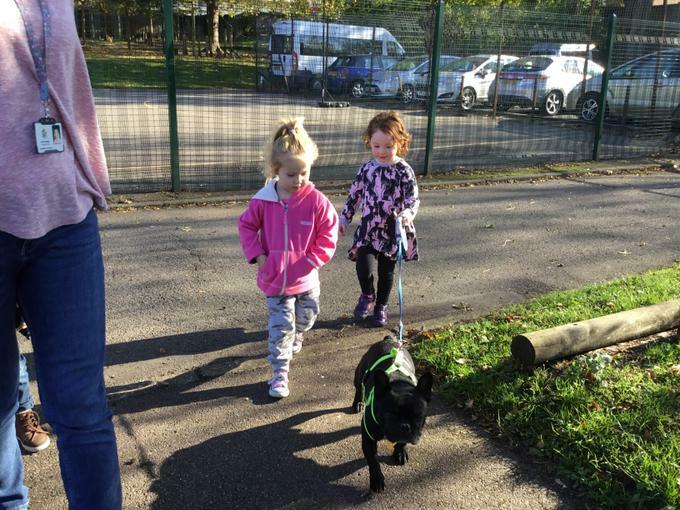 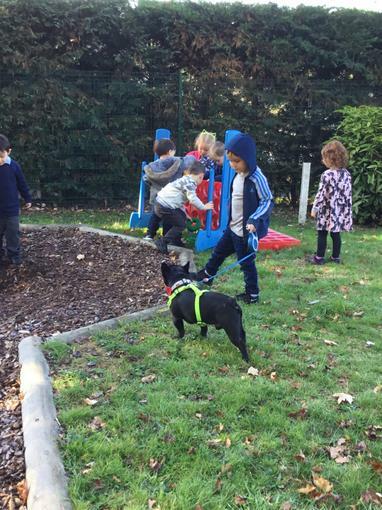 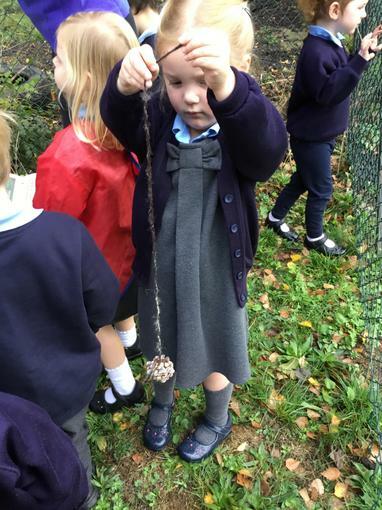 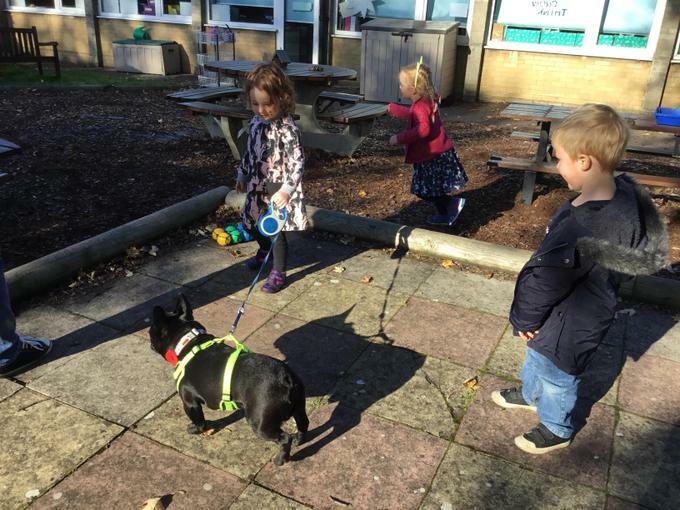 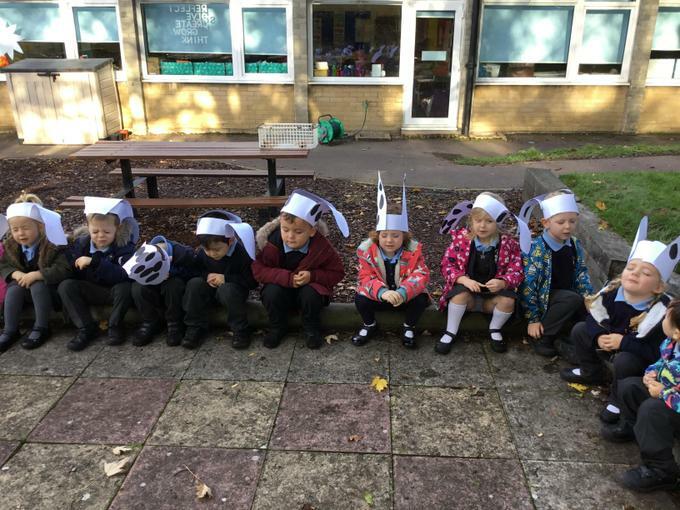 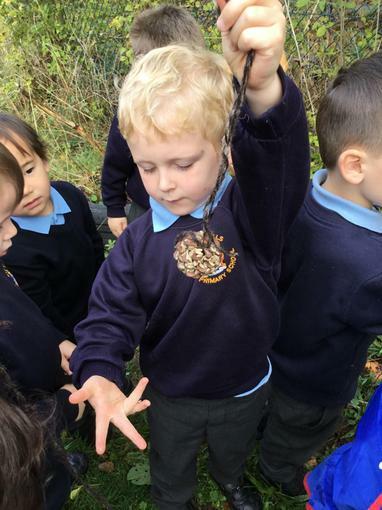 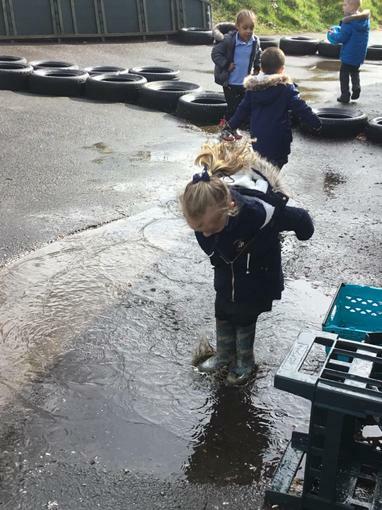 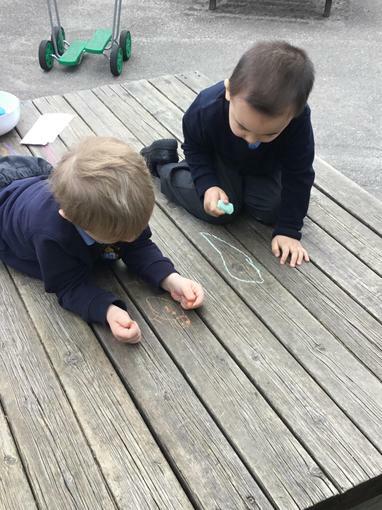 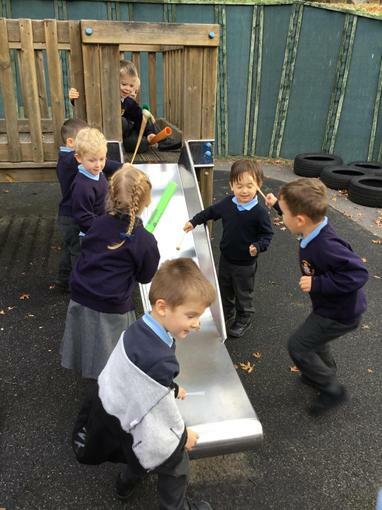 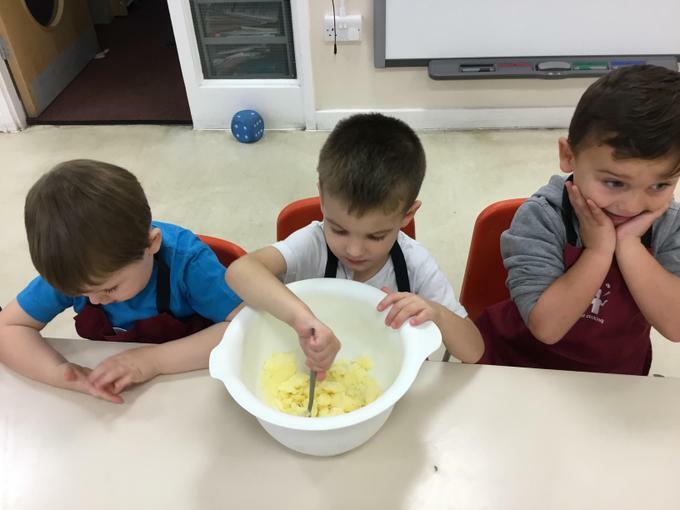 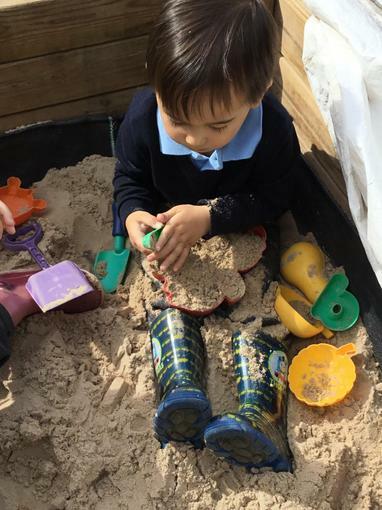 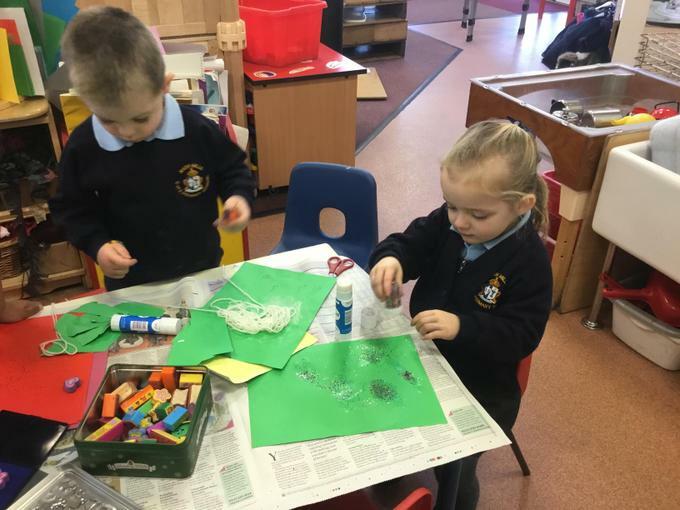 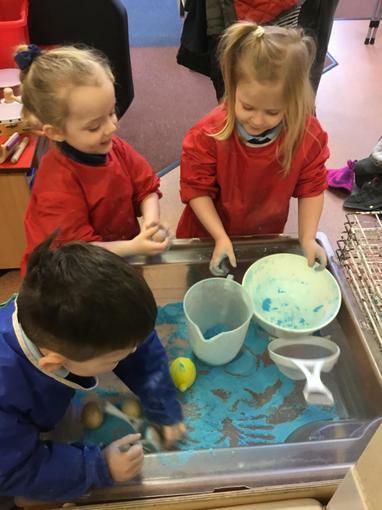 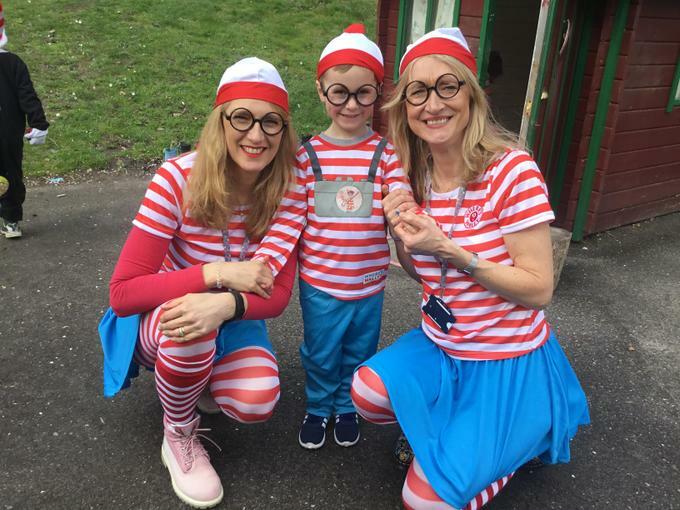 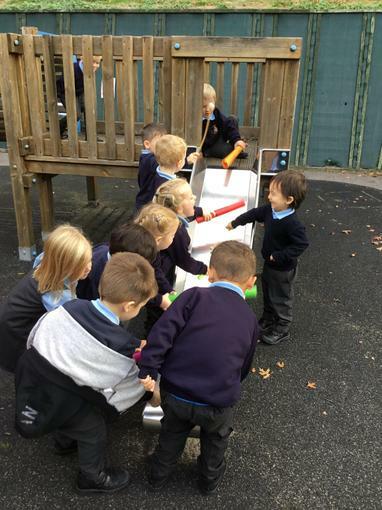 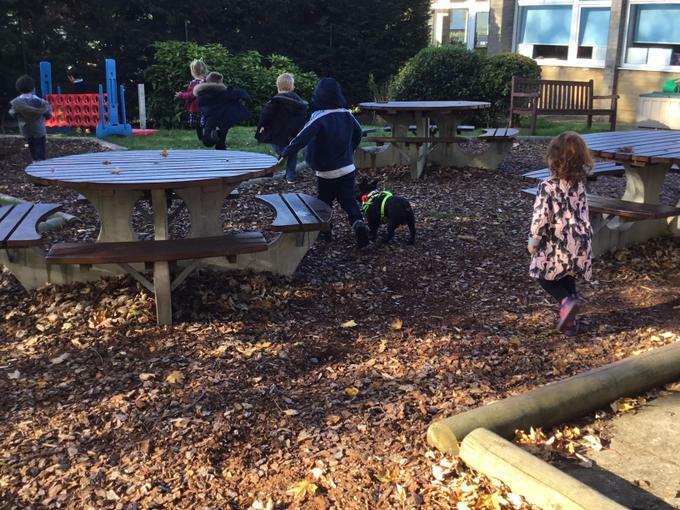 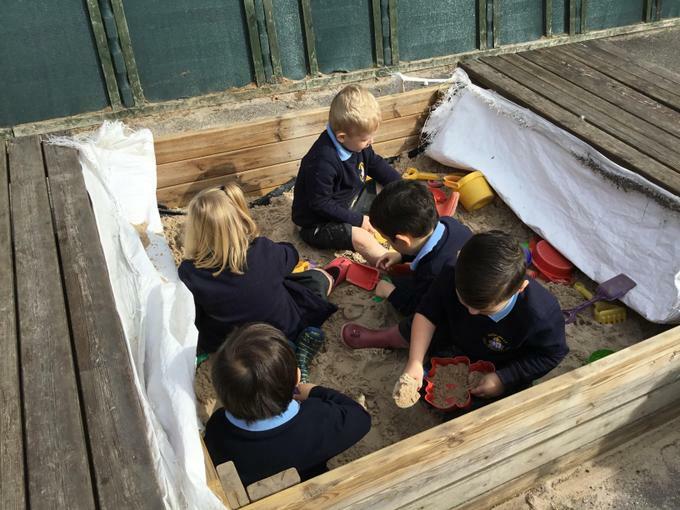 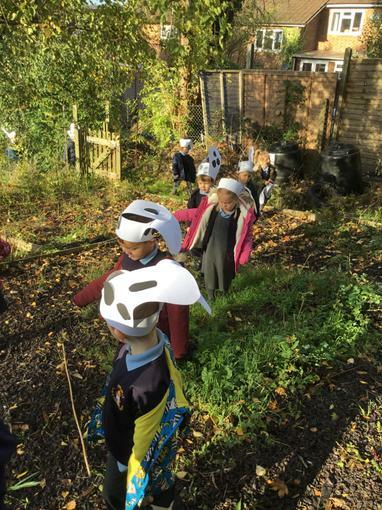 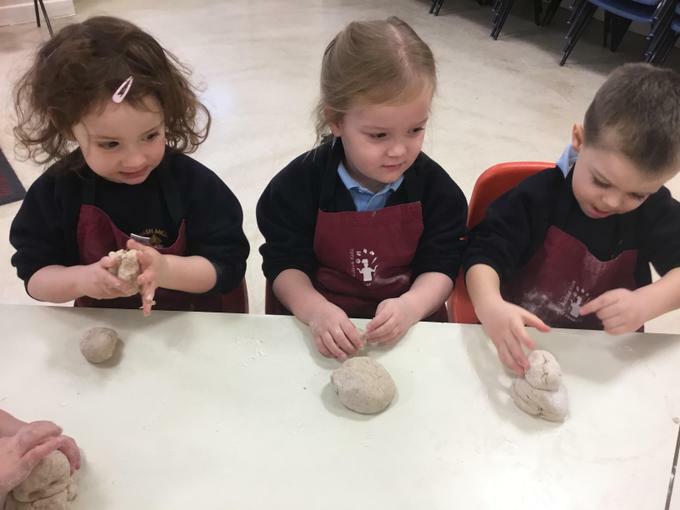 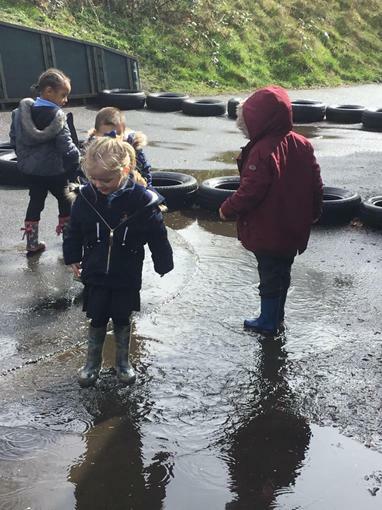 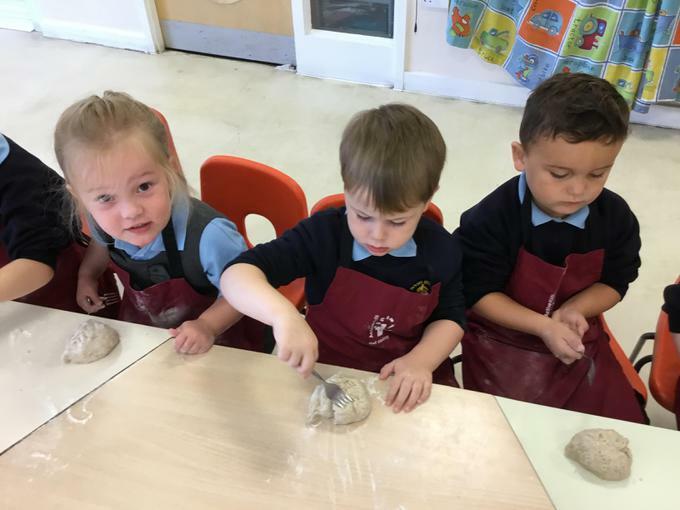 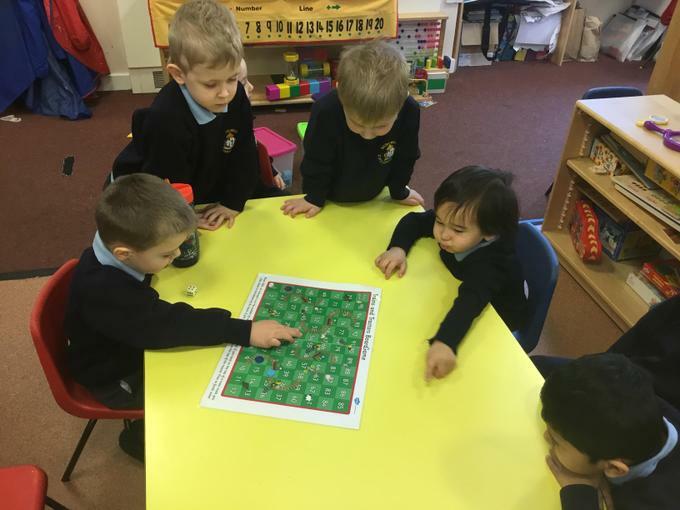 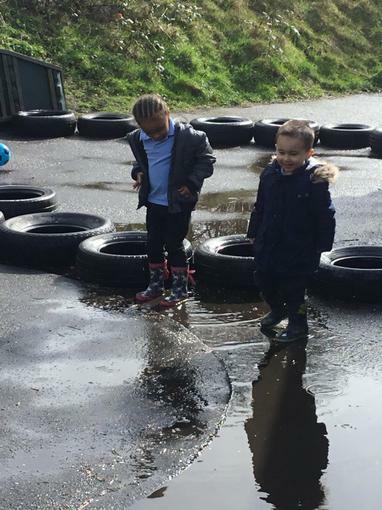 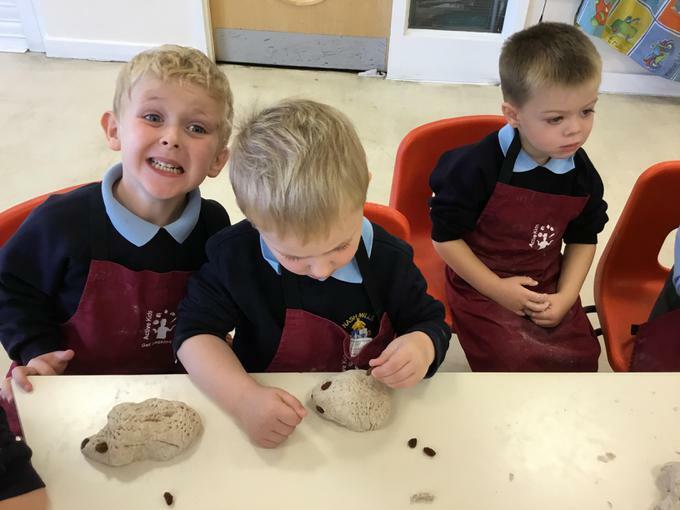 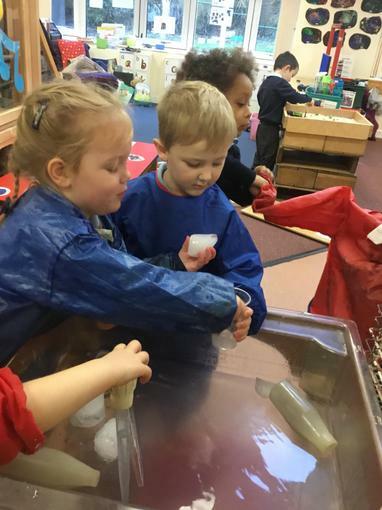 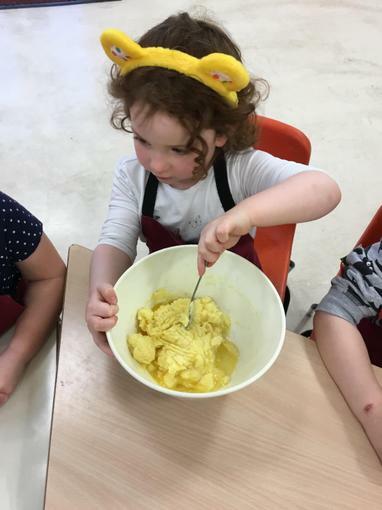 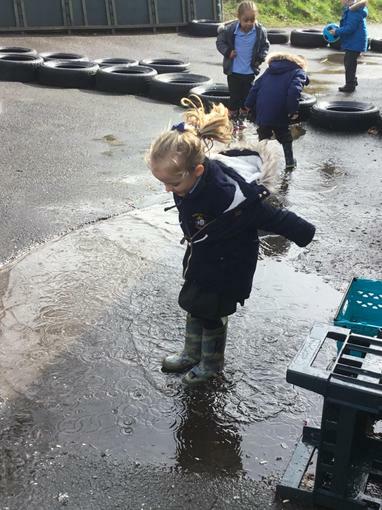 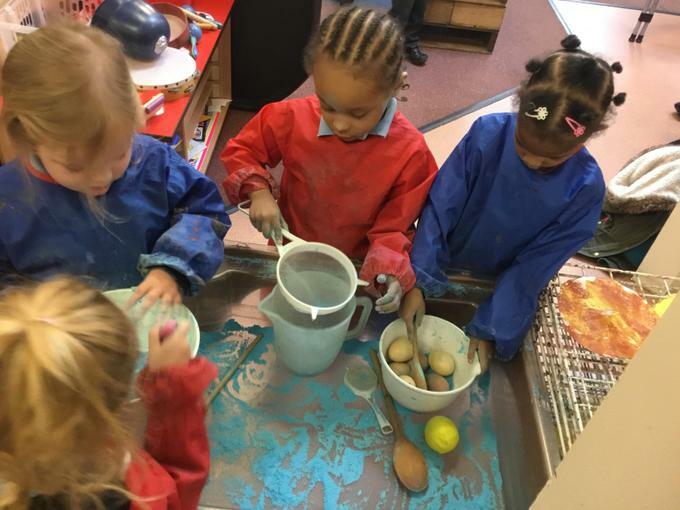 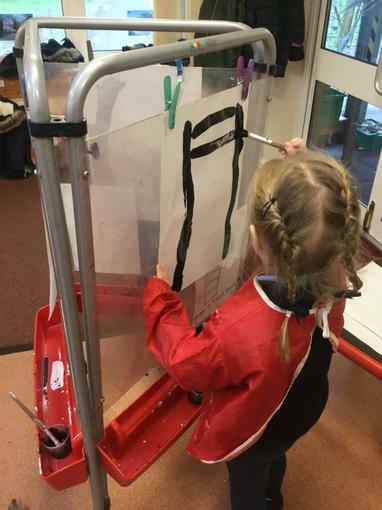 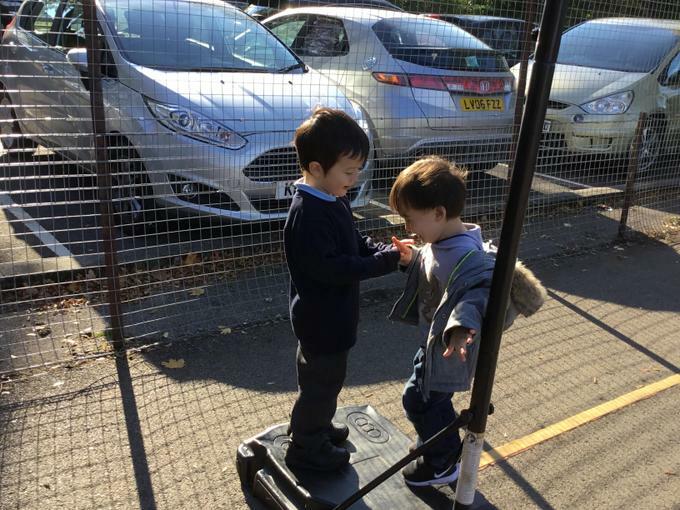 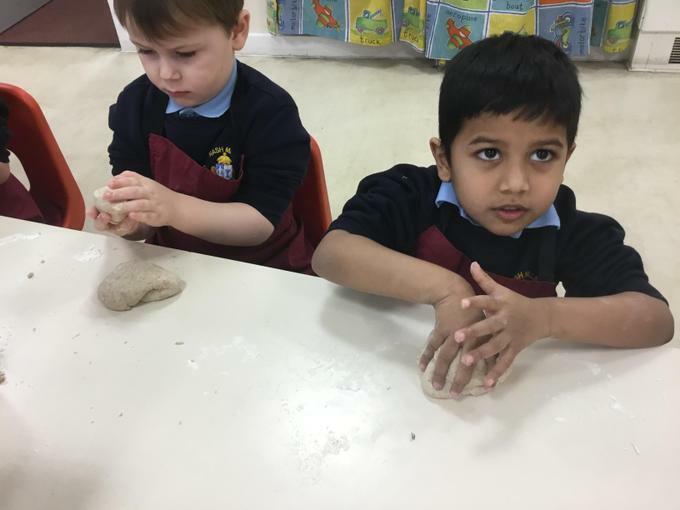 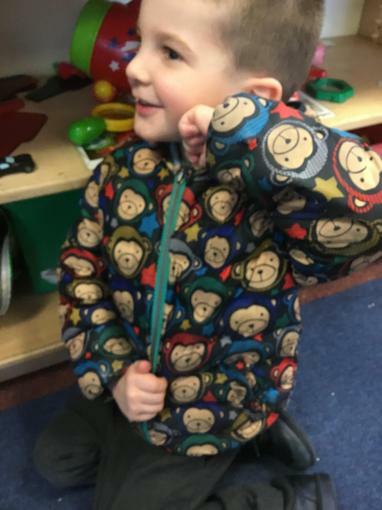 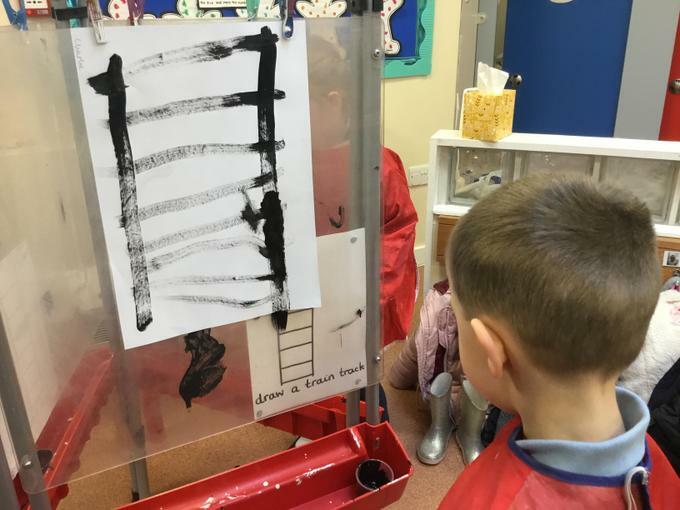 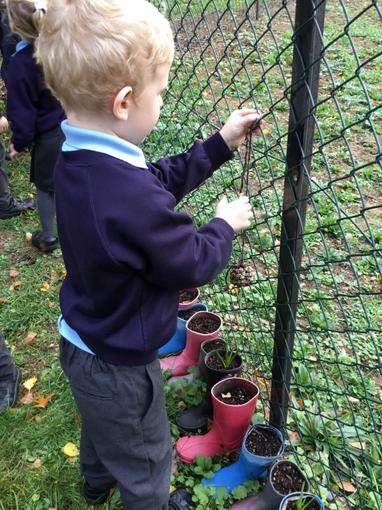 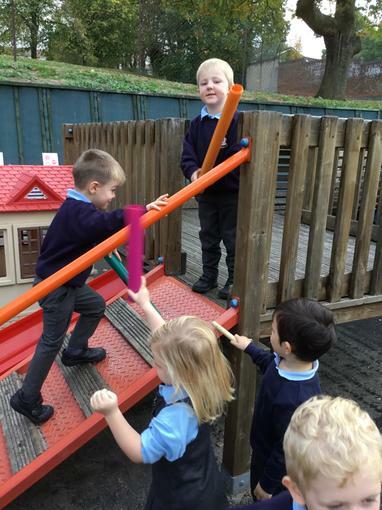 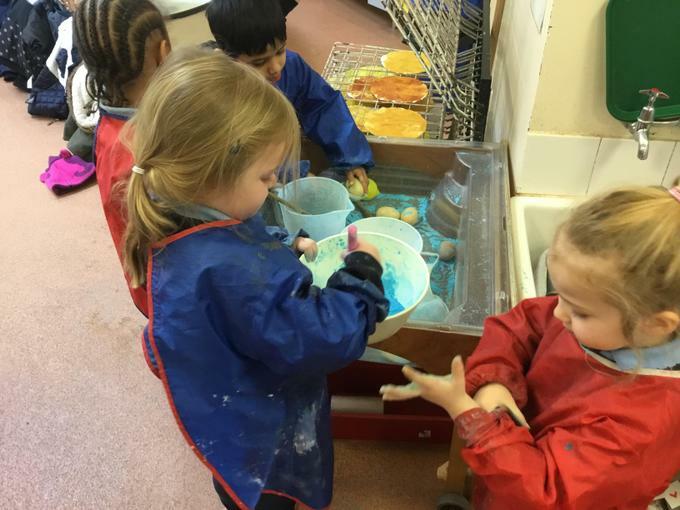 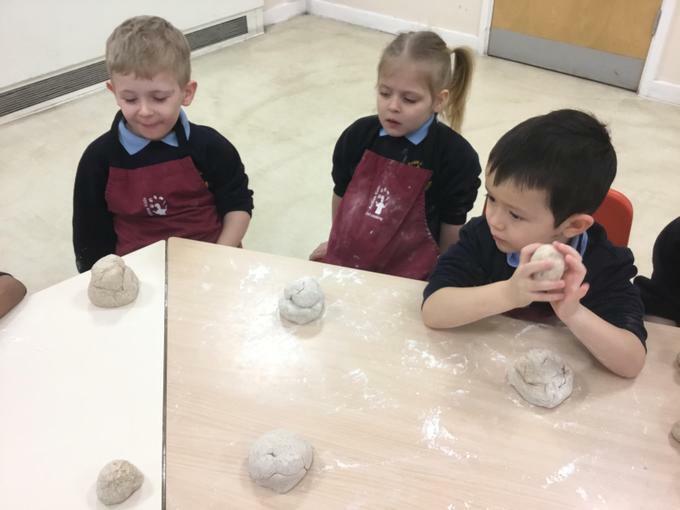 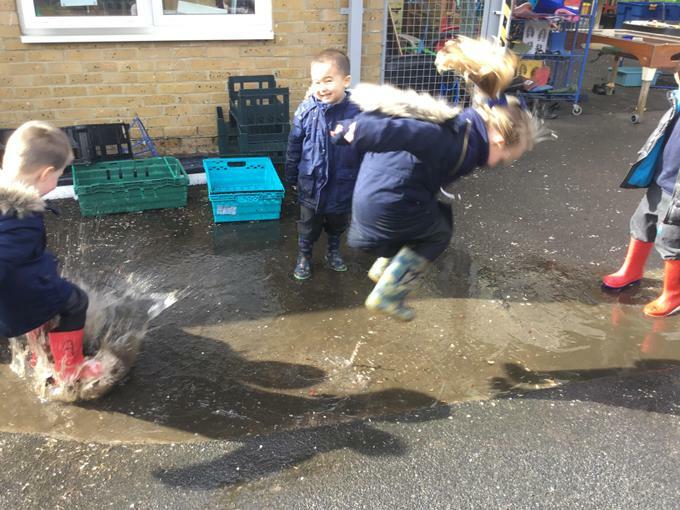 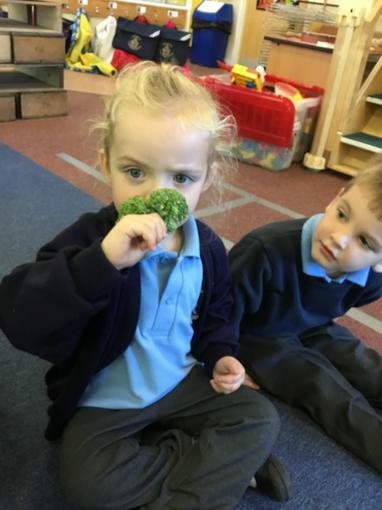 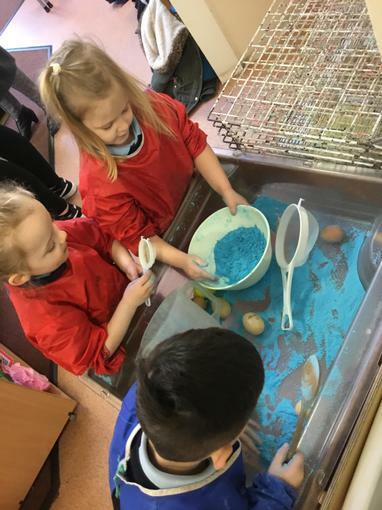 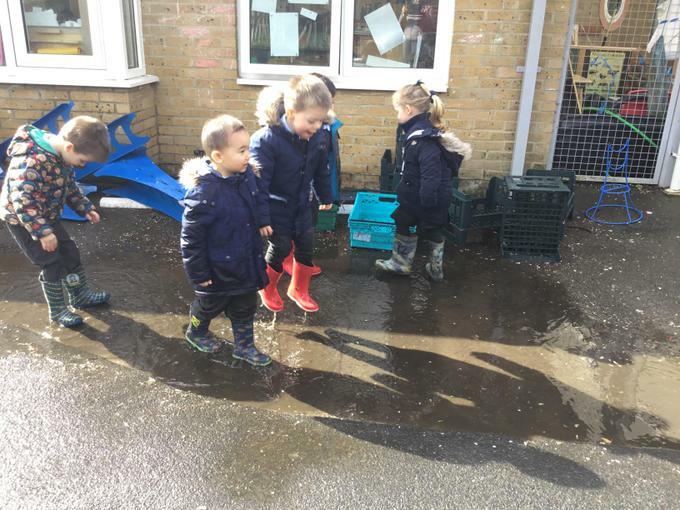 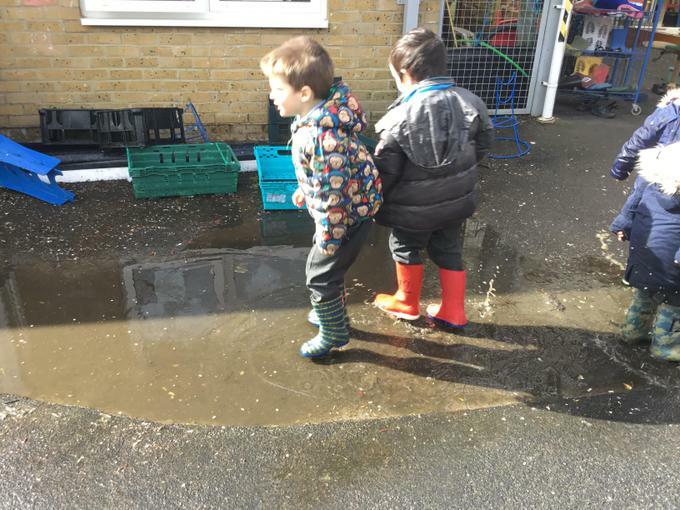 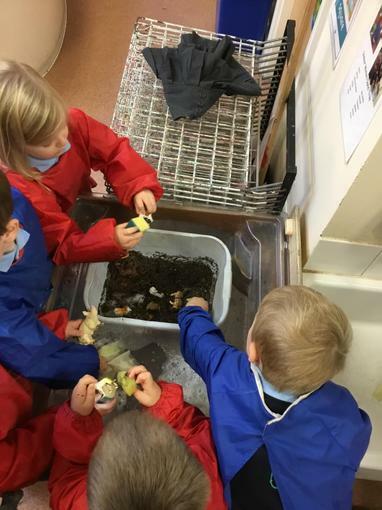 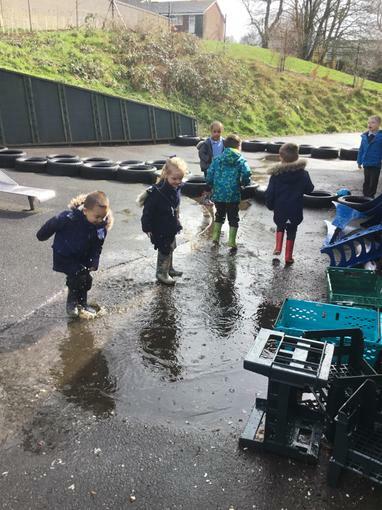 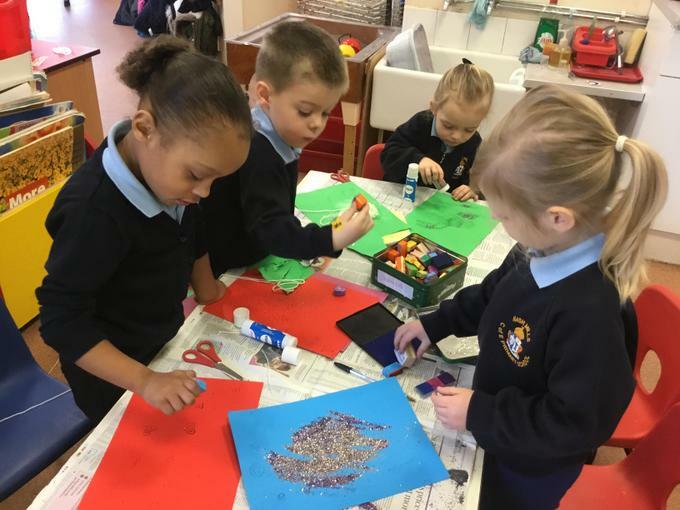 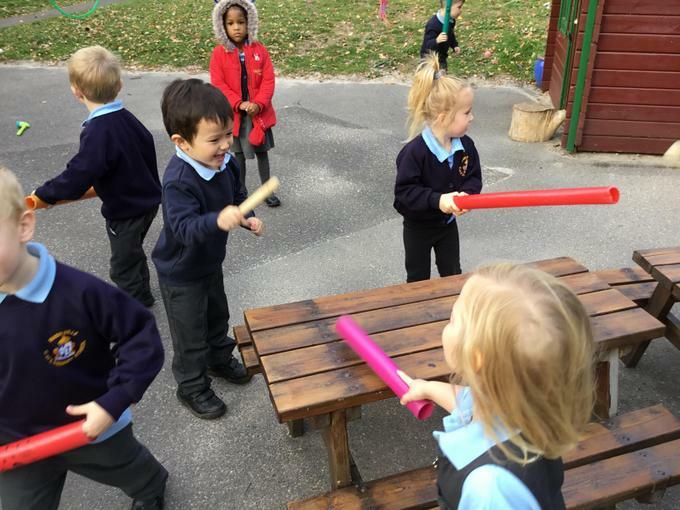 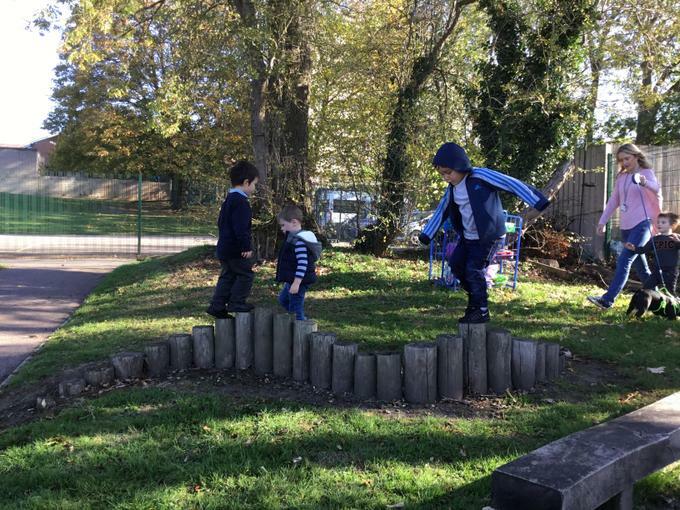 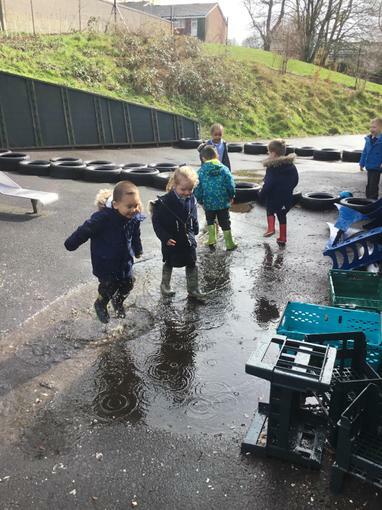 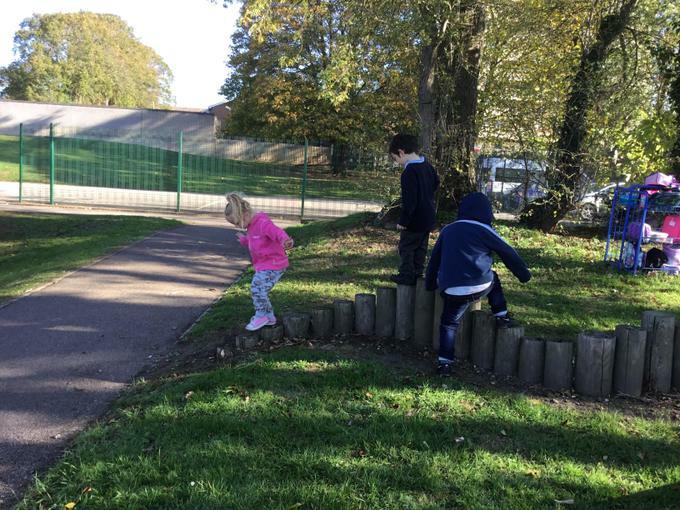 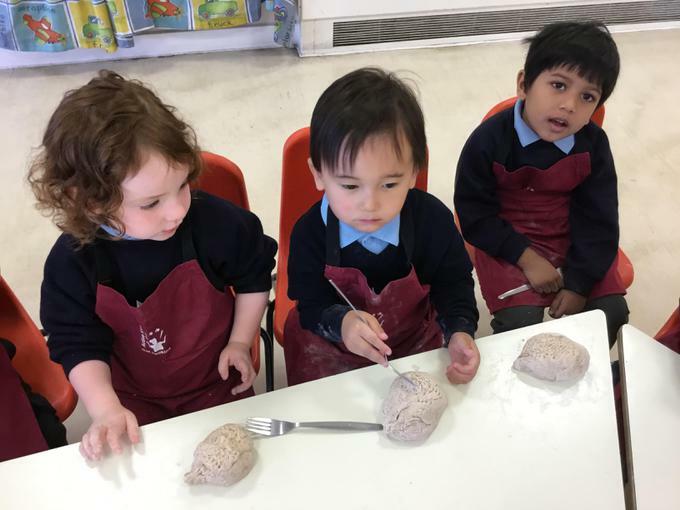 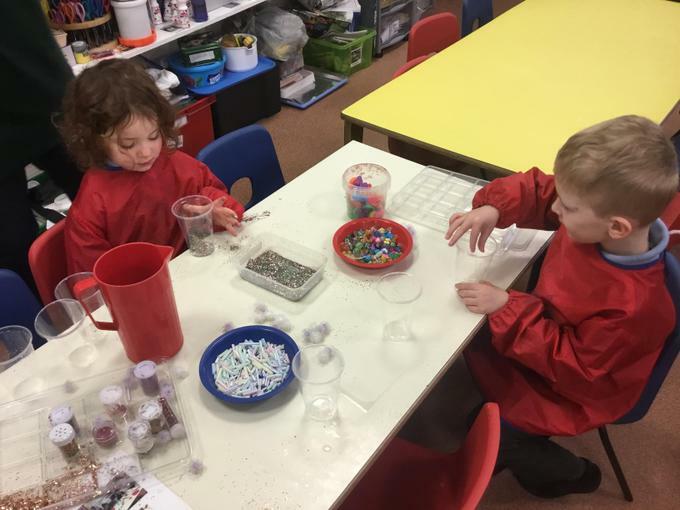 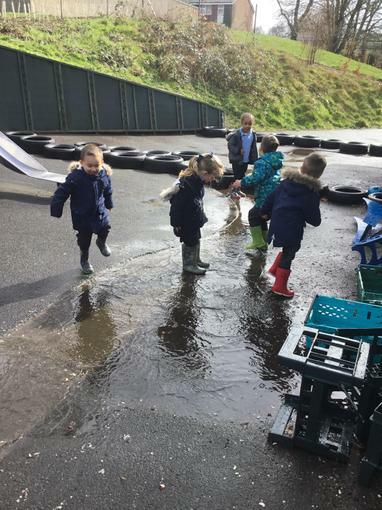 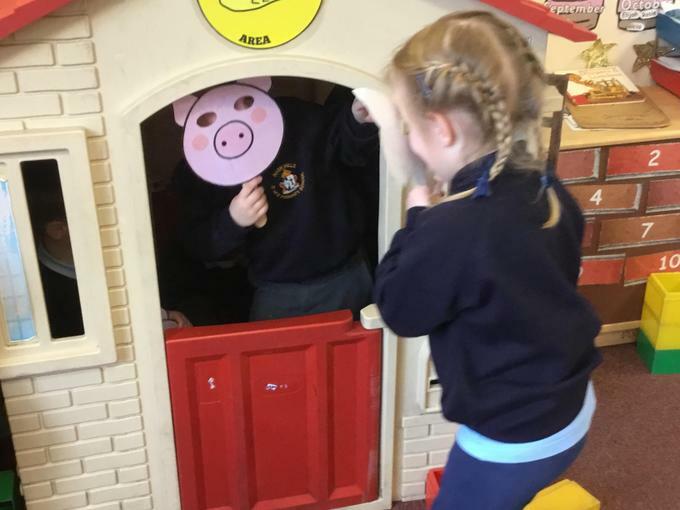 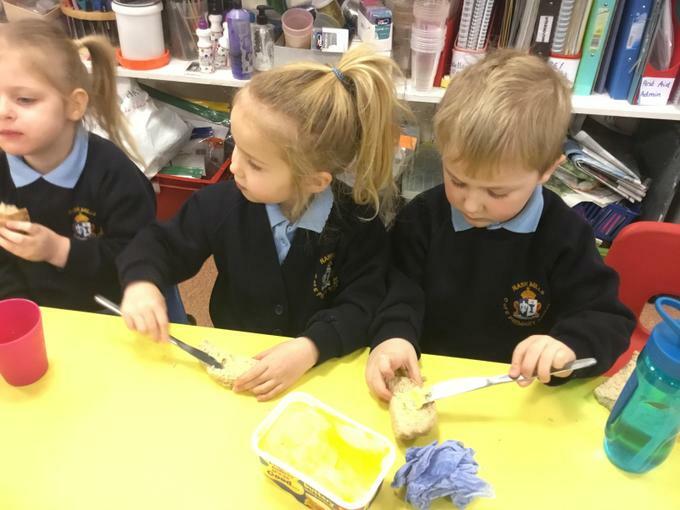 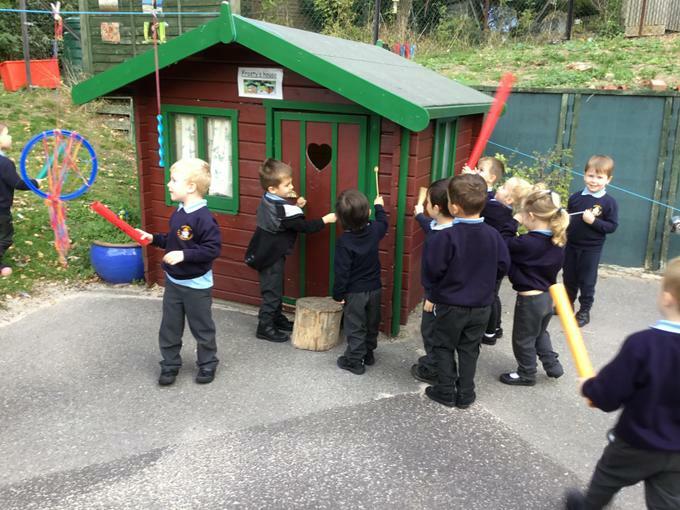 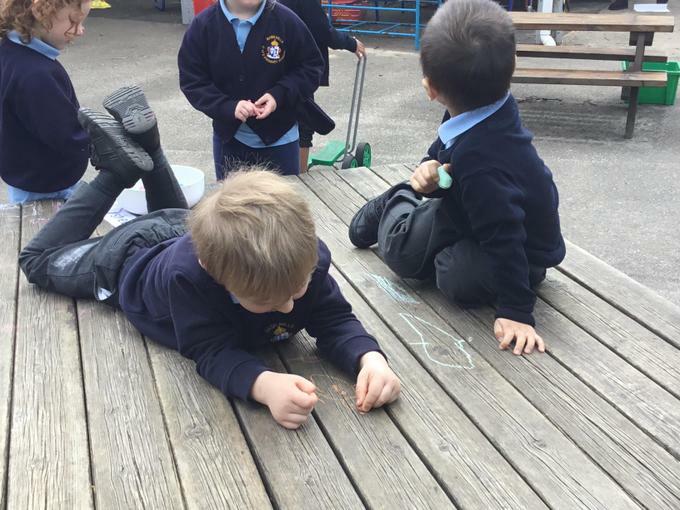 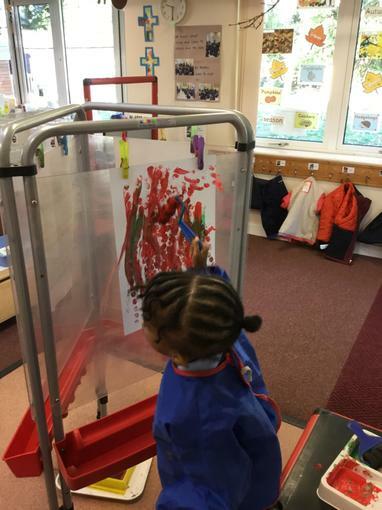 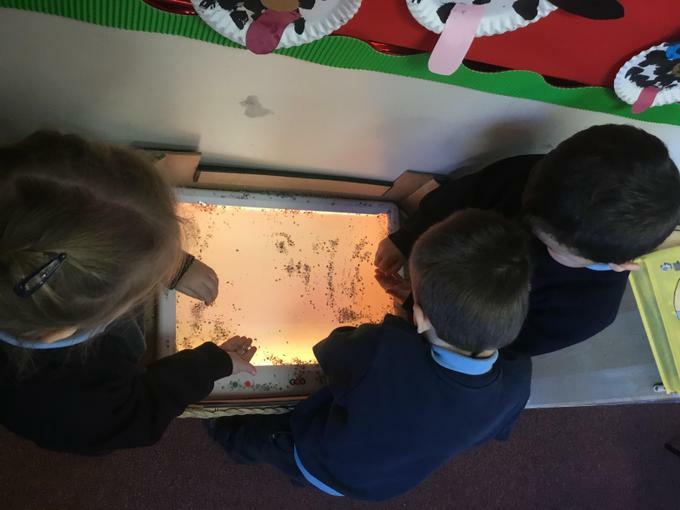 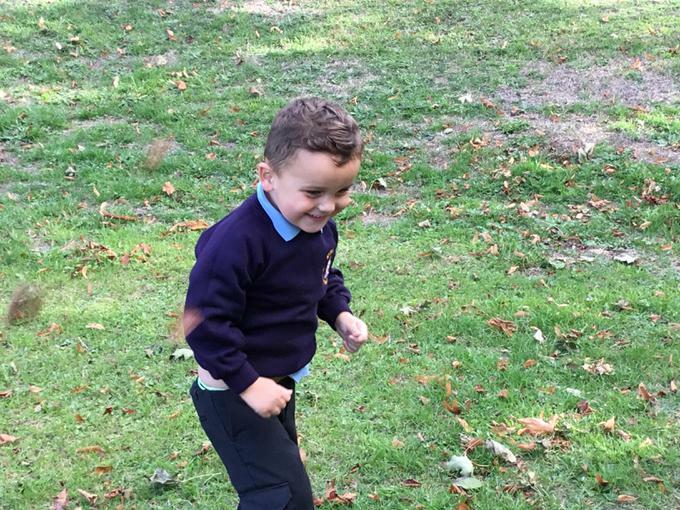 They have been busy exploring their surroundings, getting involved in a whole host of activities both inside and outside. 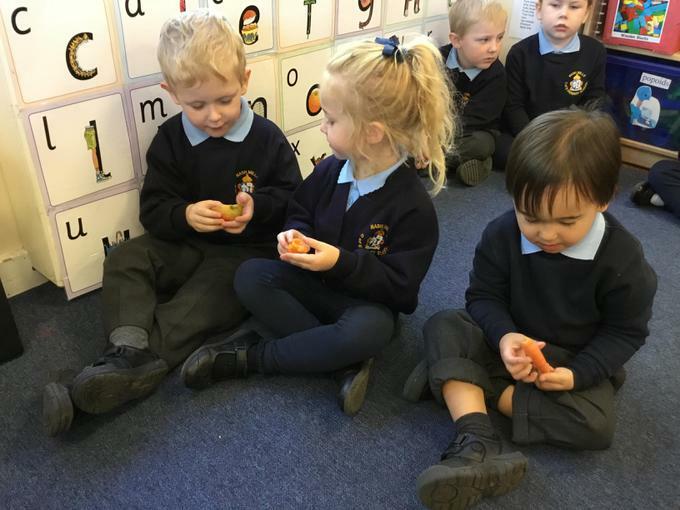 Having got to know each other a little, we then focused on Autumn and harvest food as topics. 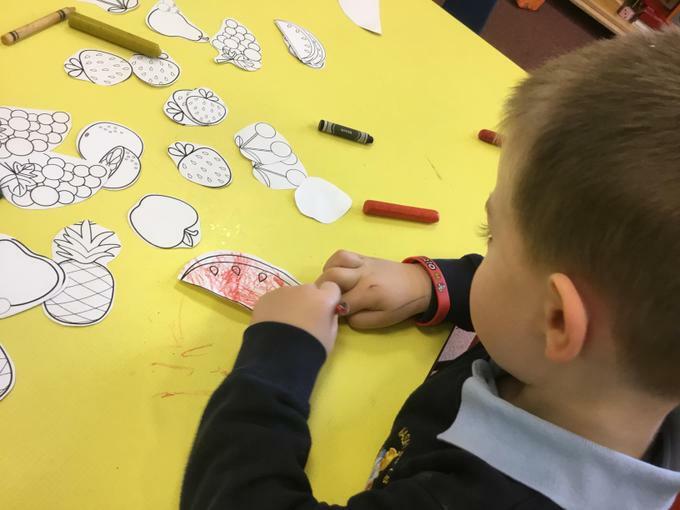 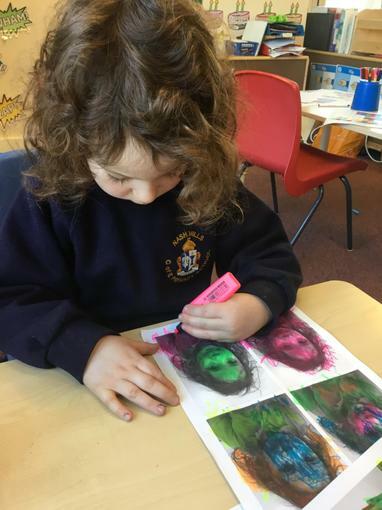 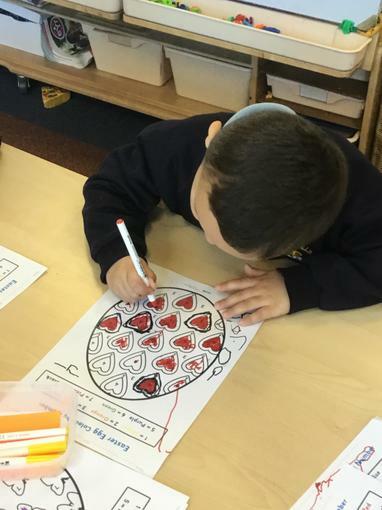 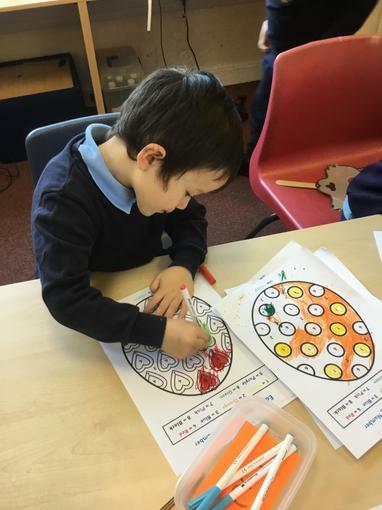 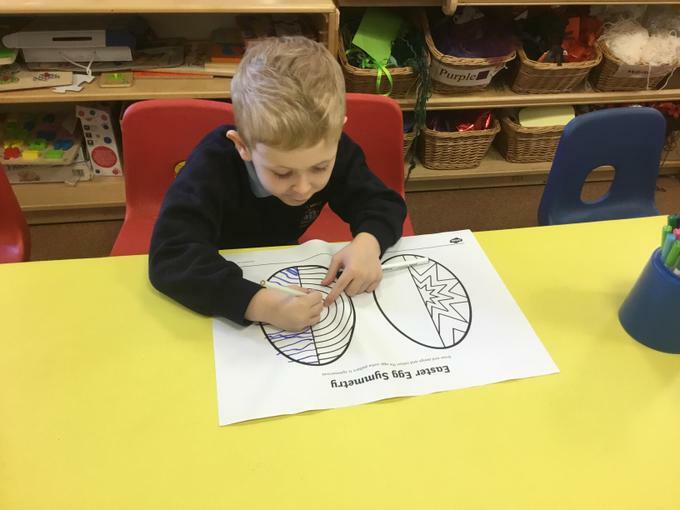 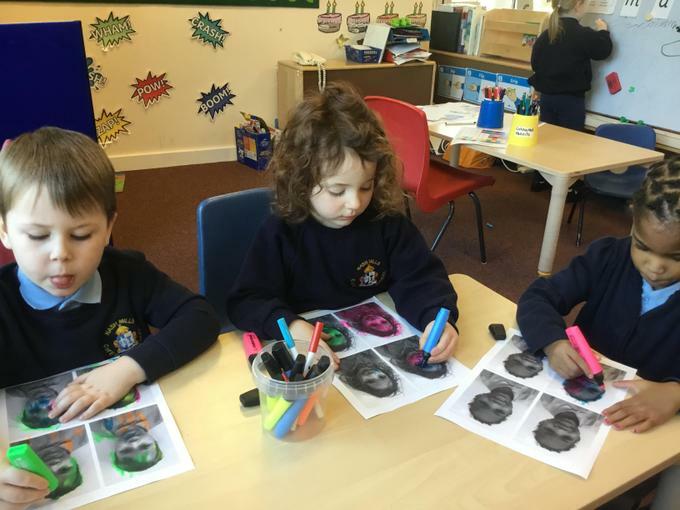 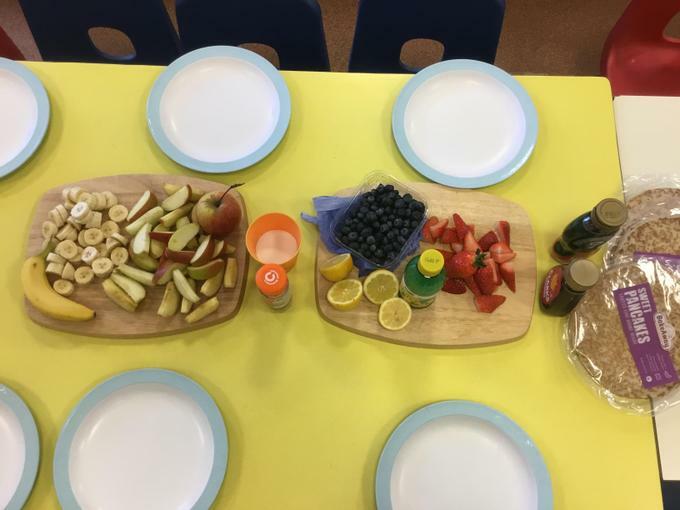 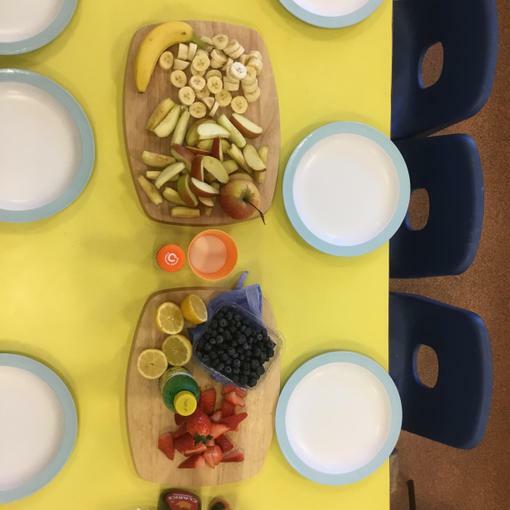 We did some fruit printing and also explored different fruit and vegetables, trying to describe how they feel. 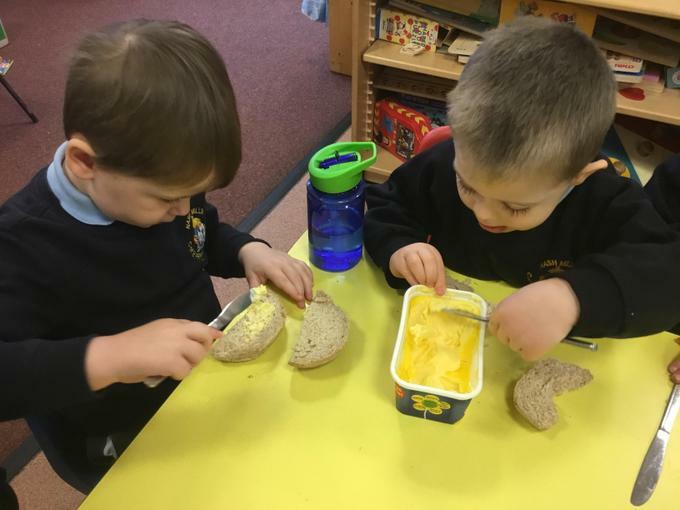 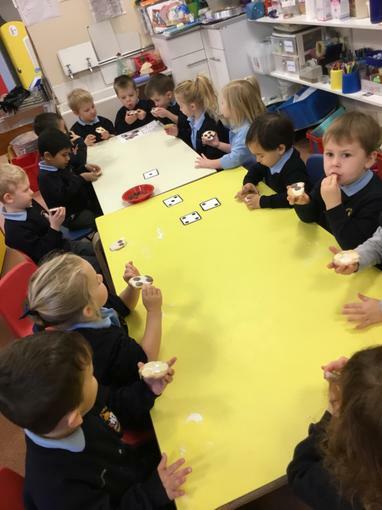 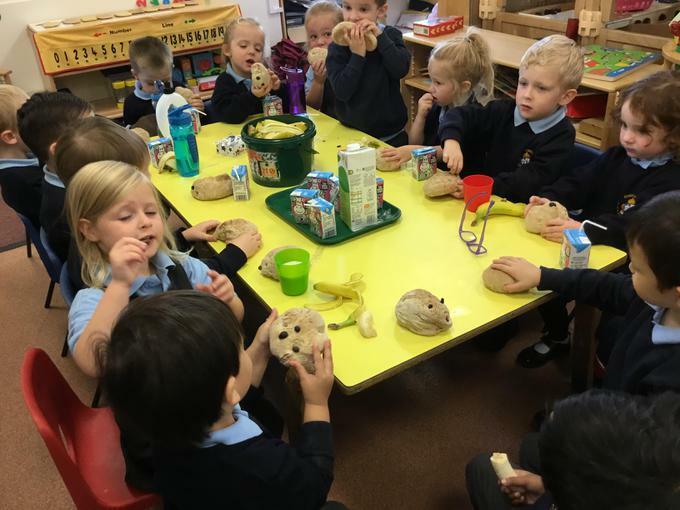 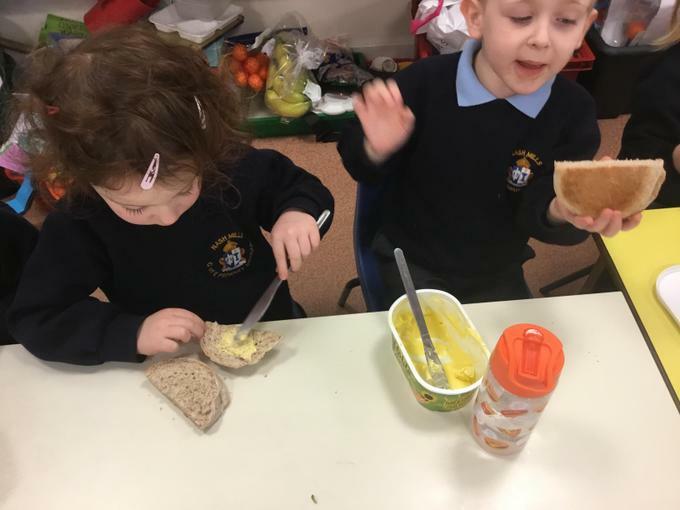 We read 'The Little Red Hen' and have looked at the ingredients of bread. 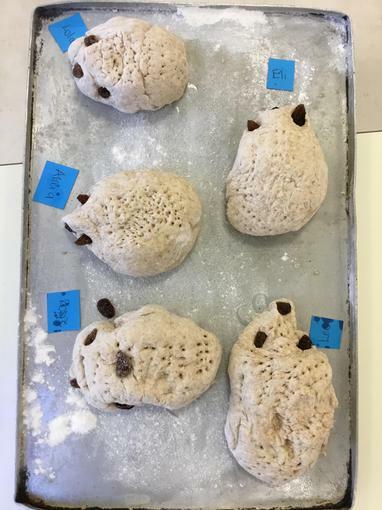 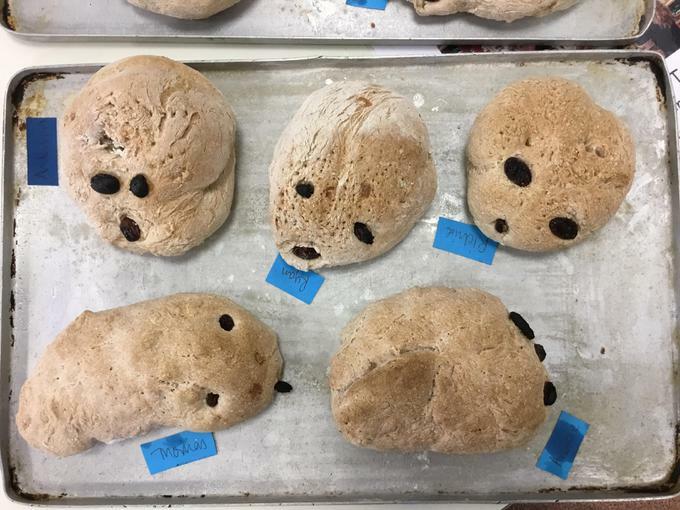 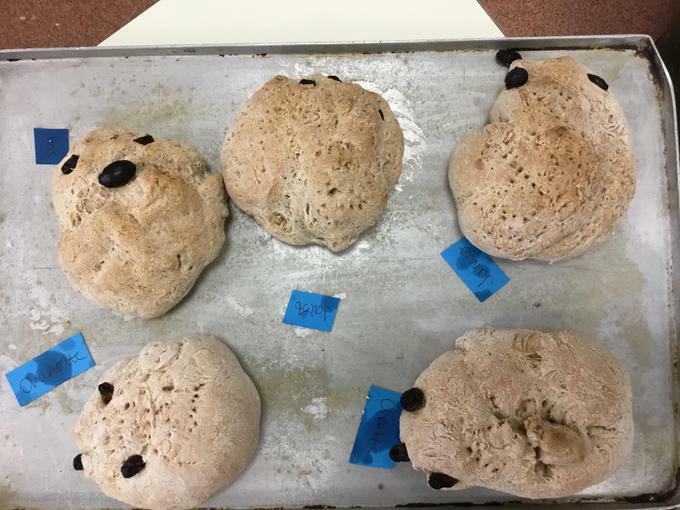 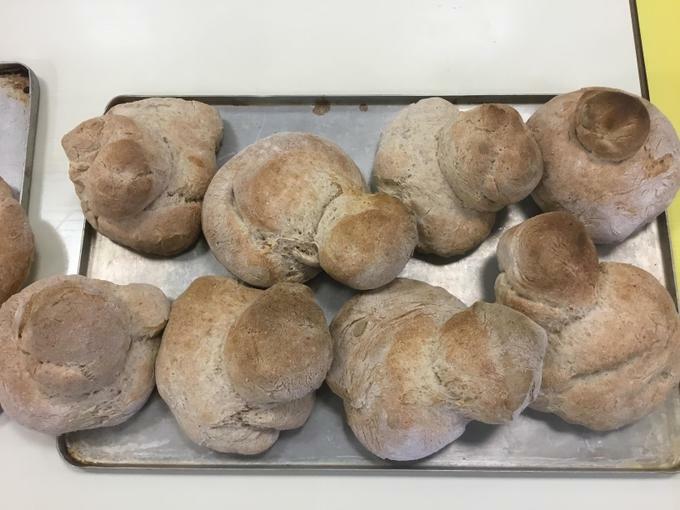 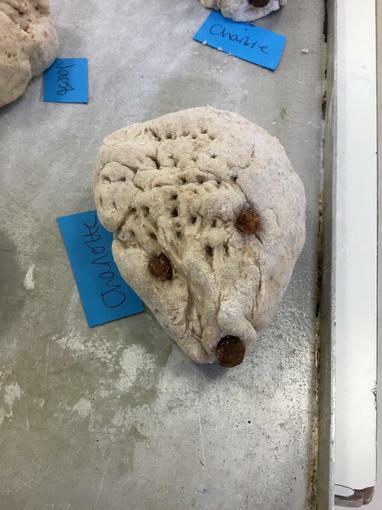 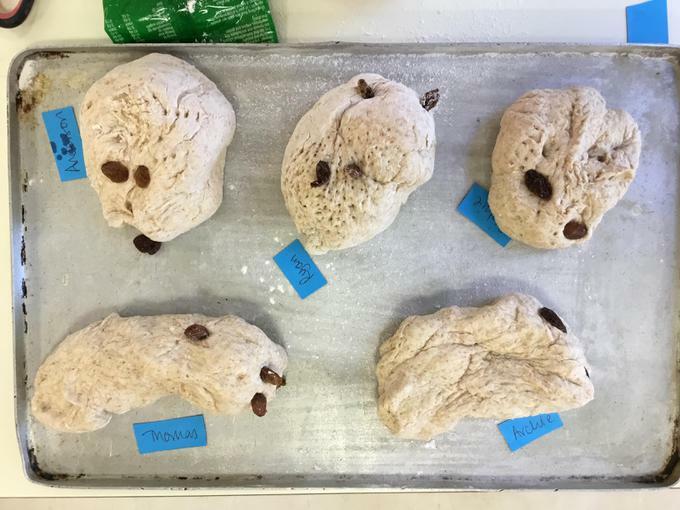 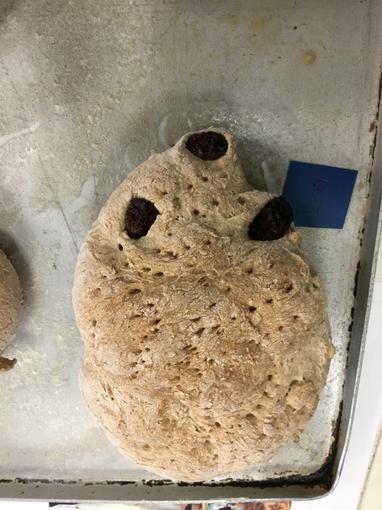 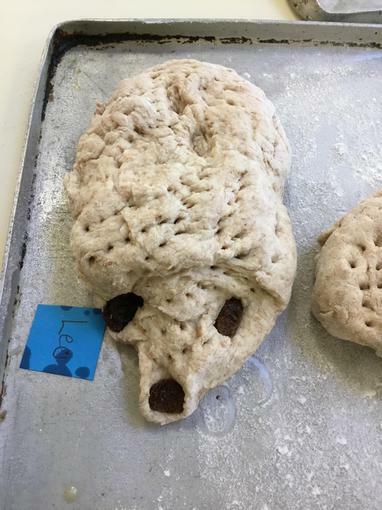 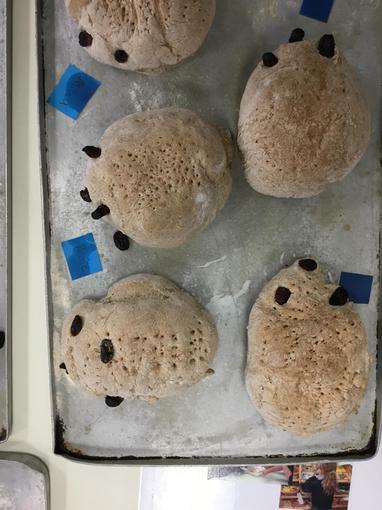 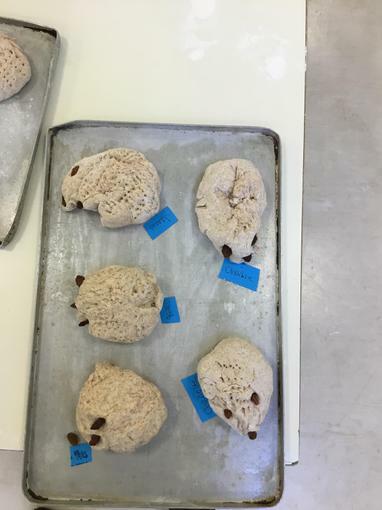 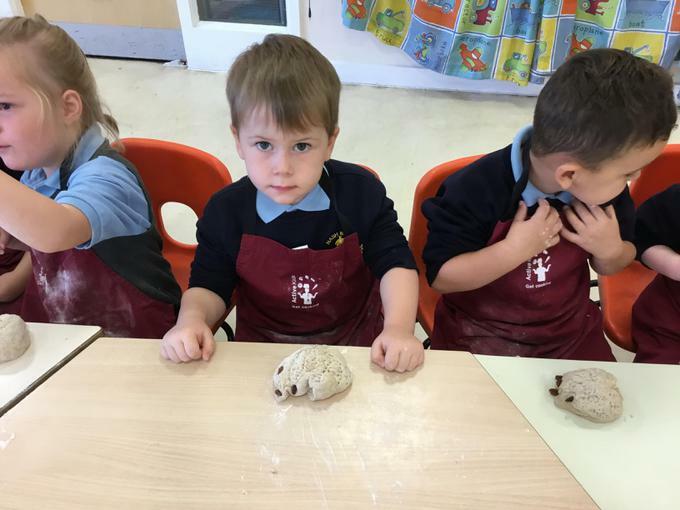 We made bread hedgehog rolls with the Cook, who helped us knead dough into rolls, which we ate later with pleasure! 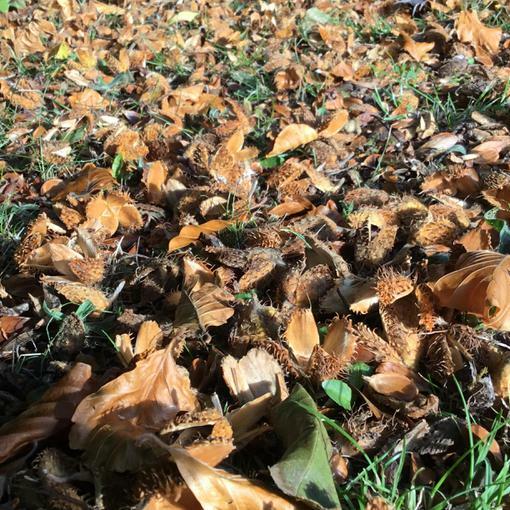 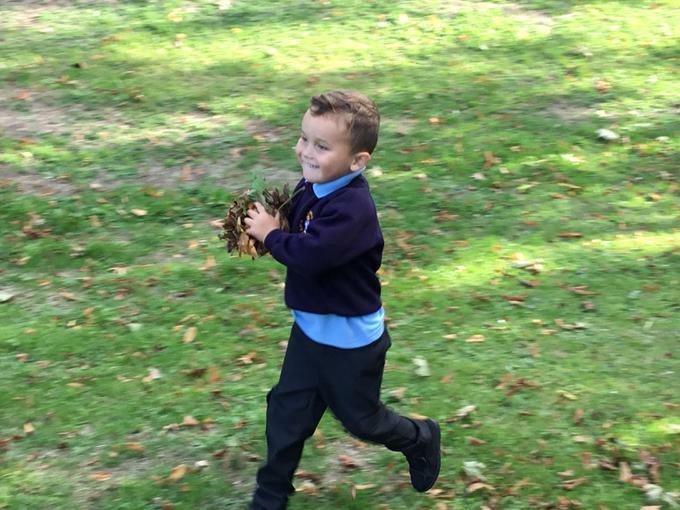 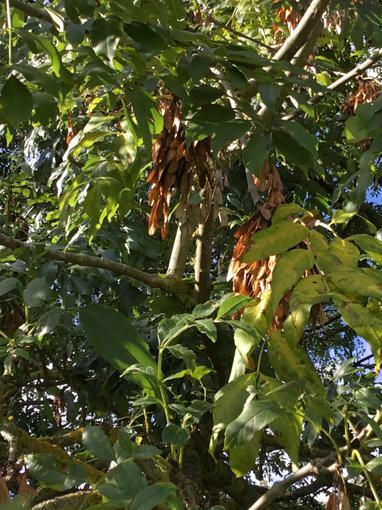 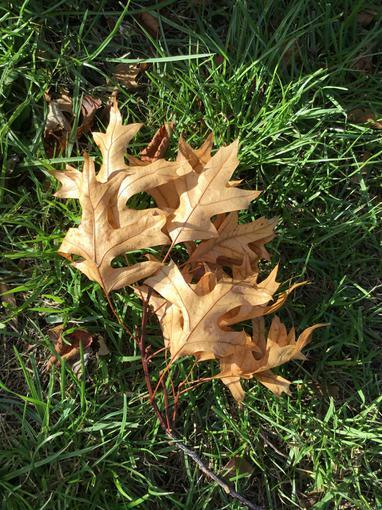 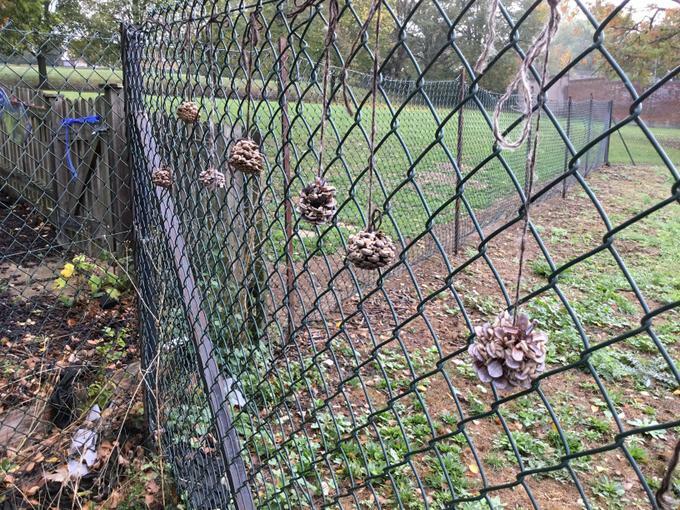 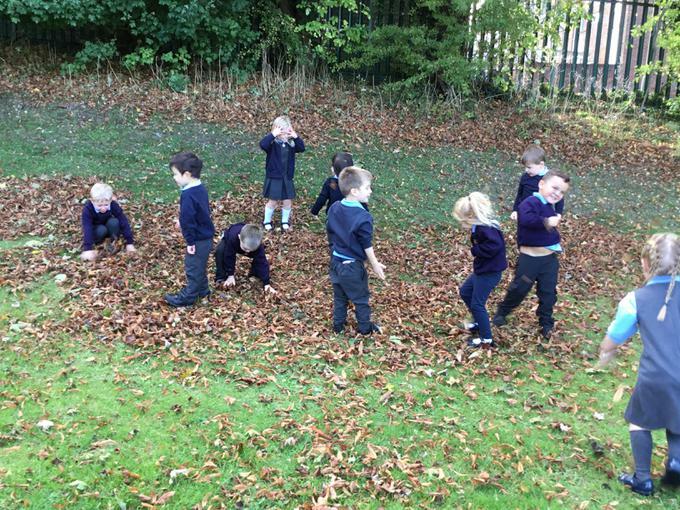 We also went on a walk around school, looking for signs of Autumn. 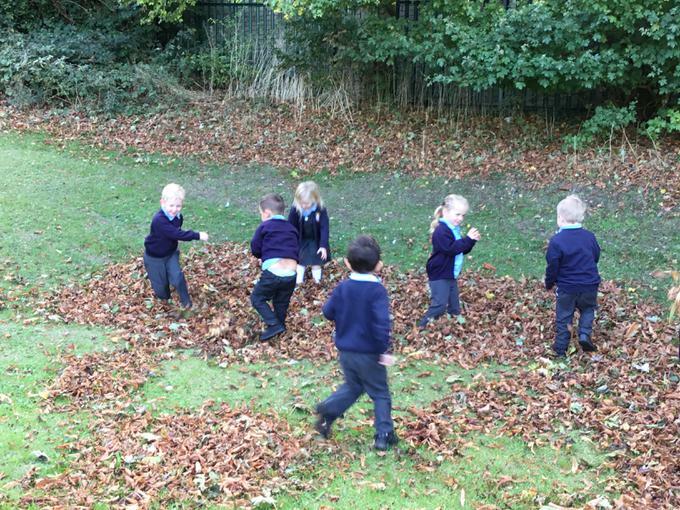 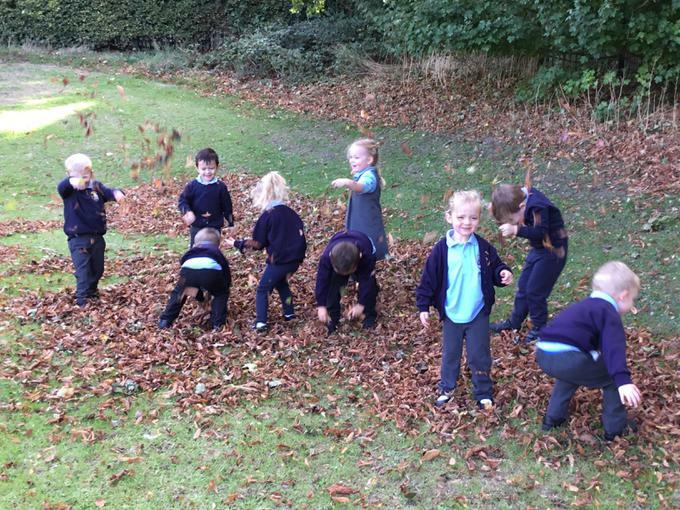 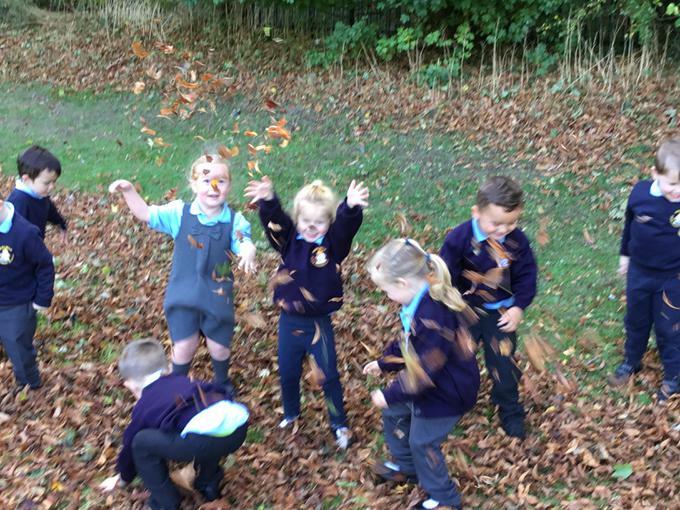 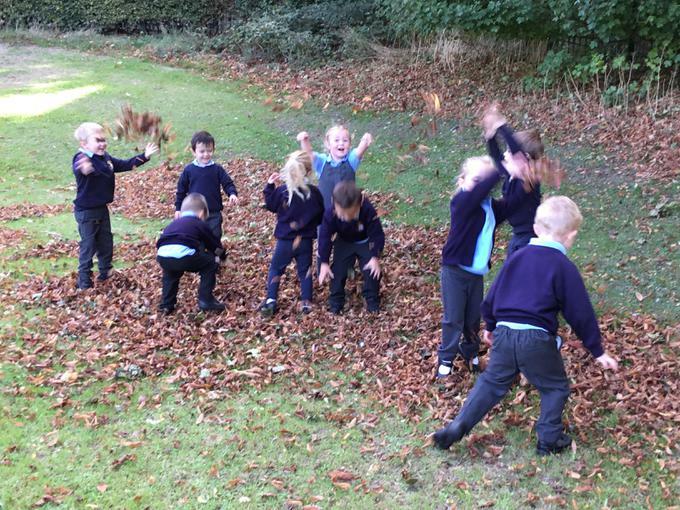 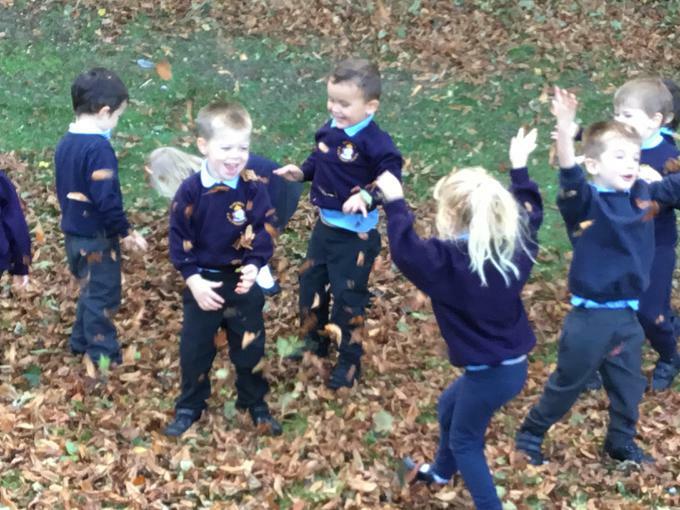 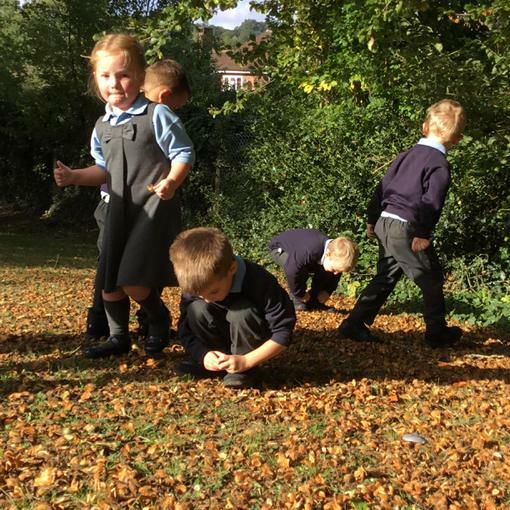 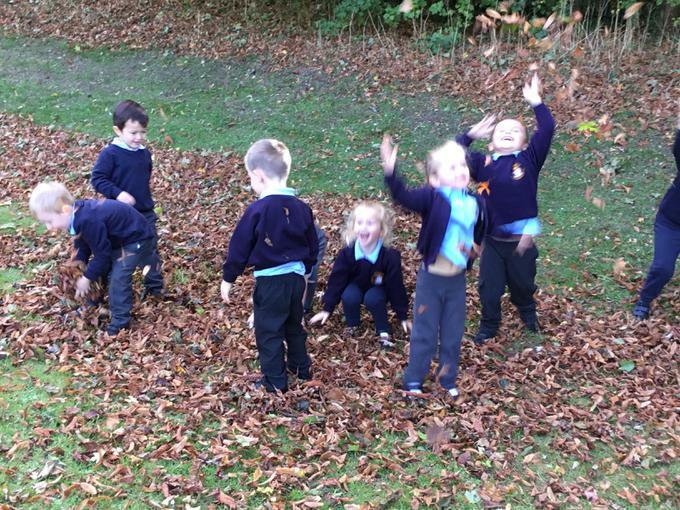 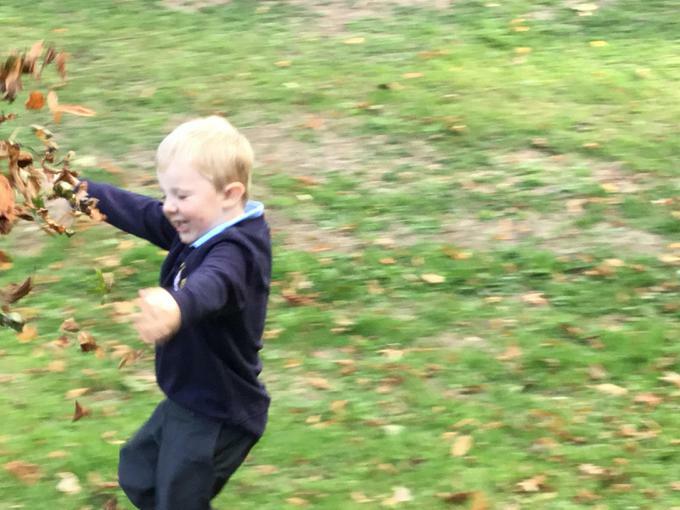 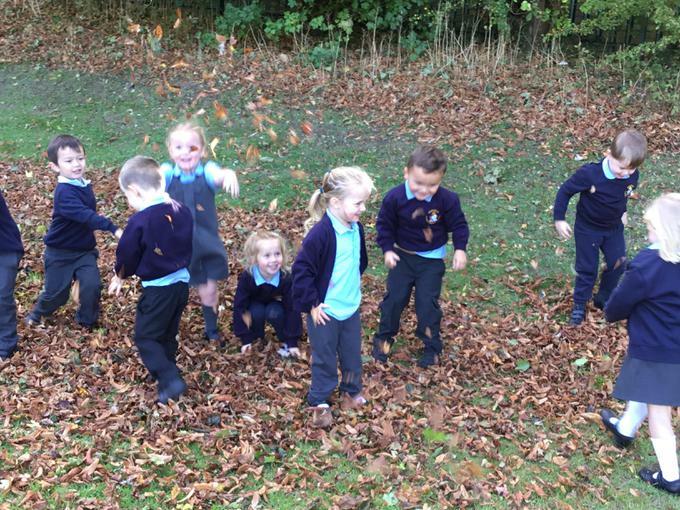 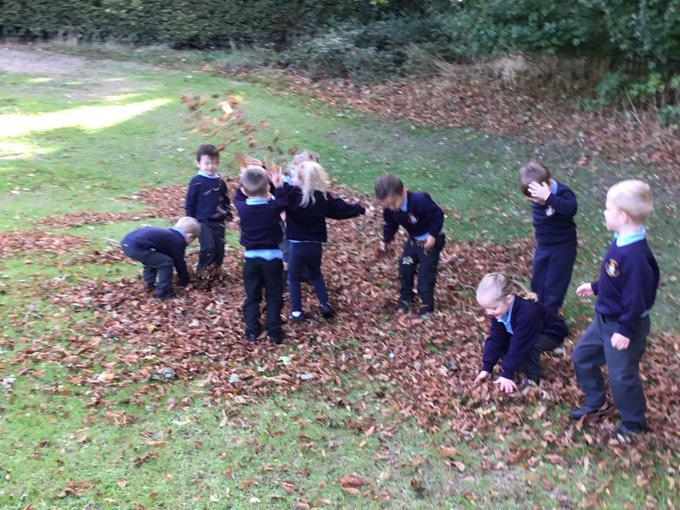 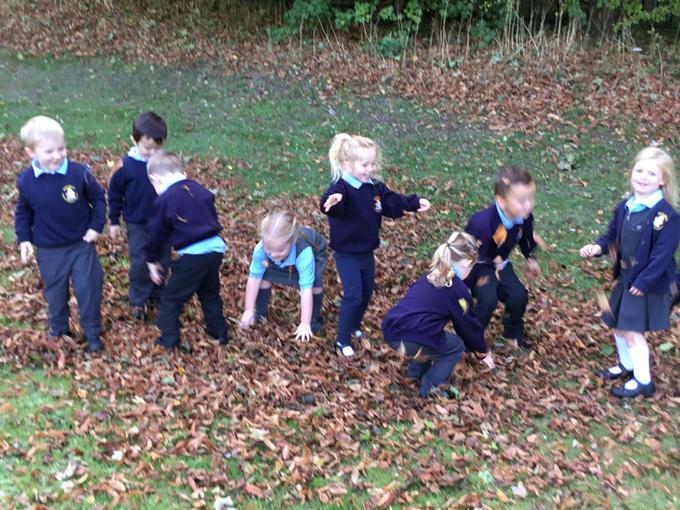 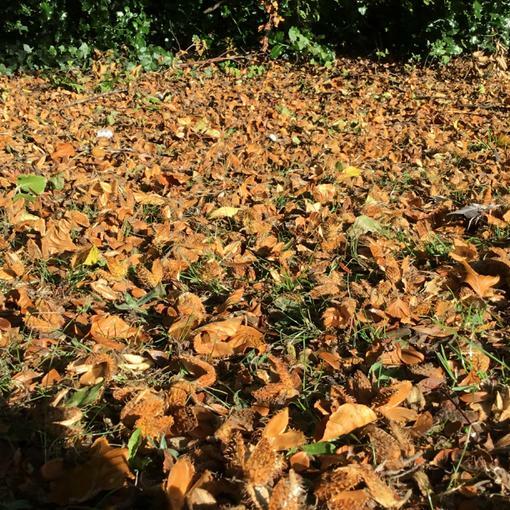 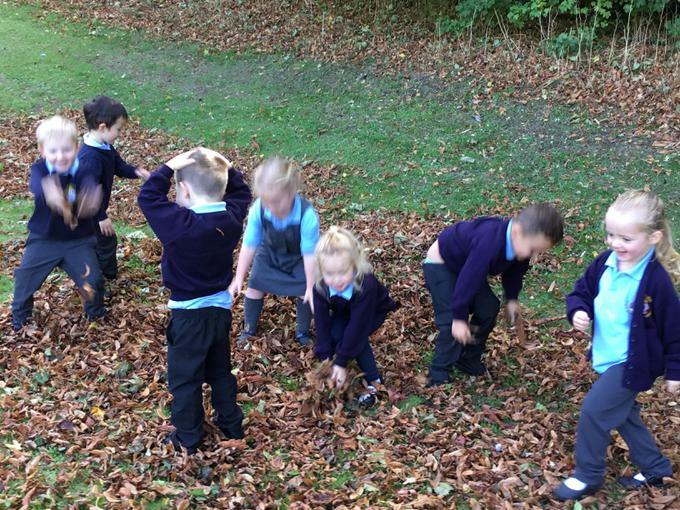 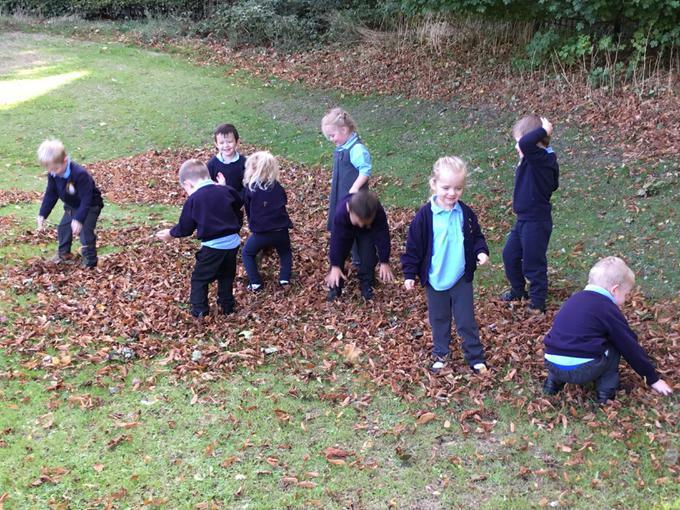 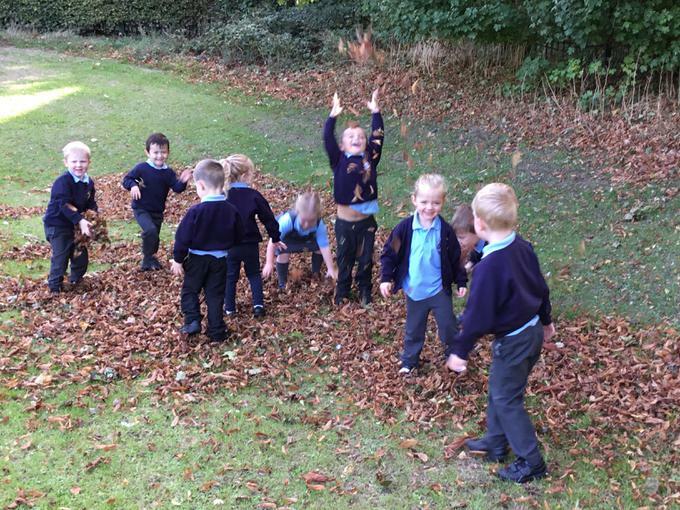 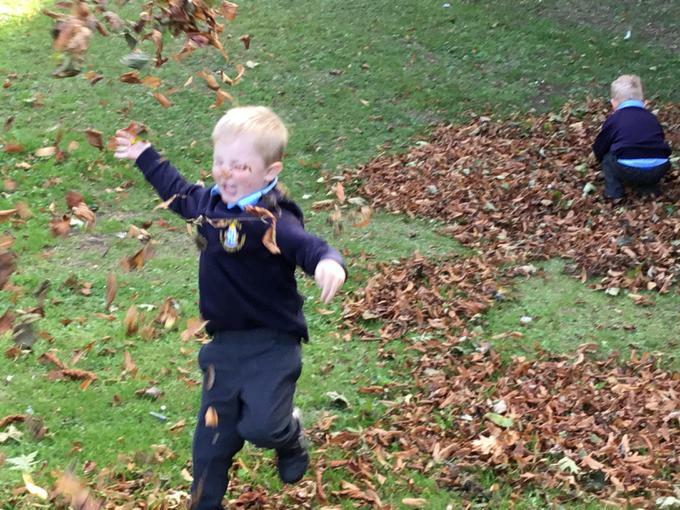 The children had lots of fun playing in the leaves, throwing them in the air and enjoying the space on the top field.